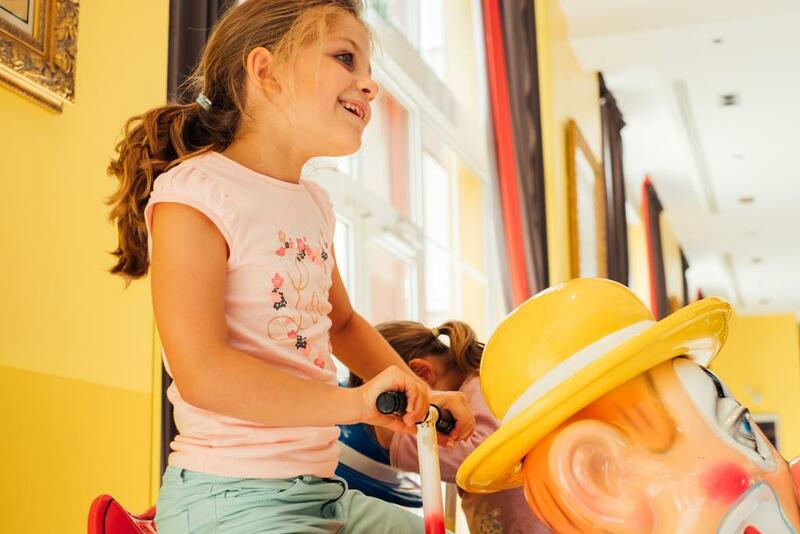 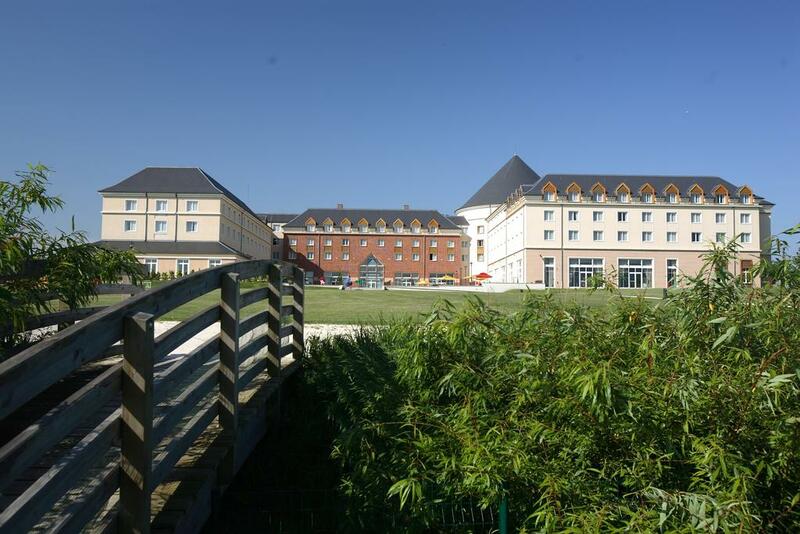 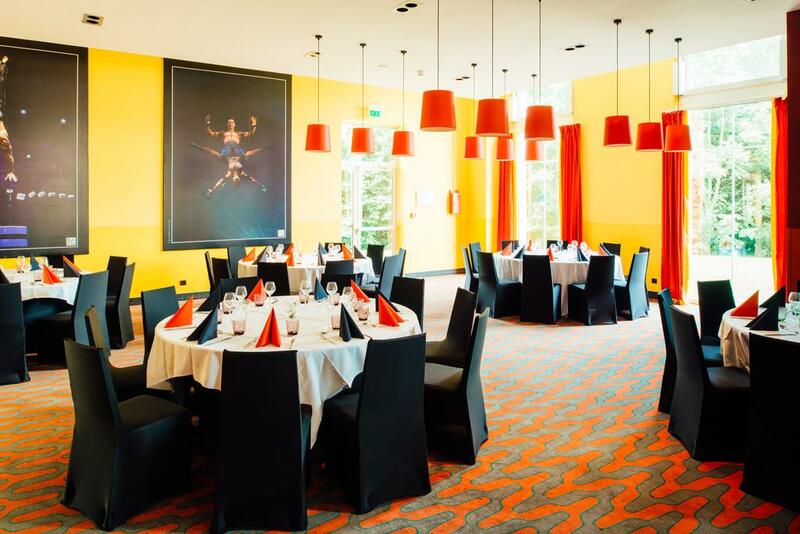 Vienna House Magic Circus at Disneyland® Paris is located just a 10-minute drive from Disneyland Paris and 2.5 mi from Val d’Europe RER Station and shopping center. 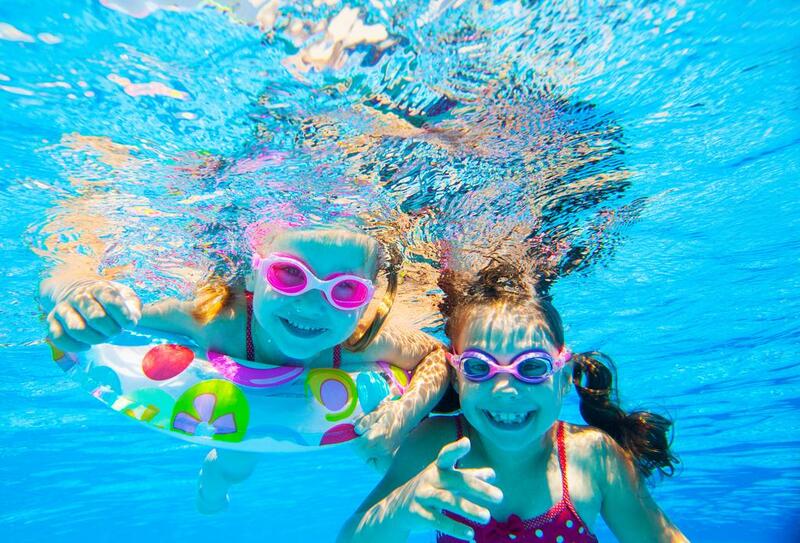 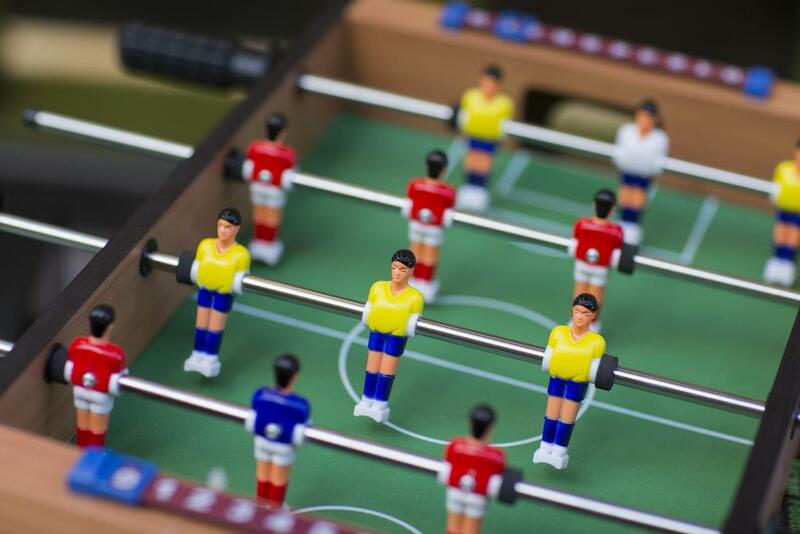 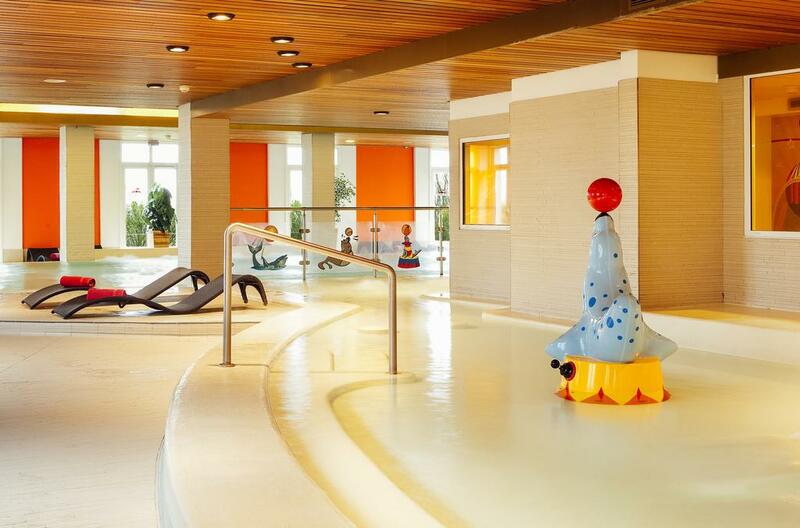 It offers a swimming pool, fitness room, a games room with video games, and free WiFi access throughout the property. 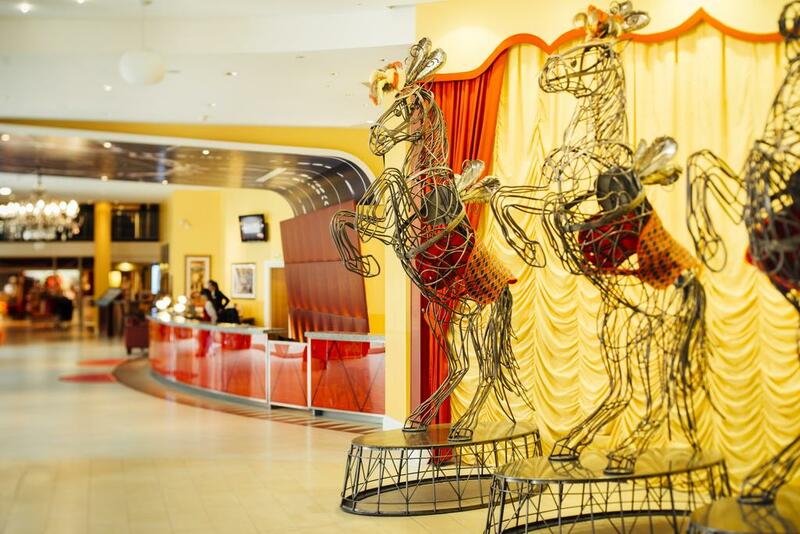 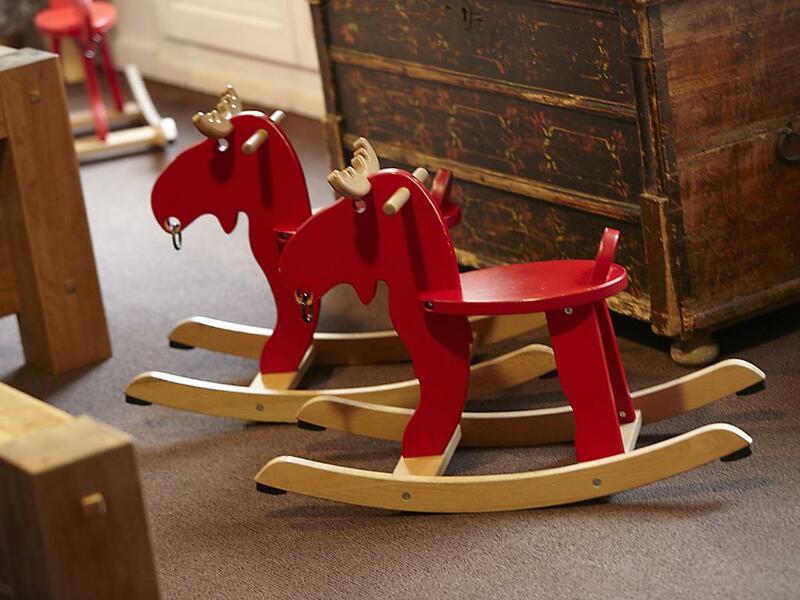 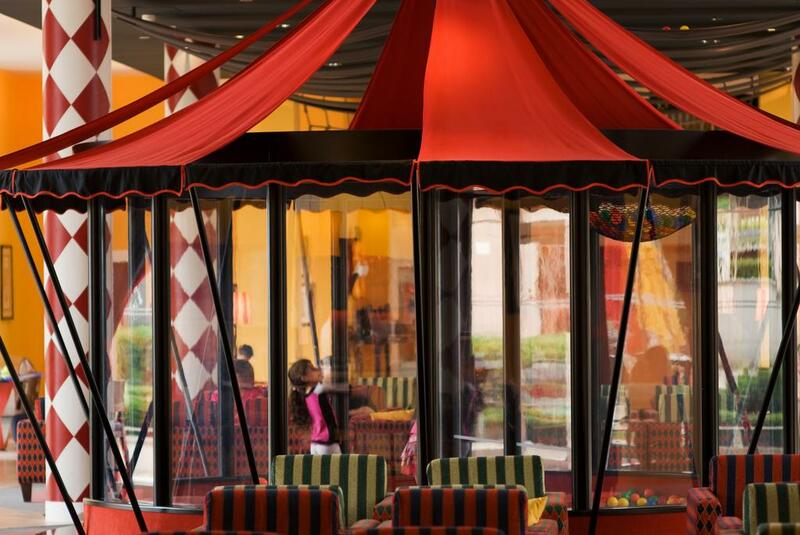 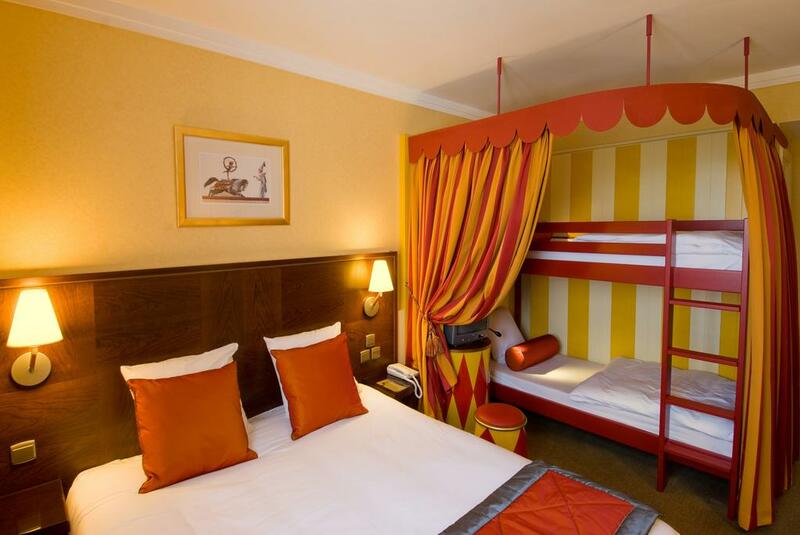 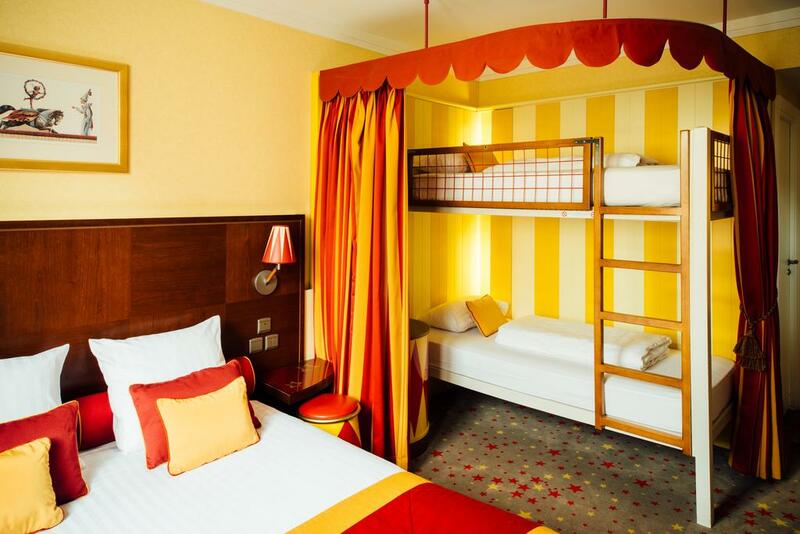 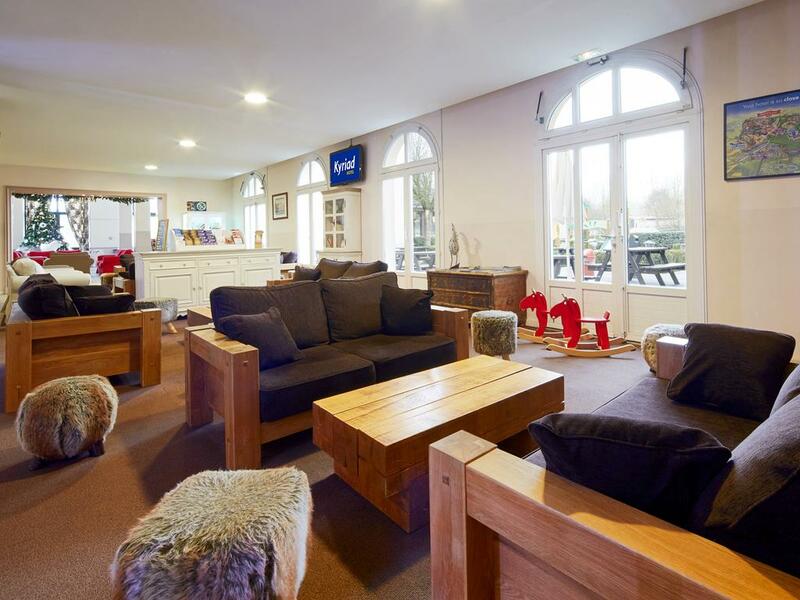 Rooms have a circus theme and offer views of the countryside, the park or the lake. 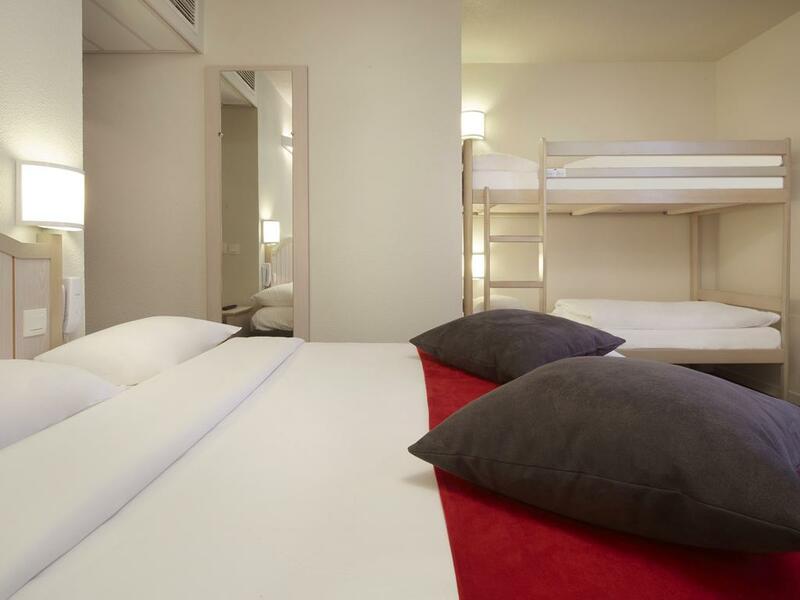 They are equipped with a mini-bar, cable TV with children’s channels and facilities for making tea and coffee. 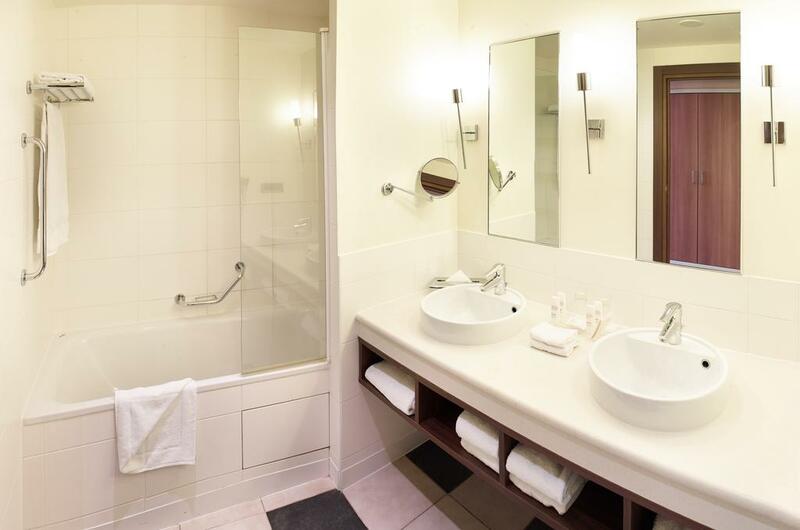 Each has a private bathroom. 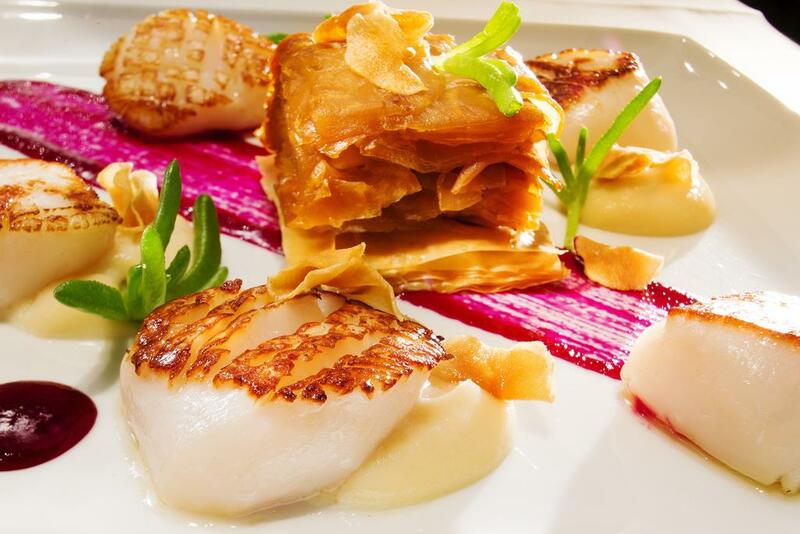 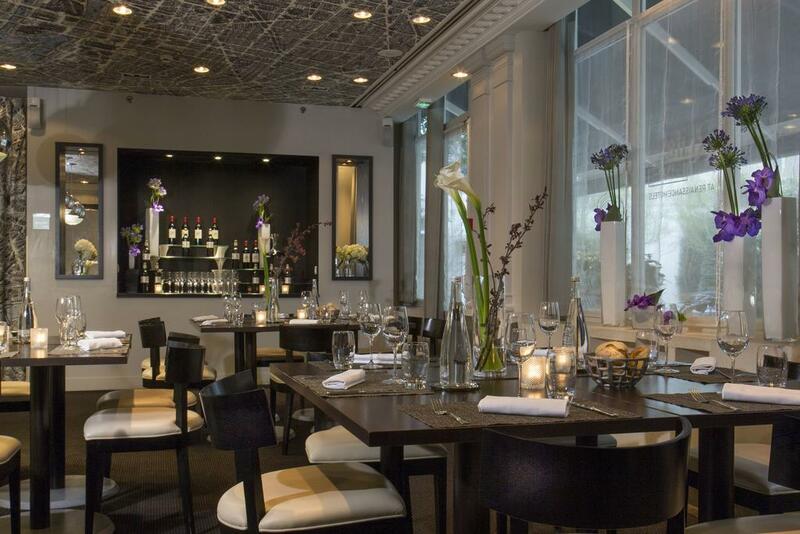 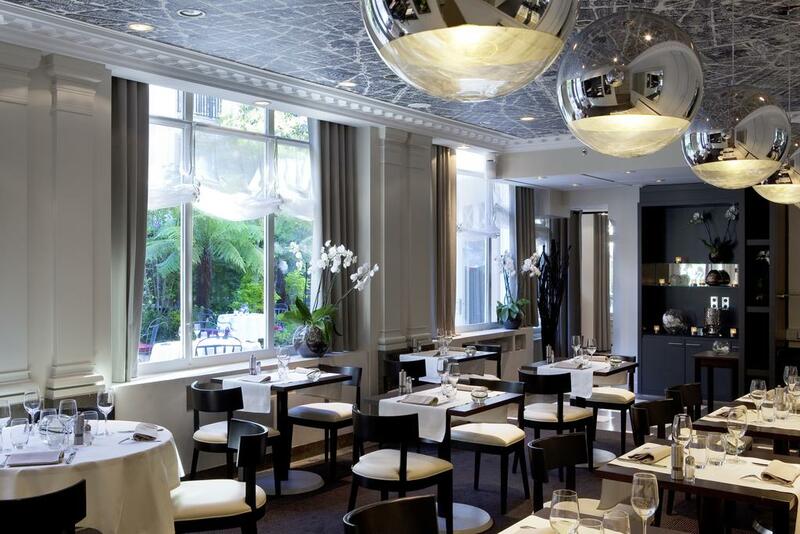 The restaurant, L’Etoile, serves traditional cuisine and regional specialties. 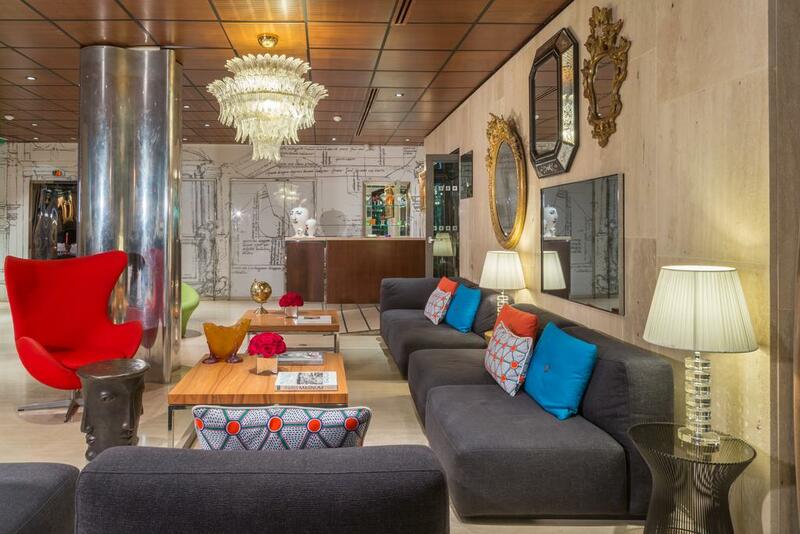 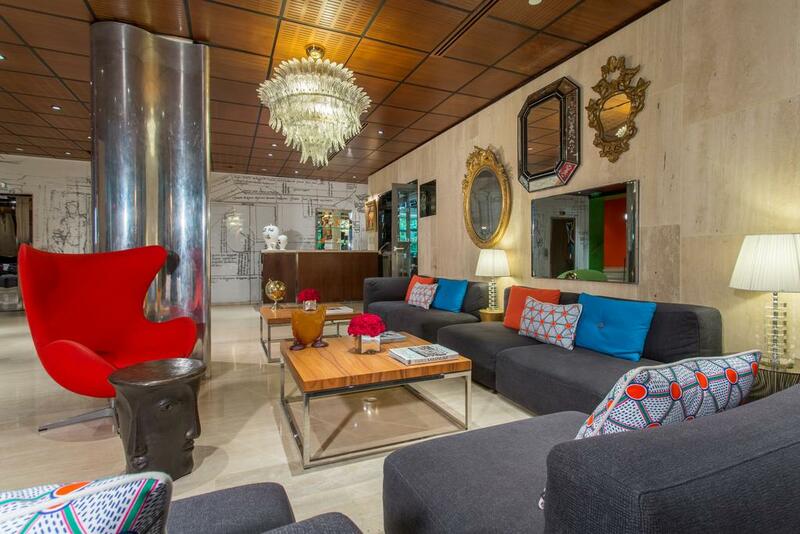 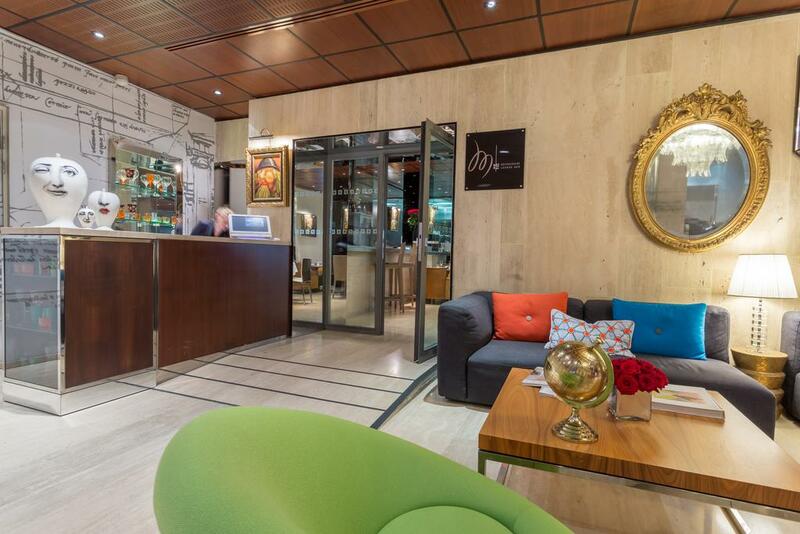 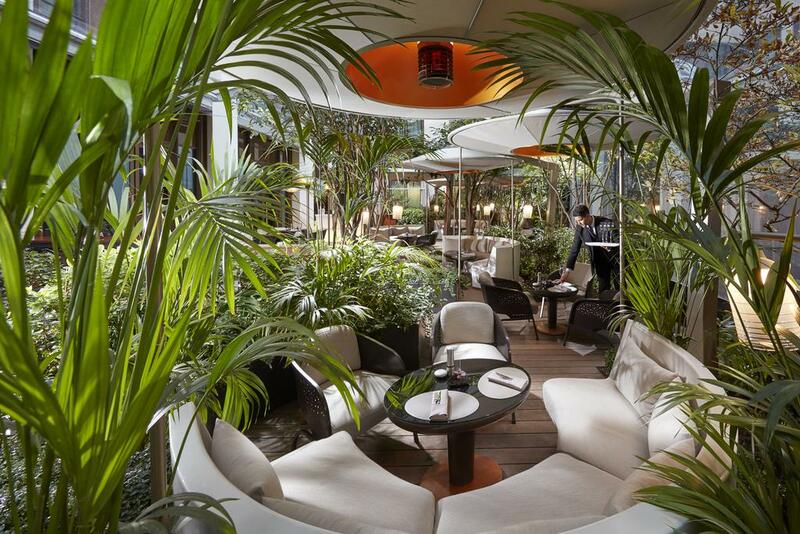 Guests can relax in the Bar des Artistes, which features a snack service and an outdoor terrace. 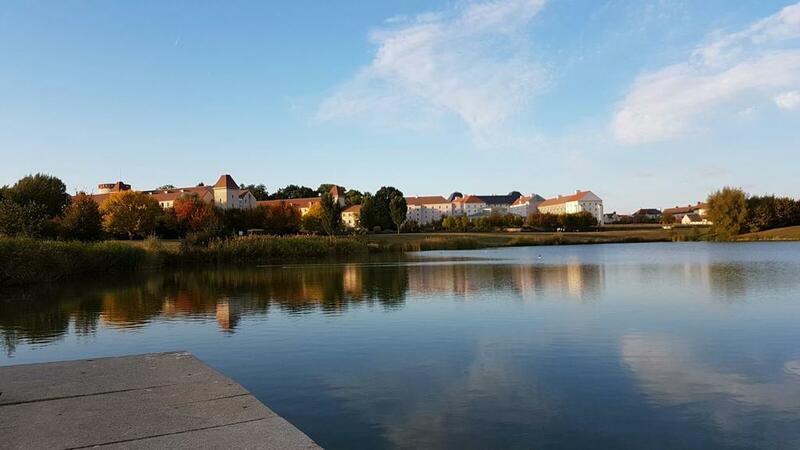 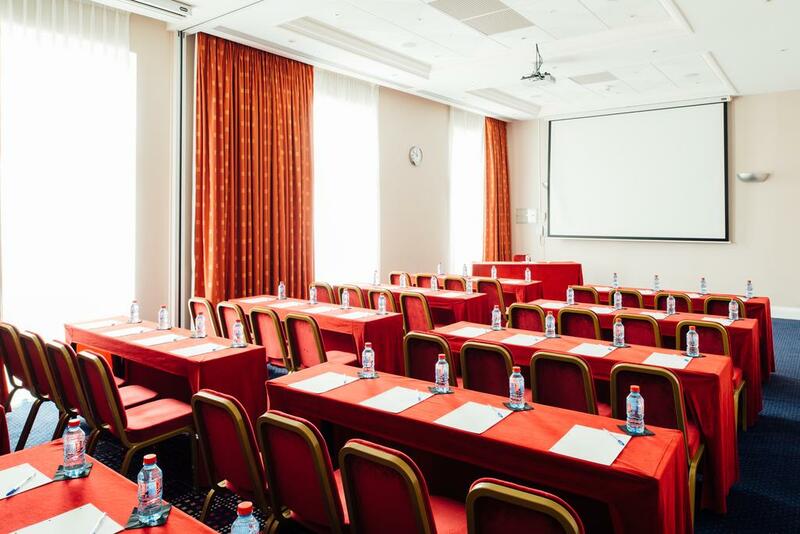 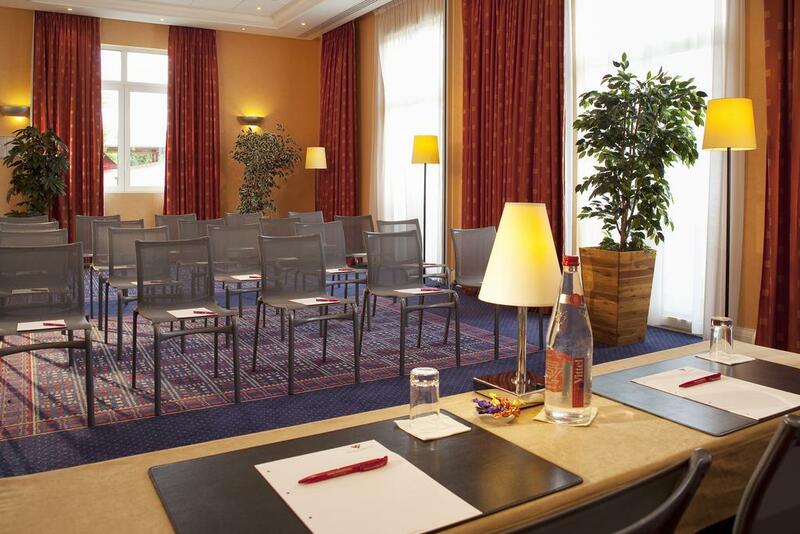 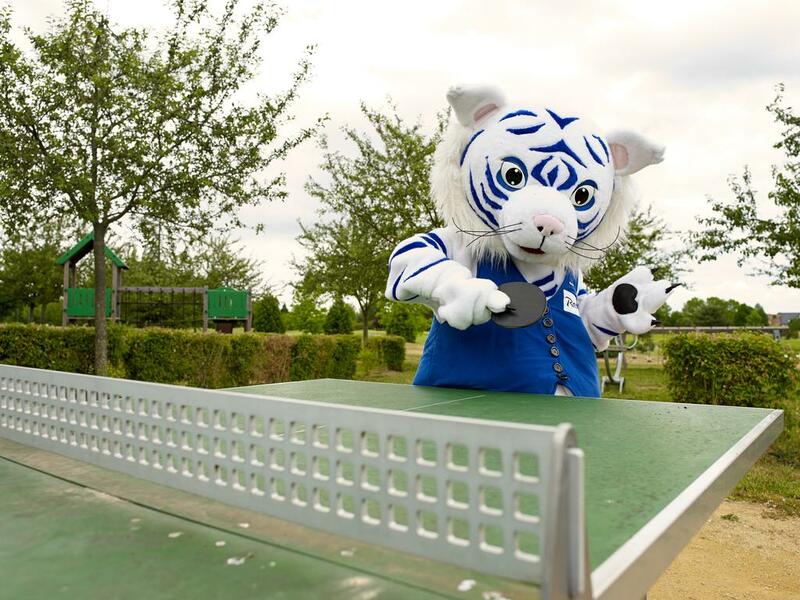 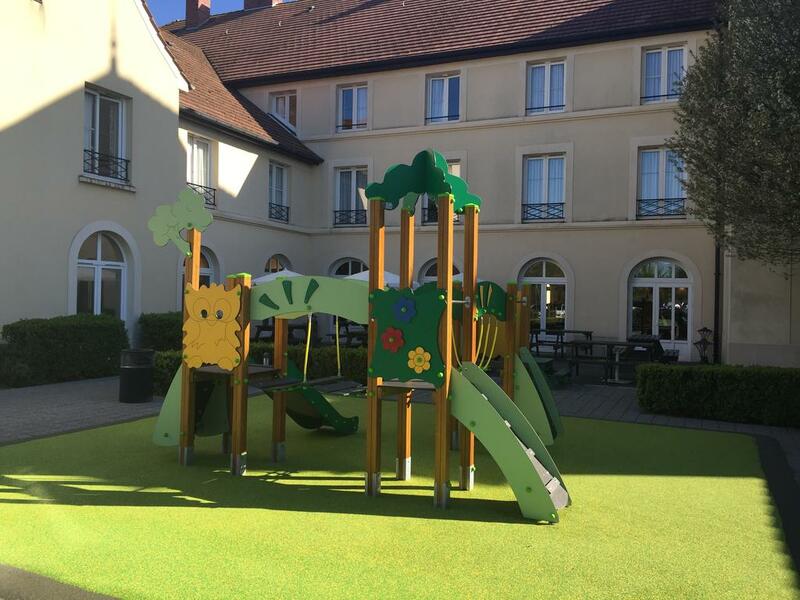 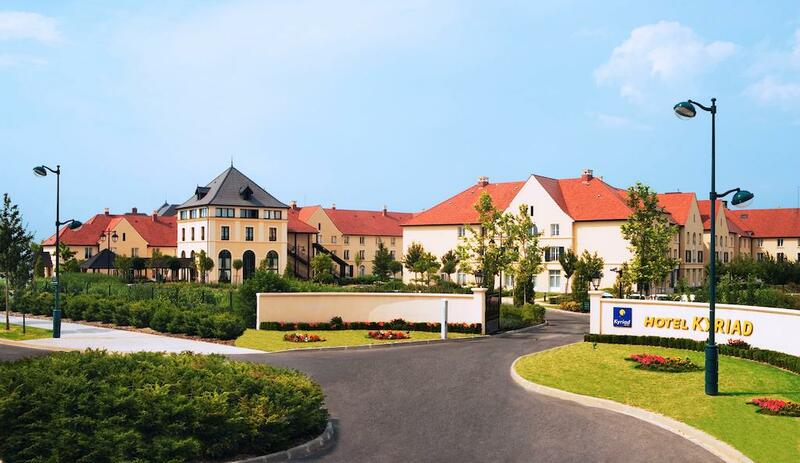 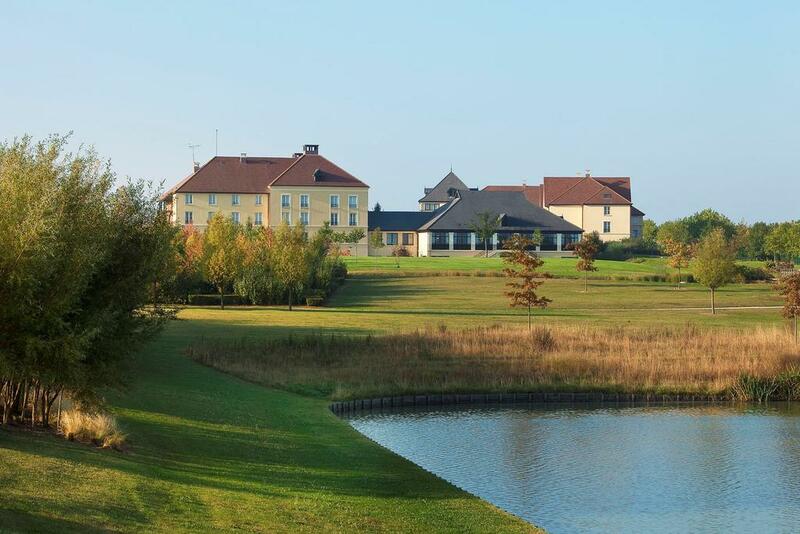 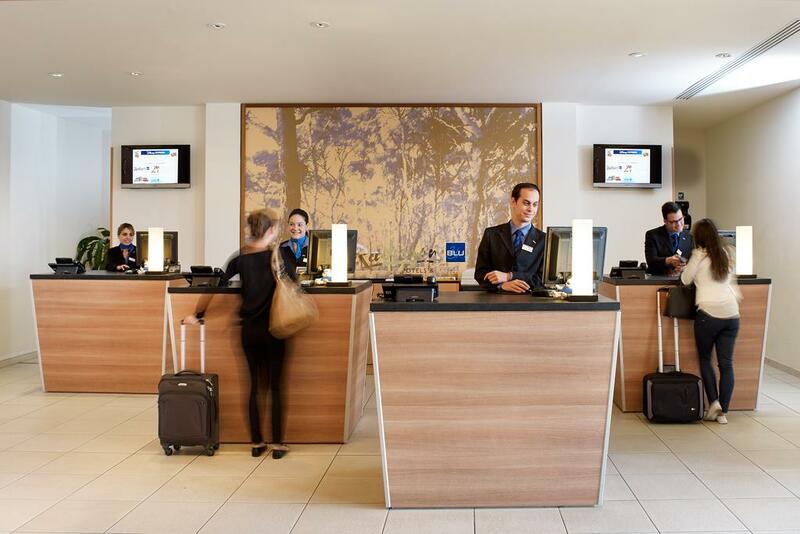 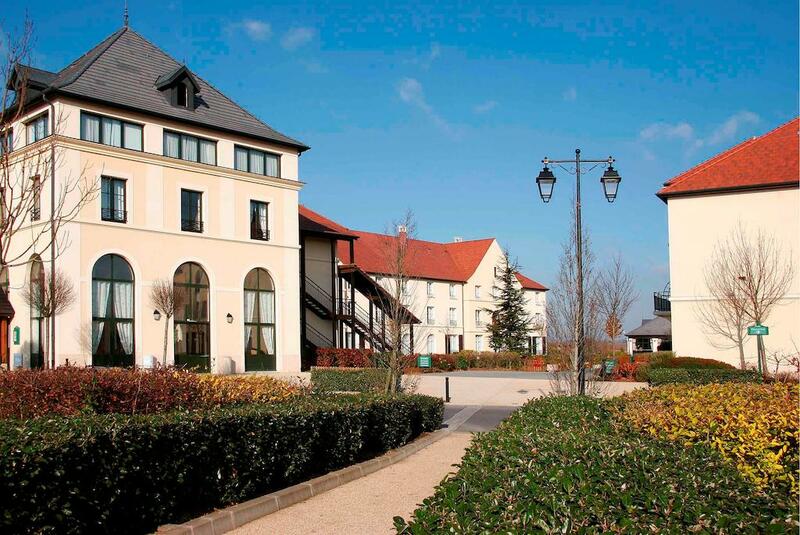 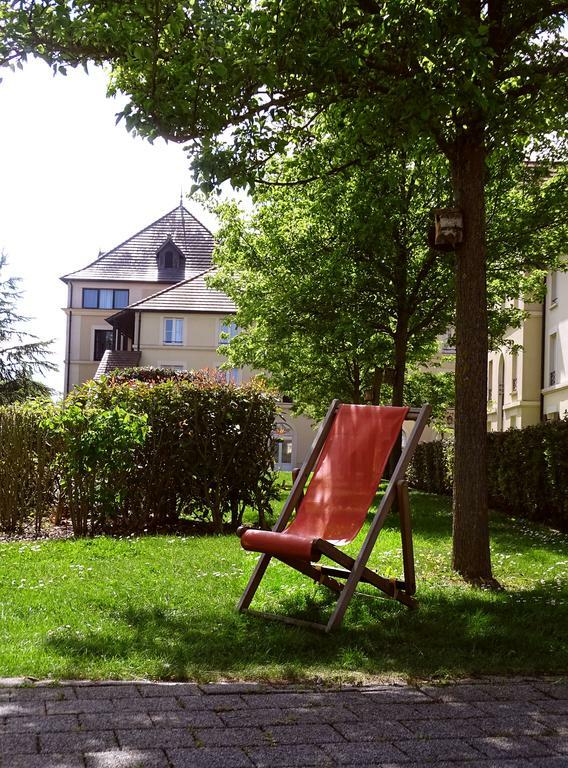 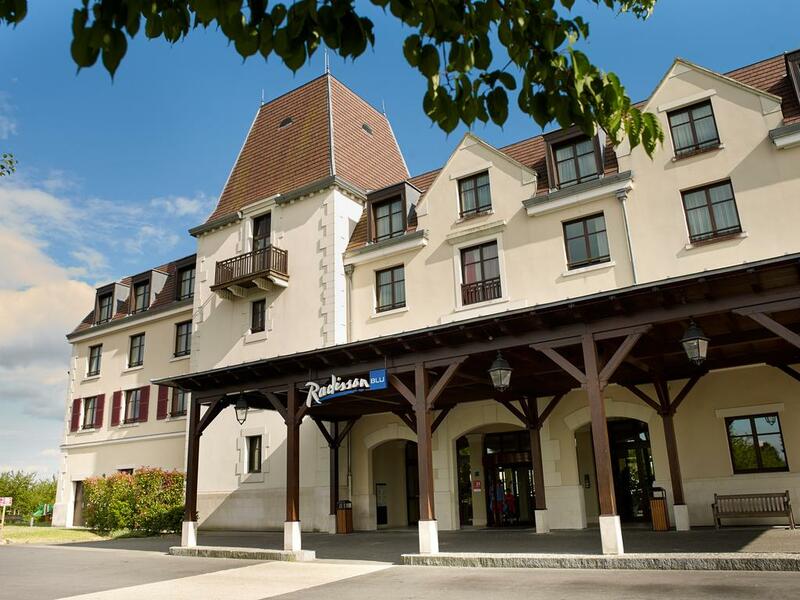 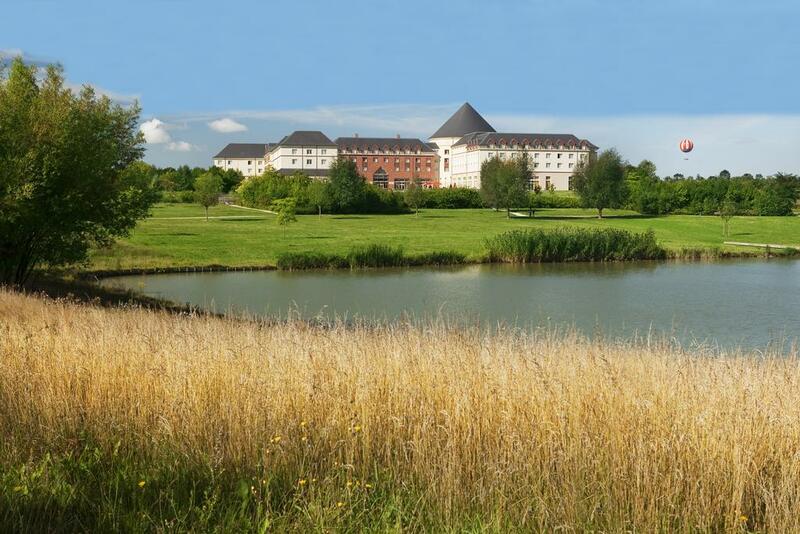 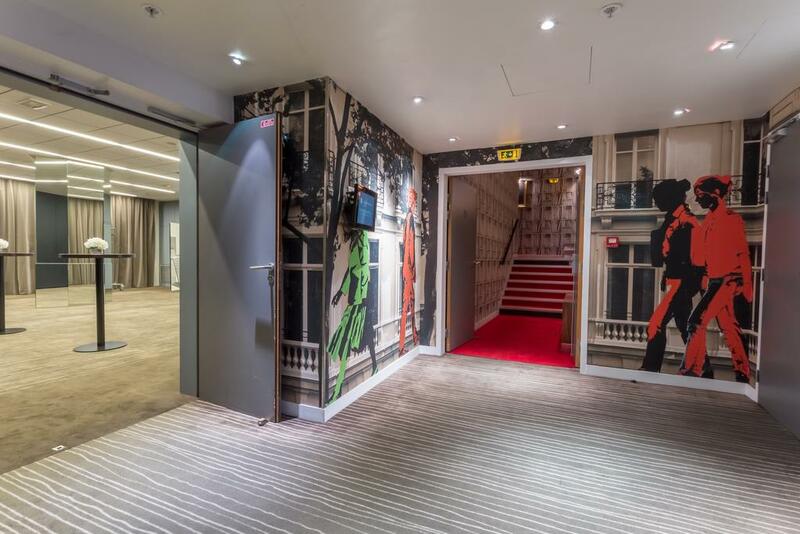 The Radisson Blu Hotel Paris, Marne-la-Vallée sits on the Disneyland Paris Golf Course, just a 10-minute drive from Disneyland and 2.5 mi from Val d’Europe RER Station and shopping center. 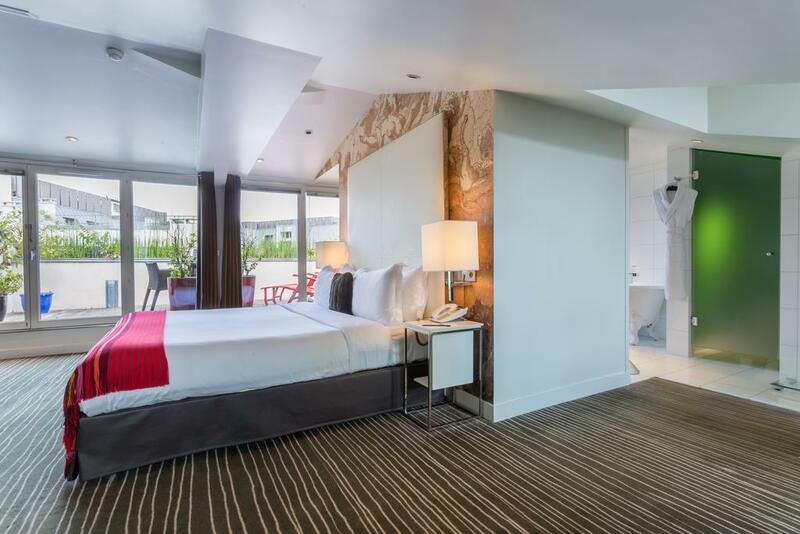 It offers contemporary rooms with views of the surroundings, a wellness center and 2 restaurants. 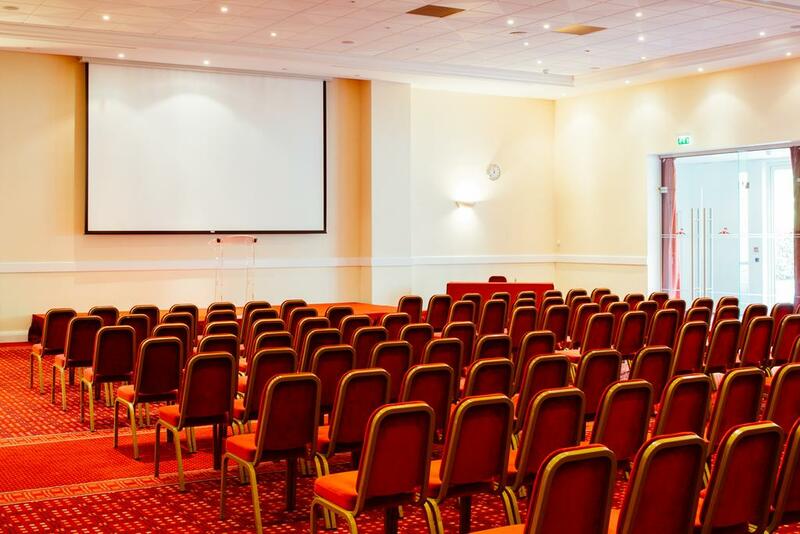 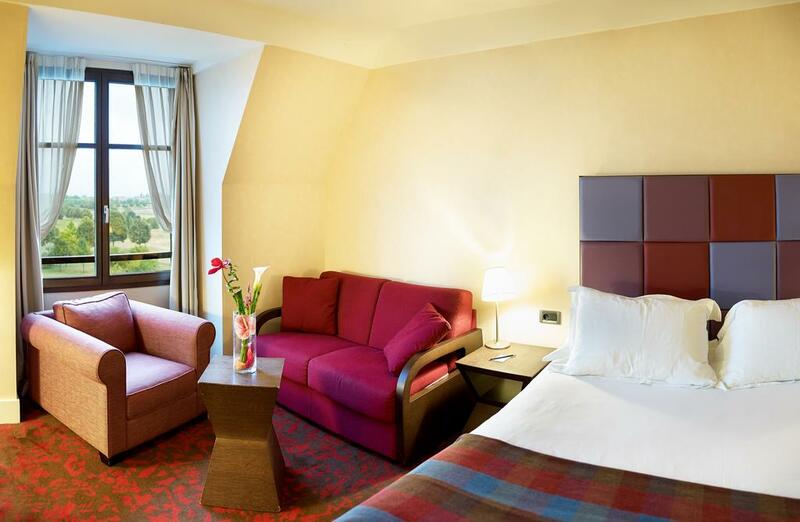 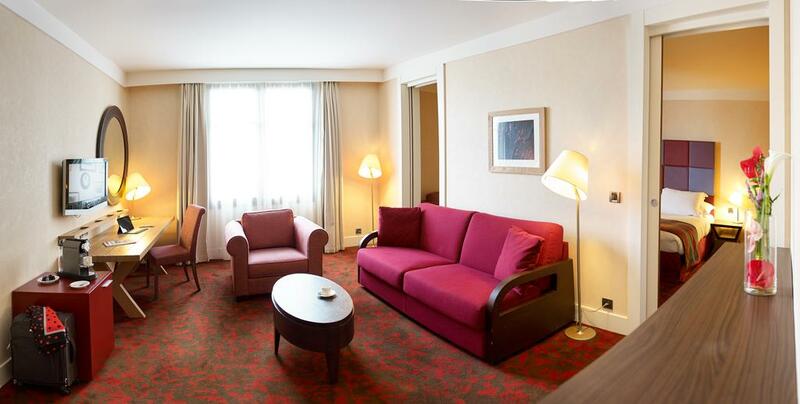 Guest rooms at the Radisson have flat-screen TV, tea and coffee facilities and free high-speed internet access. 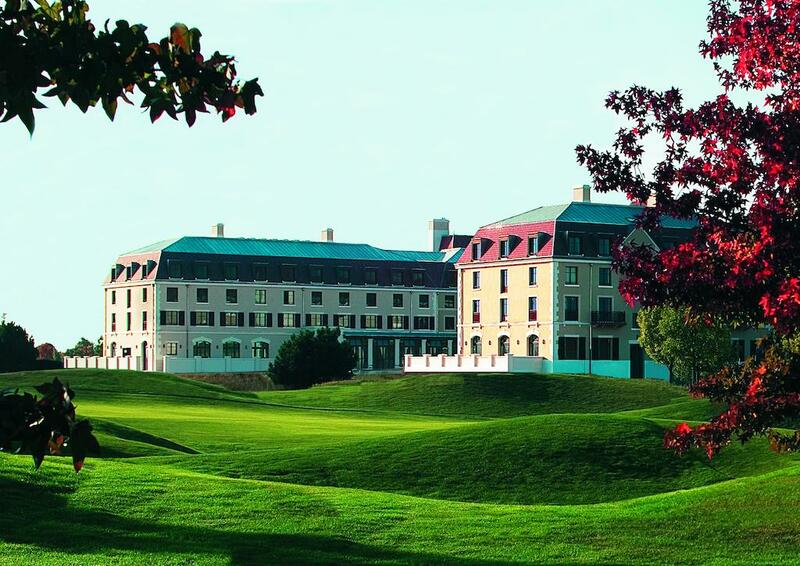 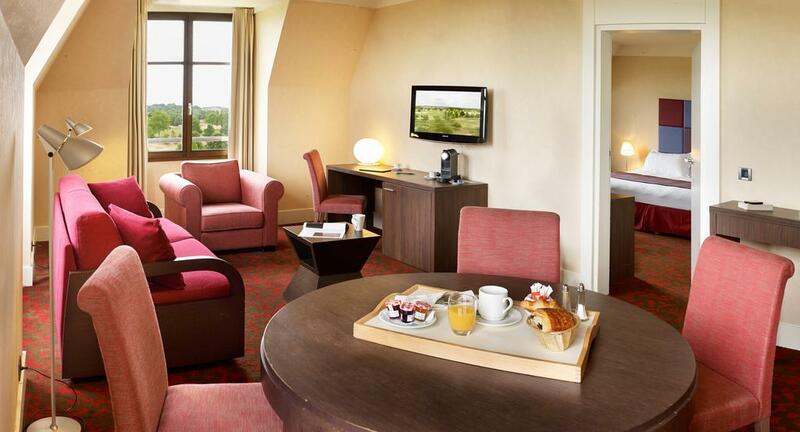 These stylish rooms and suites offer views of the golf course, while some also have a separate living room. 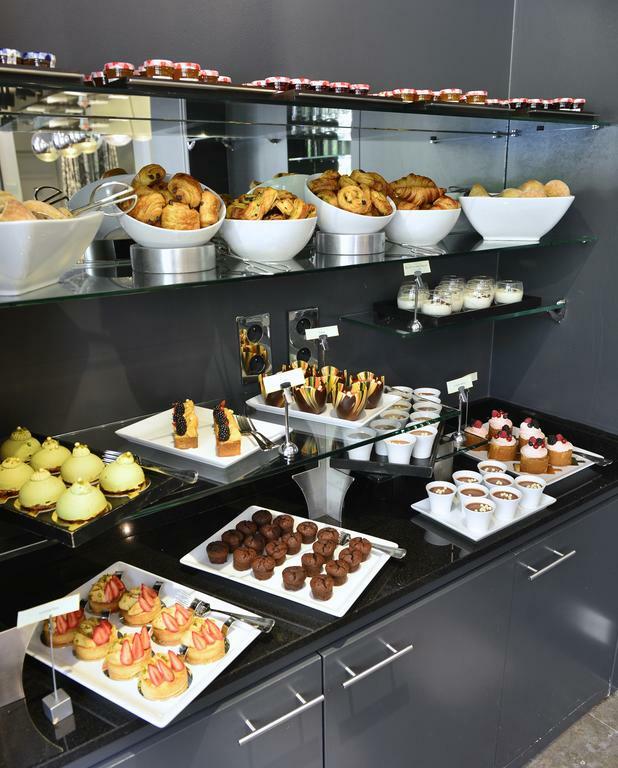 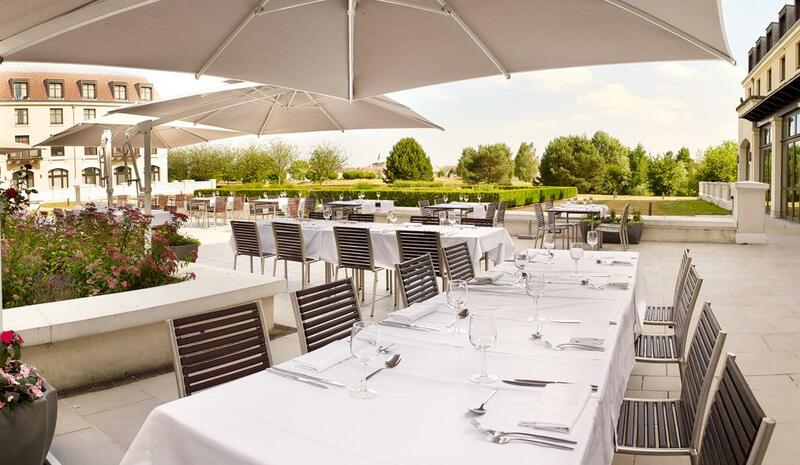 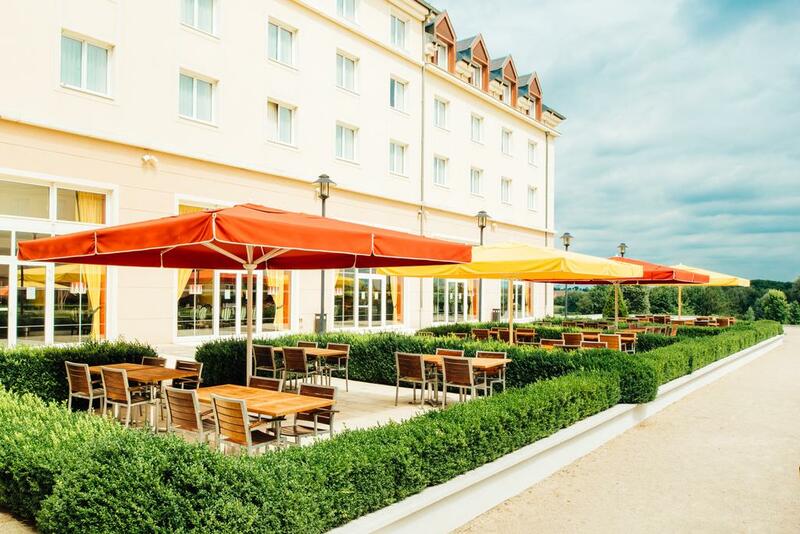 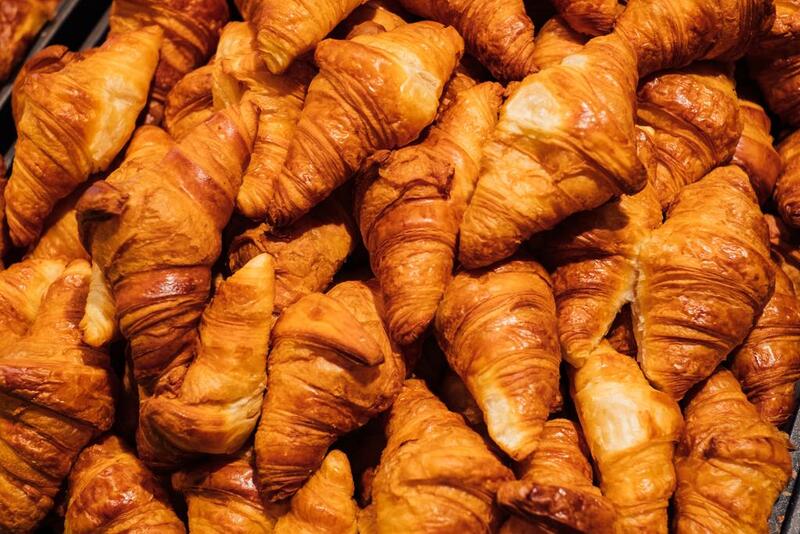 Dining in the Radisson Blu Hotel Paris, Marne-la-Vallée can begin with a copious buffet breakfast at the Restaurant Birdie. 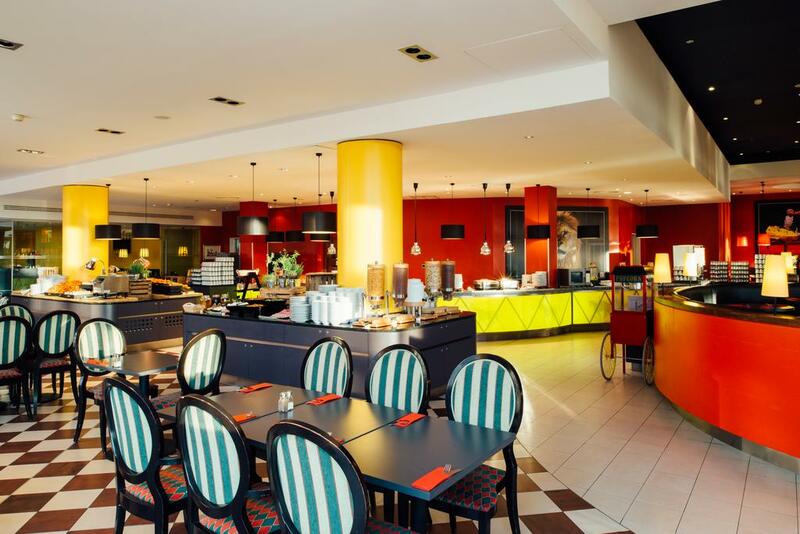 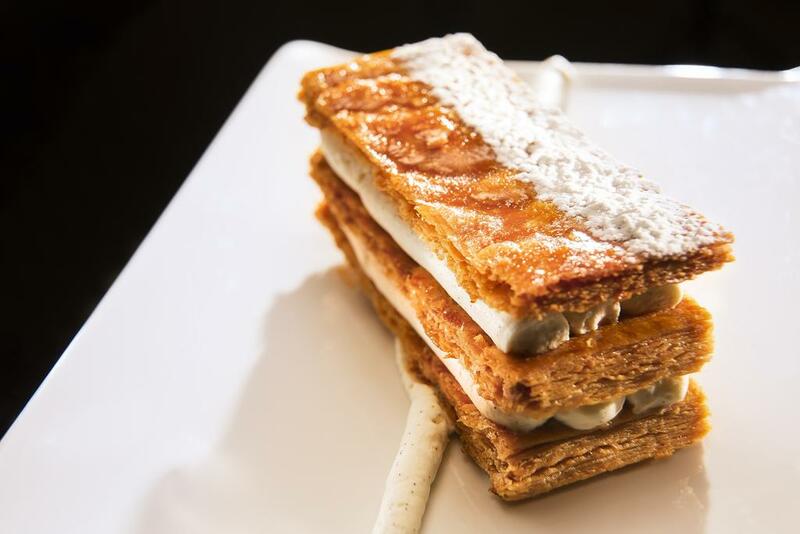 The Pamplemousse restaurant offers fine dining and specializes in French cuisine, while the Chardon Bar serves light snacks and sandwiches. 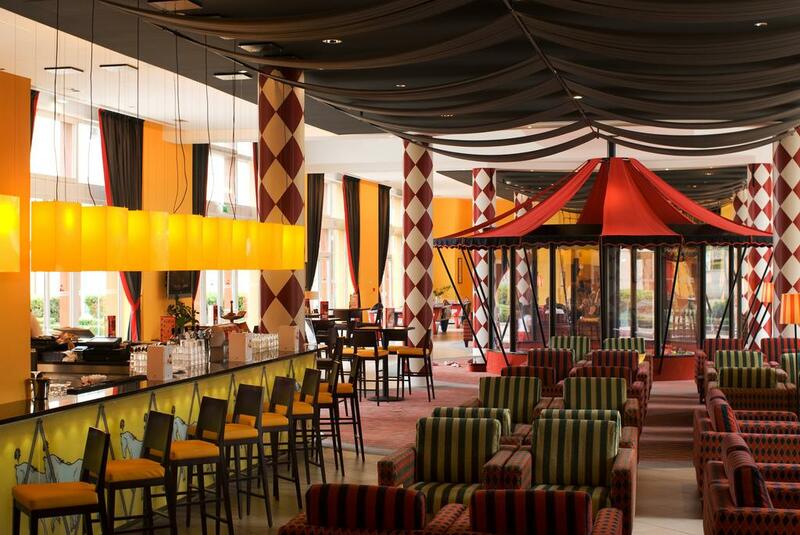 During the summer season, the shisha bar is open until 01:00. 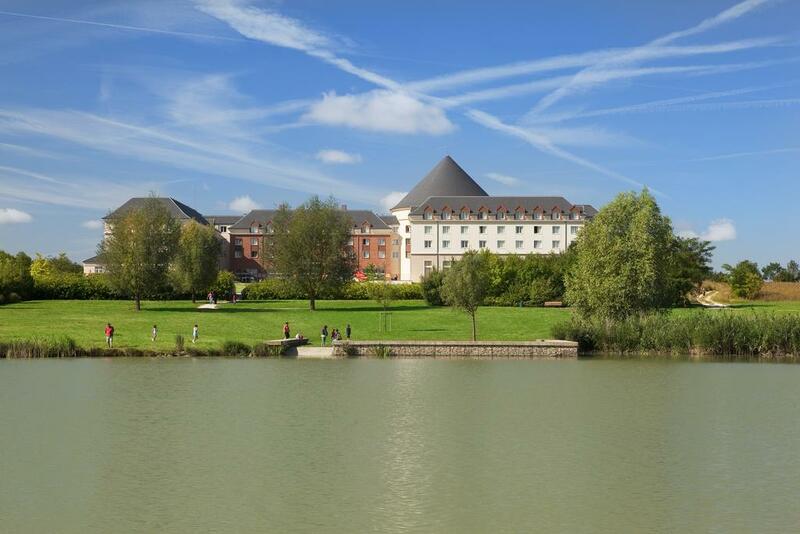 A free shuttle service will take guests from the hotel to the Marne la Vallee-Chessy Train Station and the Disneyland Resort Paris. 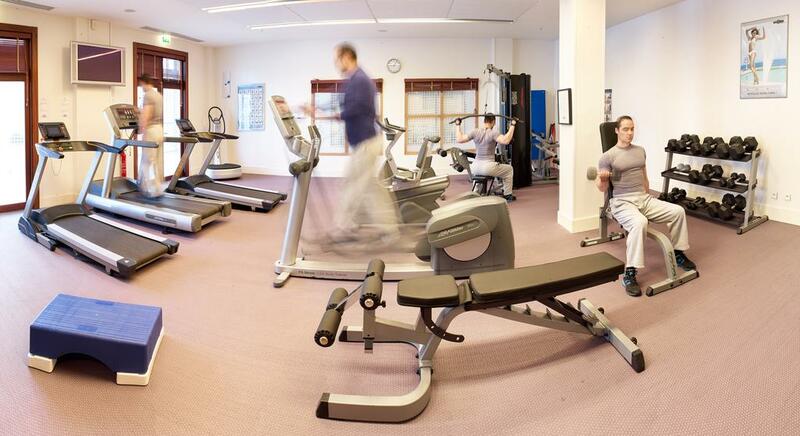 The wellness center features a fitness area, sauna, hammam and indoor swimming pool. 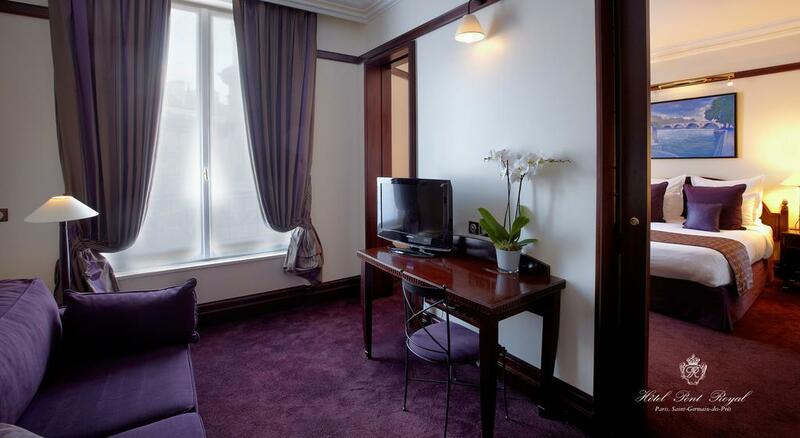 It is available free of charge from 07:00 to 23:00 for hotel guests only. 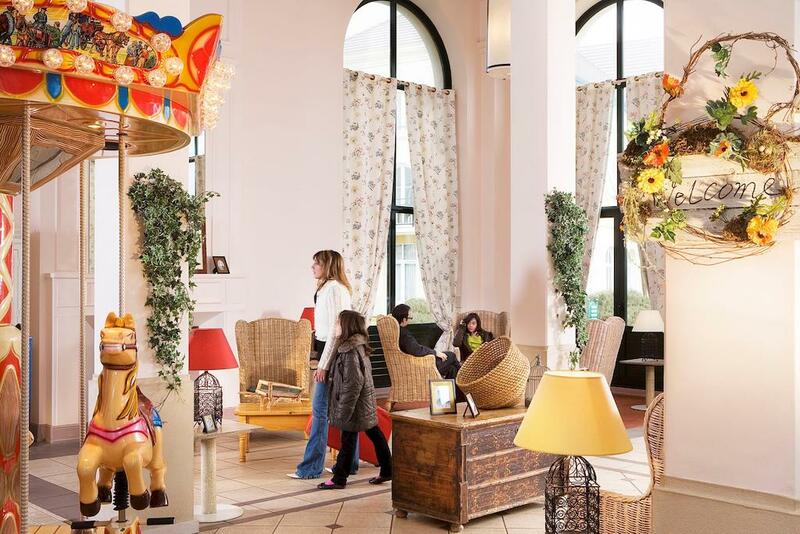 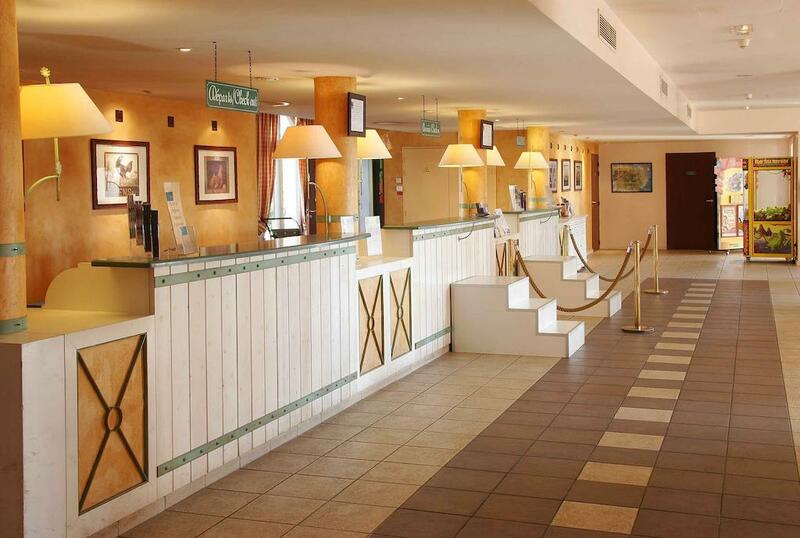 This hotel offers a free shuttle service to Disneyland® Paris, which is less than 10 minutes away. 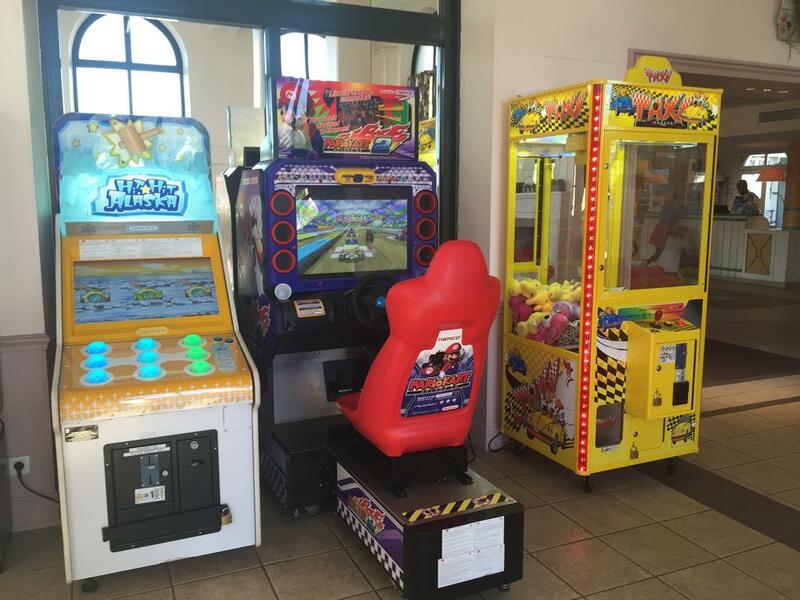 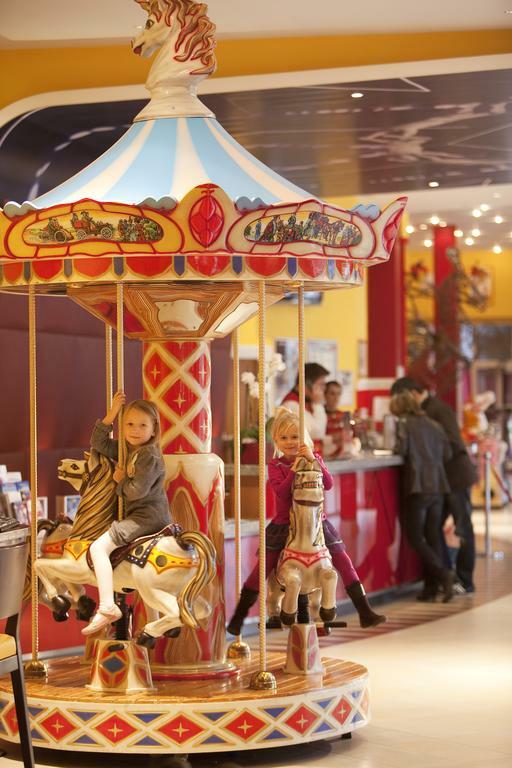 It features a Disney store, a merry-go-round and a video games room. 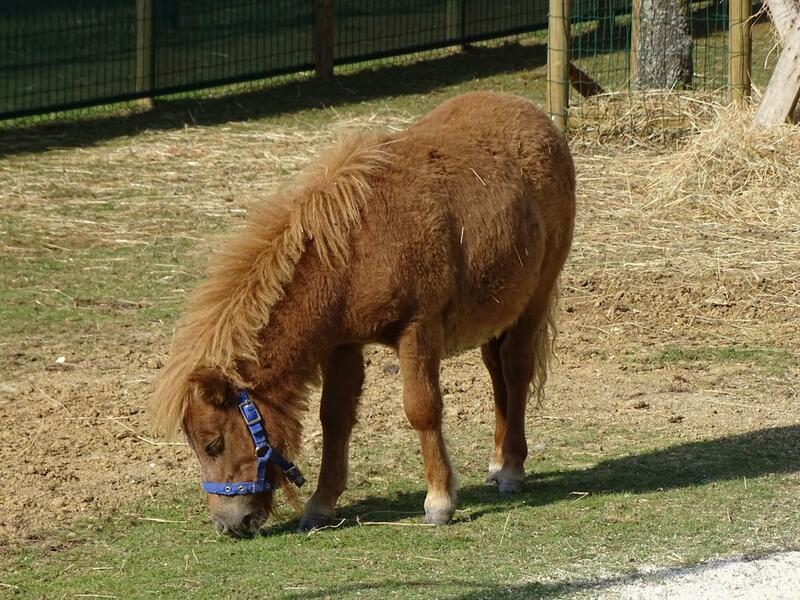 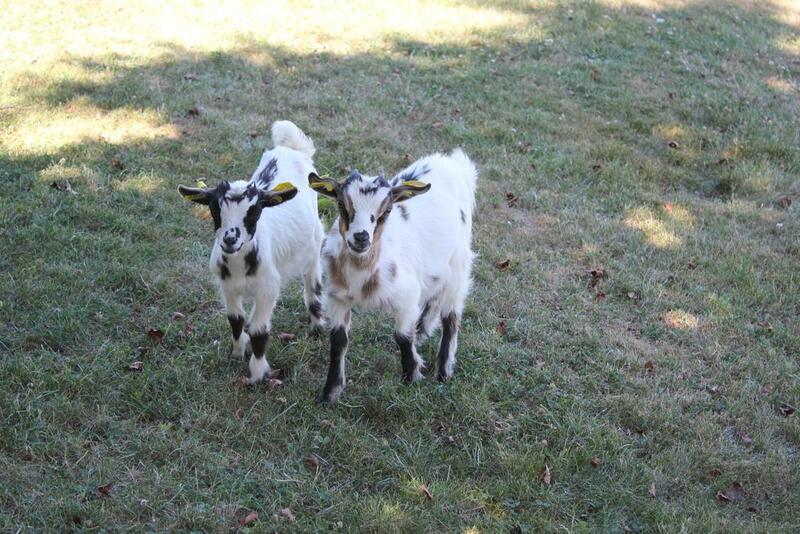 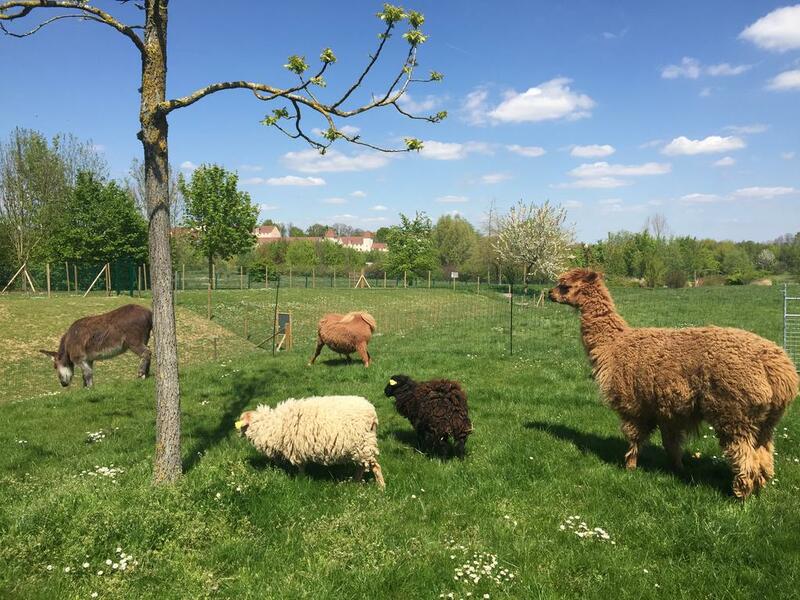 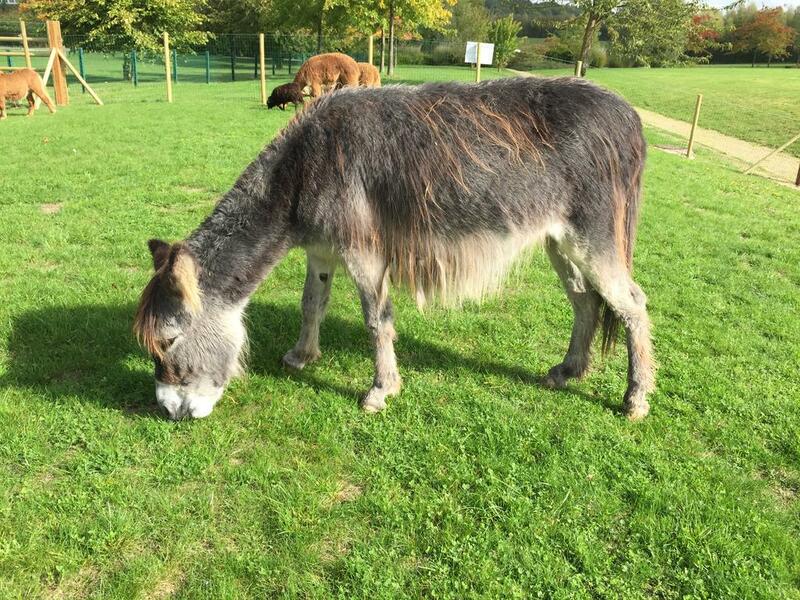 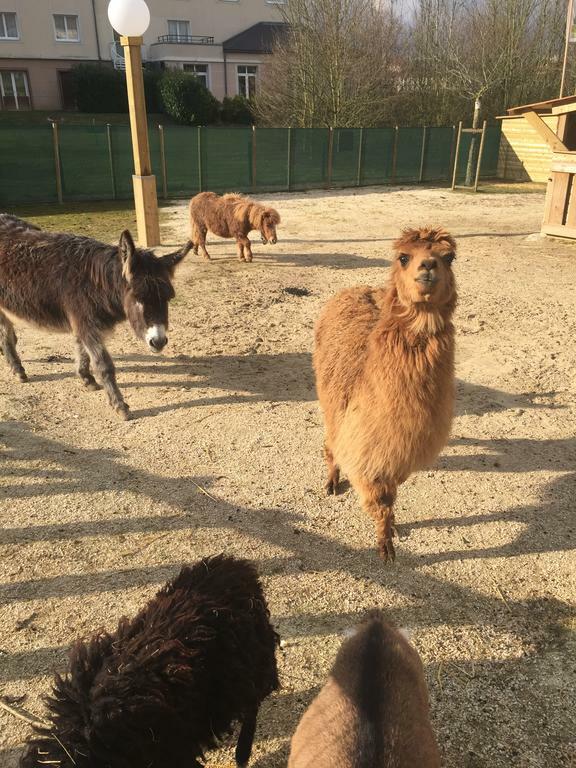 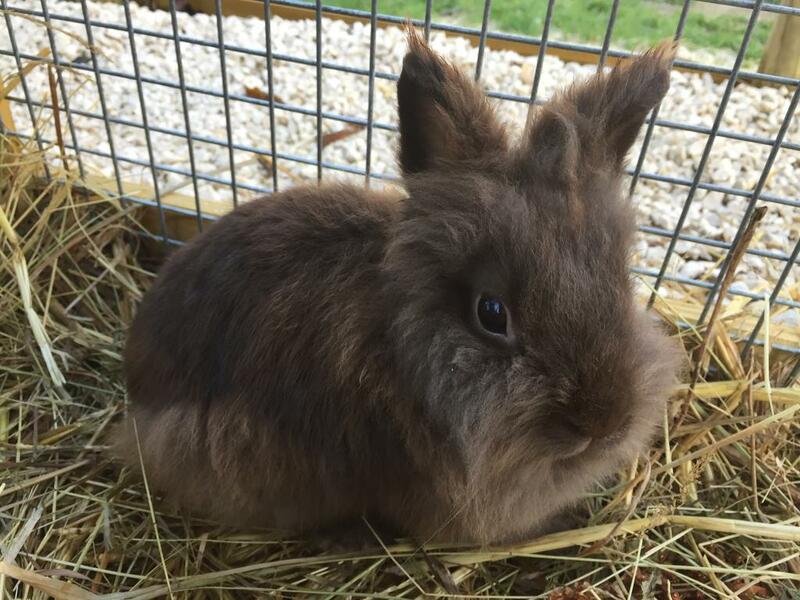 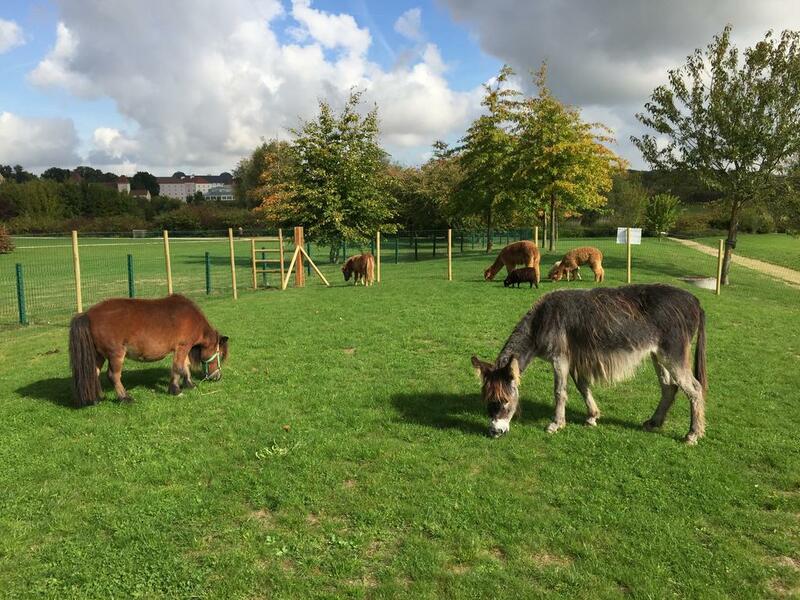 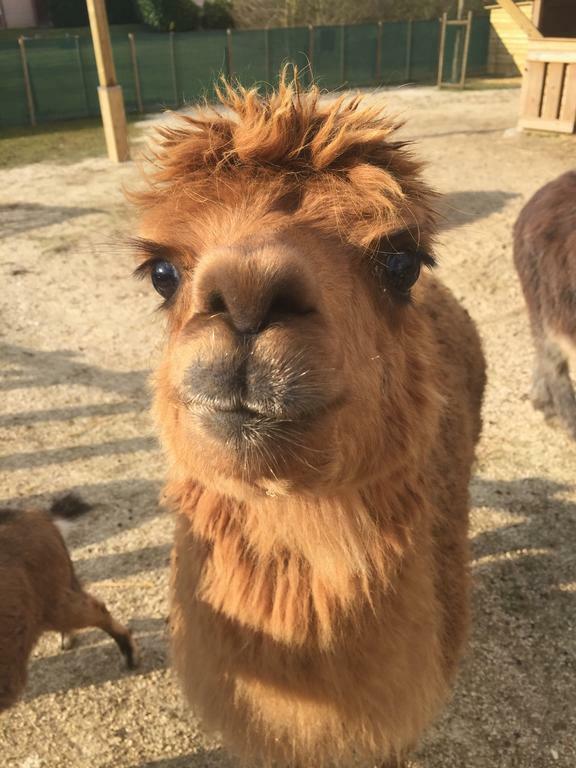 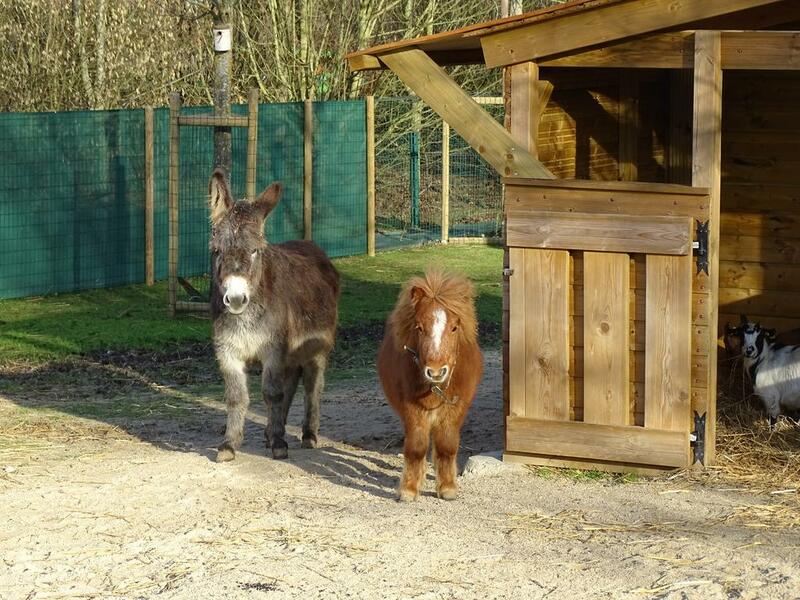 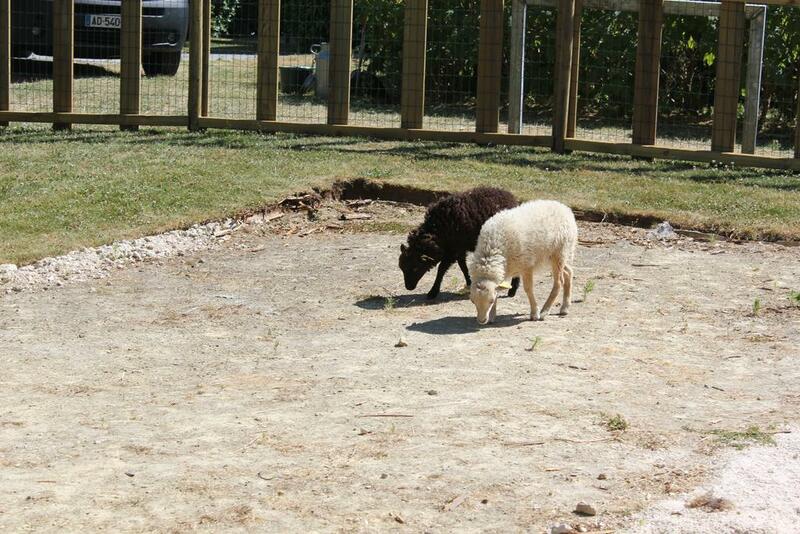 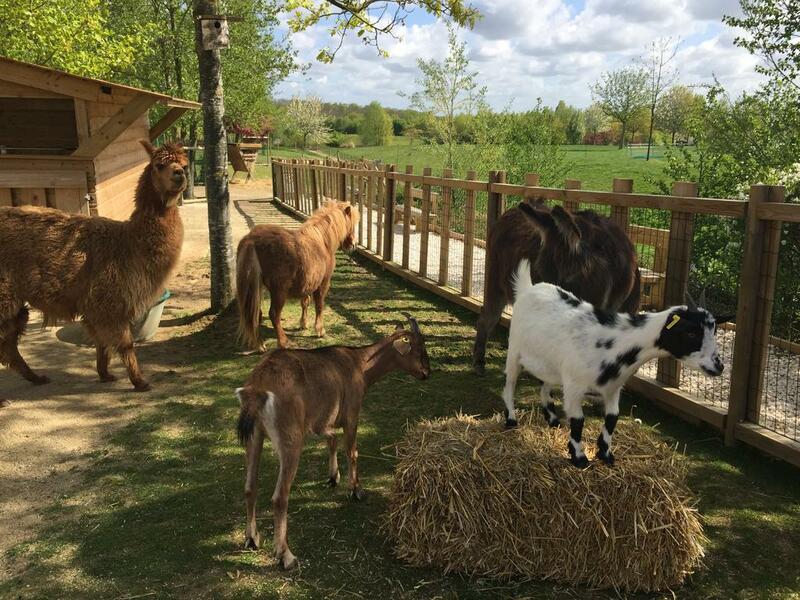 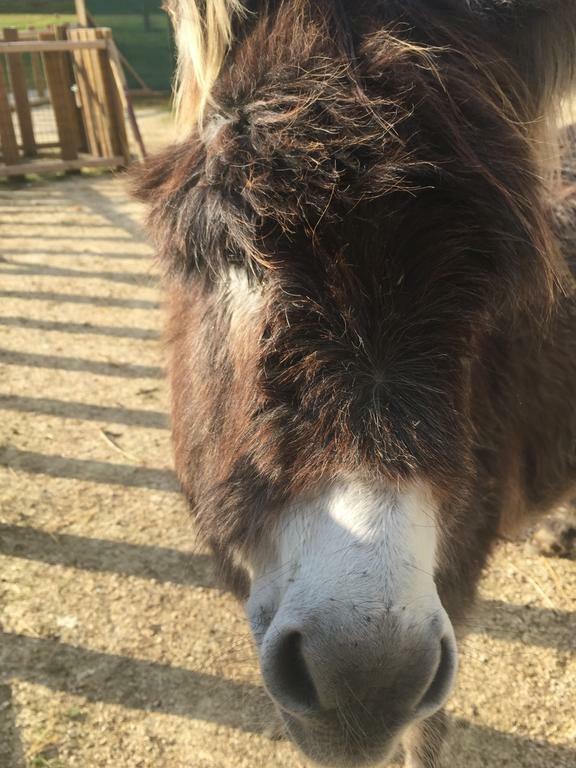 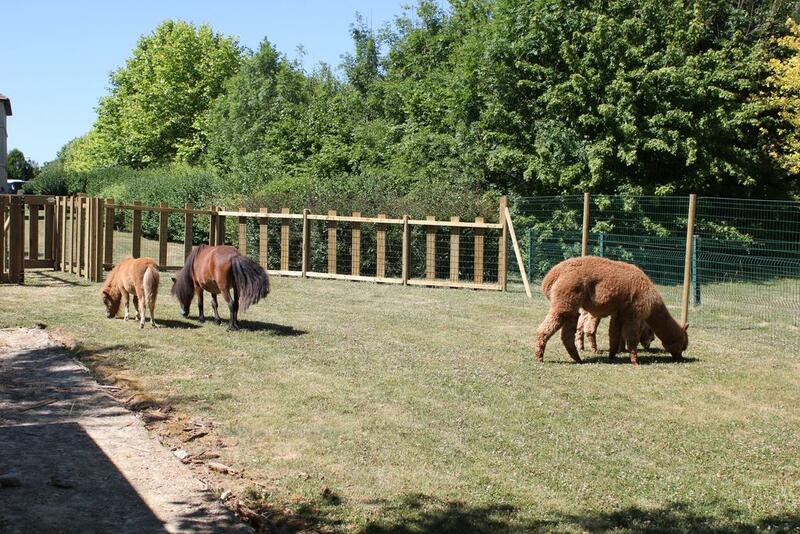 Adults and children can admire ponies, goats and rabbits in the on-site farm. 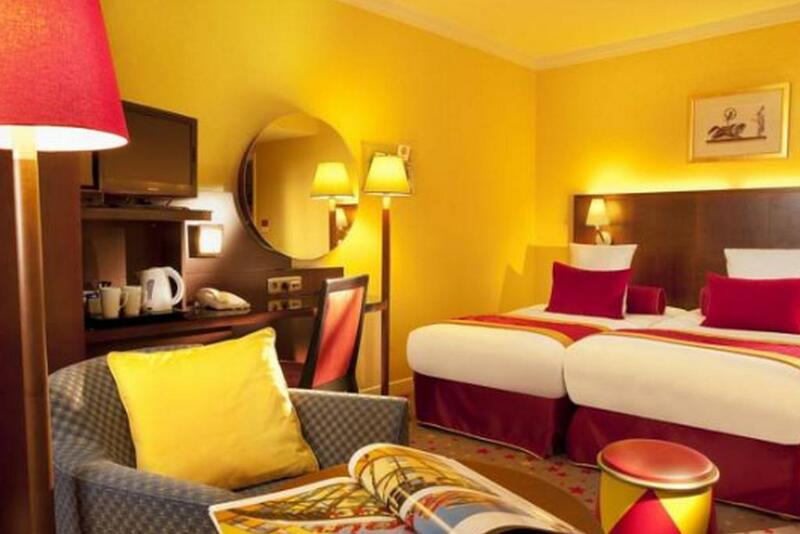 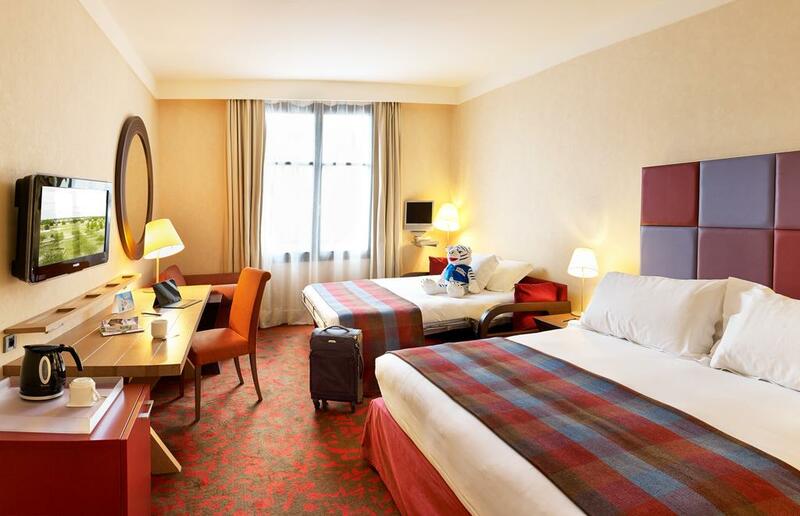 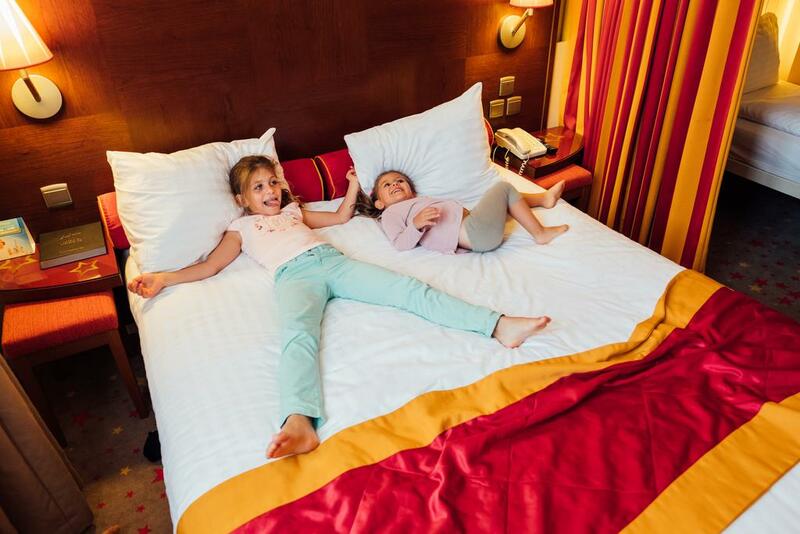 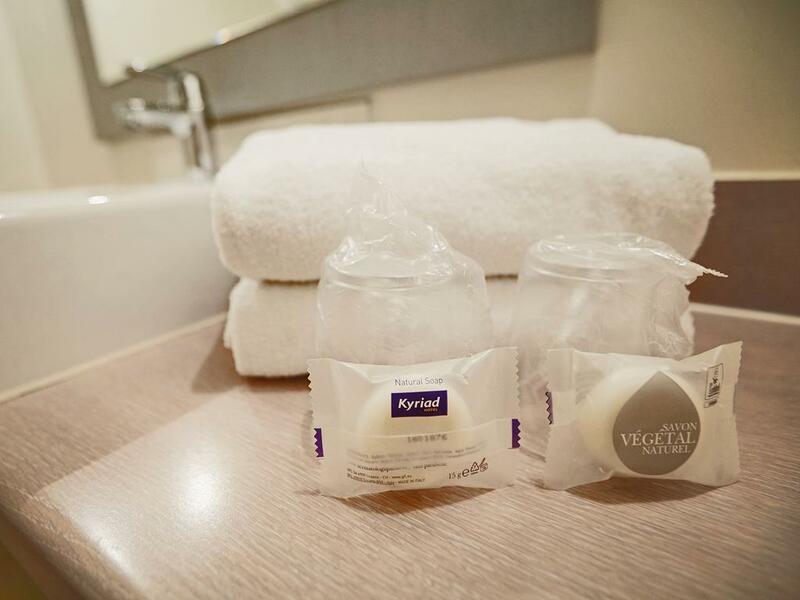 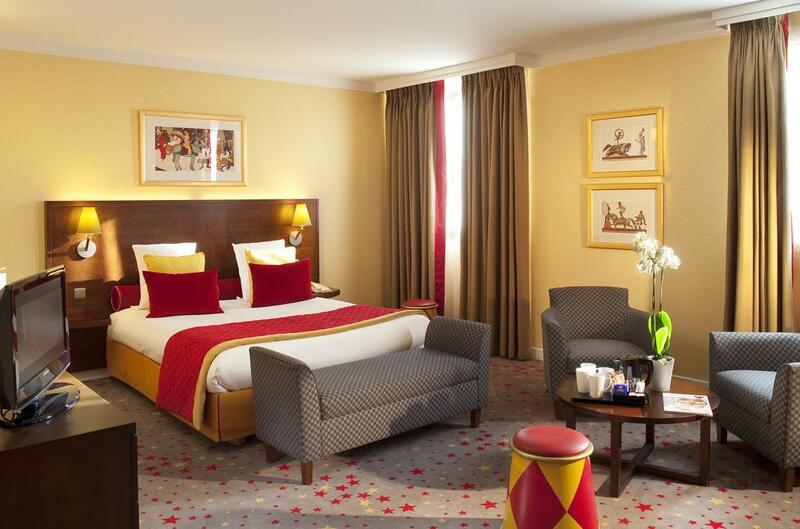 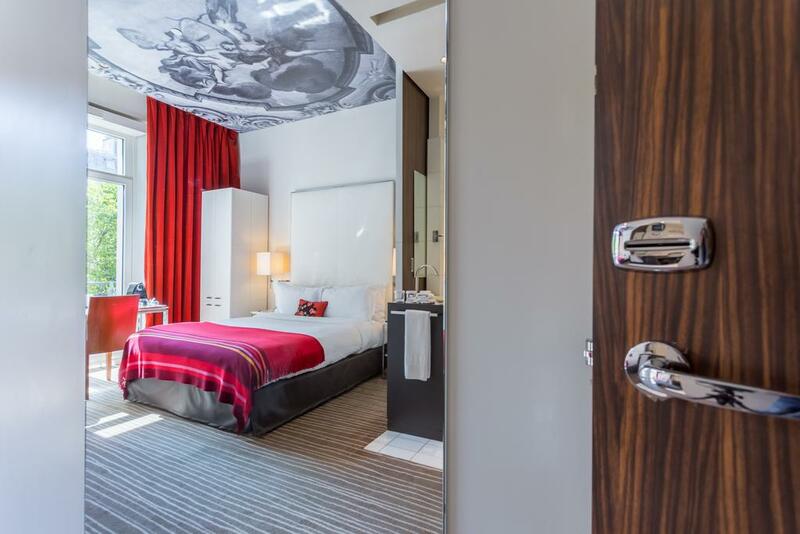 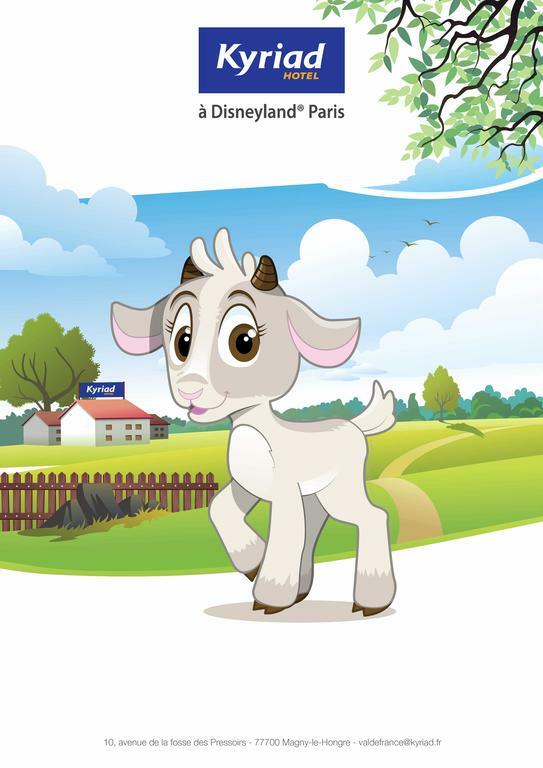 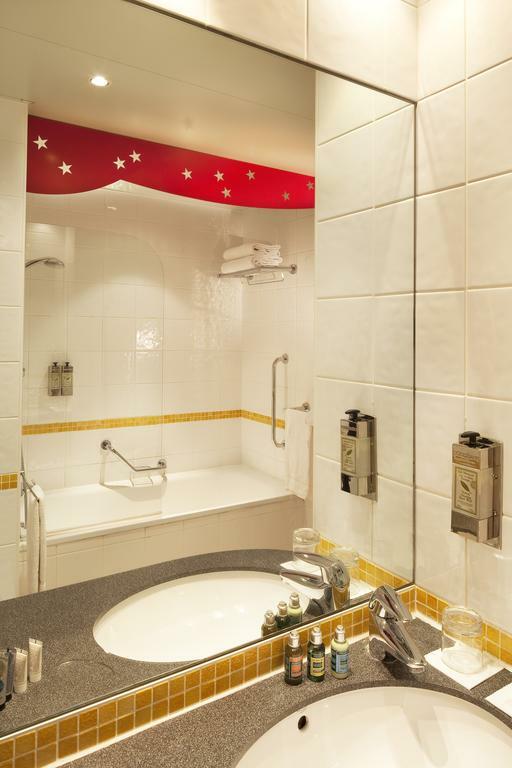 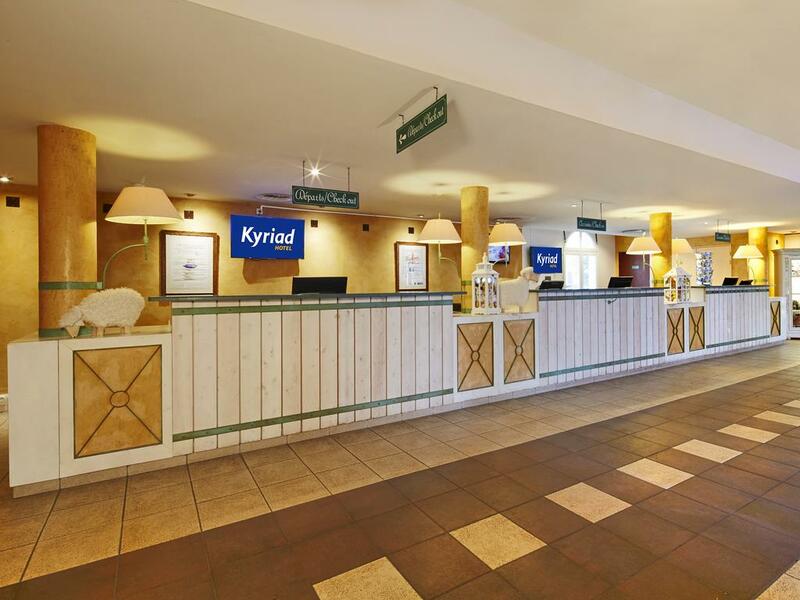 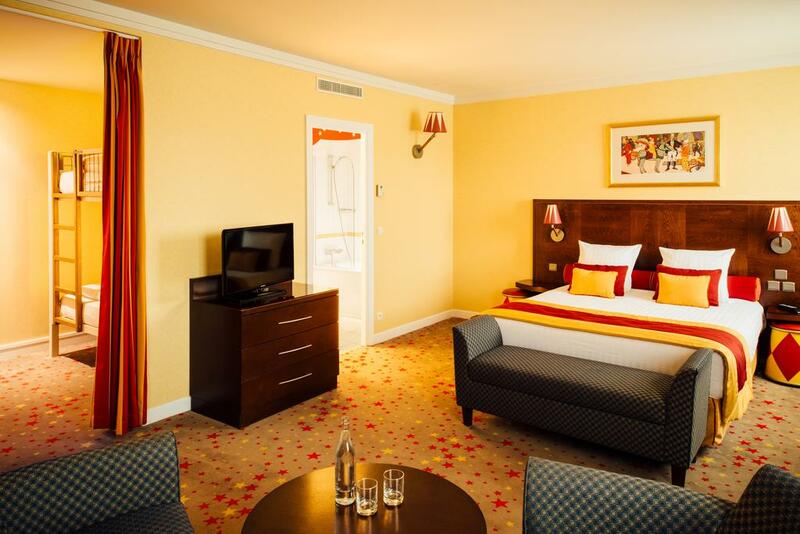 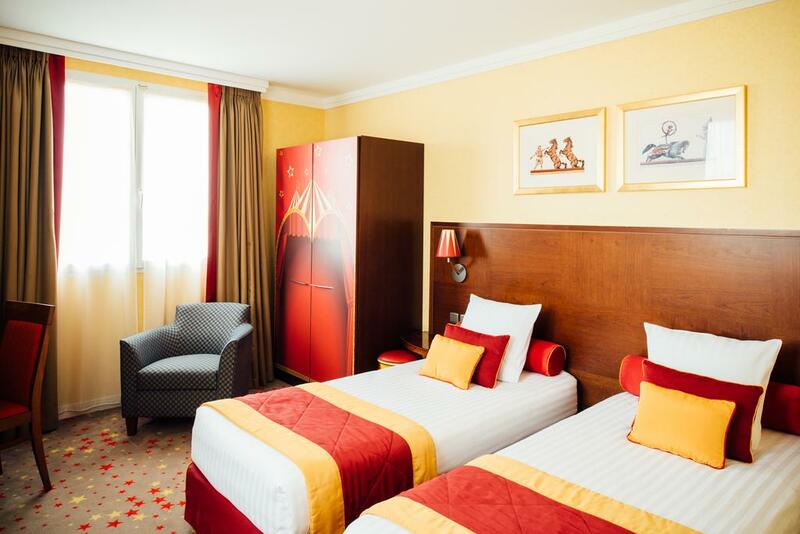 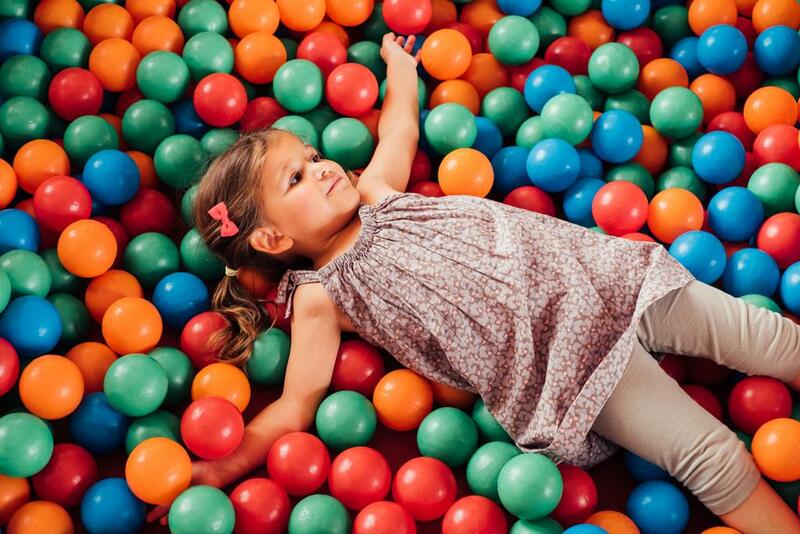 Each air-conditioned room at the Kyriad Disneyland® Paris has free Wi-Fi, a flat-screen TV and a private bathroom with a bath and a hairdryer. 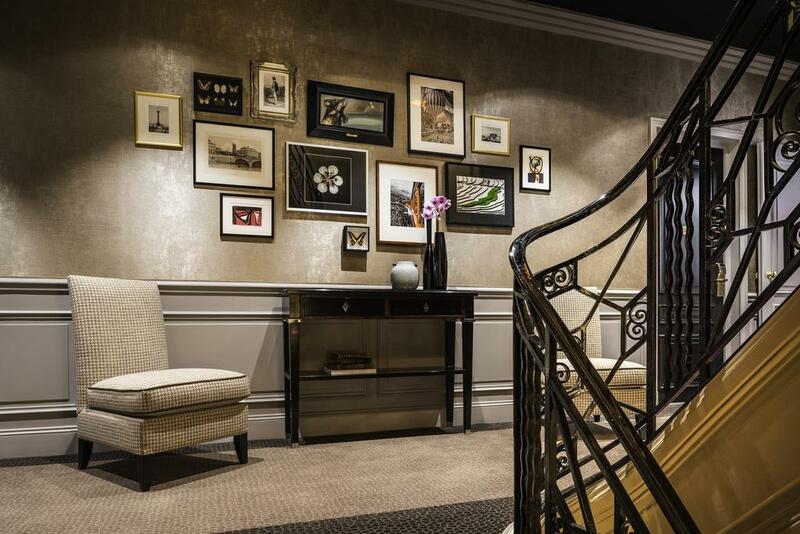 All rooms are accessible by a elevator. 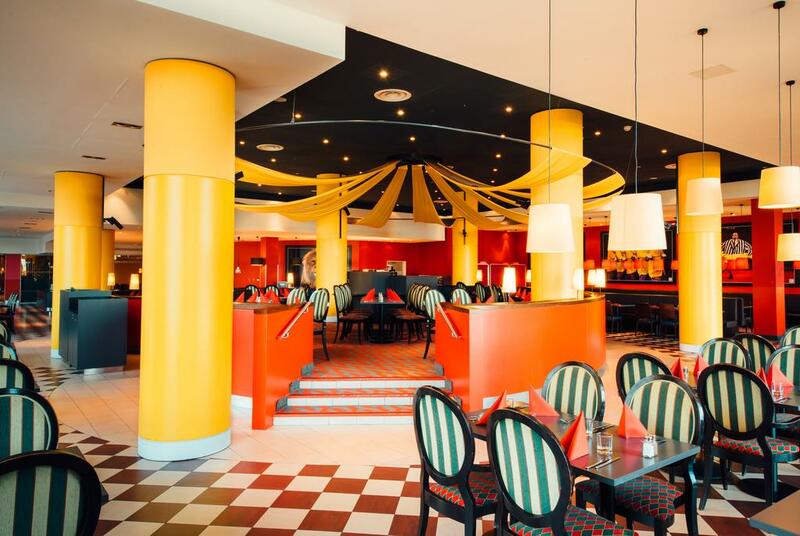 Le Marché Gourmand restaurant offers buffet-style dinners and breakfasts. 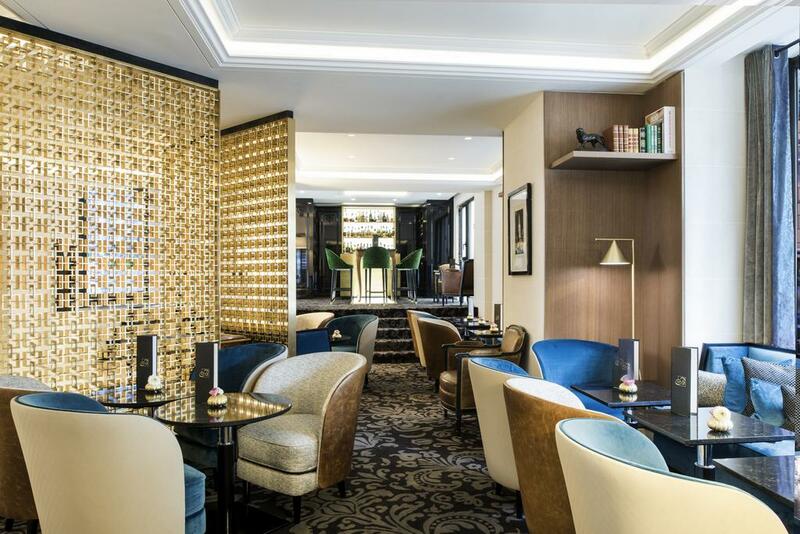 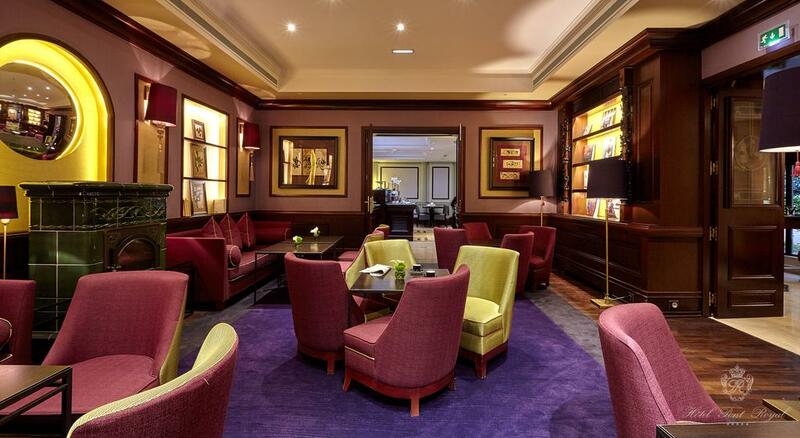 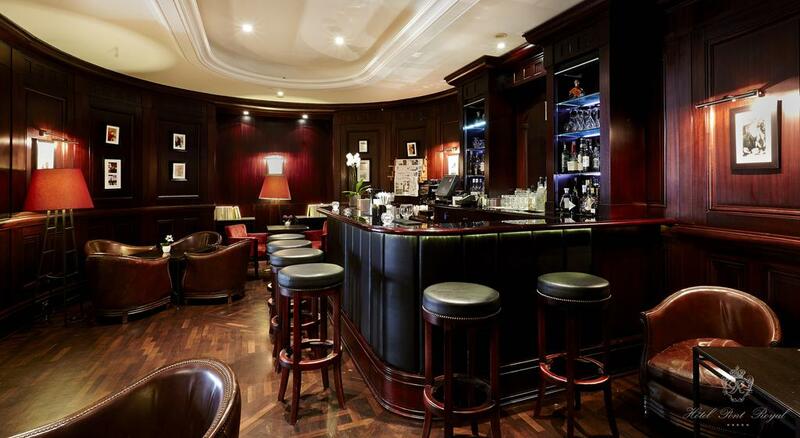 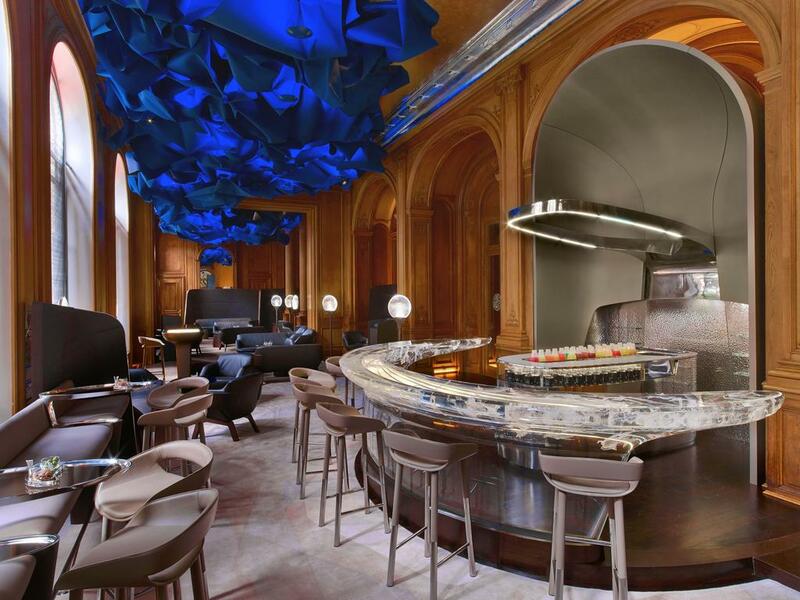 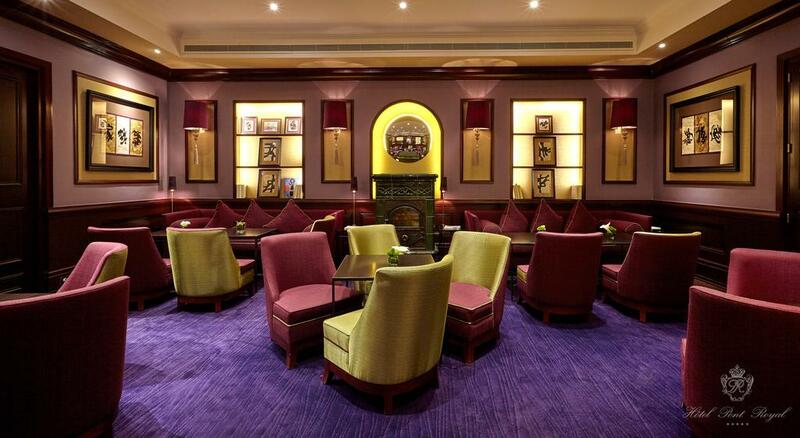 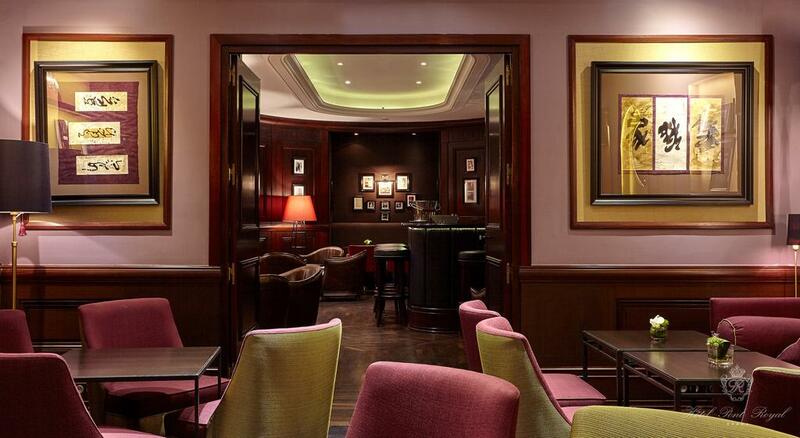 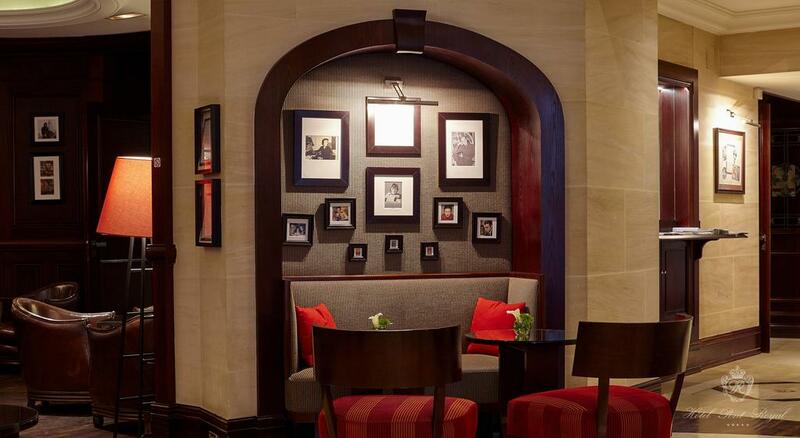 Guests can enjoy a drink at the L’Abreuvoir bar. 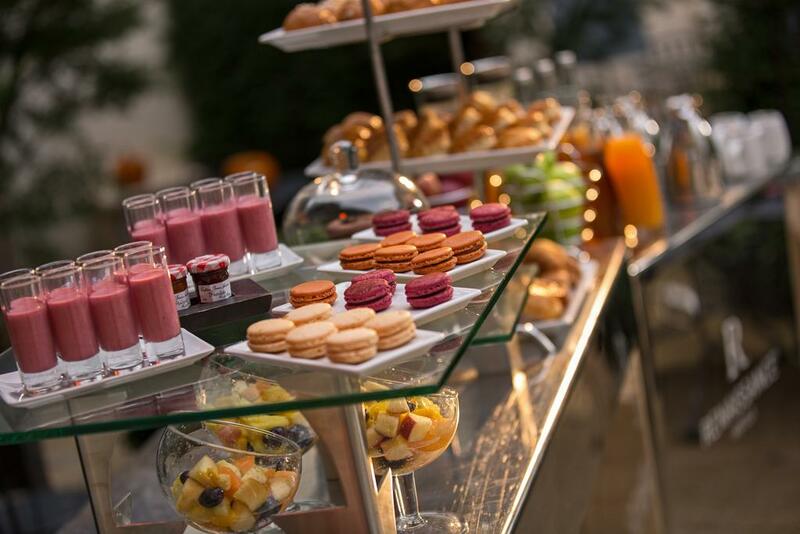 Guests may also sample the Express breakfast available between 8:30 and 11:00 at the L’Abreuvoir Bar. 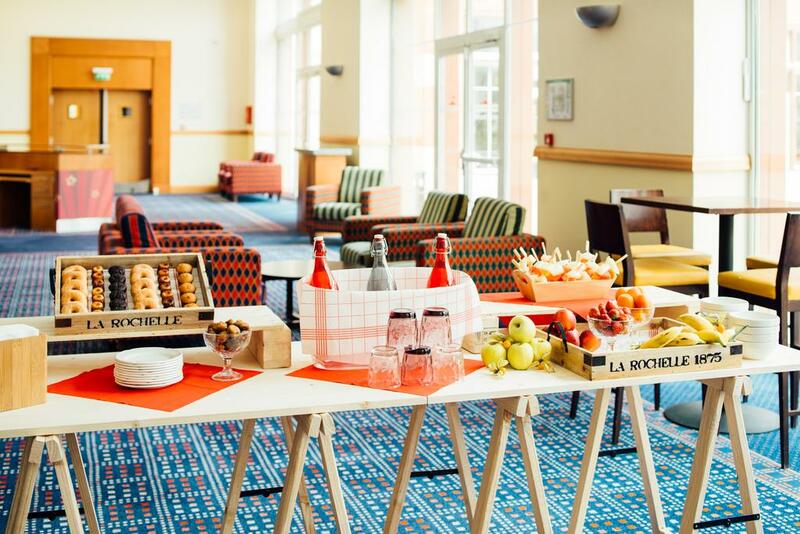 Snacks are available throughout the day at the same spot. 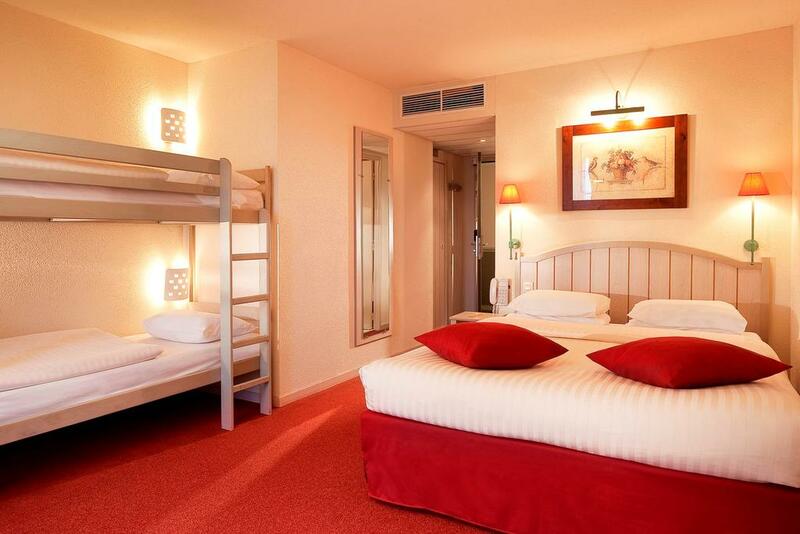 The property has a 24-hour reception and free luggage storage. 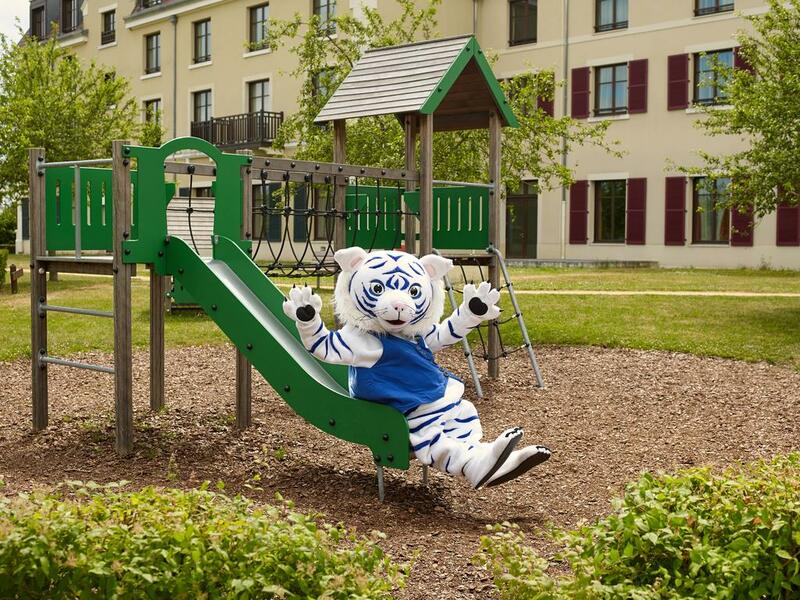 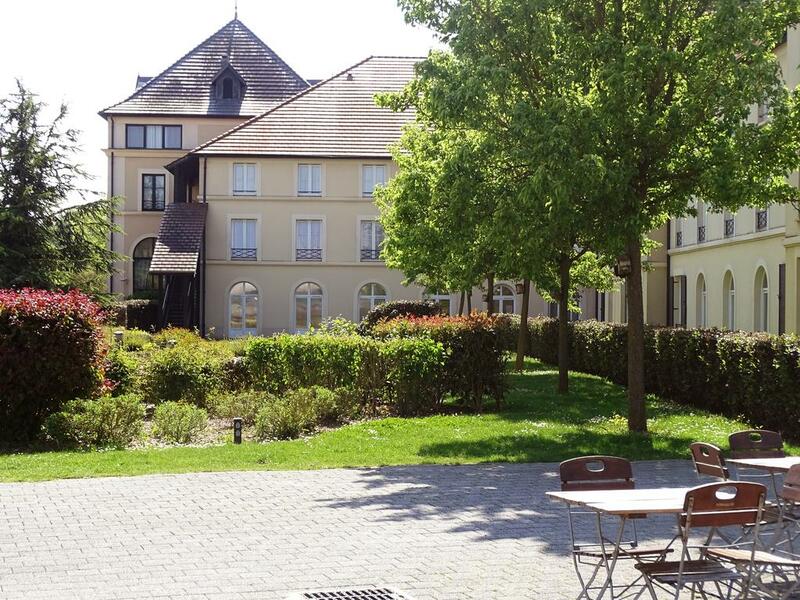 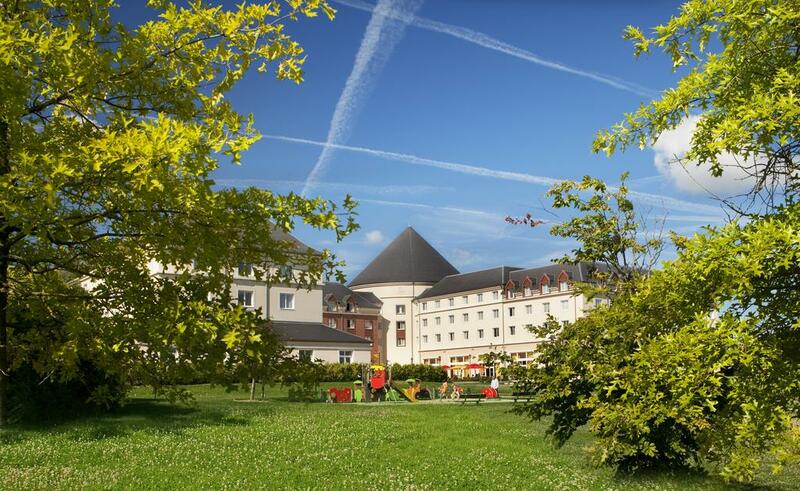 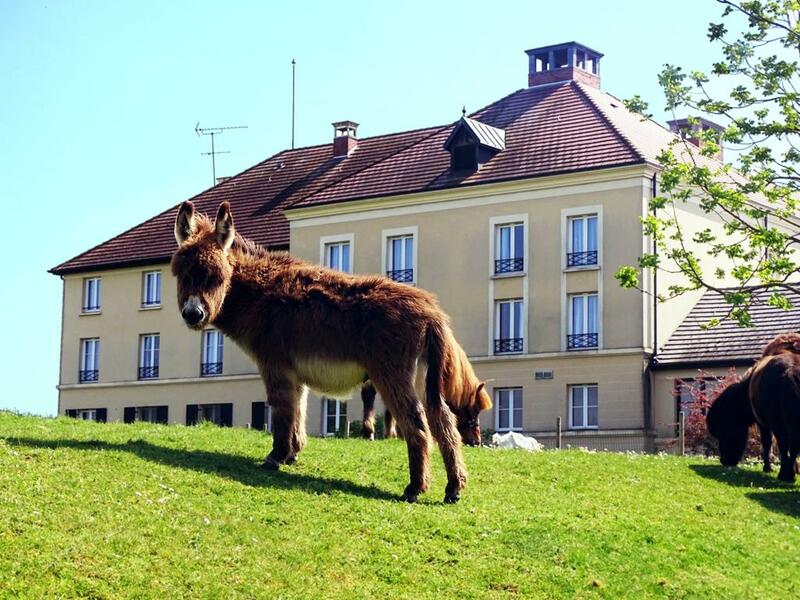 A direct shuttle to Marne-la-Vallée Train Station and the Disney Village is also available. 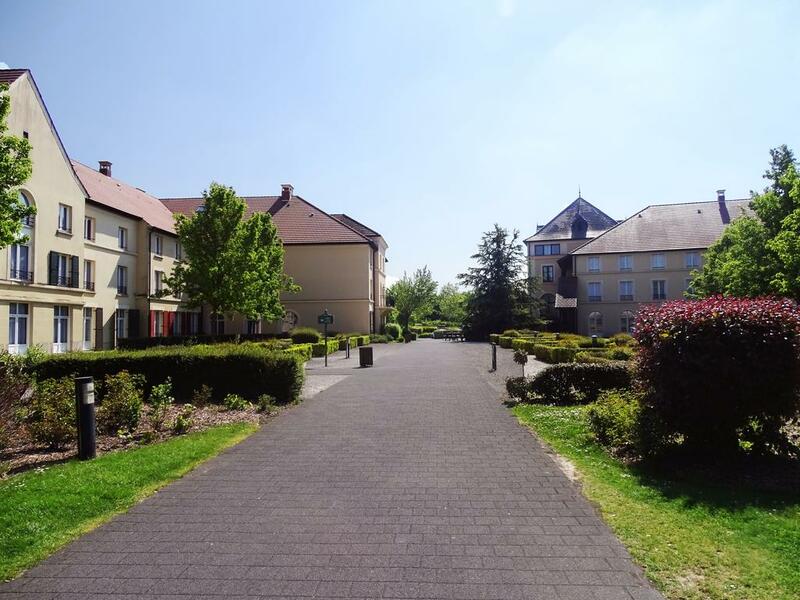 Marne la Vallée-Chessy RER Train station is 0.6 mi away giving direct access to Paris. 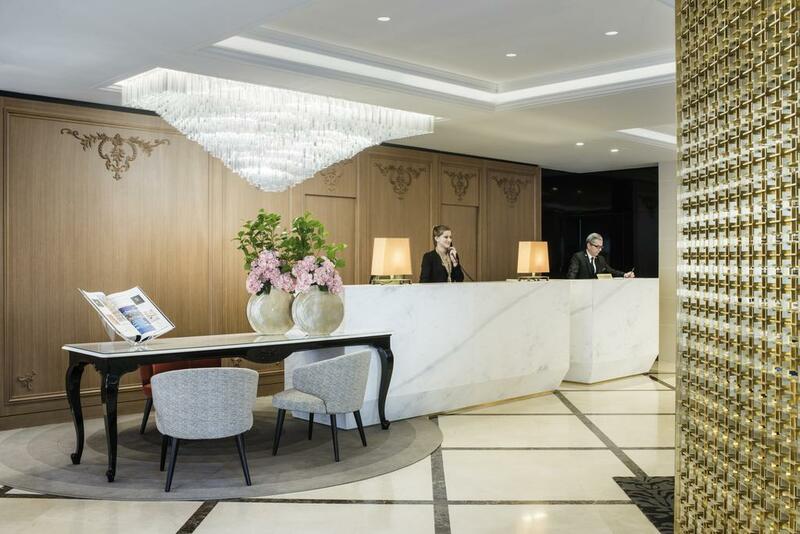 A shuttle service to Charles de Gaulle Airport is also available with an independent company 3 times a day. 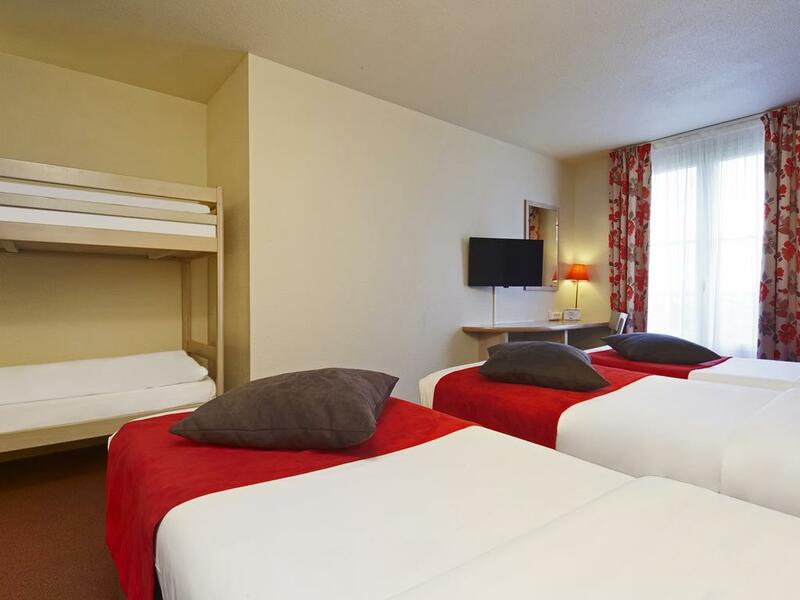 It is available with an extra cost and upon prior reservation. 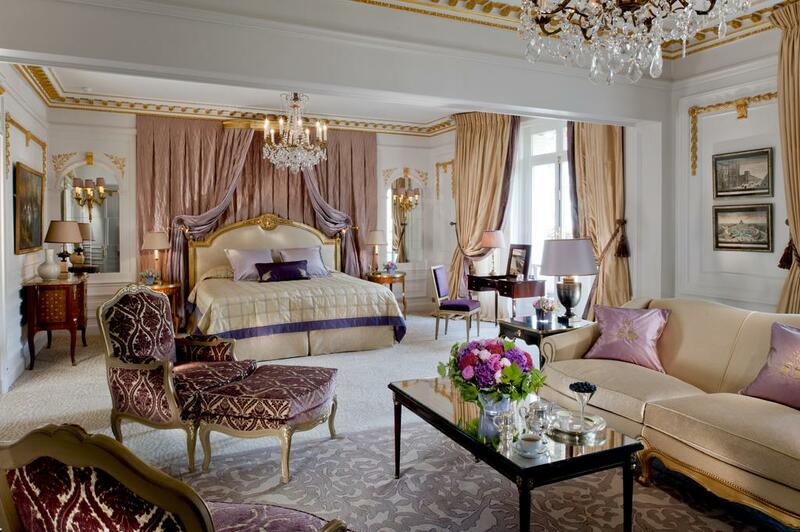 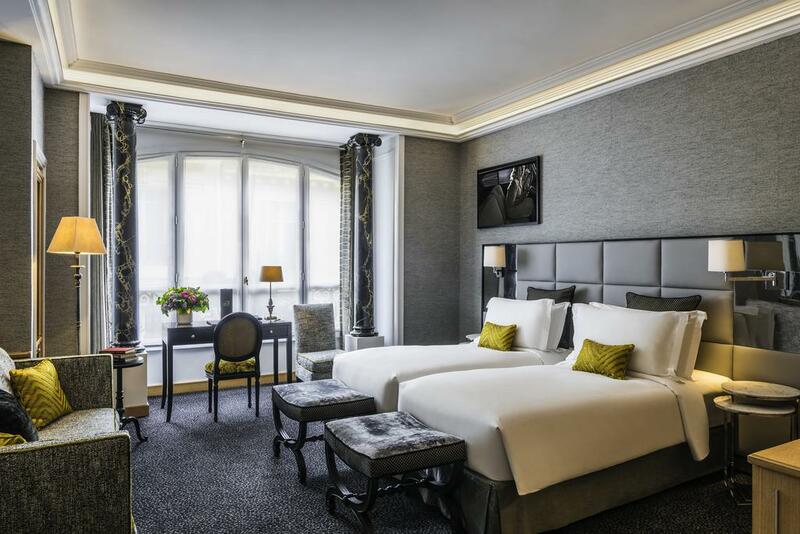 Located in Paris city center, Mandarin Oriental, Paris is a 1930s palace hotel located in a historic building from the 30s. 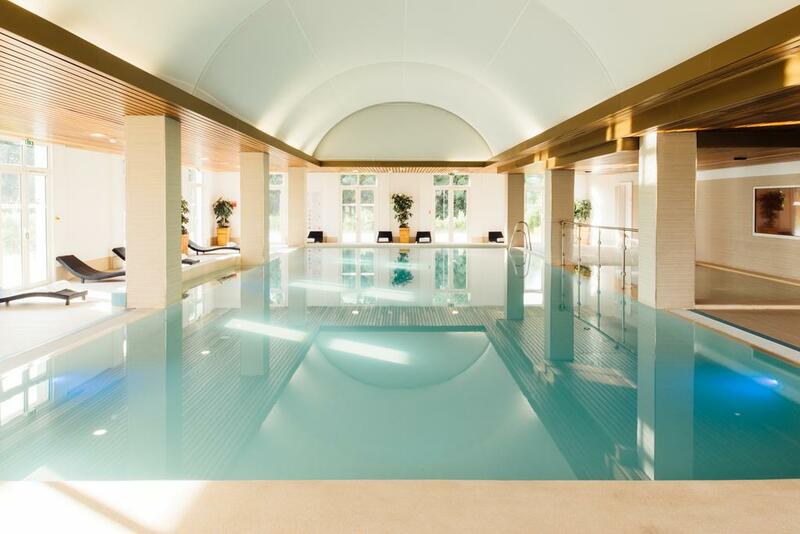 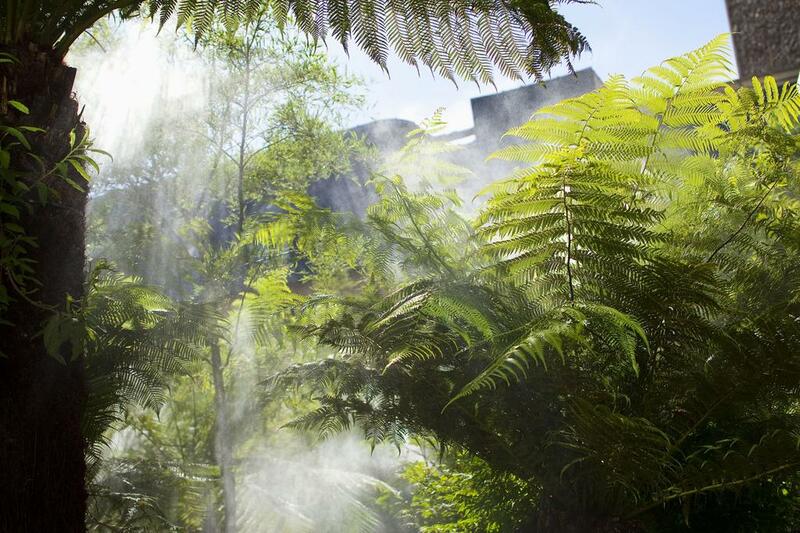 It offers an indoor landscaped garden, a 2953 ft² spa area and a gourmet restaurant awarded with 2 Michelin stars. 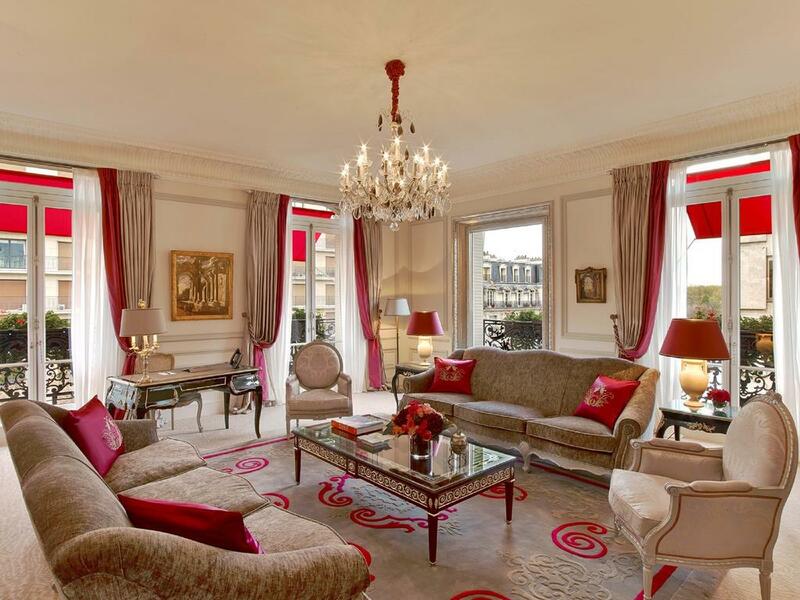 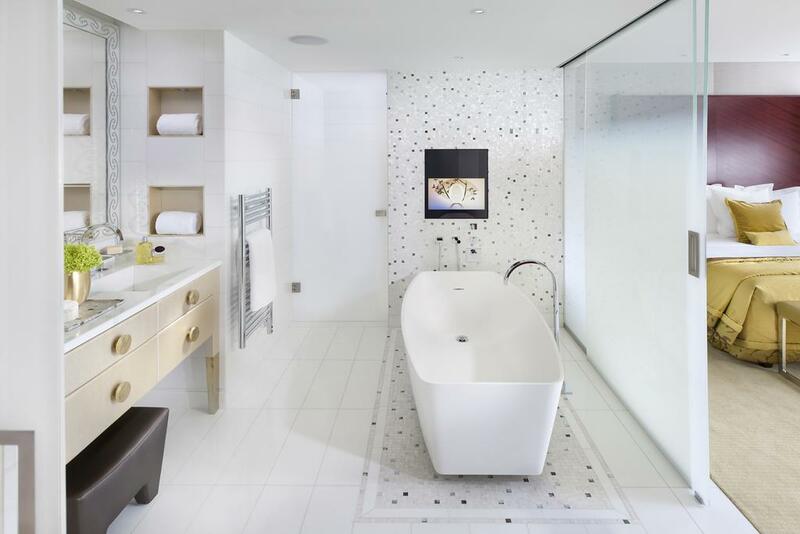 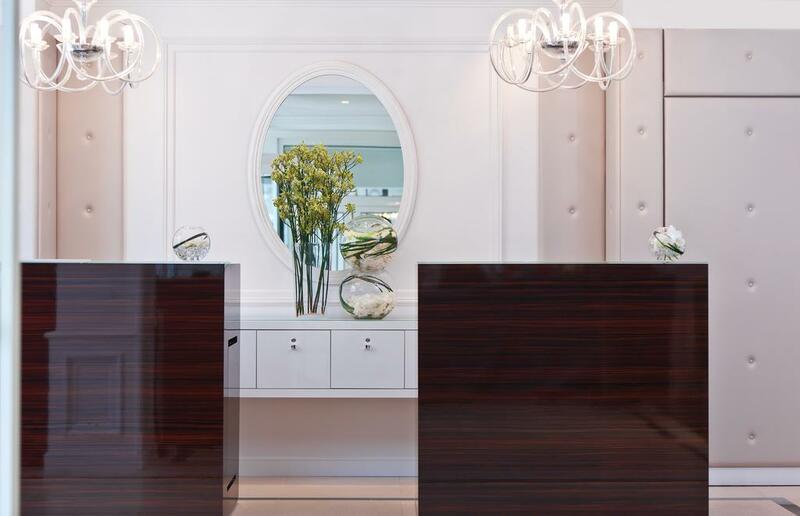 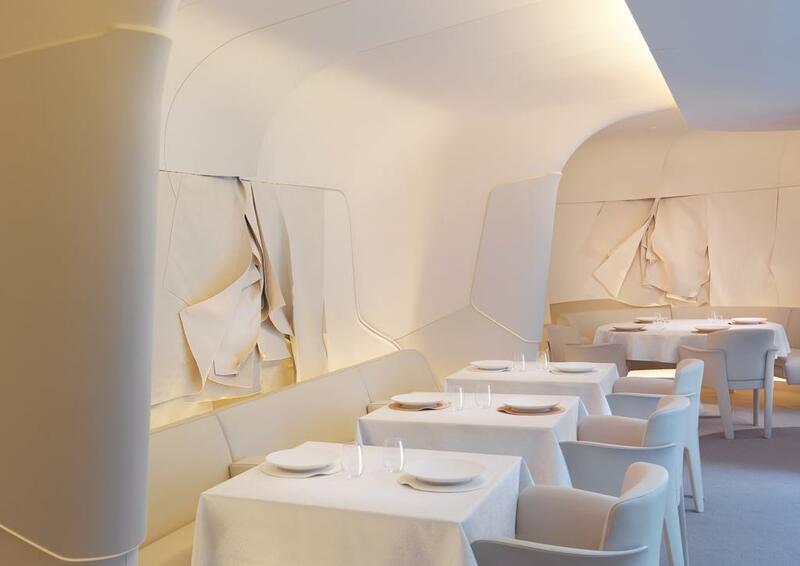 It features a minimalist décor inspired by haute couture and renowned fashion houses. 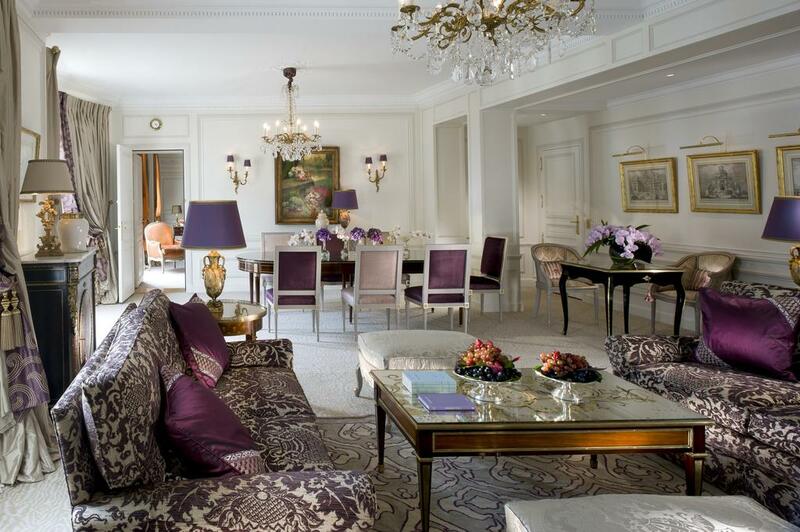 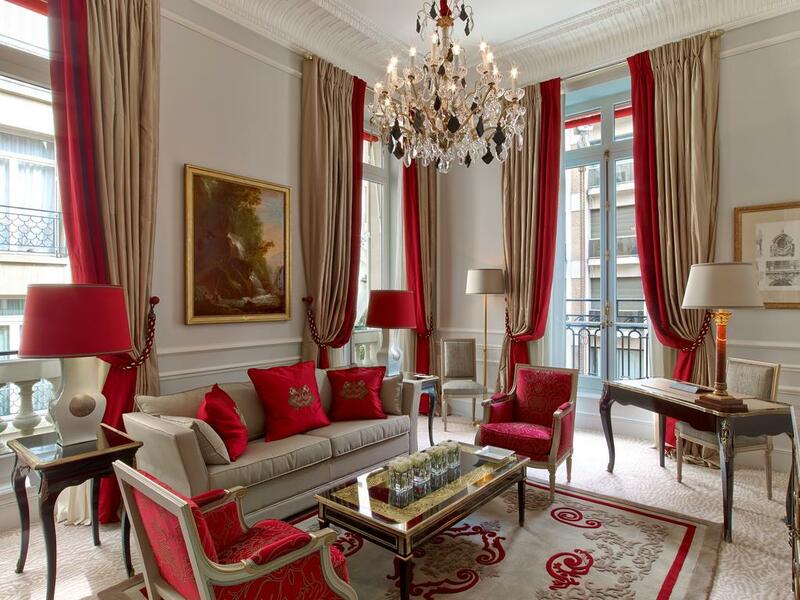 Parisian elegance joins Oriental refinement in the rooms and suites, which each have a unique décor. 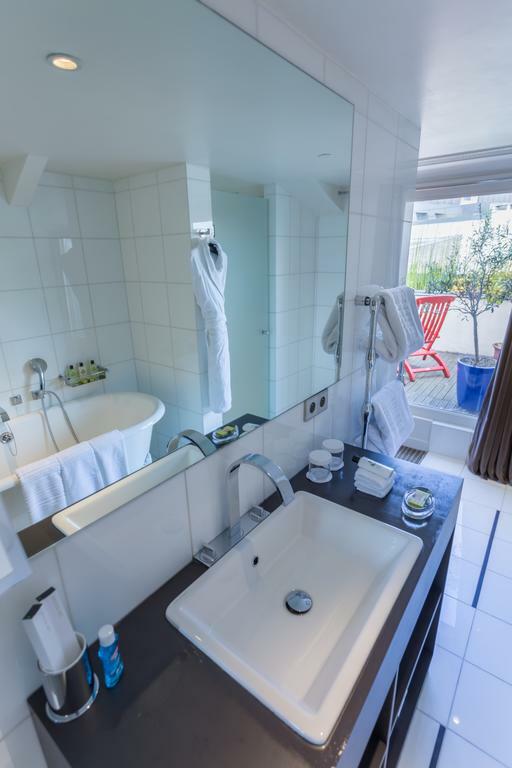 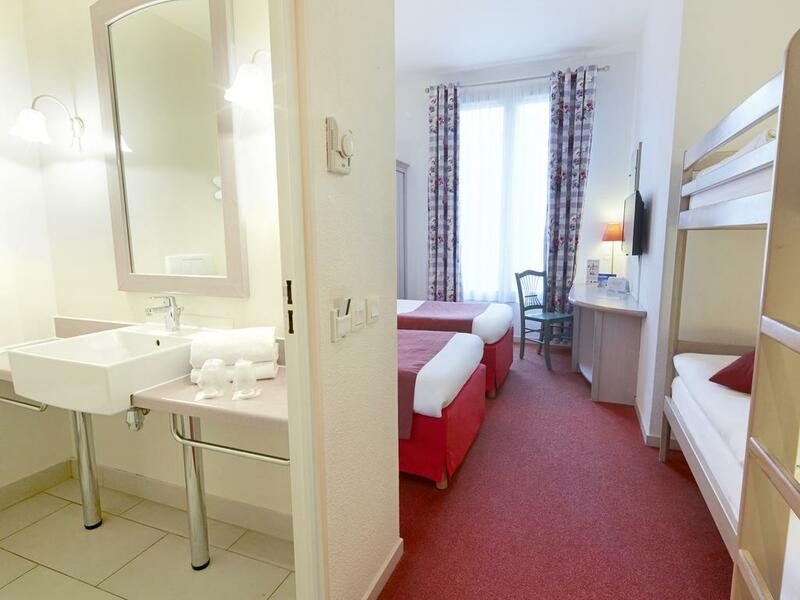 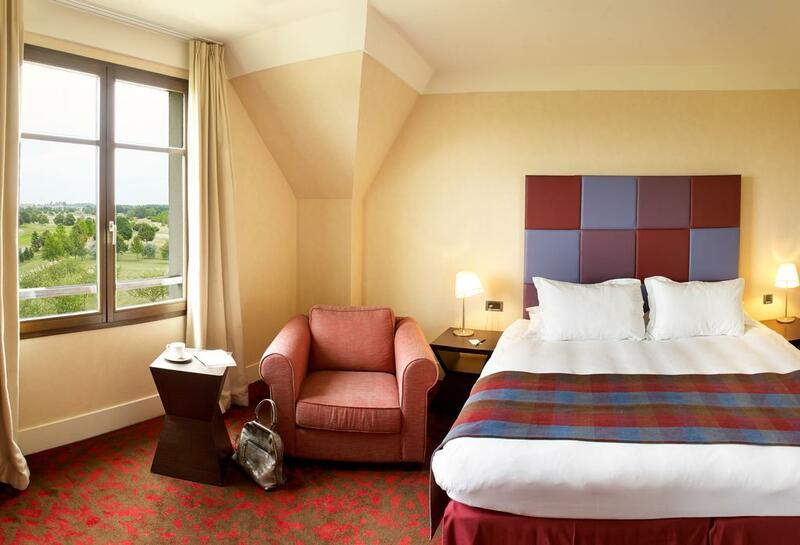 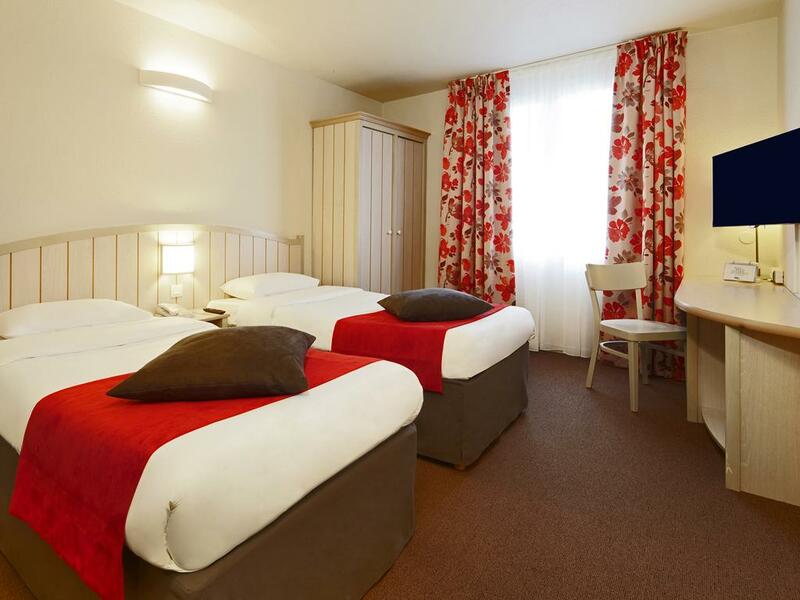 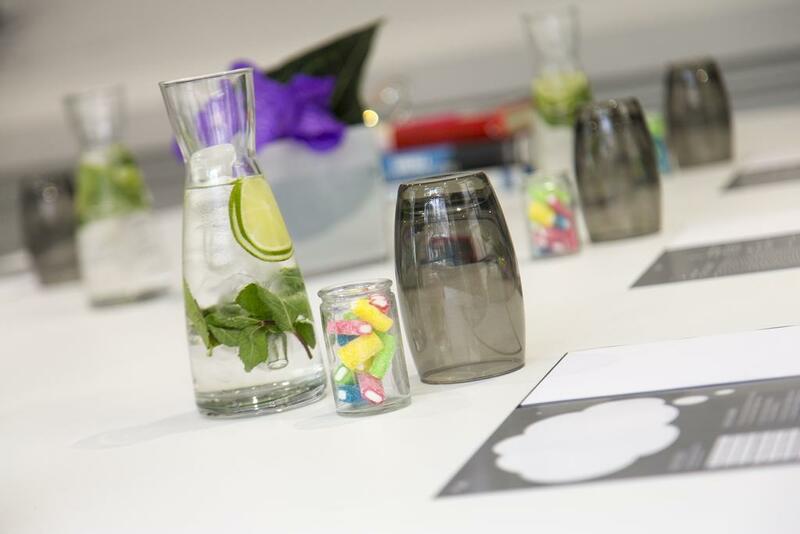 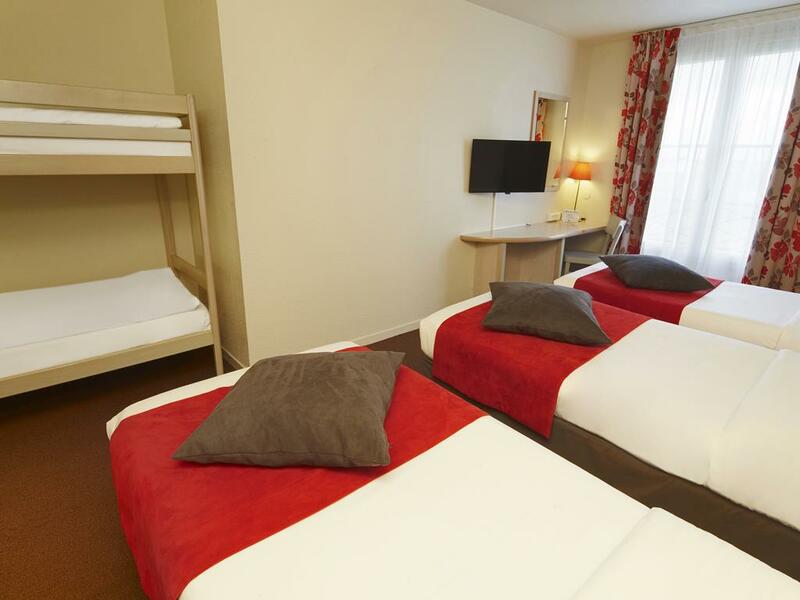 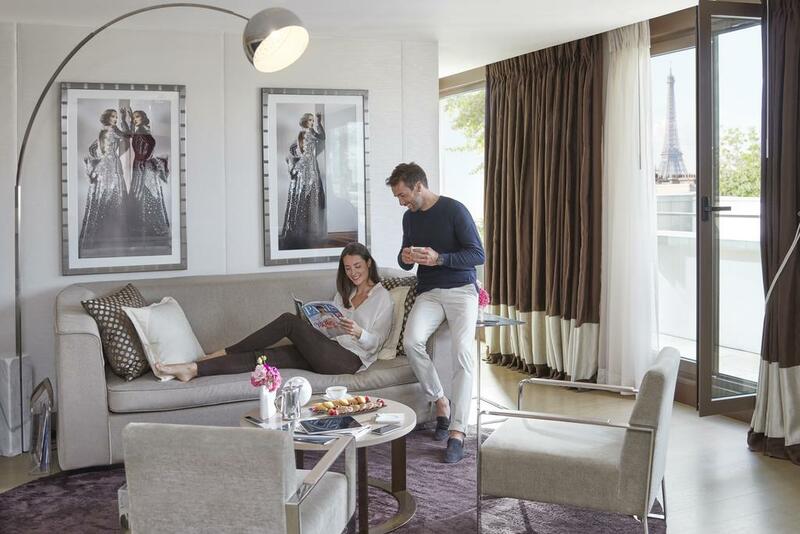 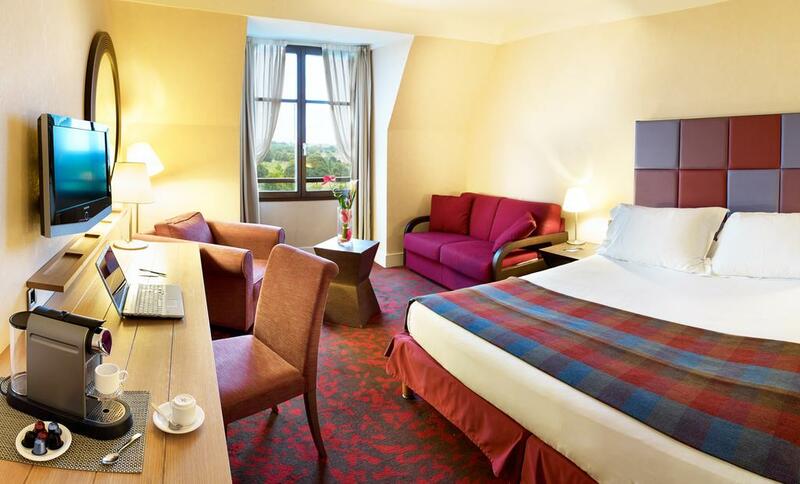 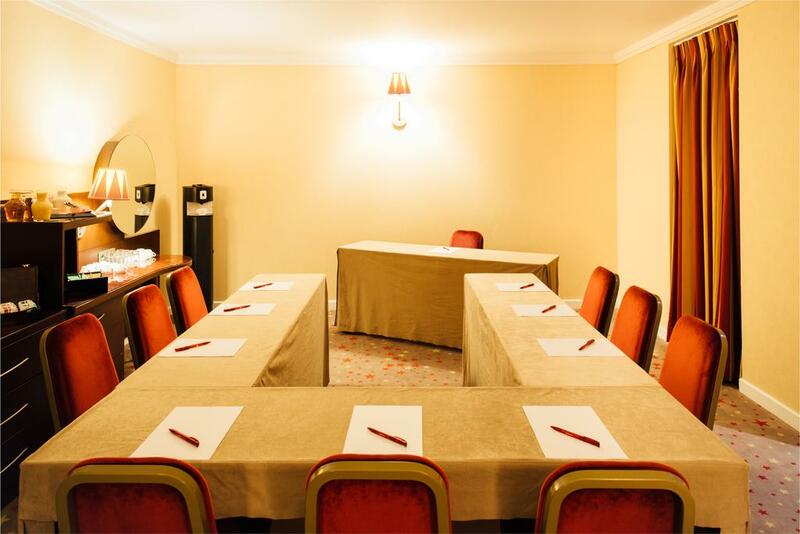 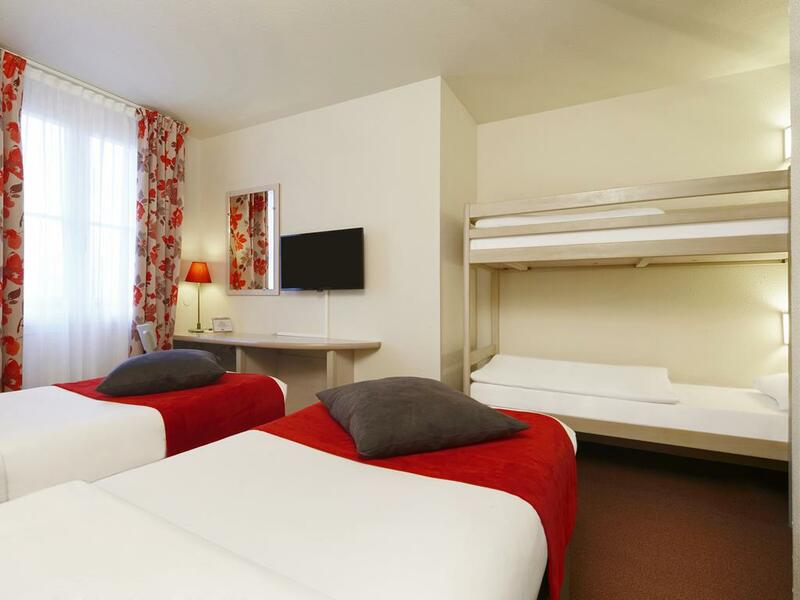 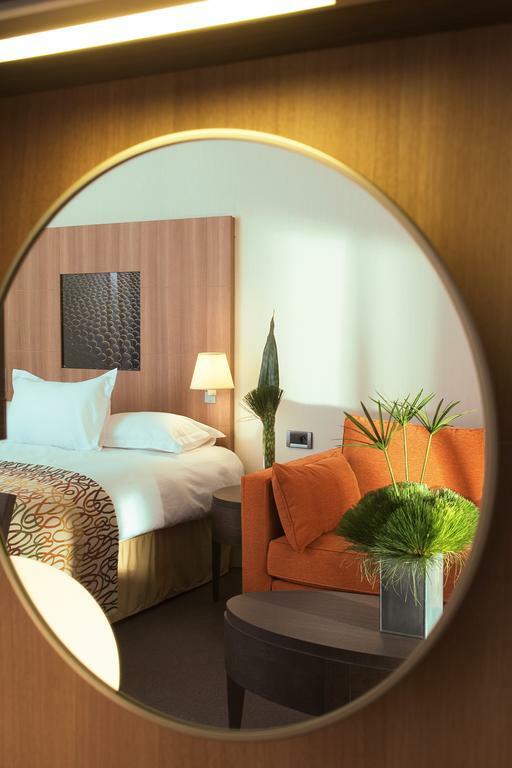 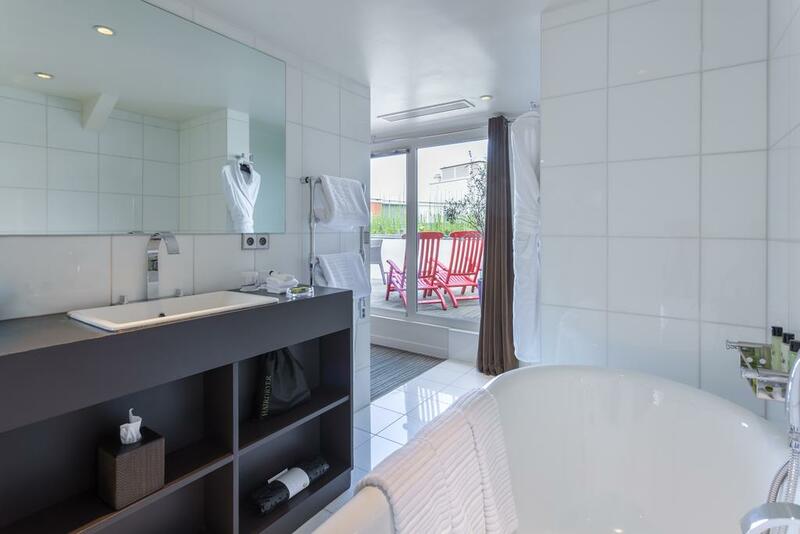 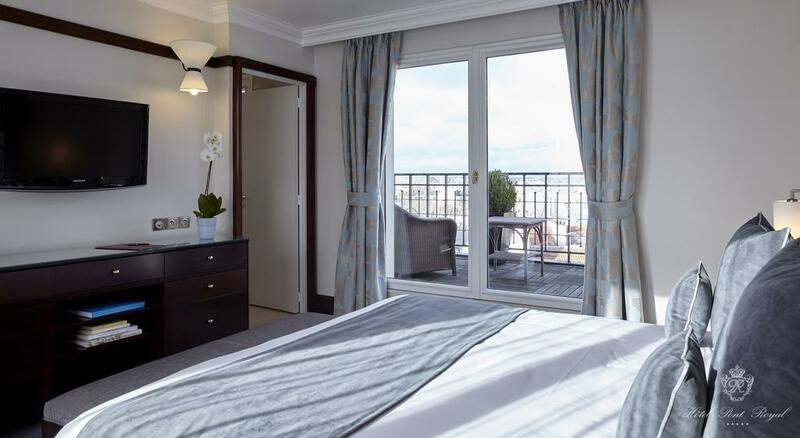 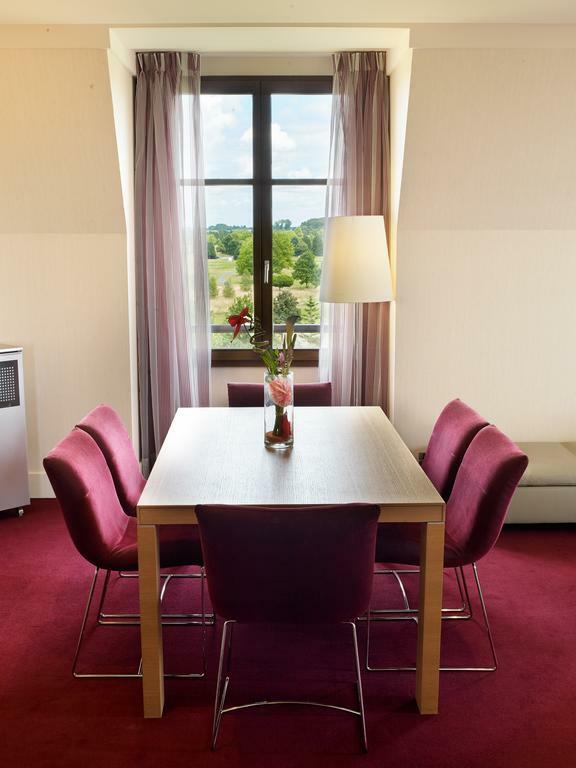 Tea and coffee making facilities, hair straighteners and a spacious bathroom feature in each accommodations and some of the suites also have a terrace and a panoramic view over Paris. 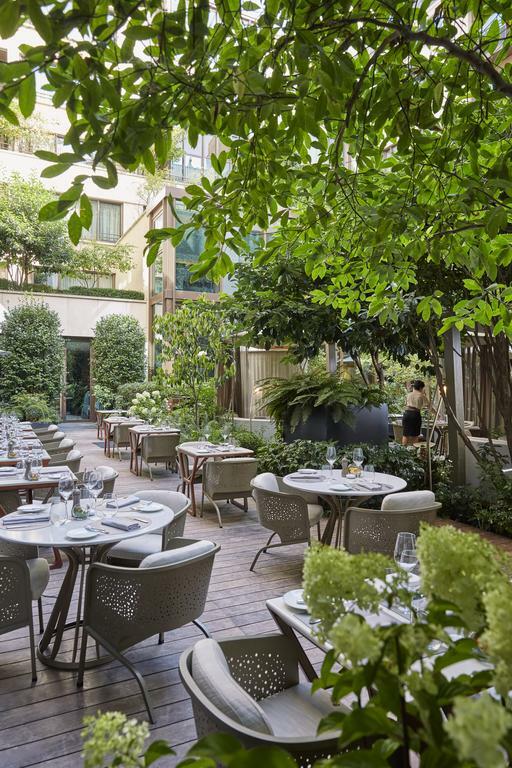 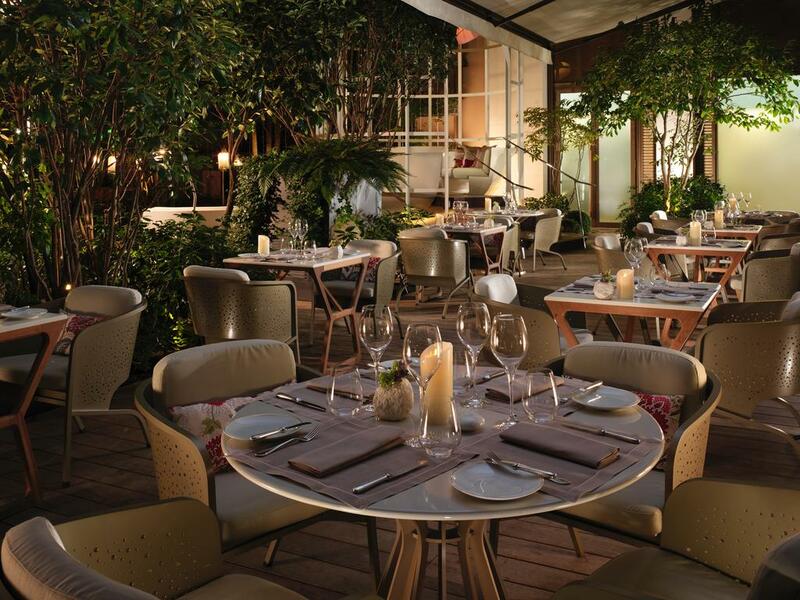 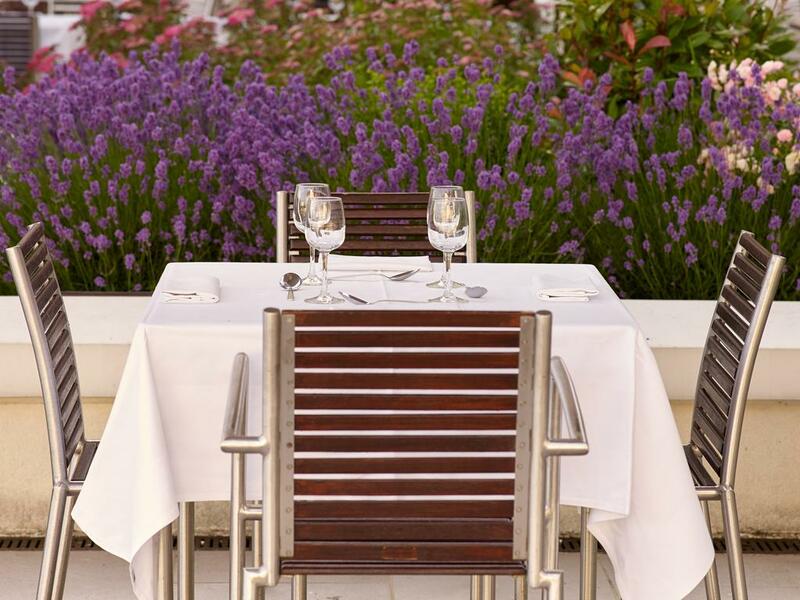 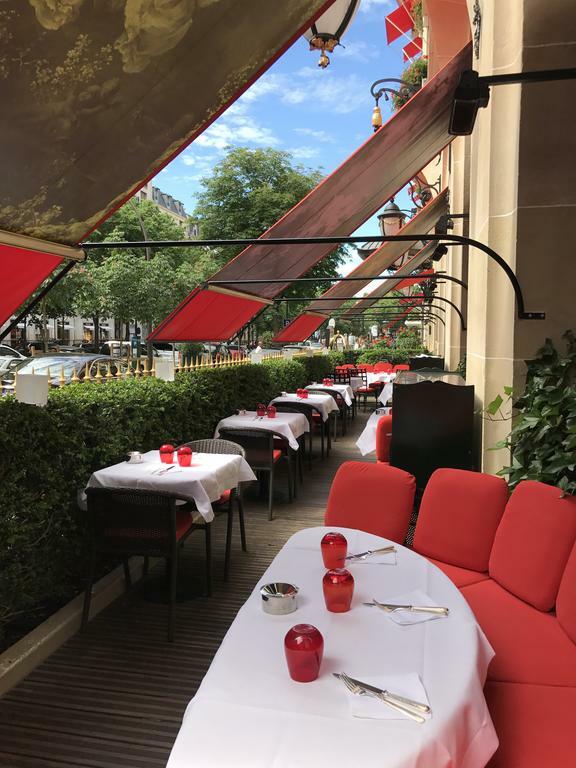 The hotel offers a bar with a terrace and 2 restaurants, firstly the Camélia, where you can sample simple dishes prepared with fresh produce all day long and secondly the Sur Mésure Restaurant by Thierry Marx serving 5 to 9-course gourmet meals in a design atmosphere. 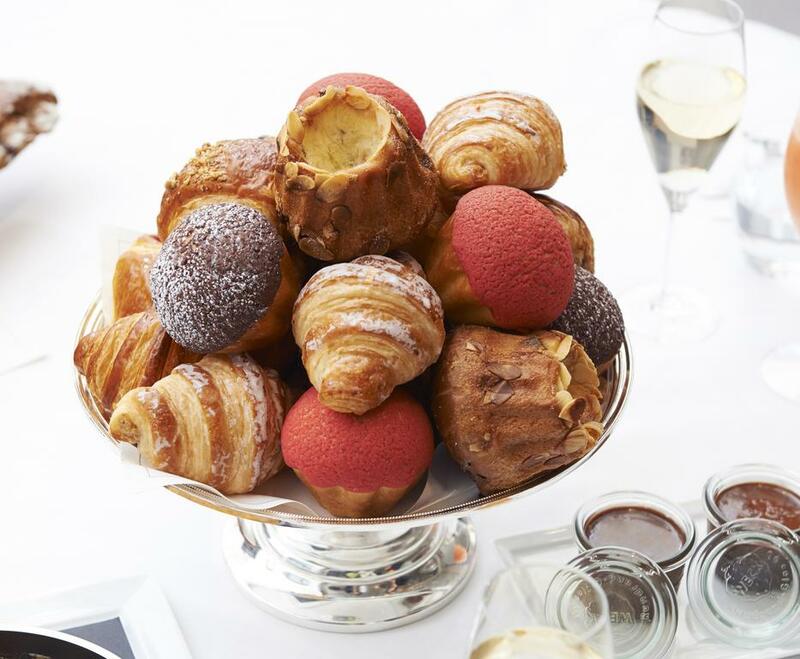 A counter selling patisserie cakes is available on site. 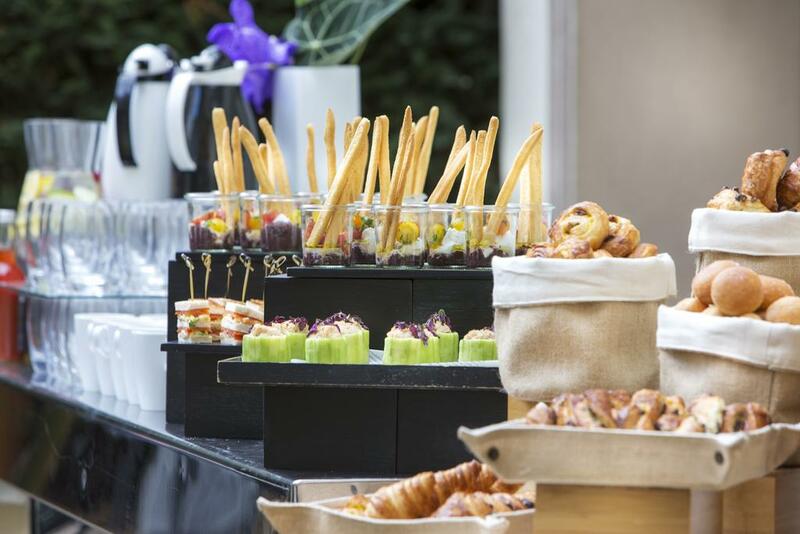 Several types of breakfast are available each morning including Chinese and Japanese options. 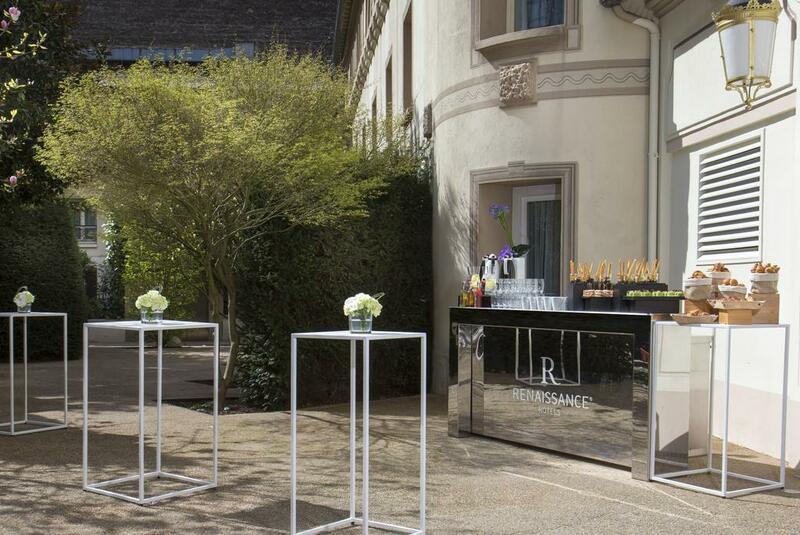 A welcome drink is also offered upon arrival. 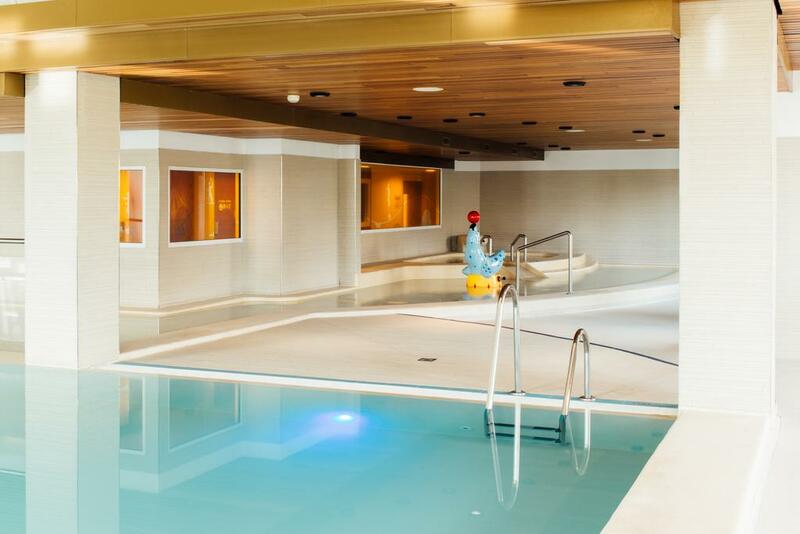 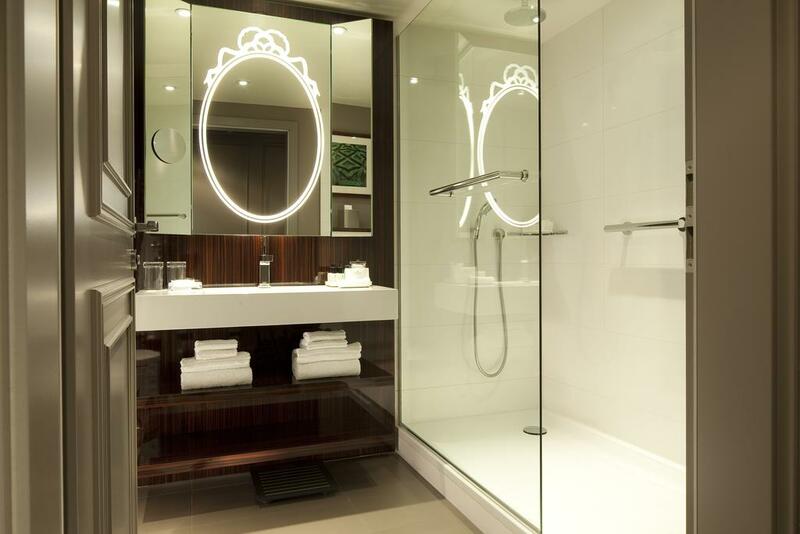 Set on 2 levels, the spa and wellness center is complete with an indoor pool, a steam room and spa suites with private steam shower and changing room. 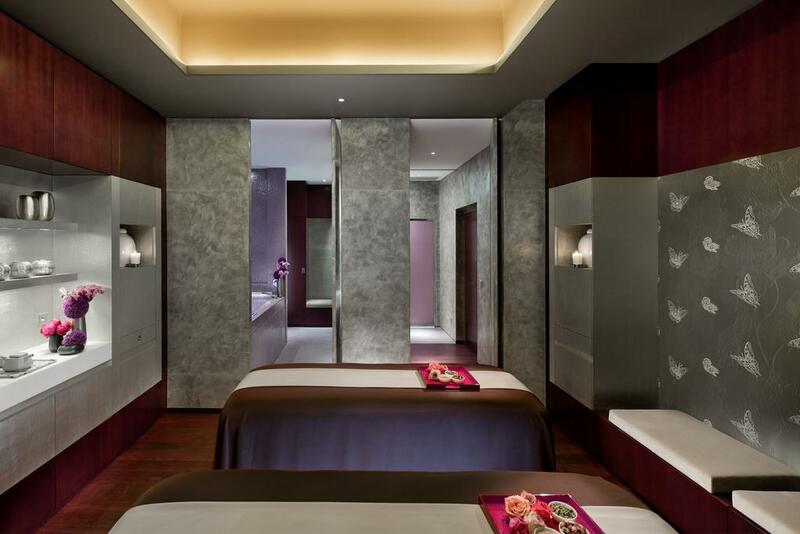 In this peaceful setting, a wide range of Mandarin Oriental Signature Guerlain® facial and body treatments can also be enjoyed. 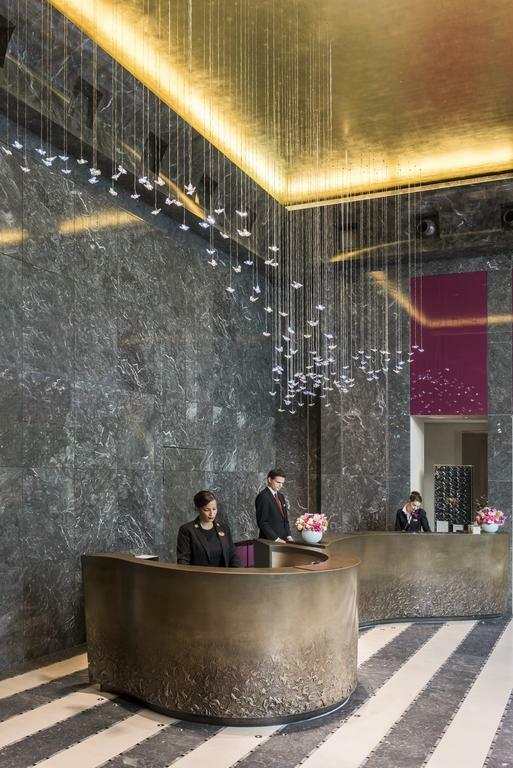 Other facilities include a fitness center, valet and concierge service, as well as meeting and banquet facilities with dedicated staff. 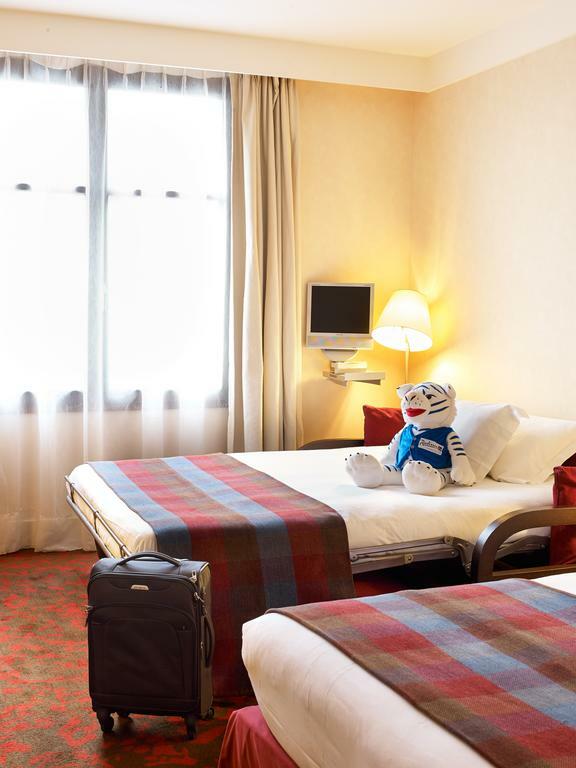 Additional items such as a laptop, PlayStation 3®, children’s high chair and DVD player can be provided upon request. 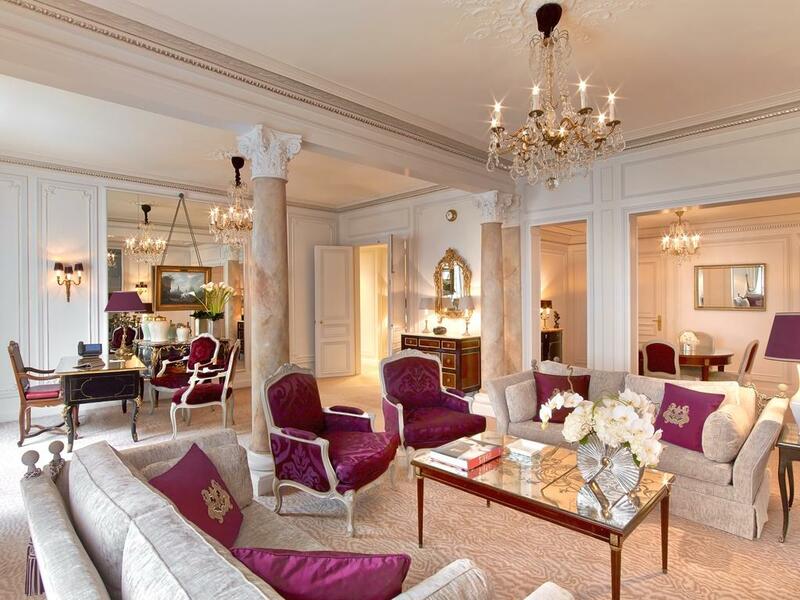 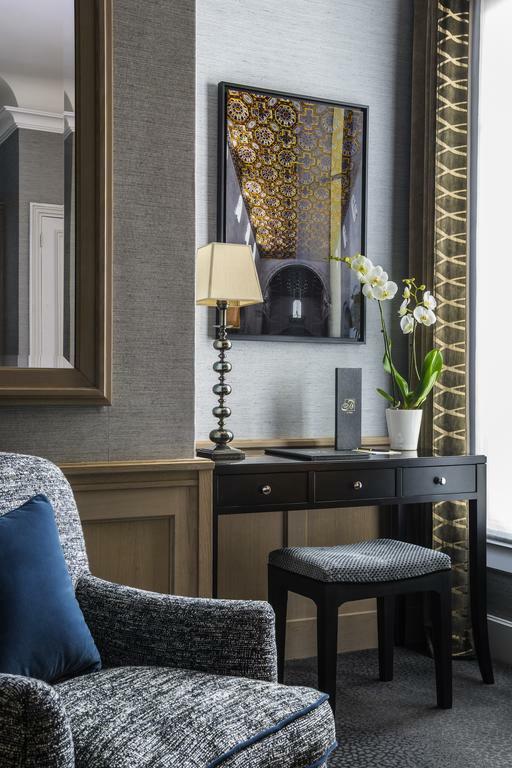 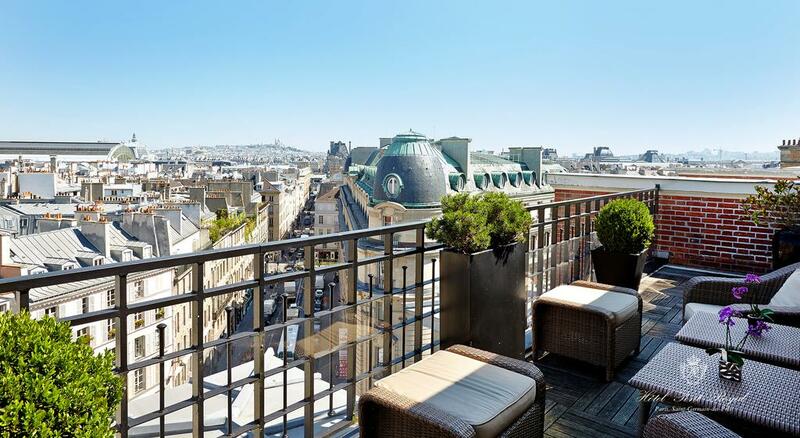 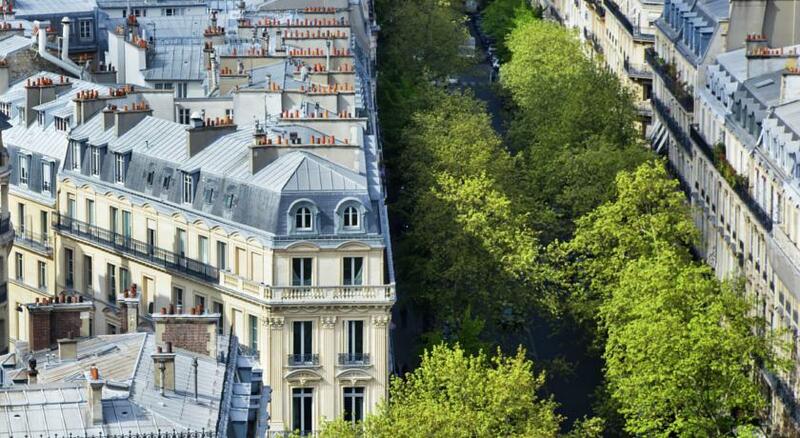 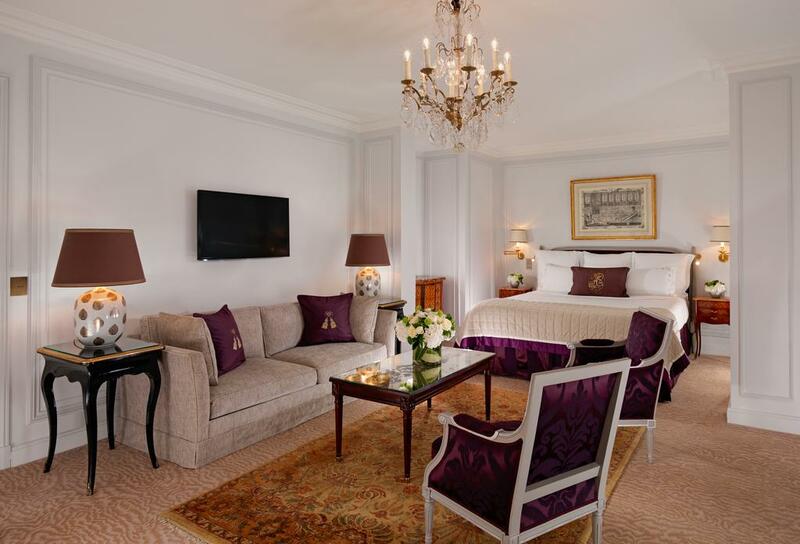 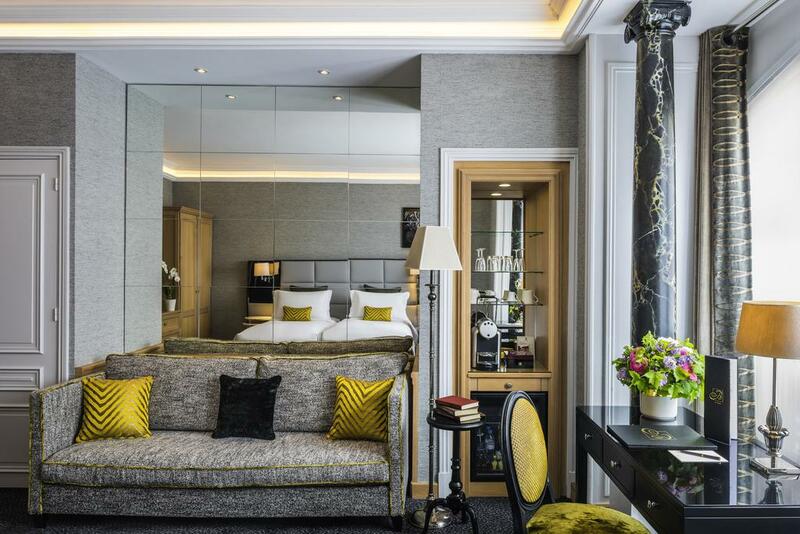 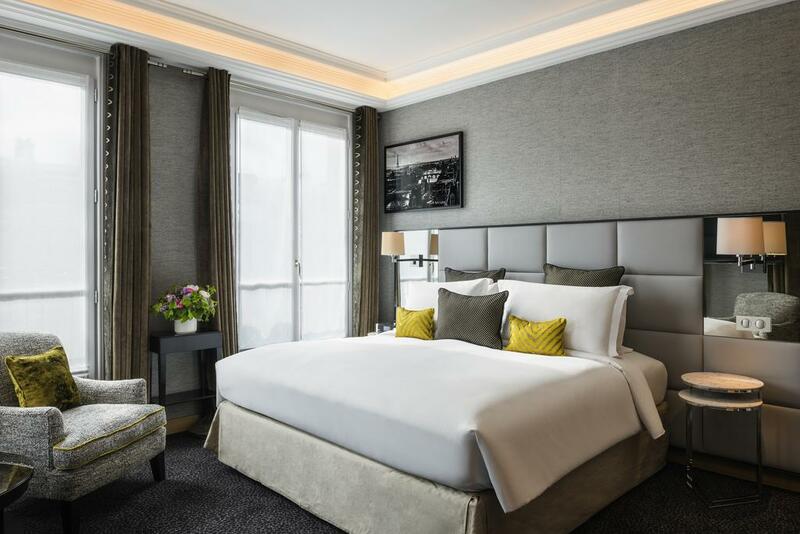 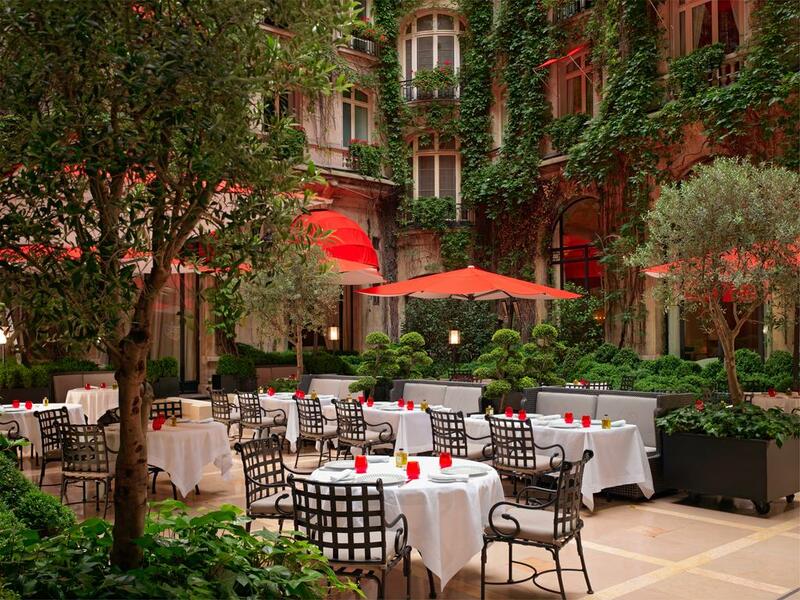 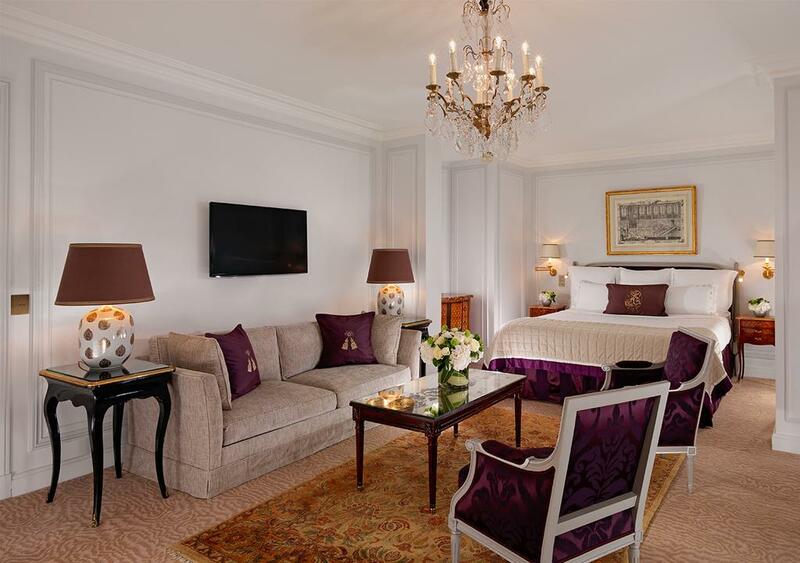 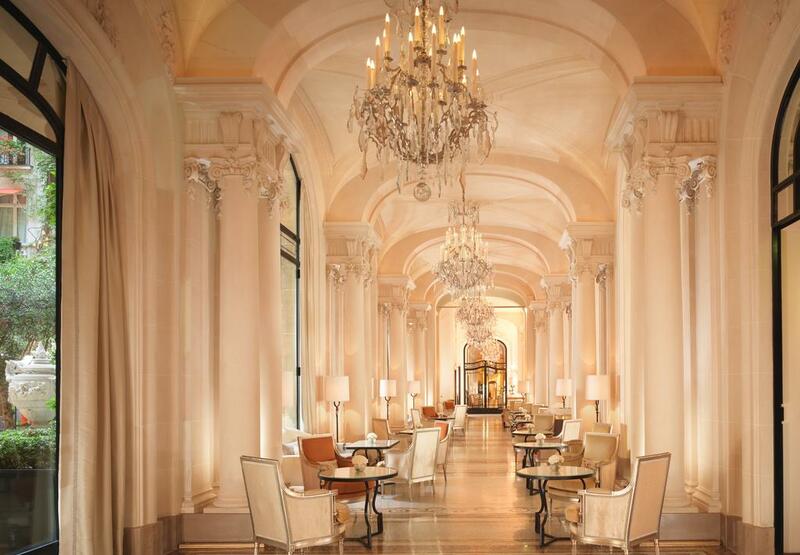 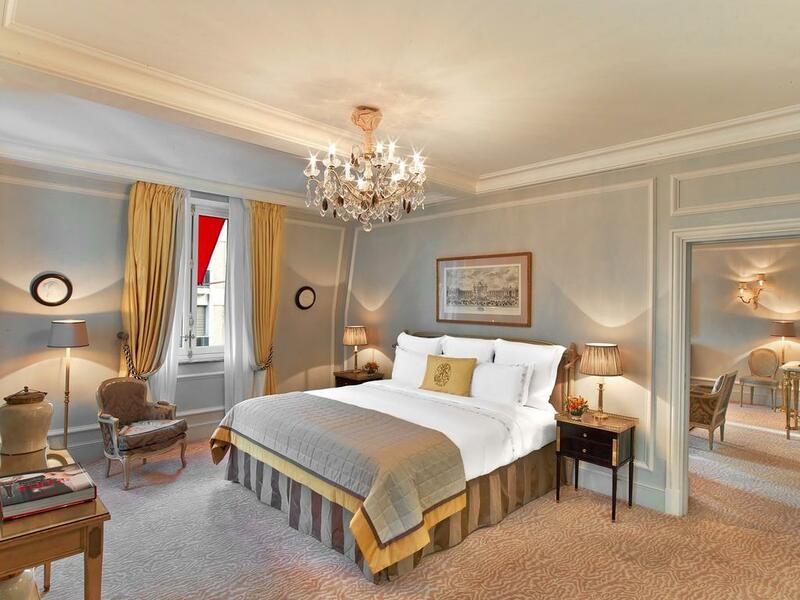 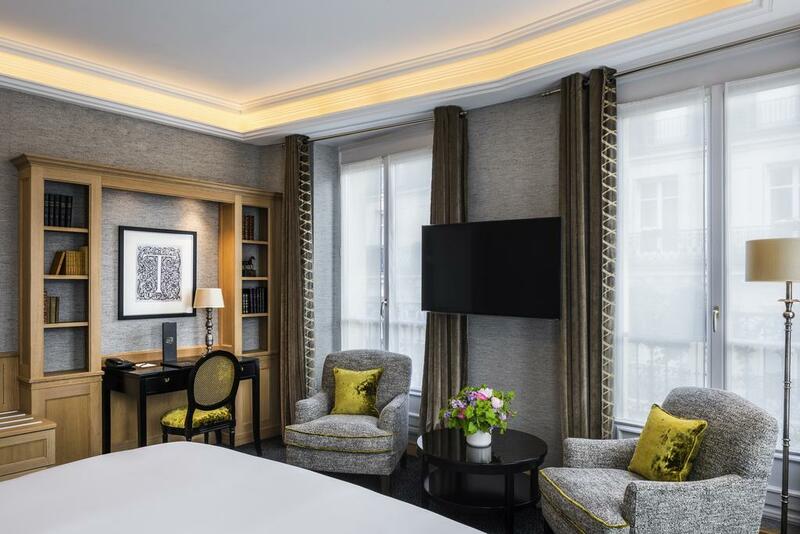 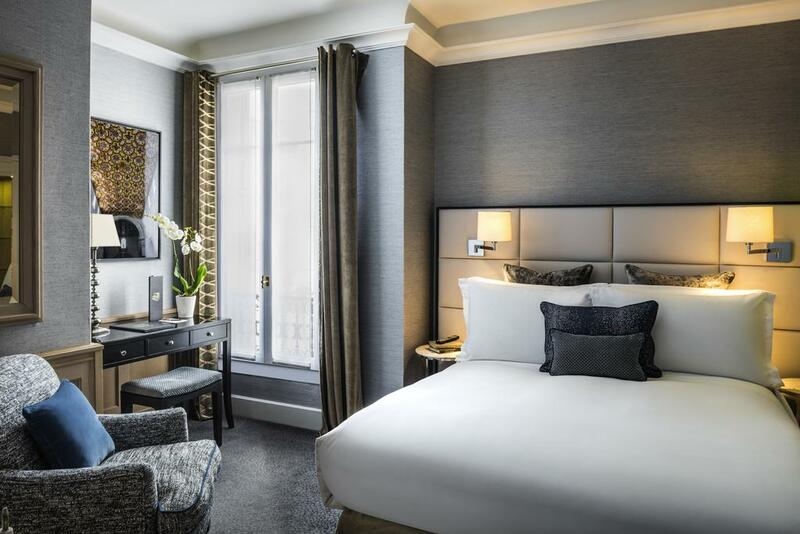 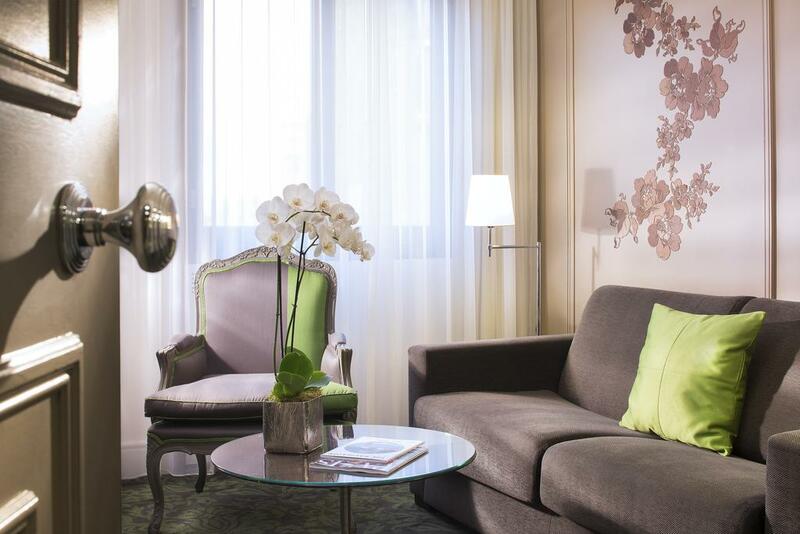 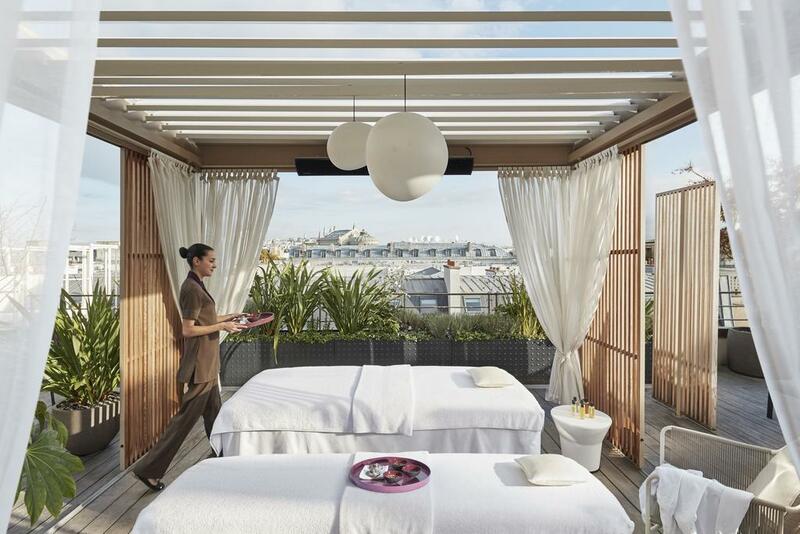 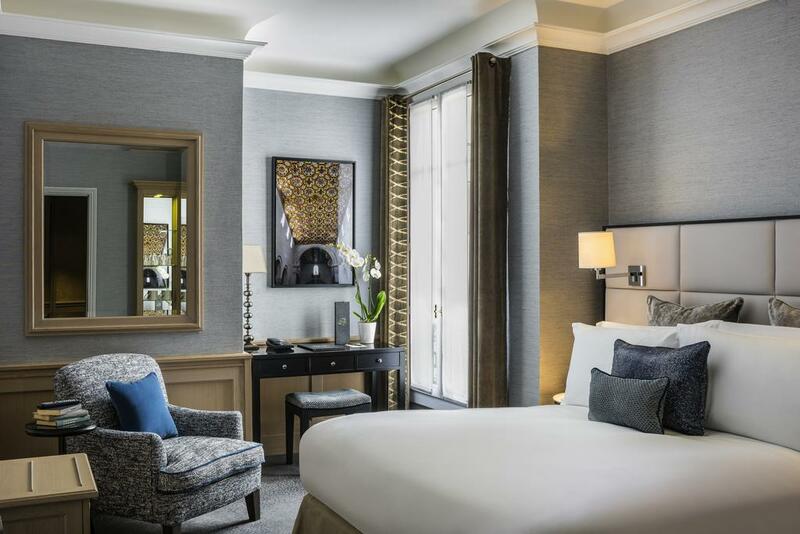 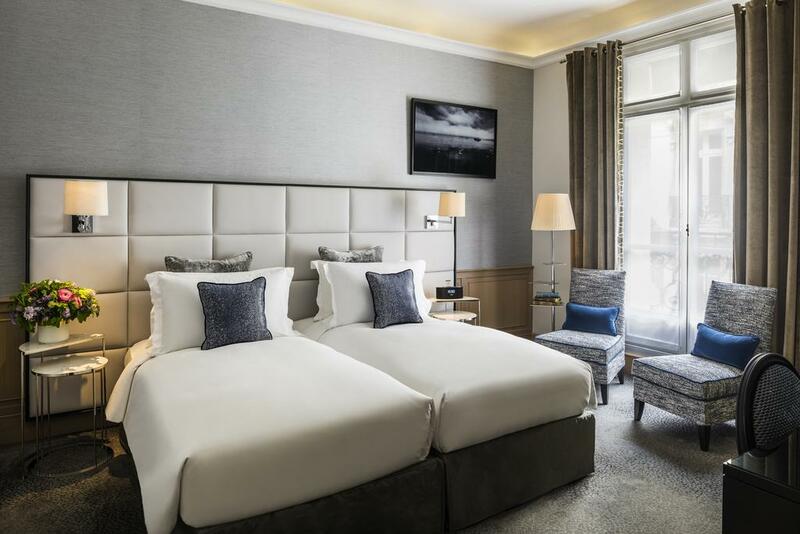 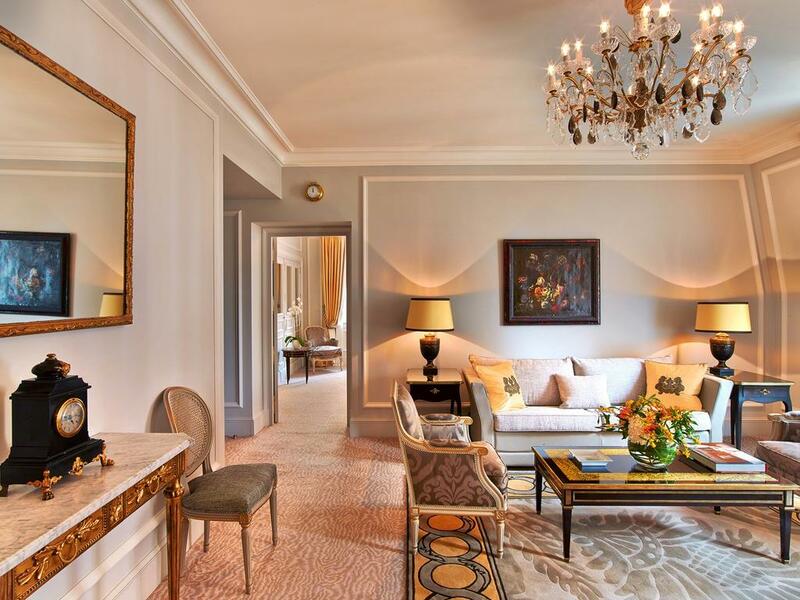 Mandarin Oriental, Paris is ideally located 150 m from the elegant Place Vendome, 250 m from the Tuileries Garden and just a 10-minute walk from the famous Champs Elysées. 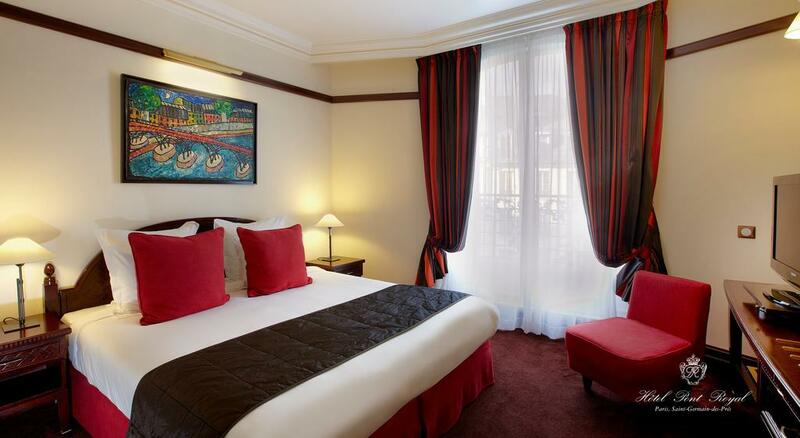 This is our guests’ favorite part of Paris, according to independent reviews. 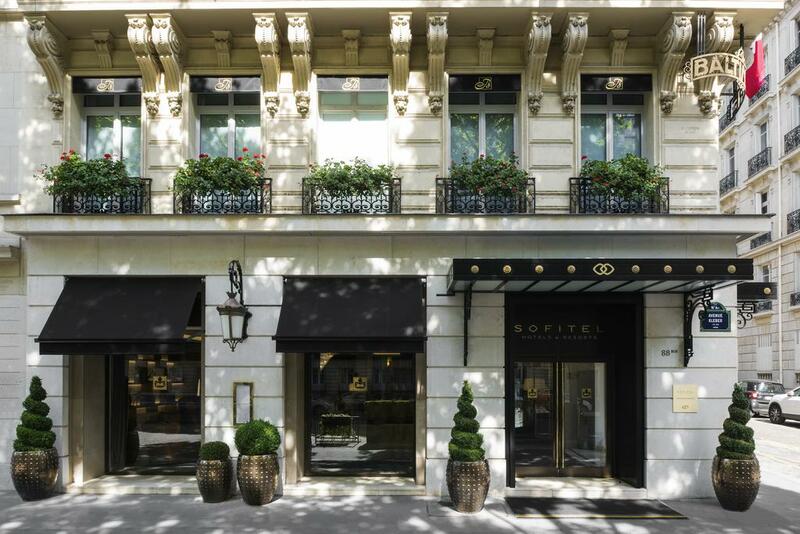 In this area you can shop ’til you drop for popular brands like Rolex, Cartier, Chanel, Louis Vuitton, Gucci. 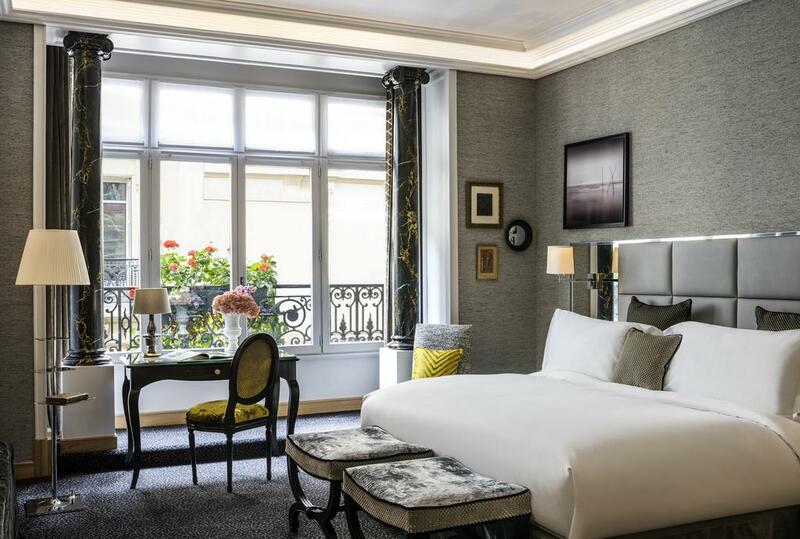 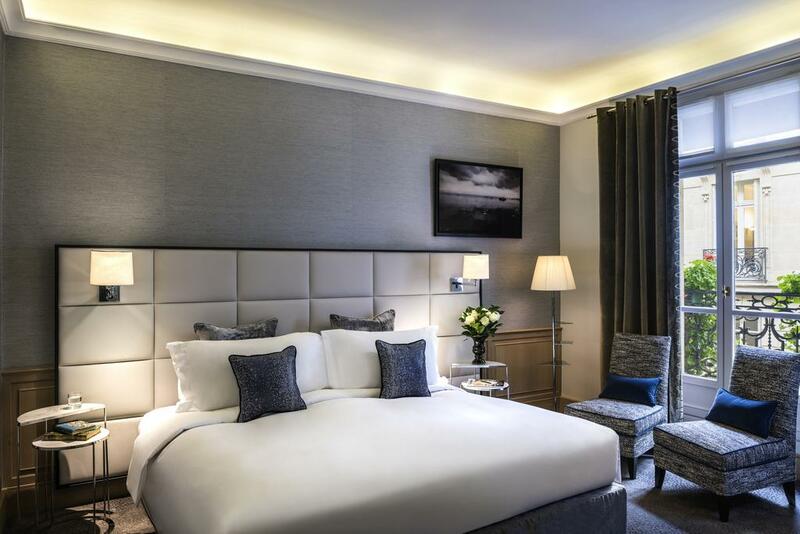 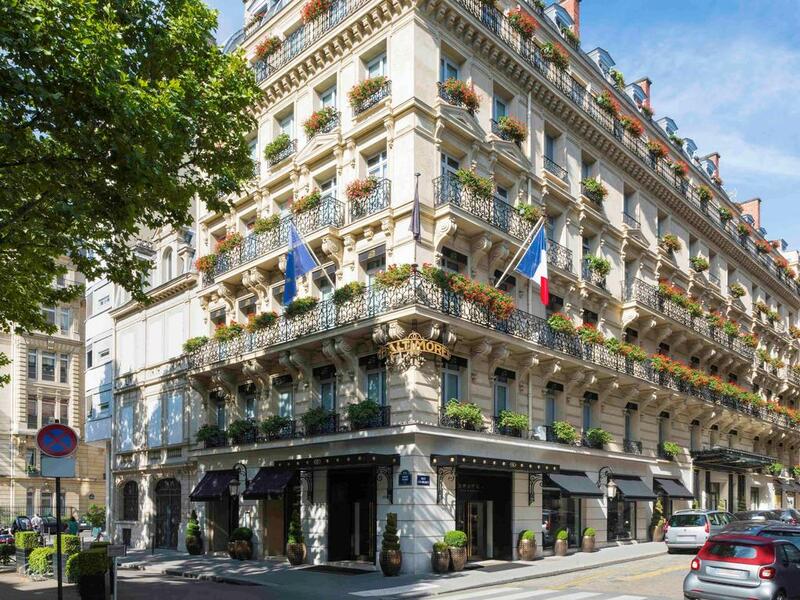 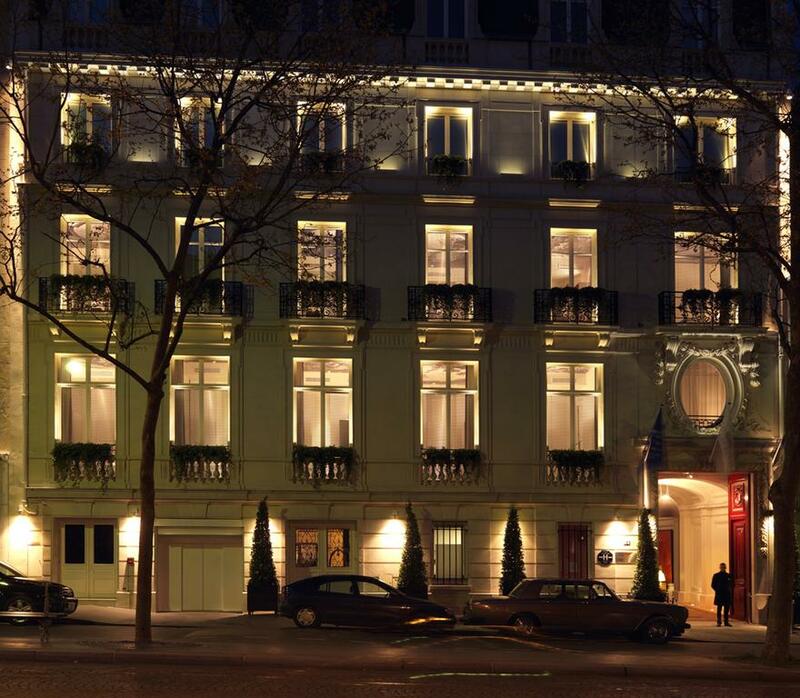 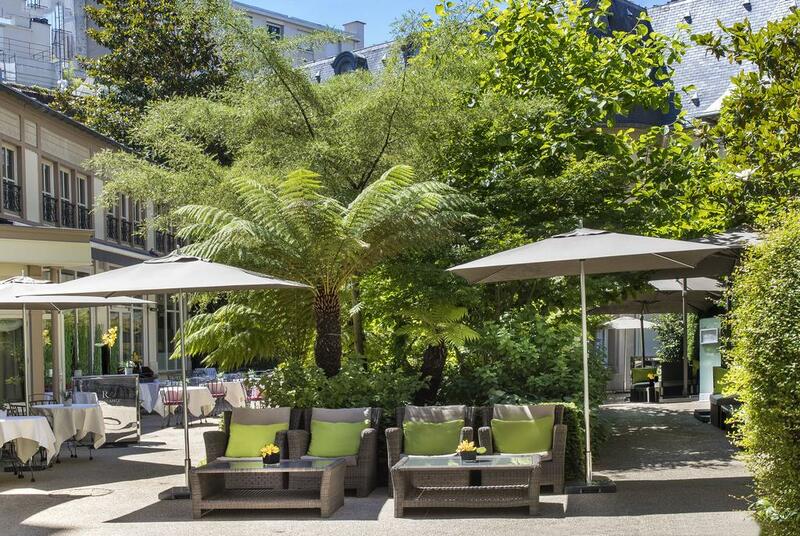 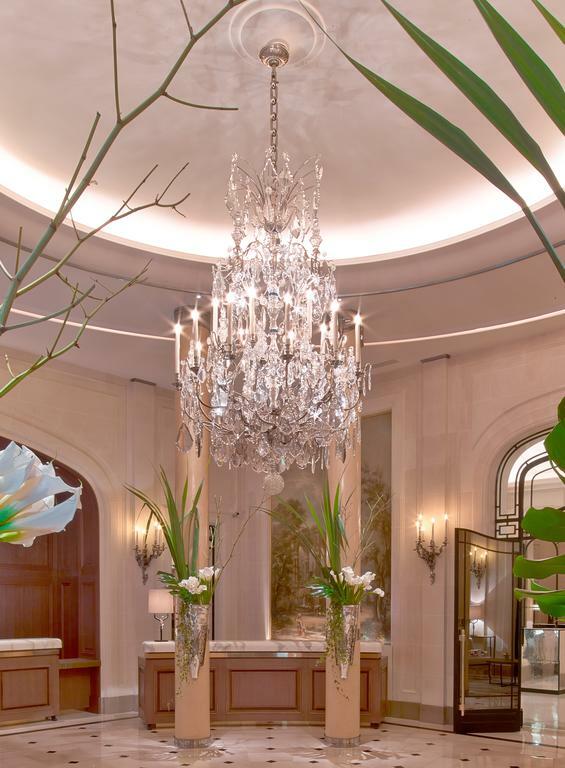 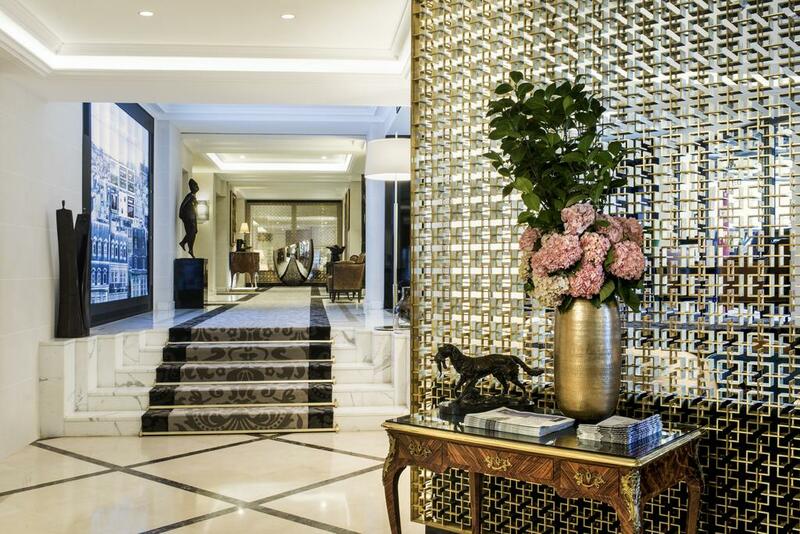 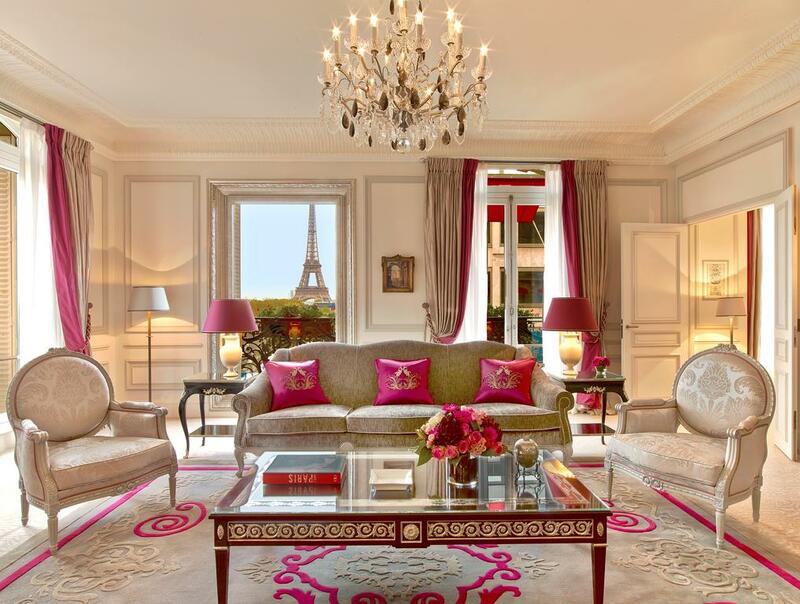 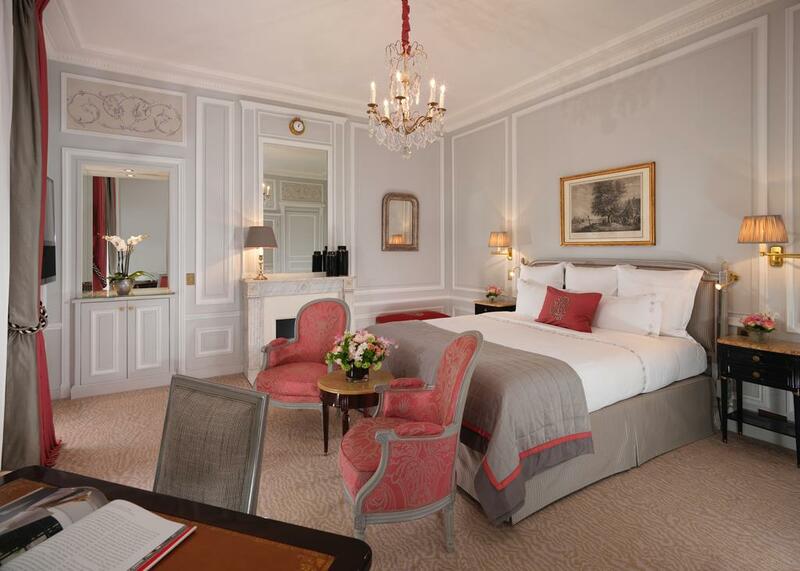 On the prestigious Avenue Montaigne, with views of the Eiffel Tower, this luxury 5-star hotel features a Dior Institute spa, 5 restaurants, a cocktail bar and a seasonal ice-skating rink. 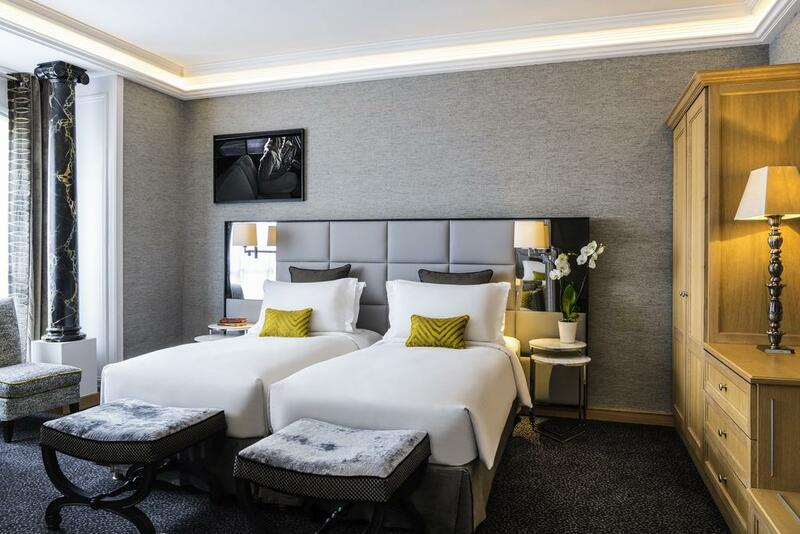 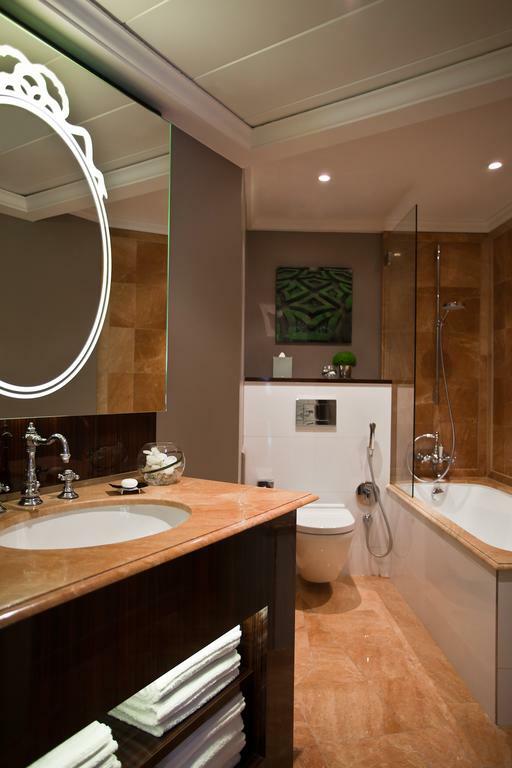 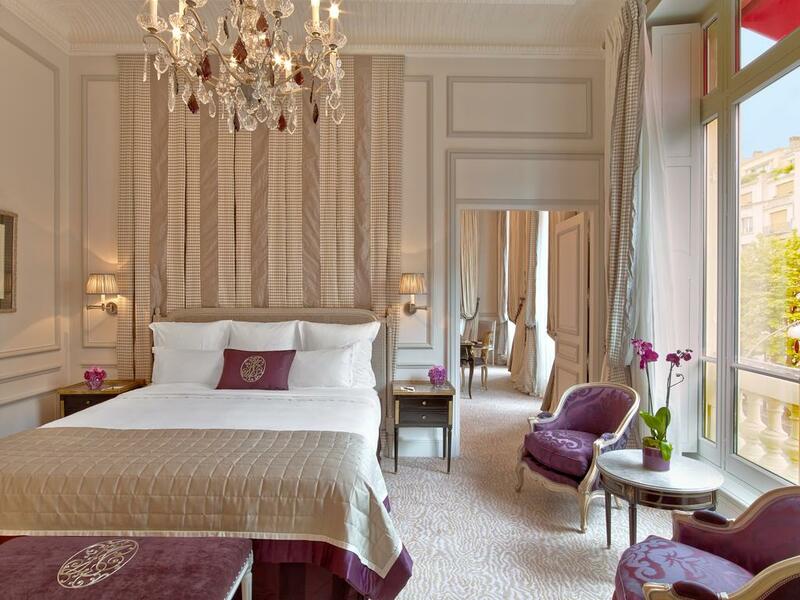 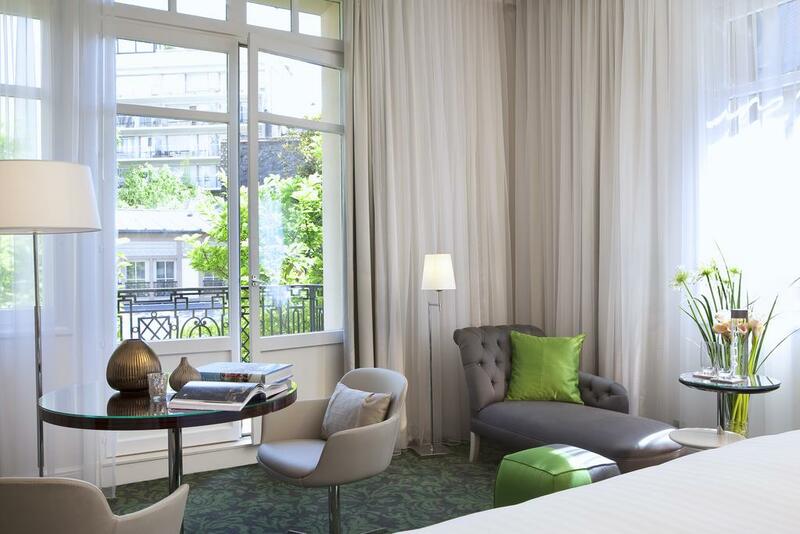 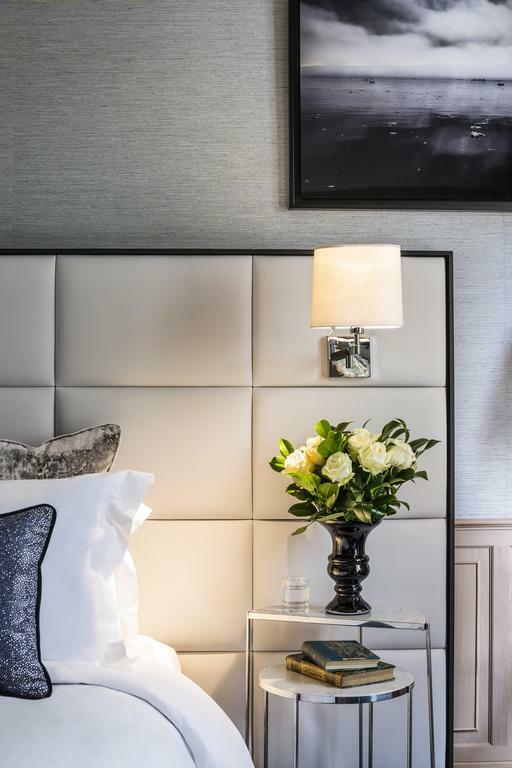 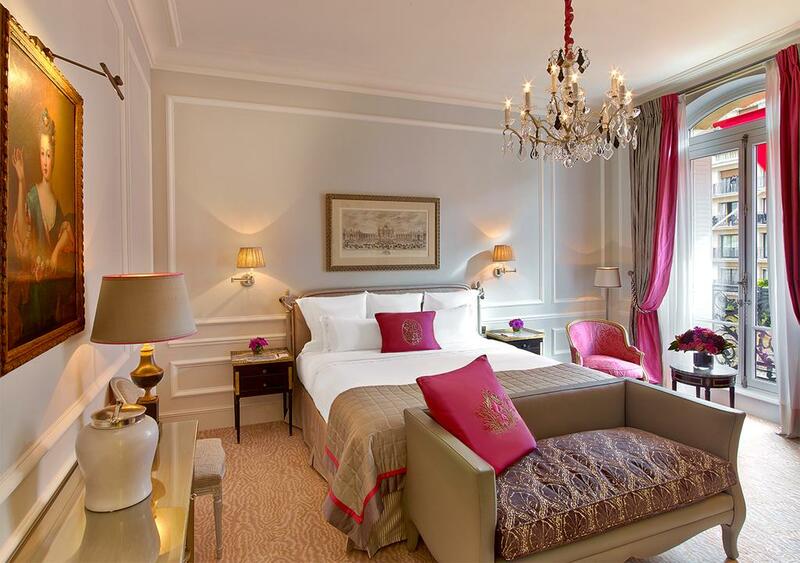 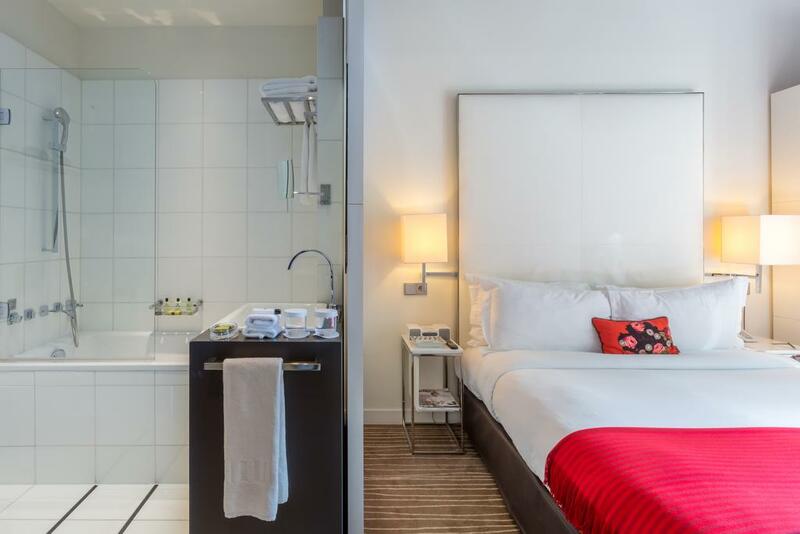 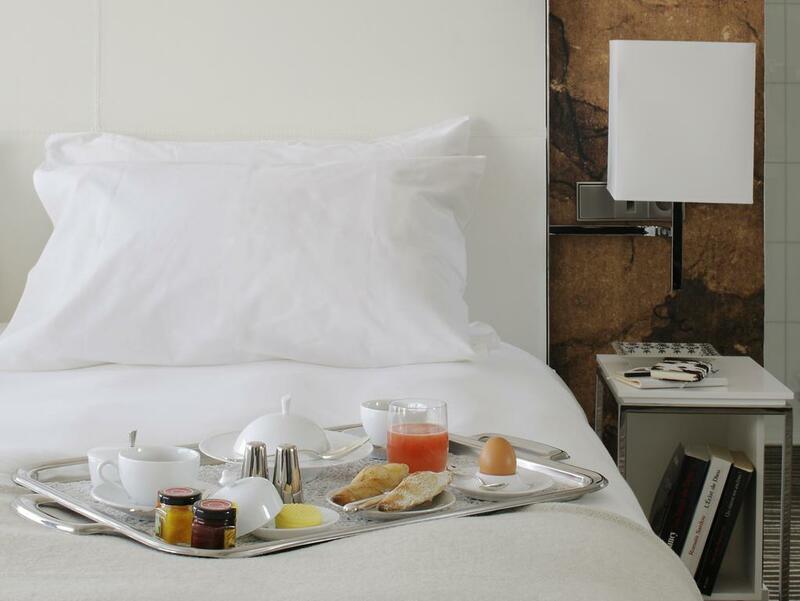 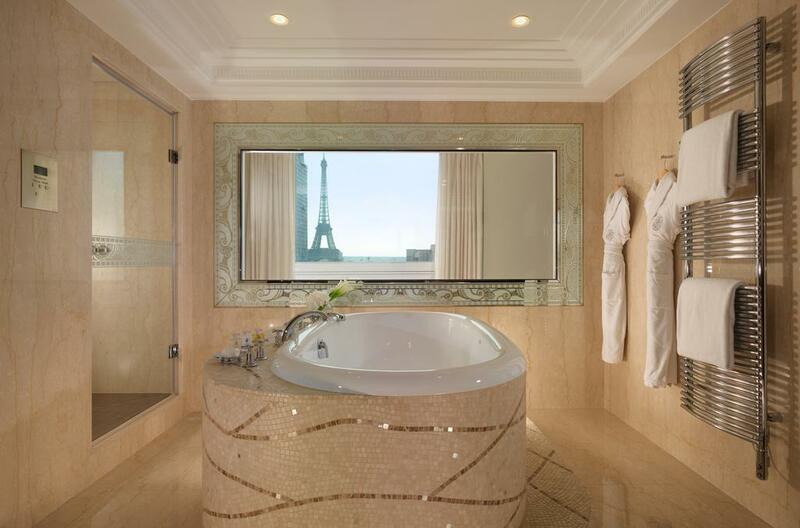 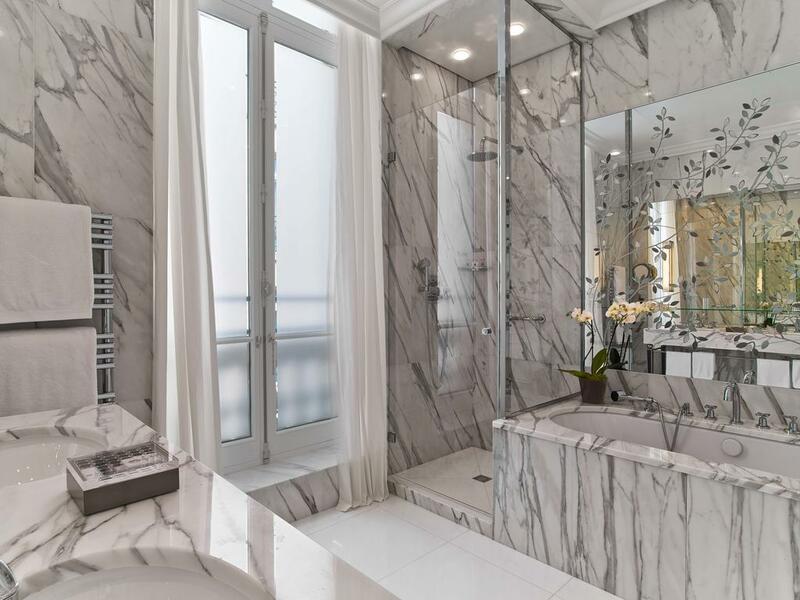 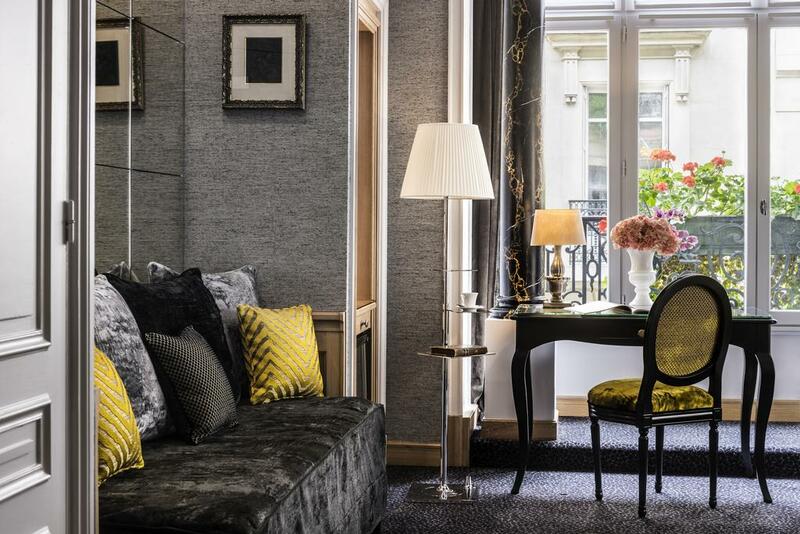 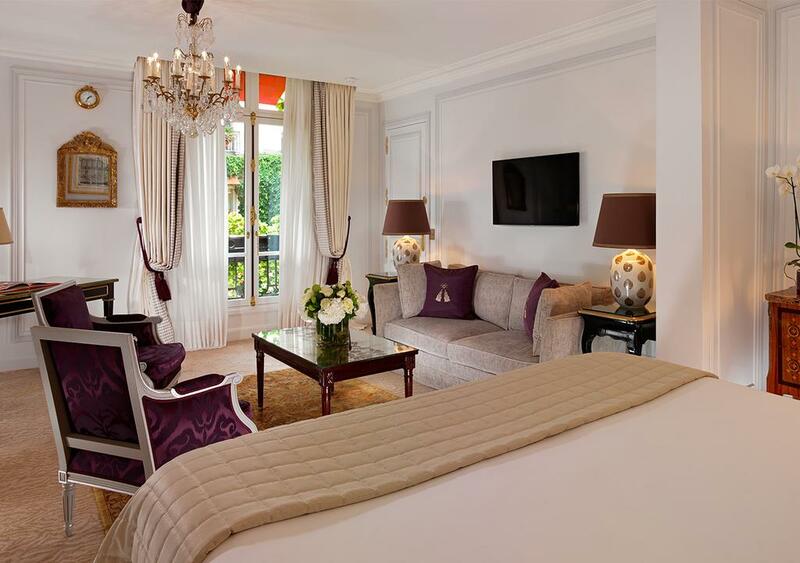 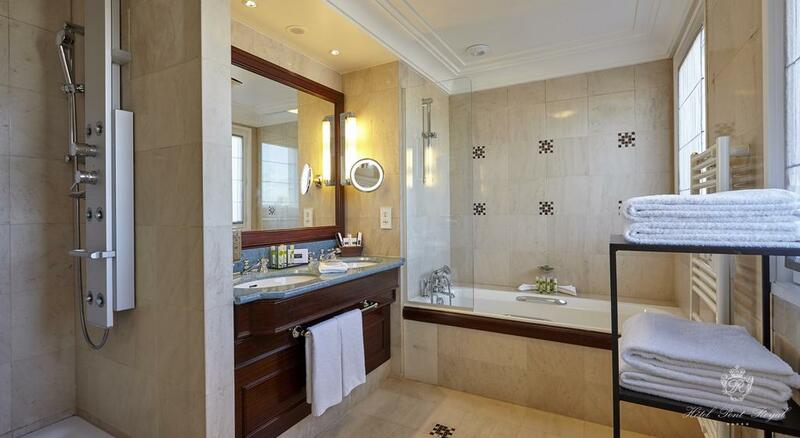 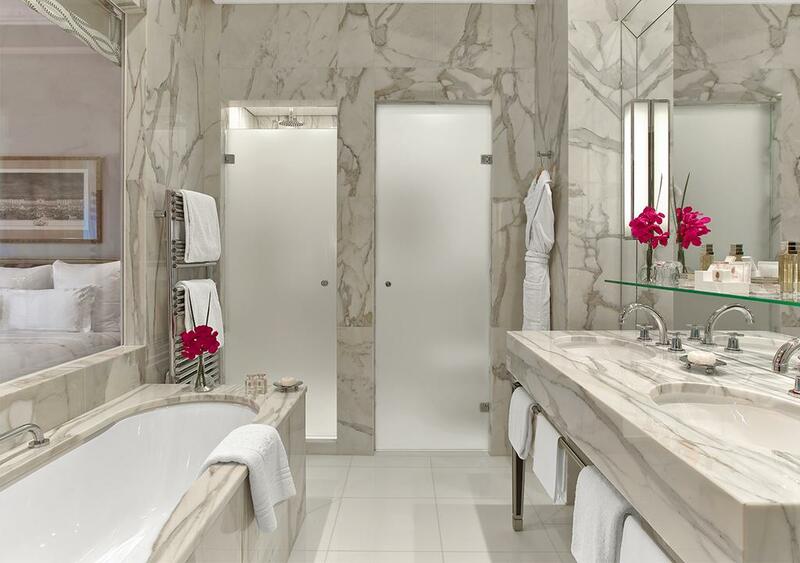 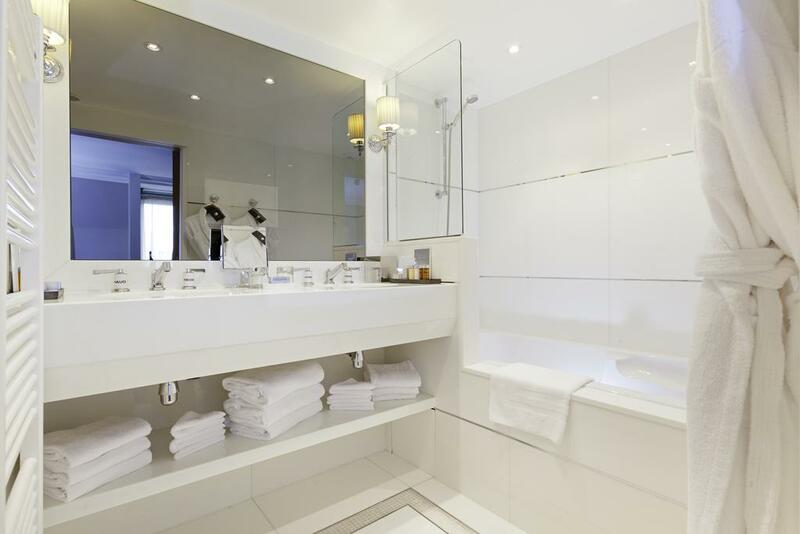 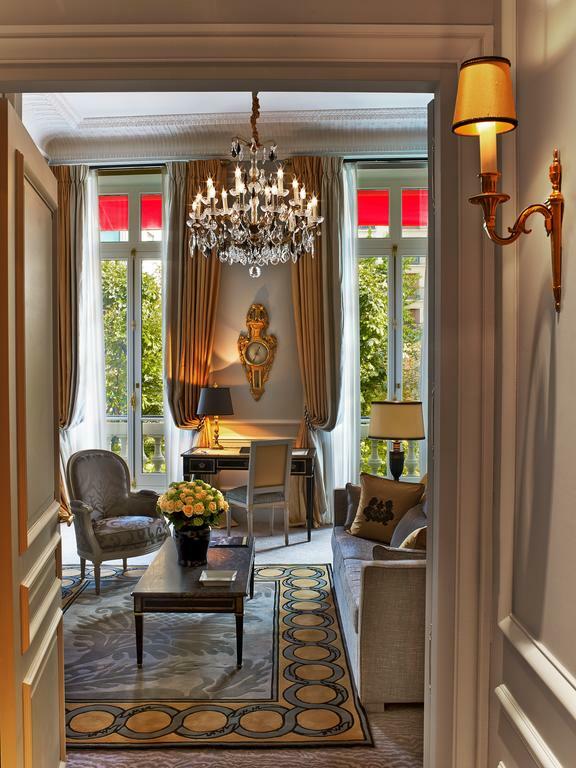 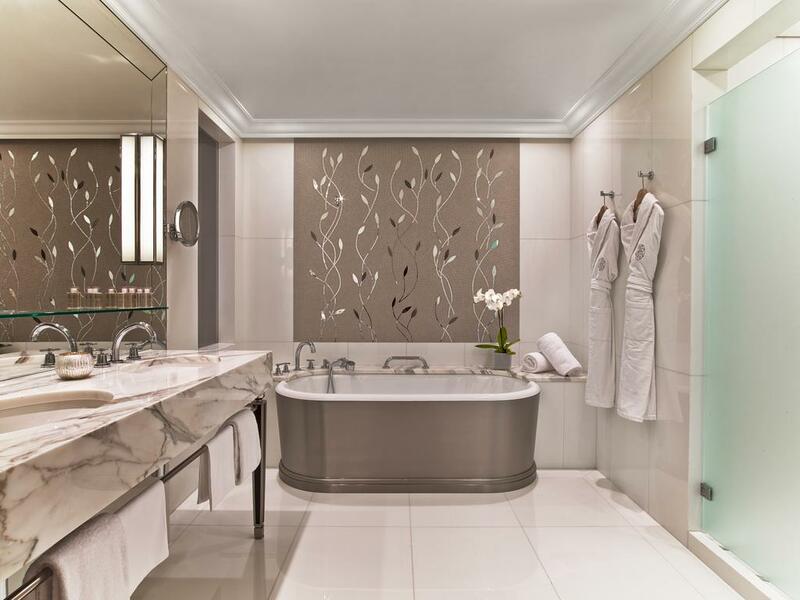 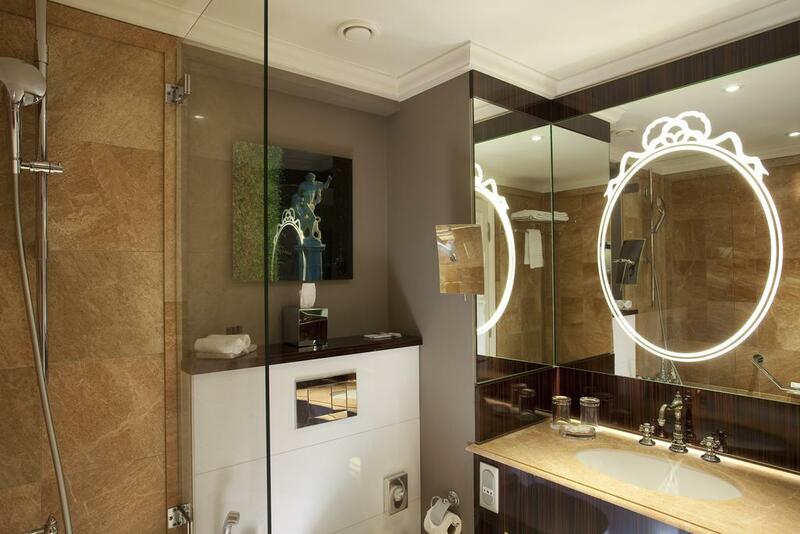 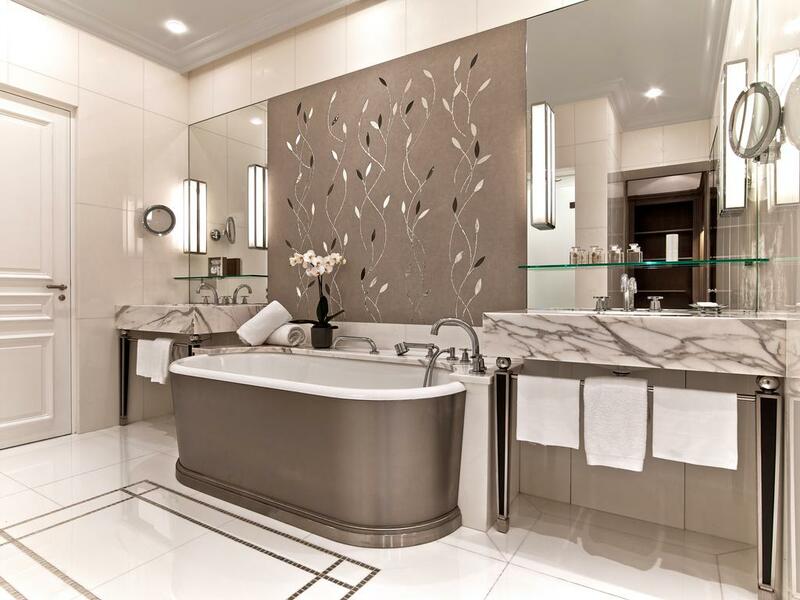 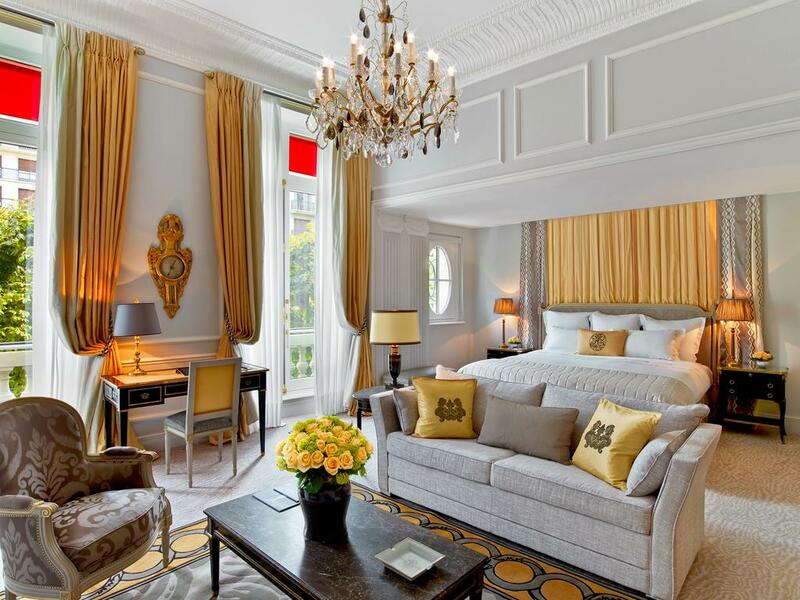 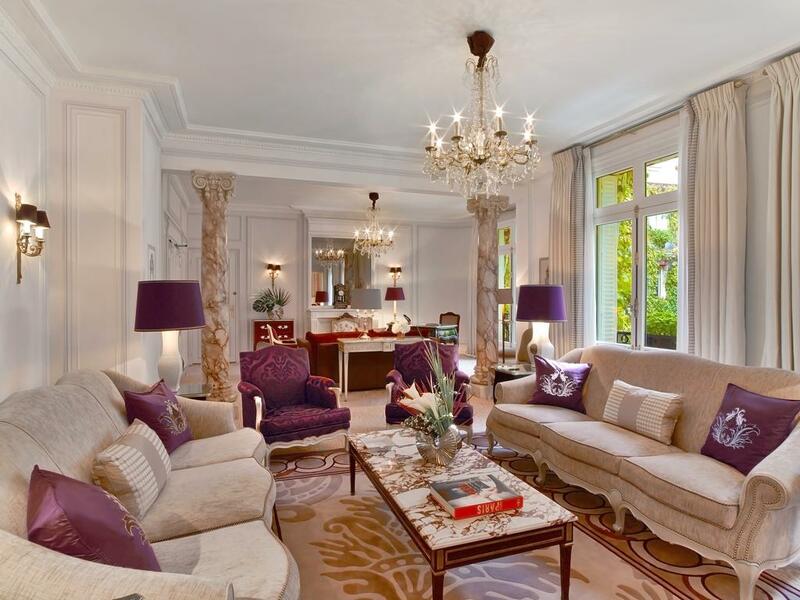 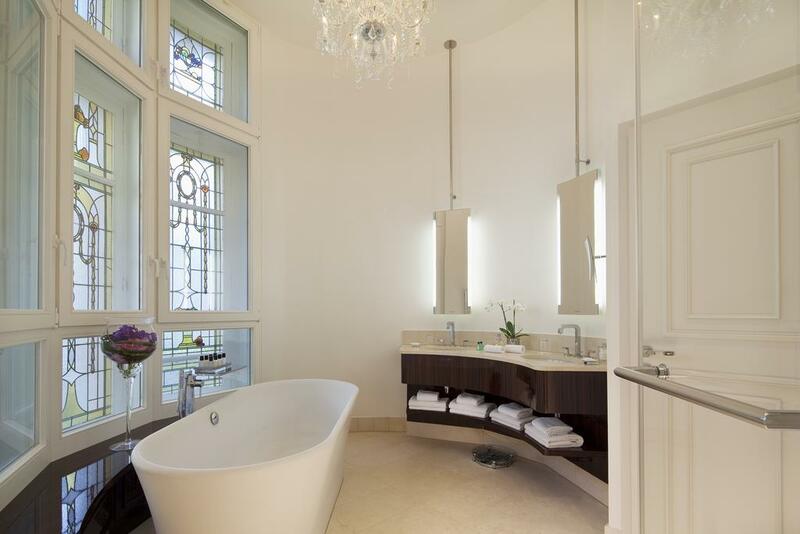 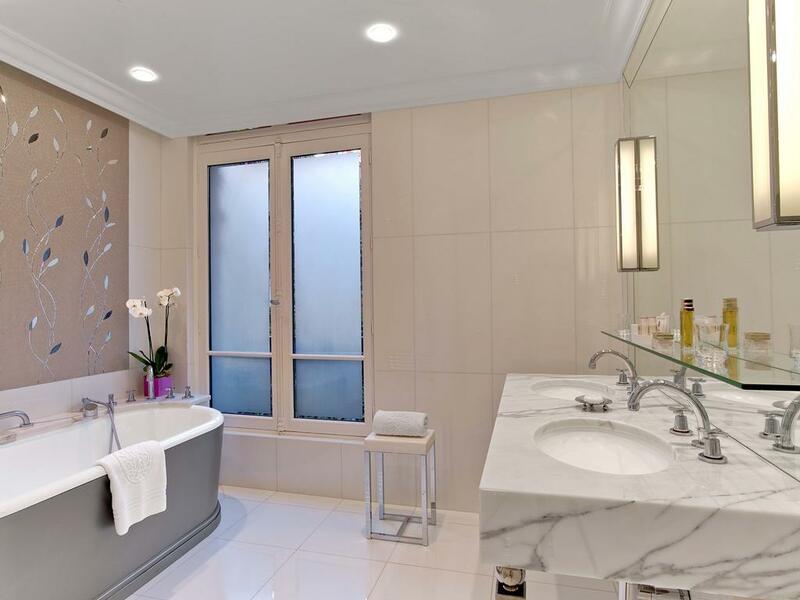 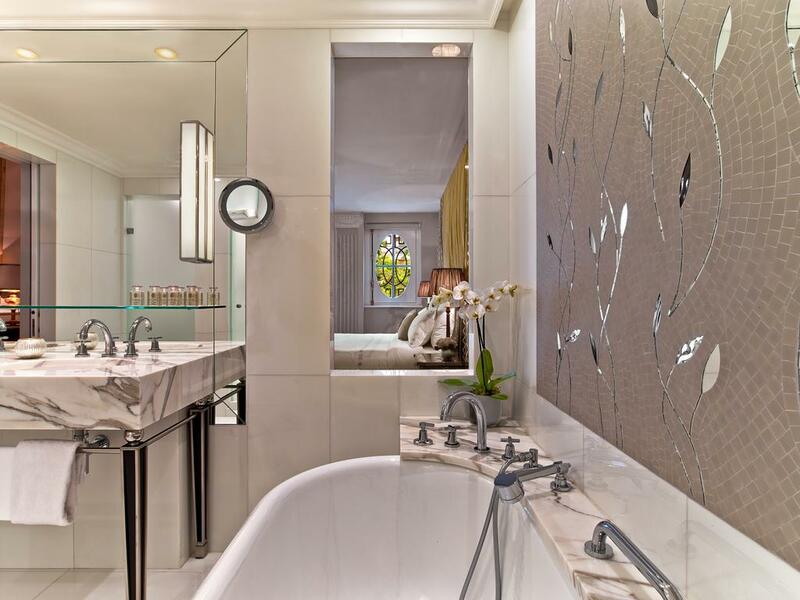 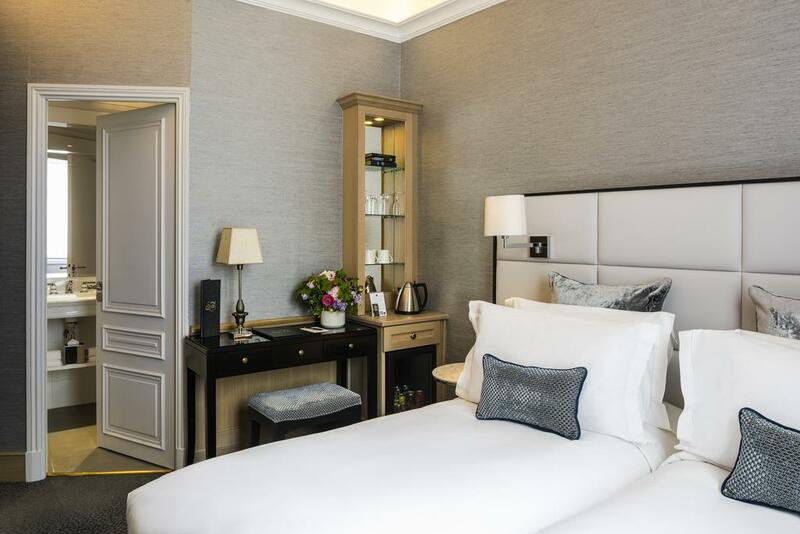 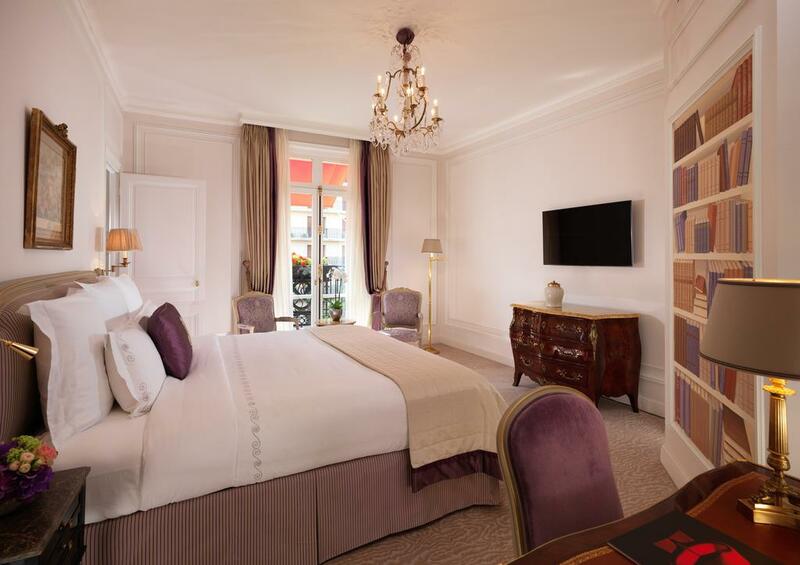 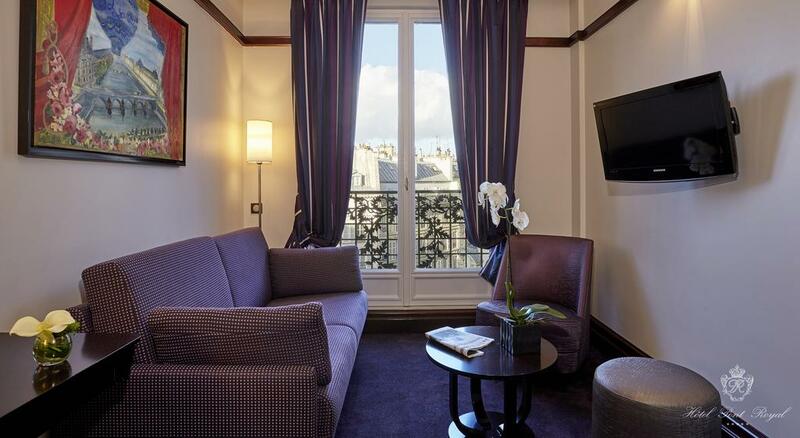 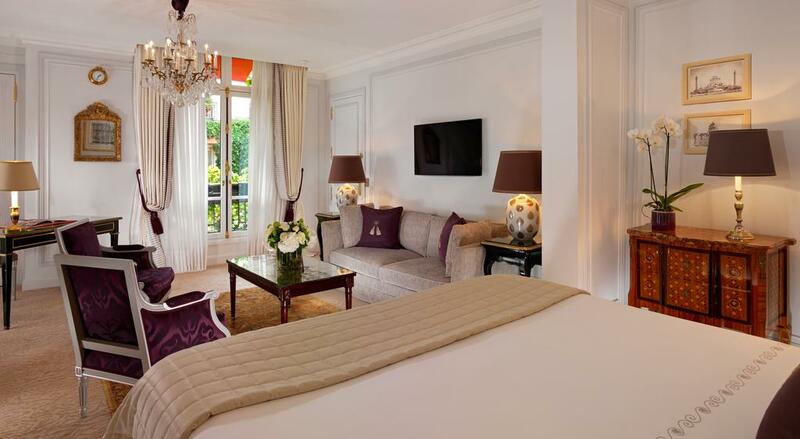 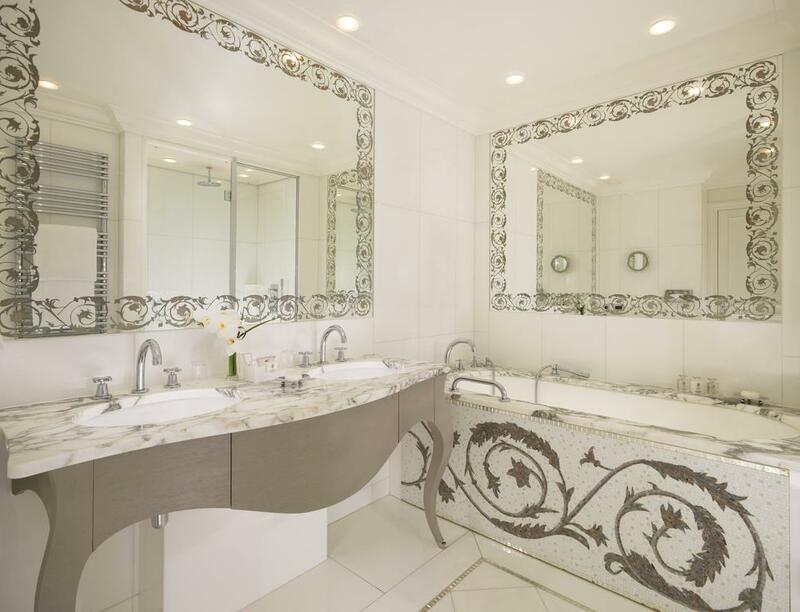 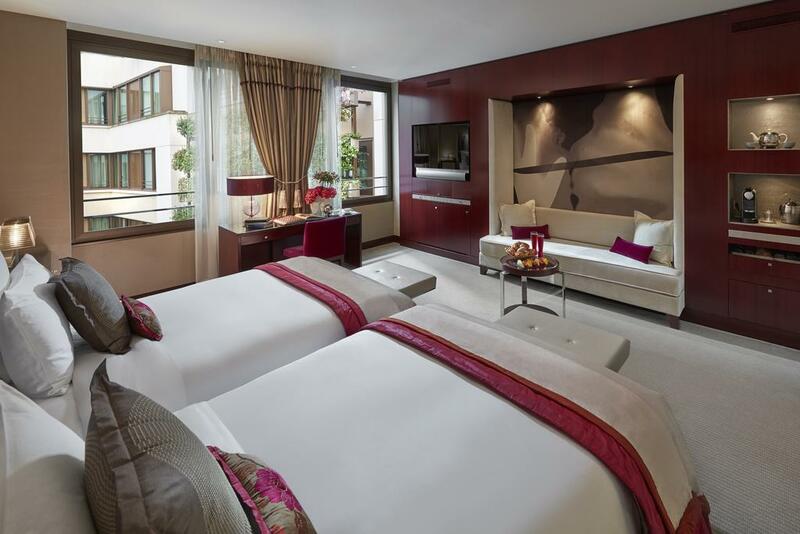 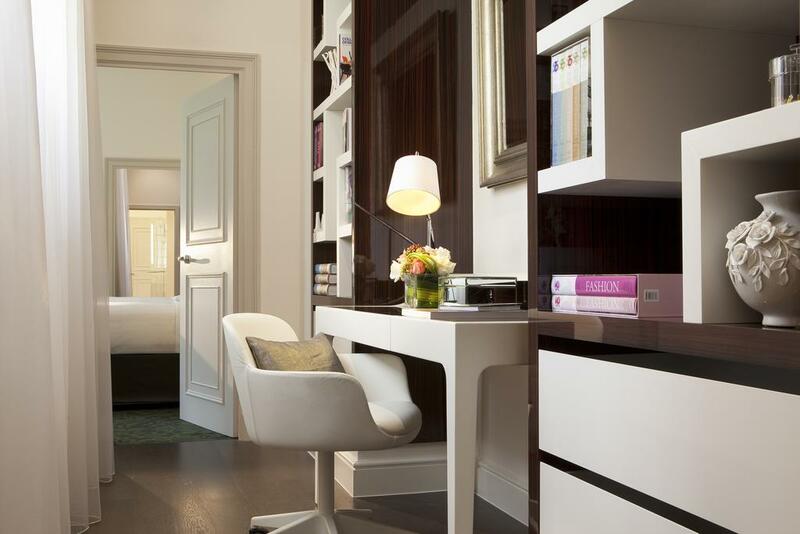 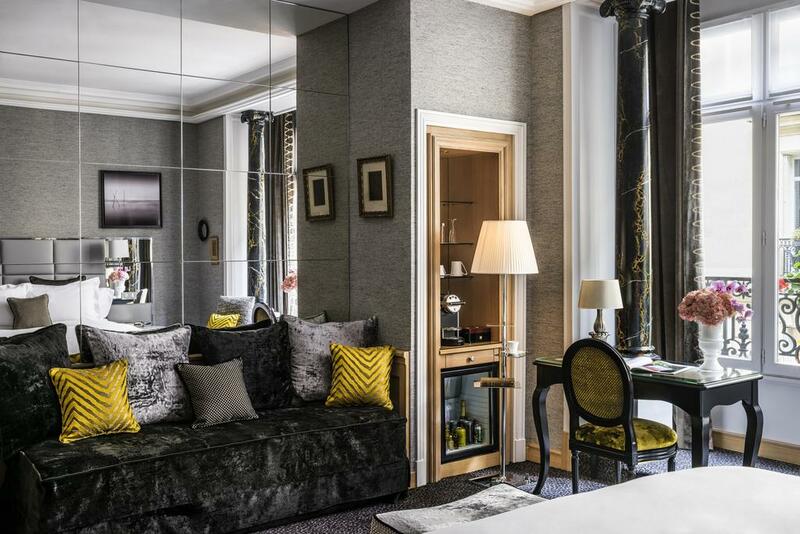 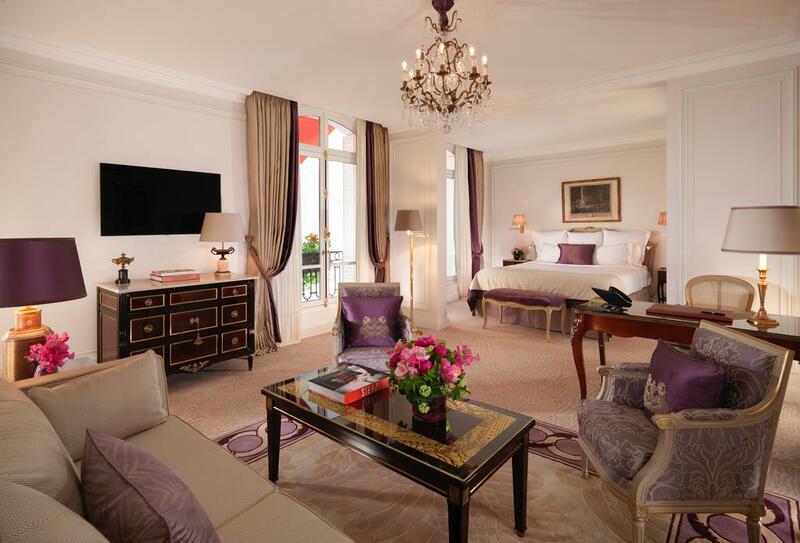 It offers elegant accommodations with marble bathrooms, a 5-minute walk from Avenue Champs Elysées. 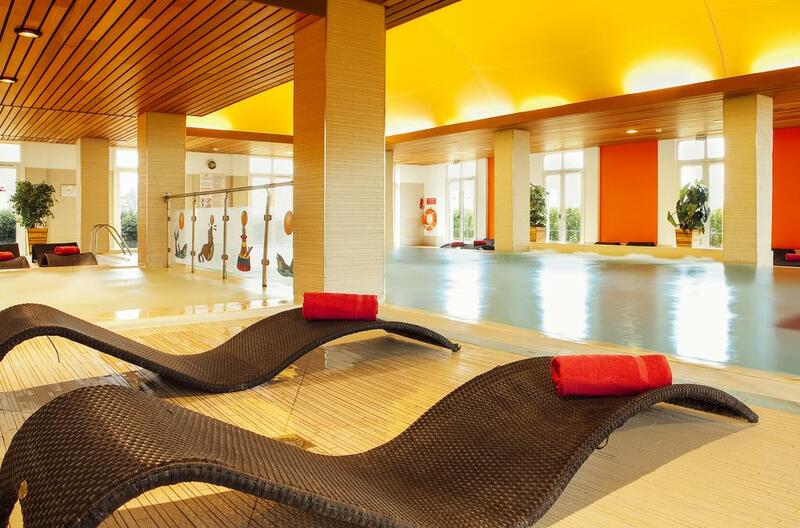 WiFi access is complimentary and access to the spa is free of charge. 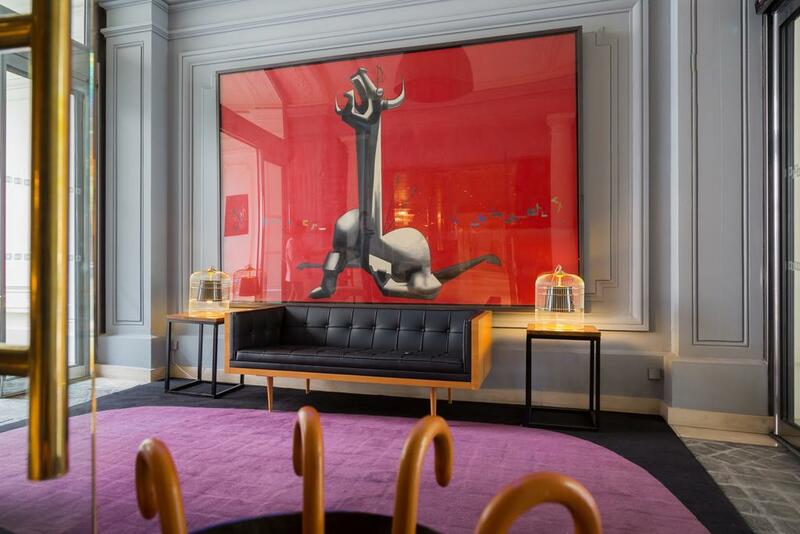 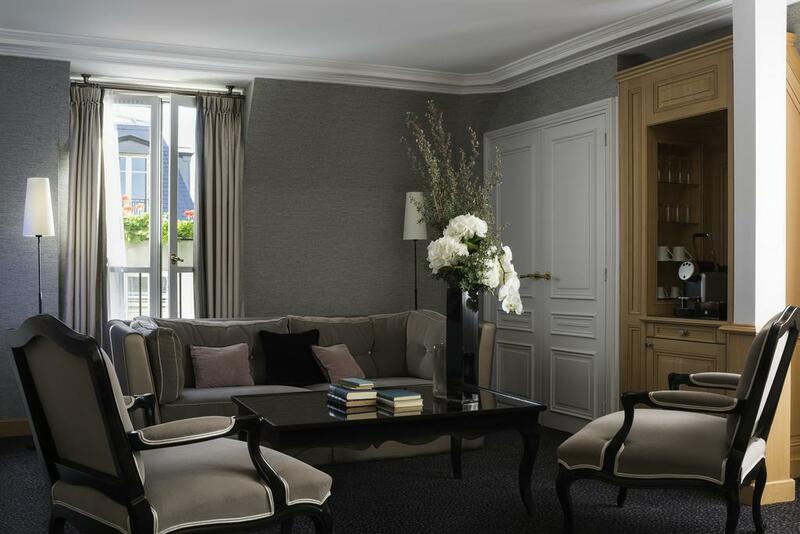 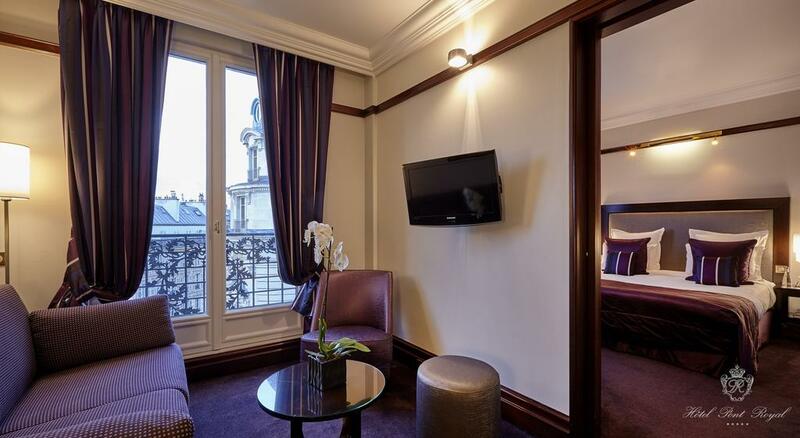 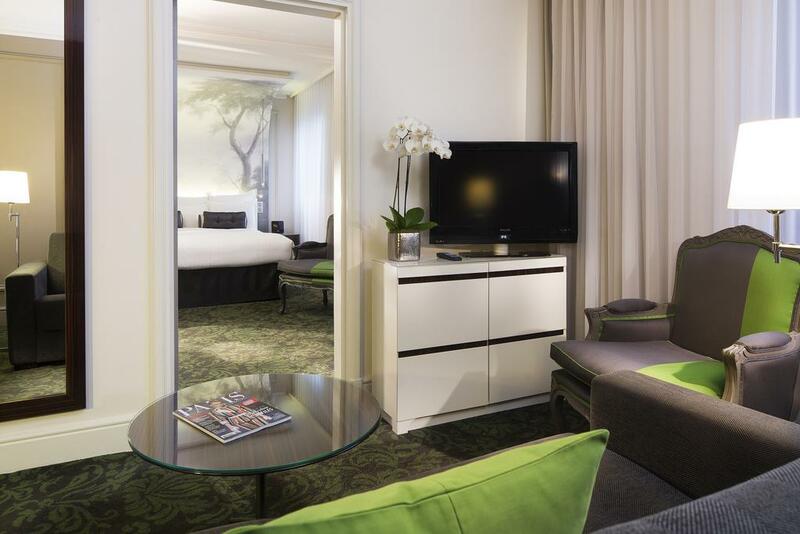 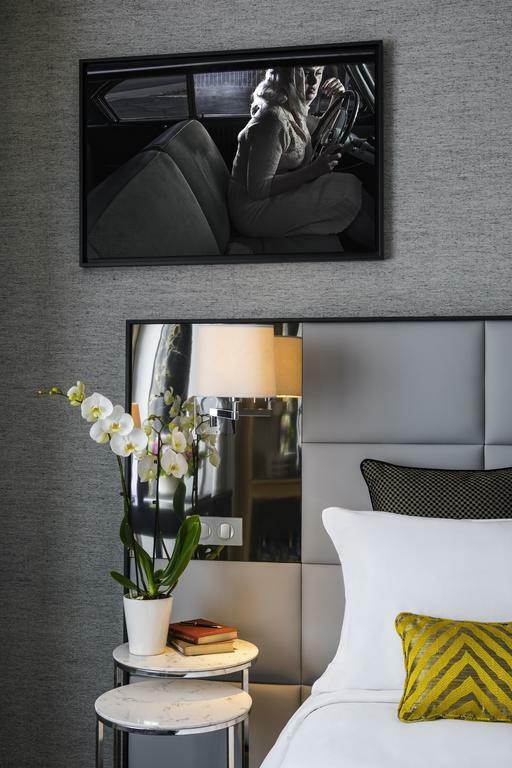 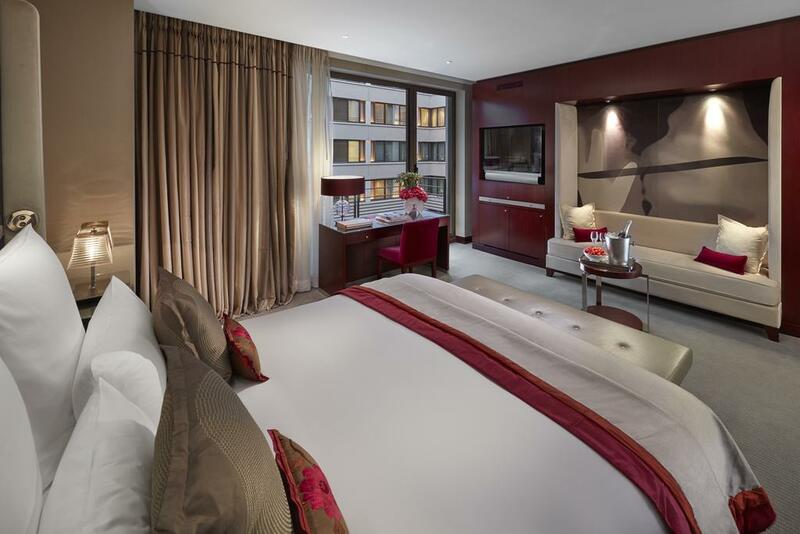 A plasma screen TV with over 200 on-demand movies features in all of the rooms and suites at Hôtel Plaza Athénée Paris. 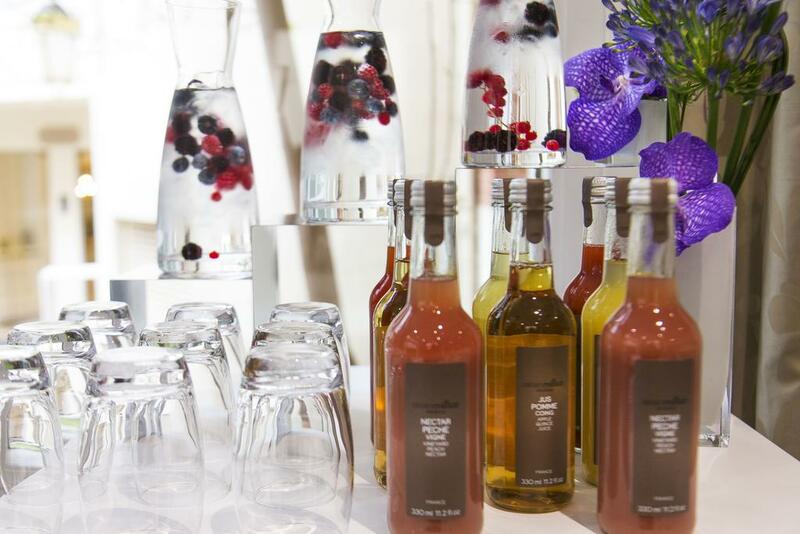 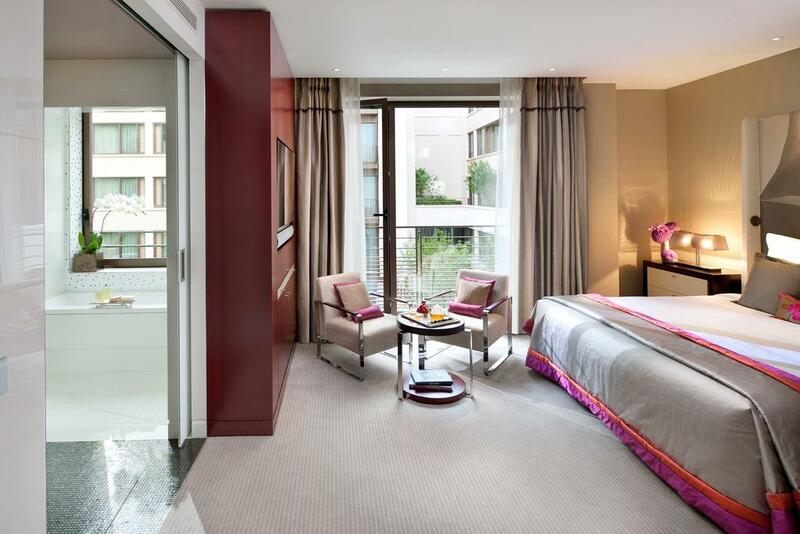 Guests can choose from 80 drinks for the personalized mini-bar and 5 pillow types for a good night’s sleep. 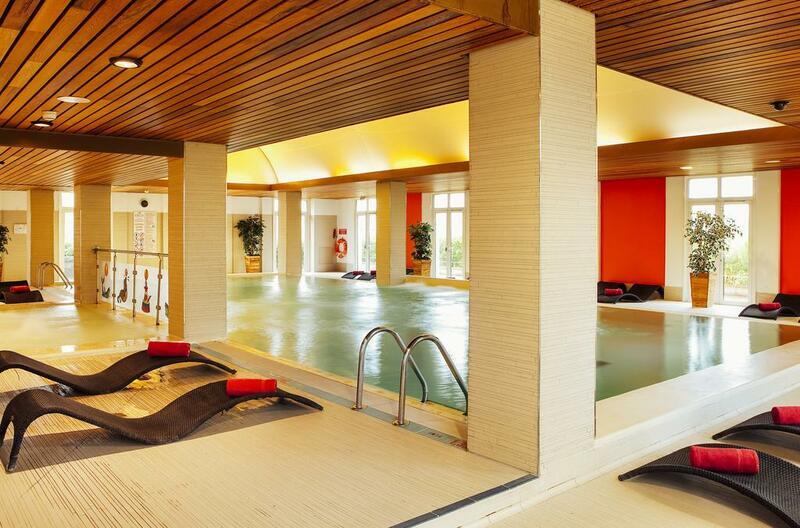 All guests have free access to the spa. 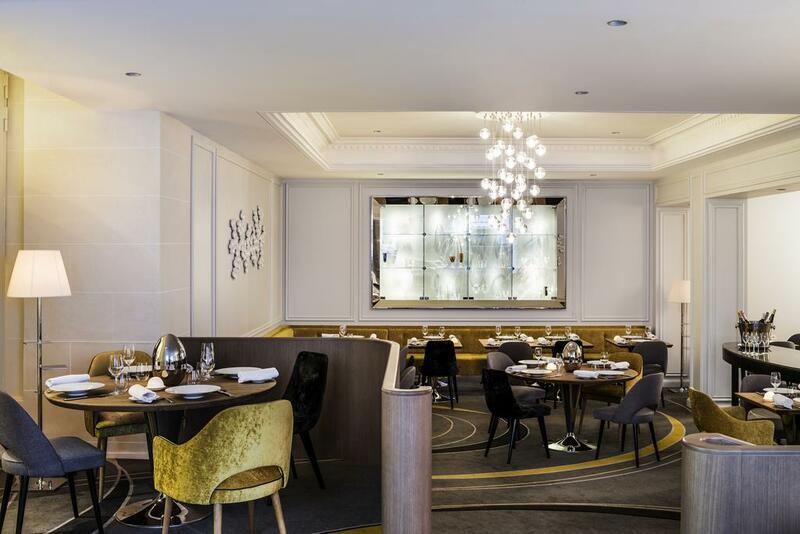 Cuisine at Hôtel Plaza includes an American breakfast, gastronomic French dishes, Japanese specialties and a summer menu. 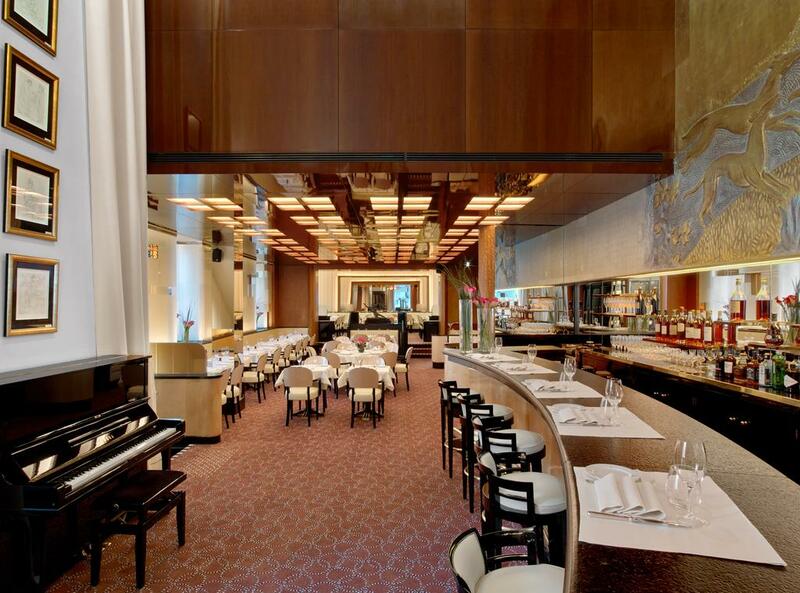 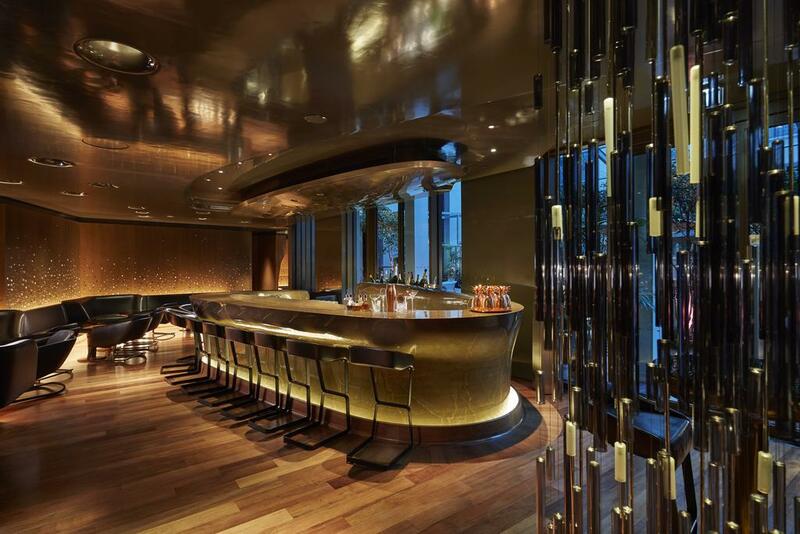 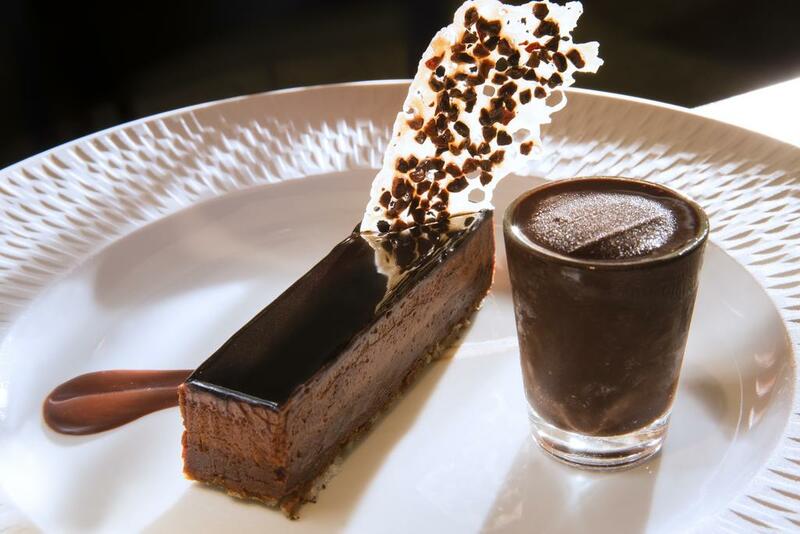 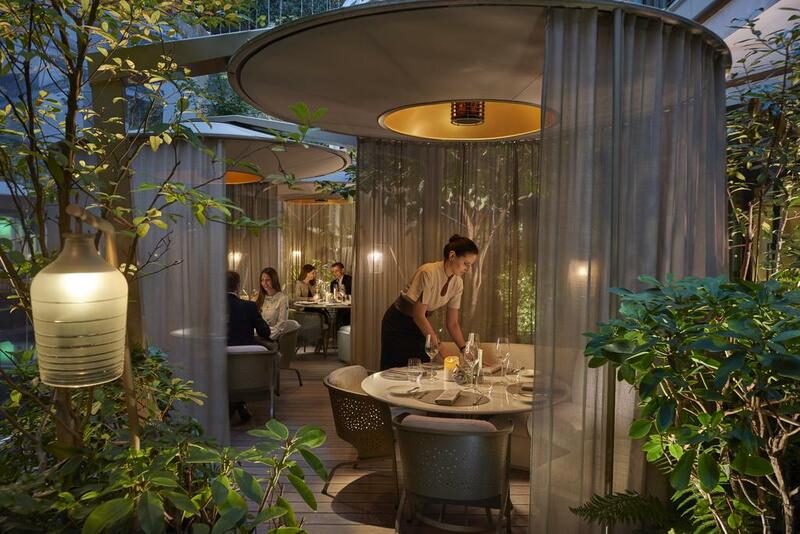 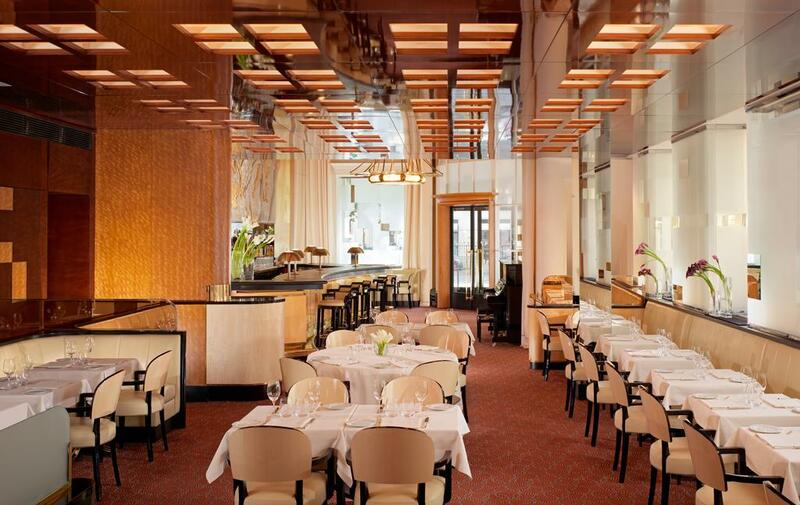 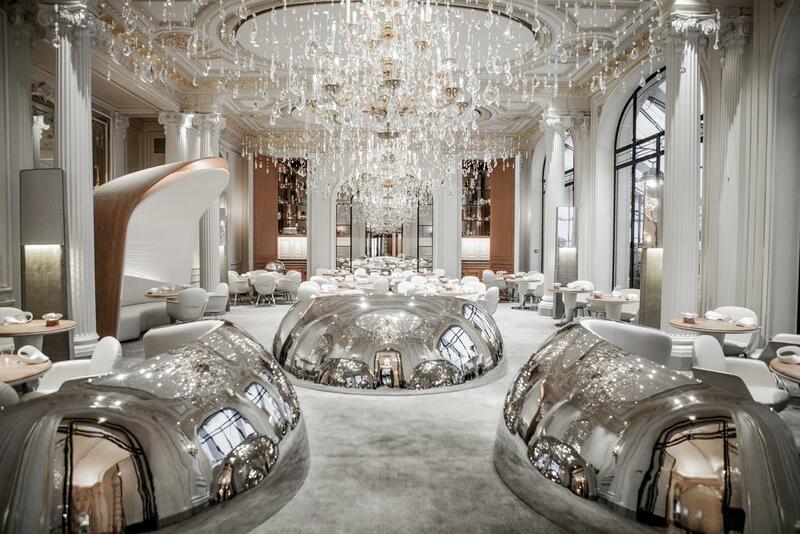 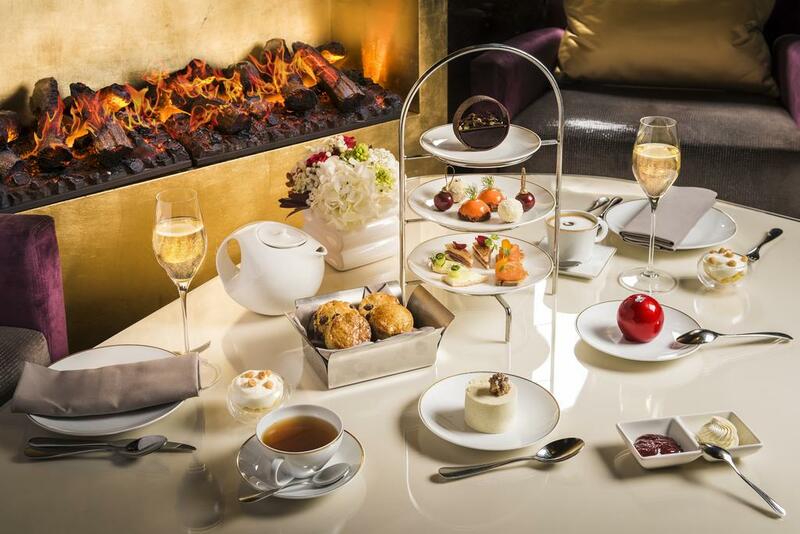 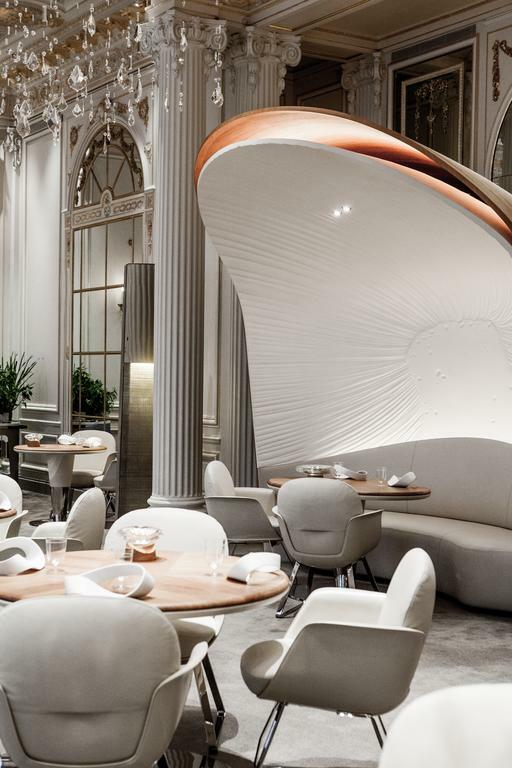 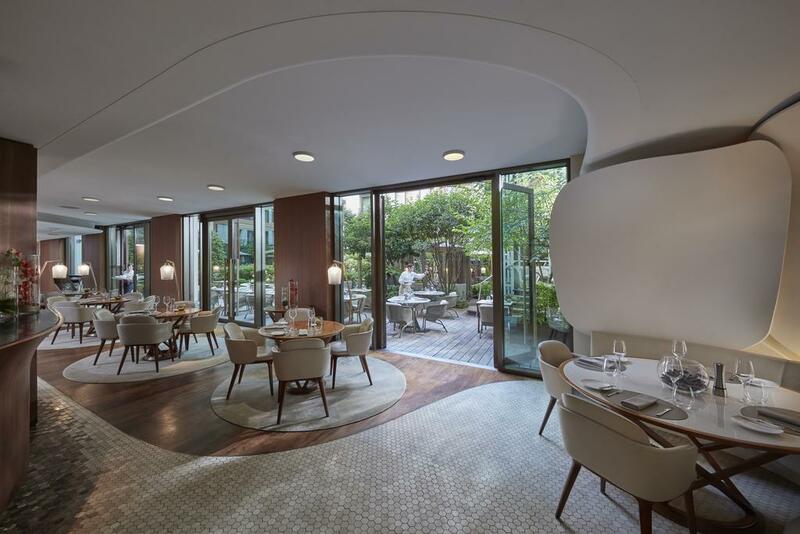 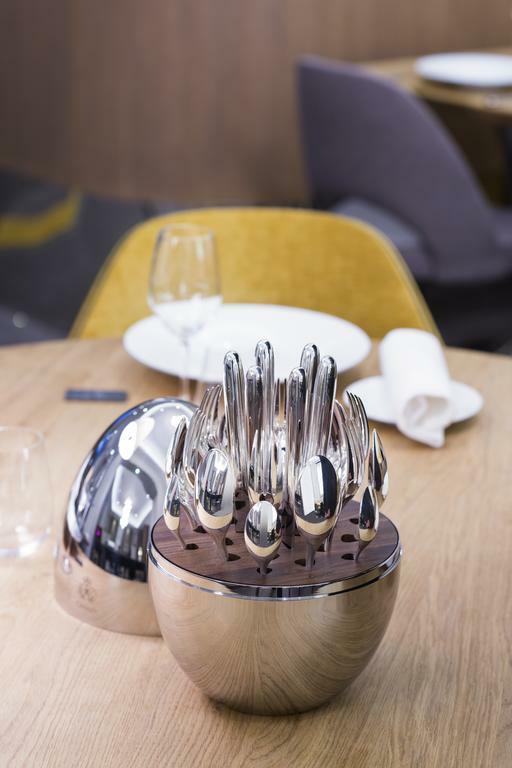 The hotel’s restaurants’ are supervised by the Michelin Star chef Alain Ducasse. 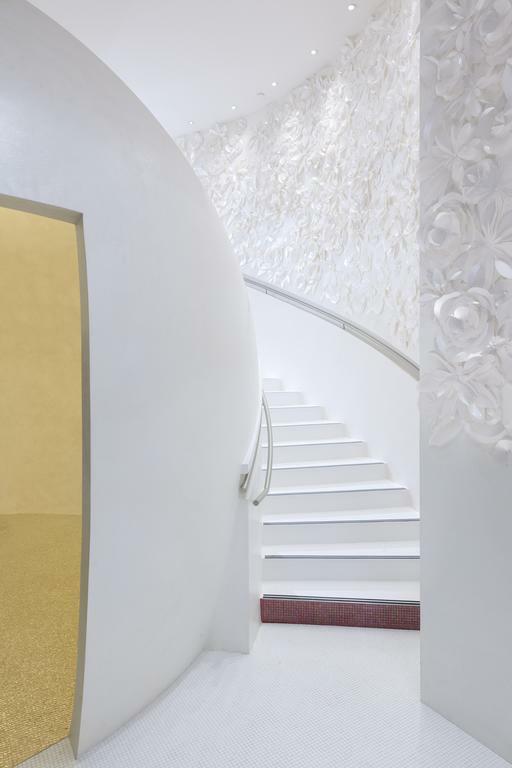 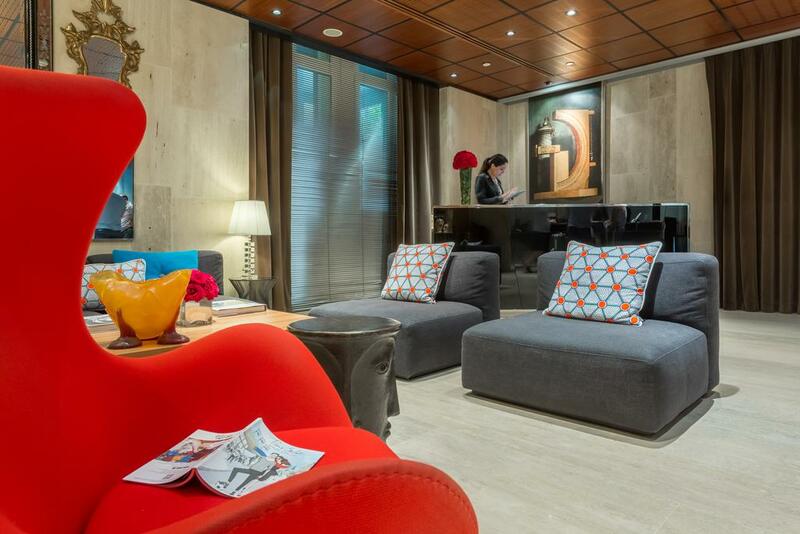 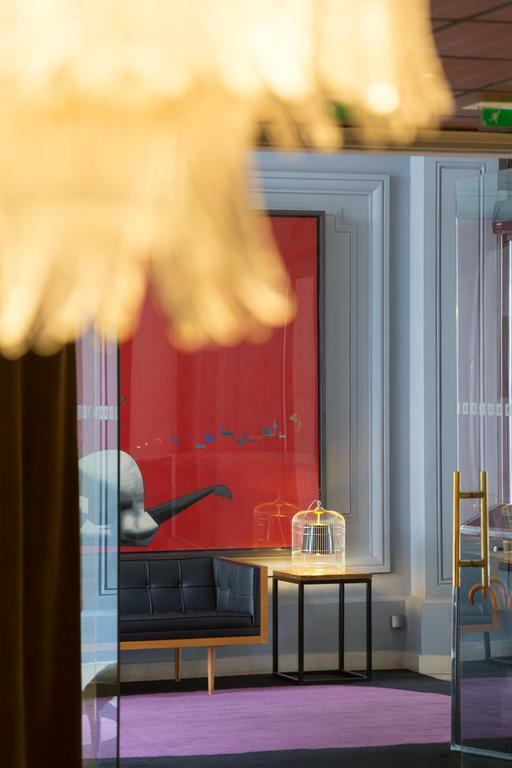 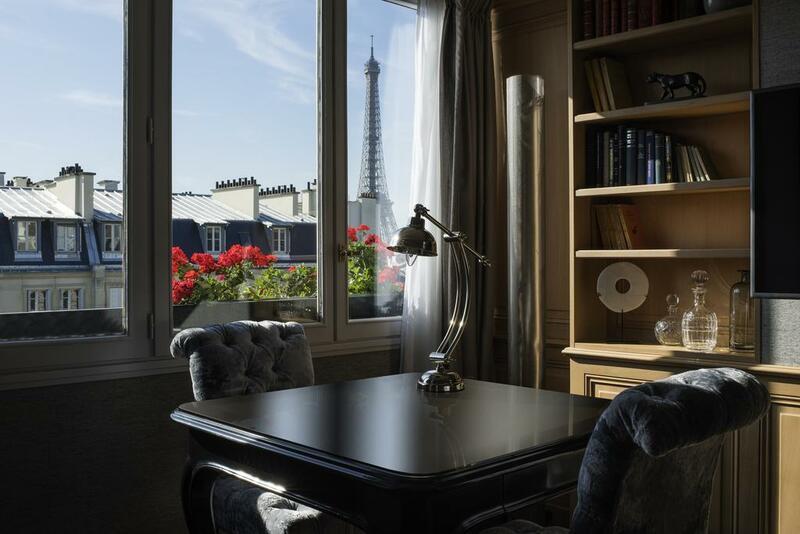 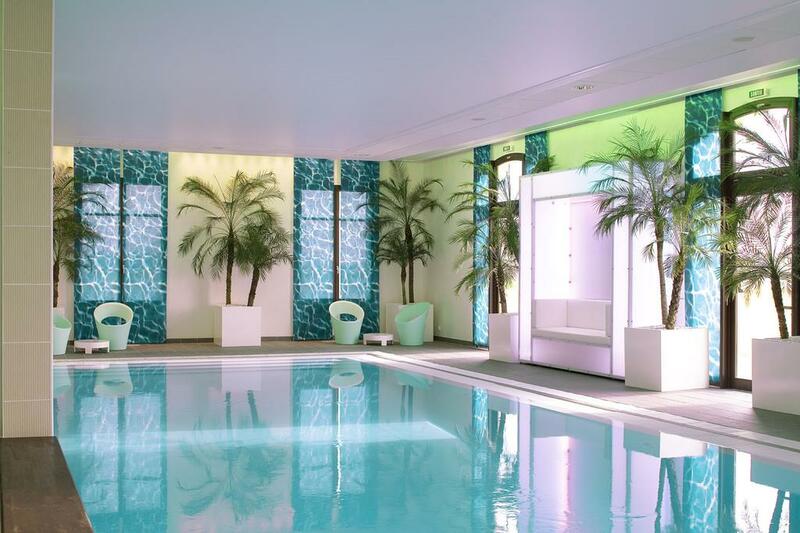 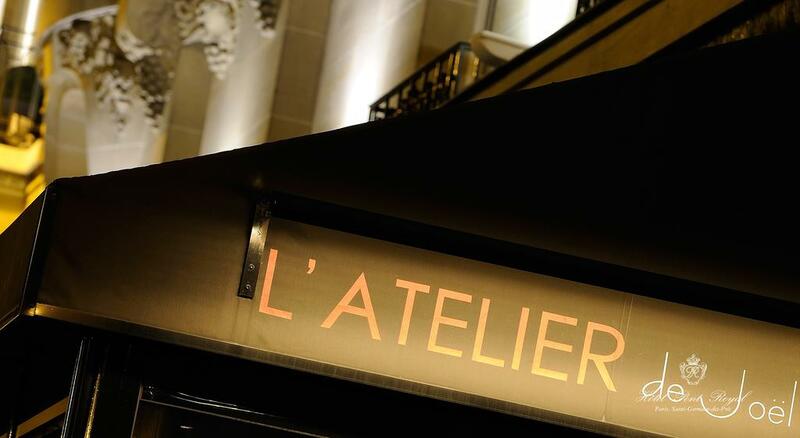 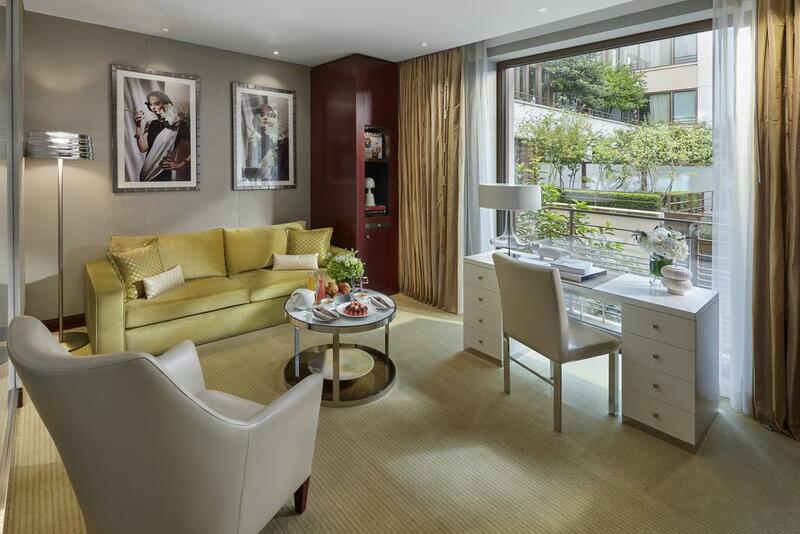 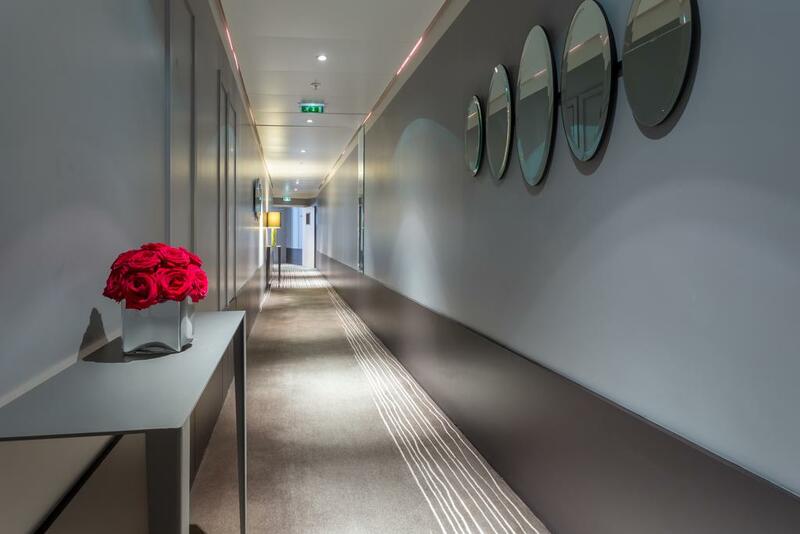 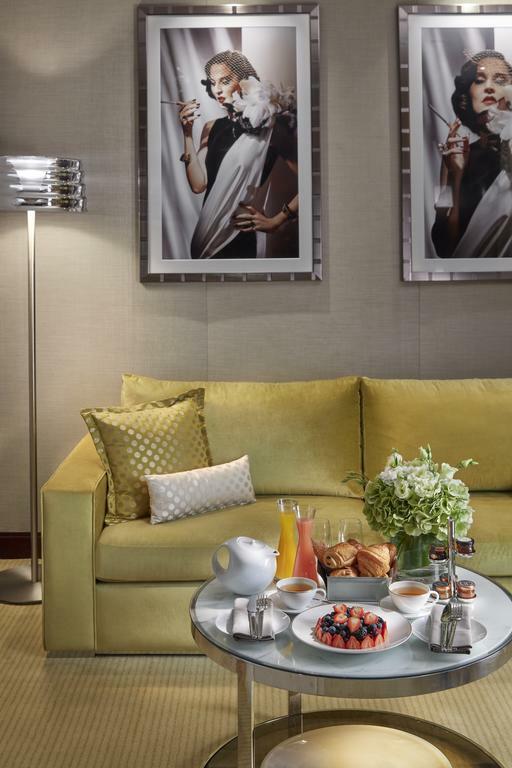 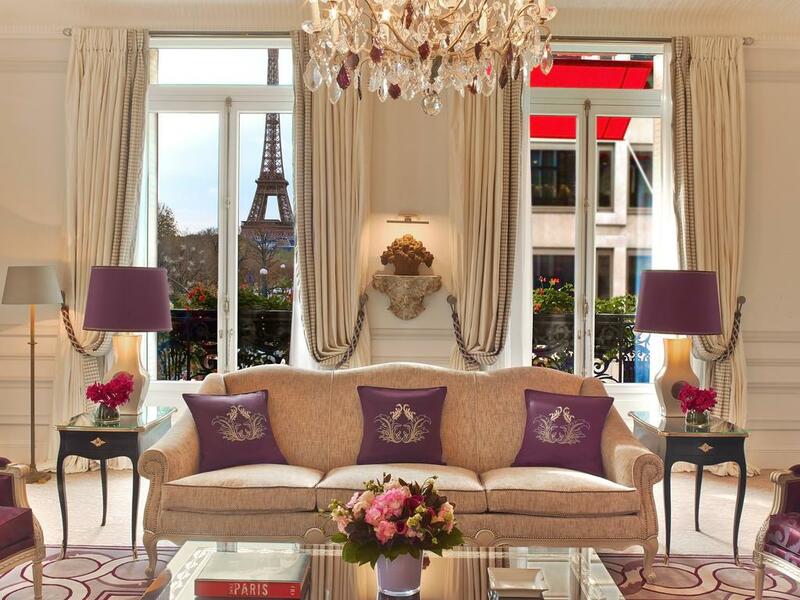 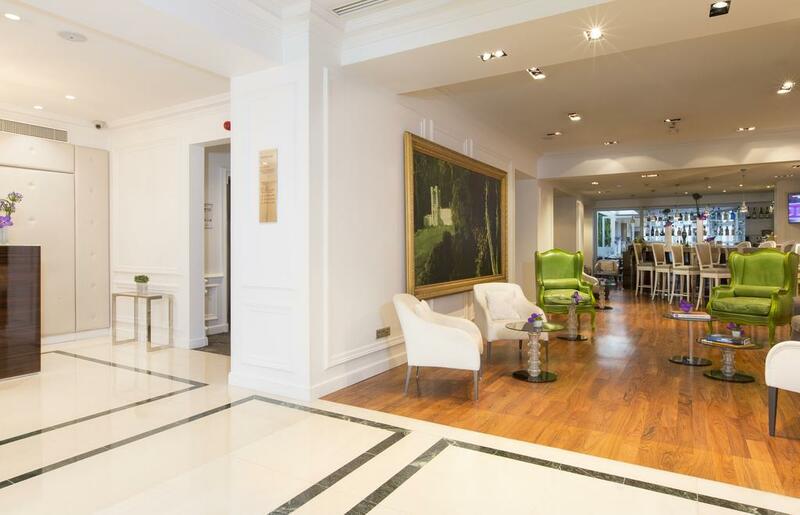 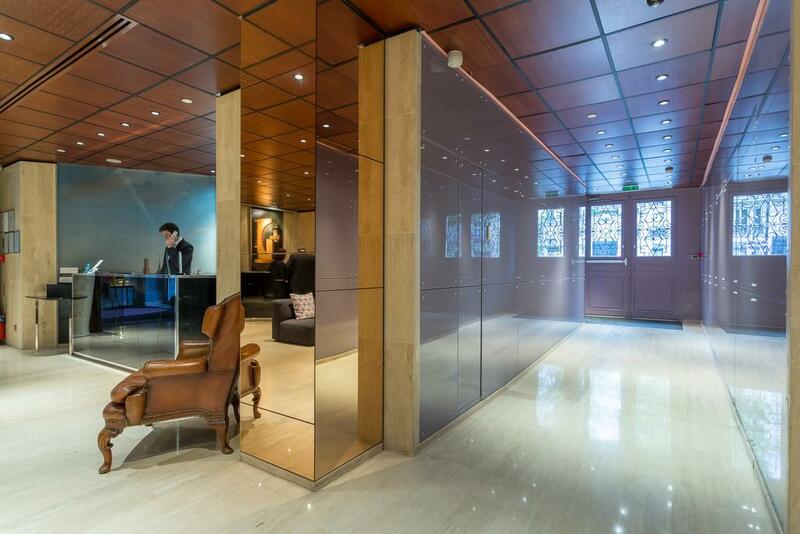 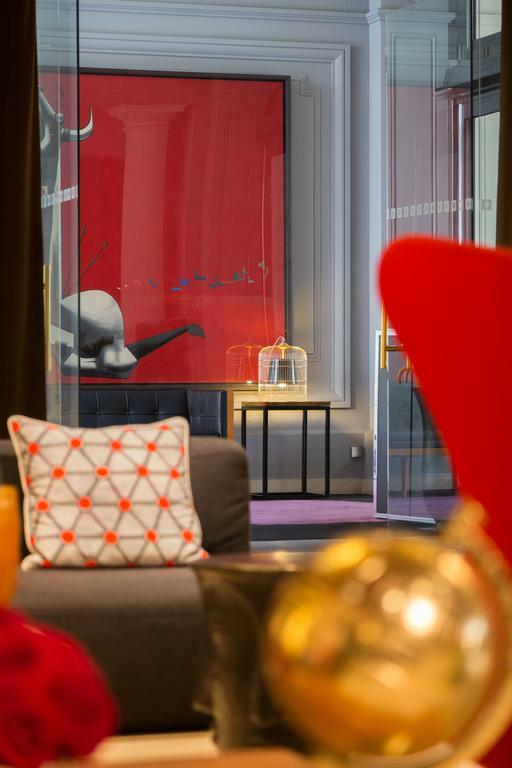 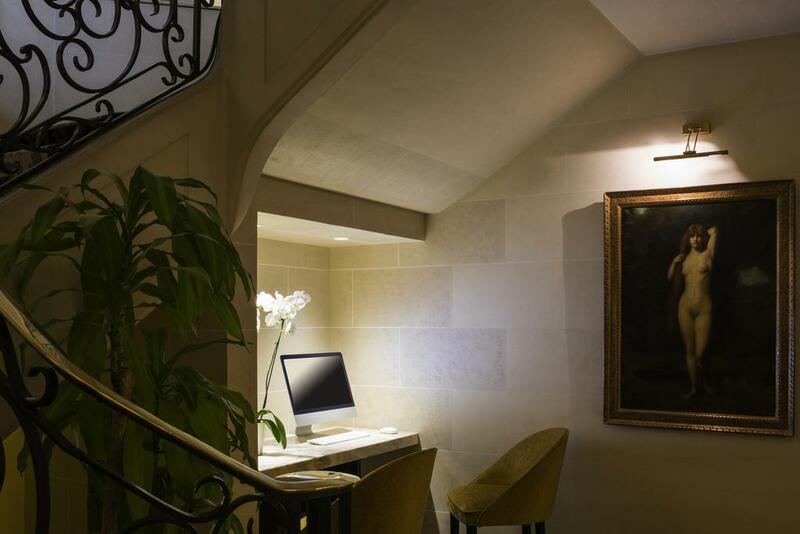 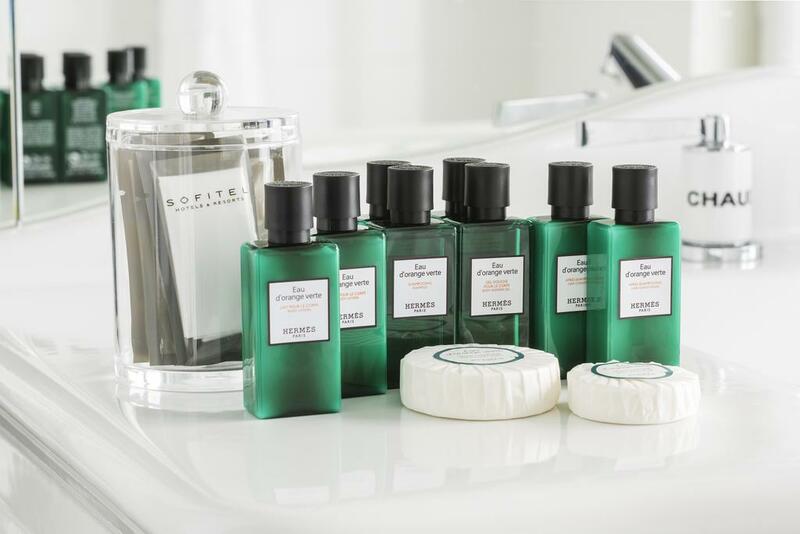 A shoe shine service and twice-a-day housekeeping are just some of the facilities on offer at Athénée Paris. 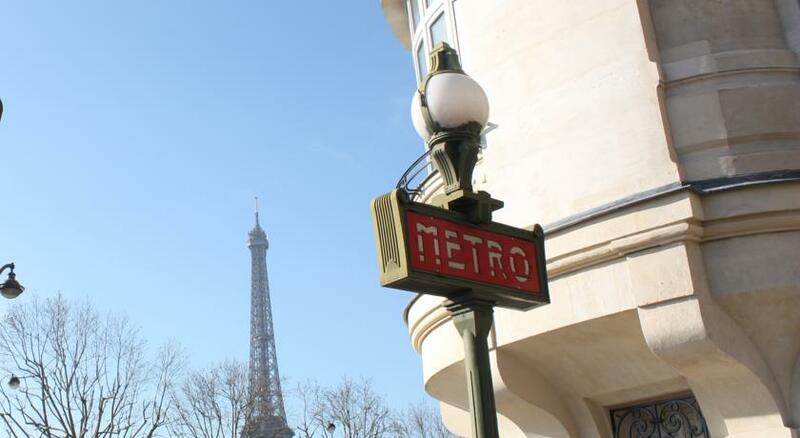 Alma Marceau Metro Station is 300 m away and the Eiffel Tower is a 15-minute walk from the hotel. 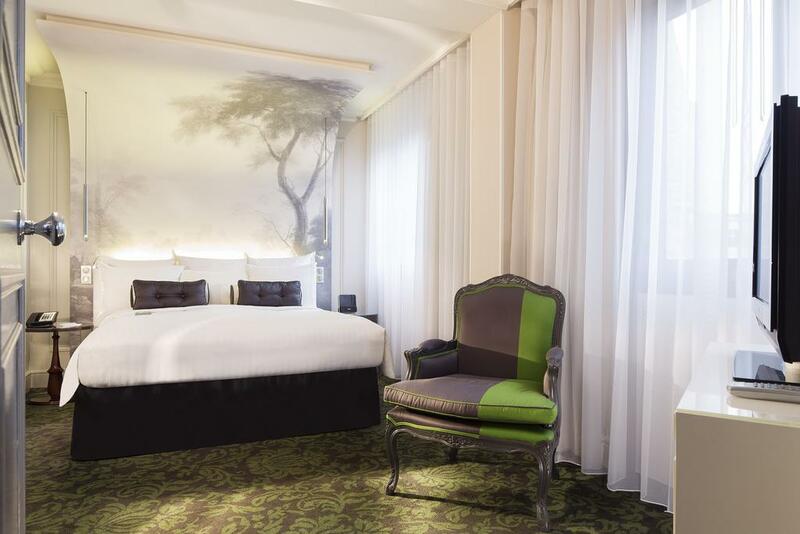 This is our guests’ favorite part of Paris, according to independent reviews. 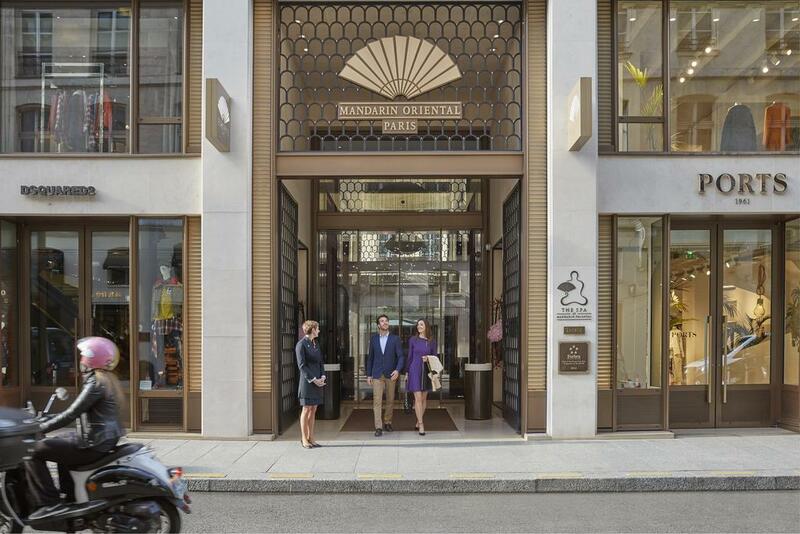 In this area you can shop ’til you drop for popular brands like Gucci, Ralph Lauren, Chanel, Louis Vuitton. 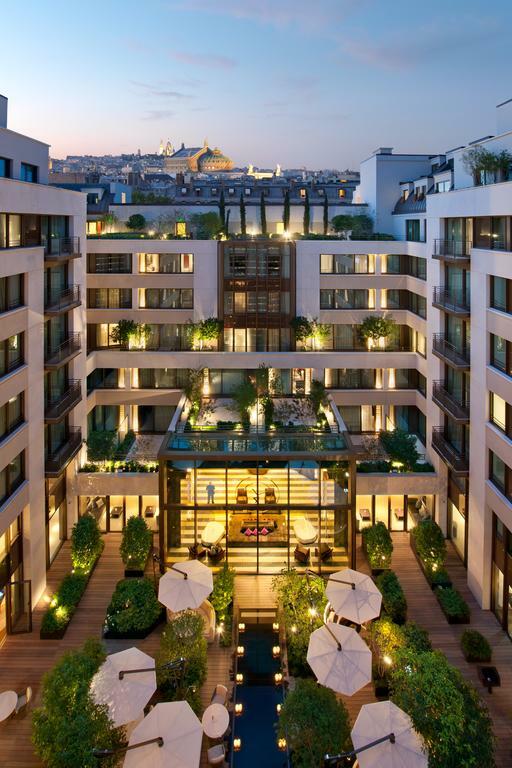 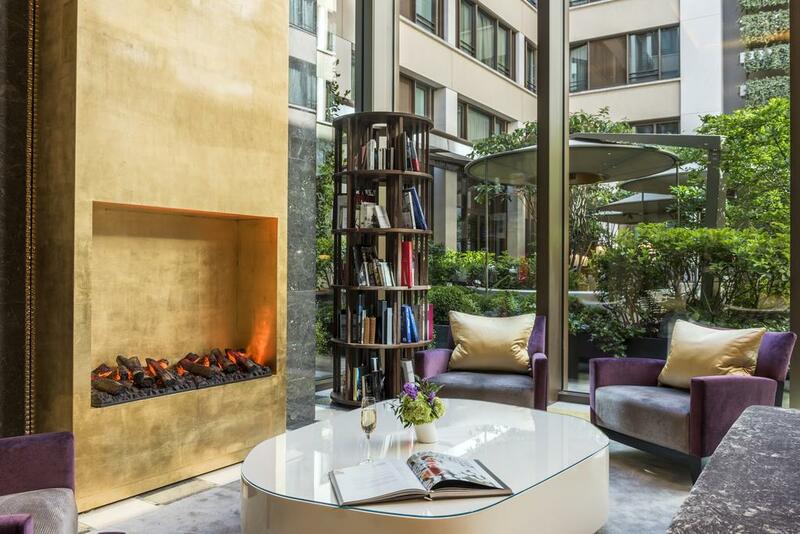 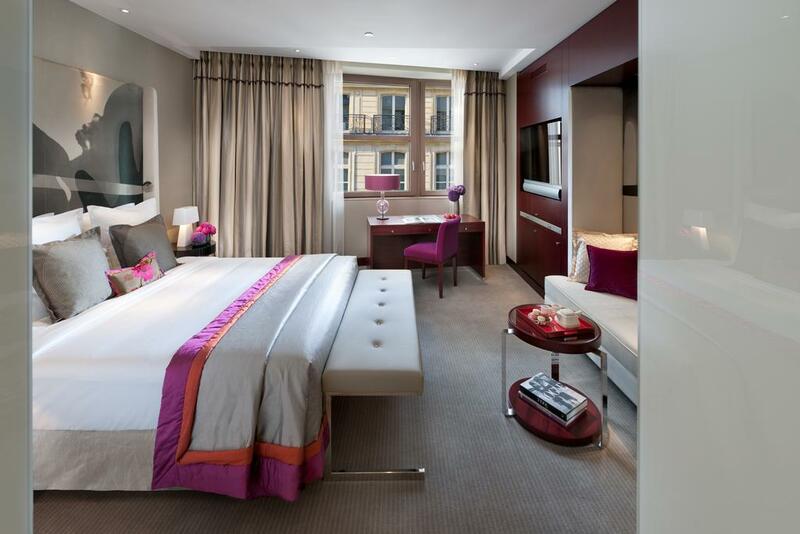 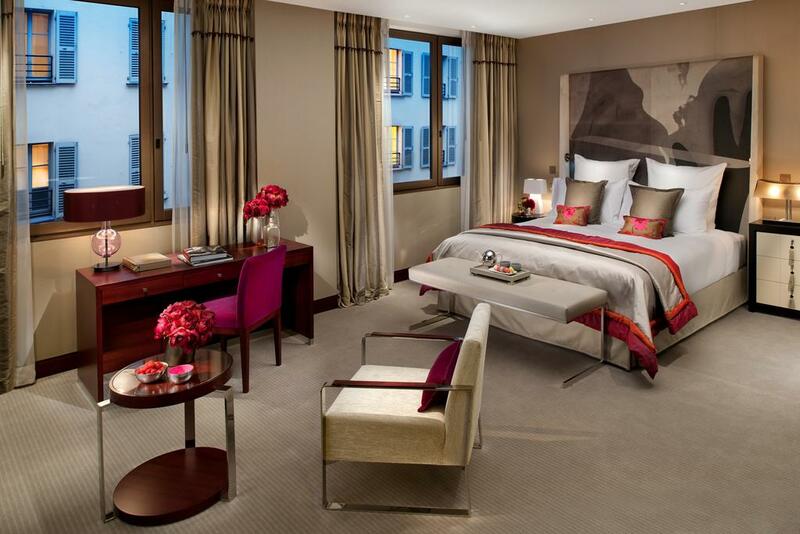 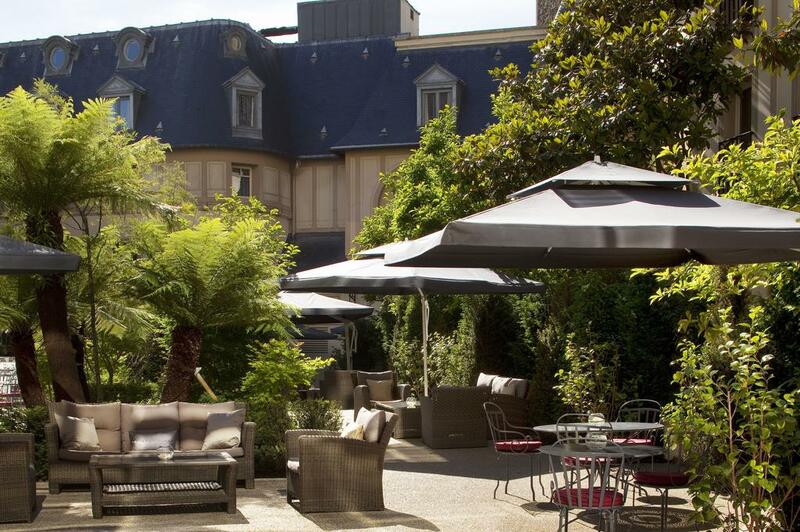 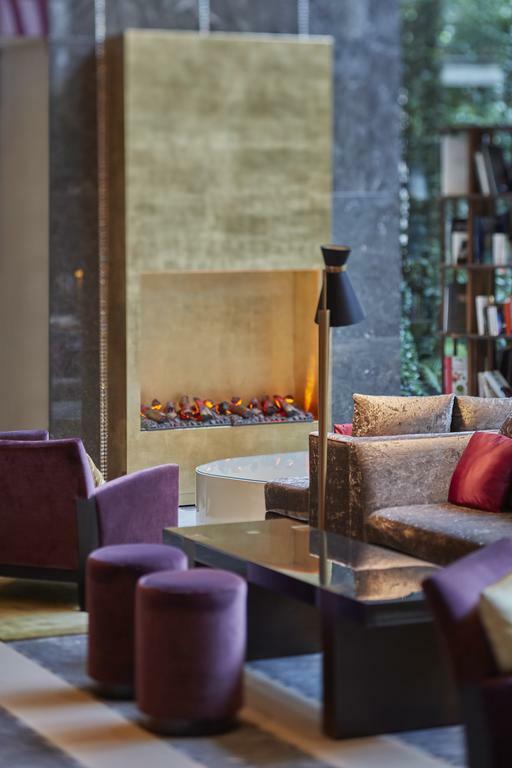 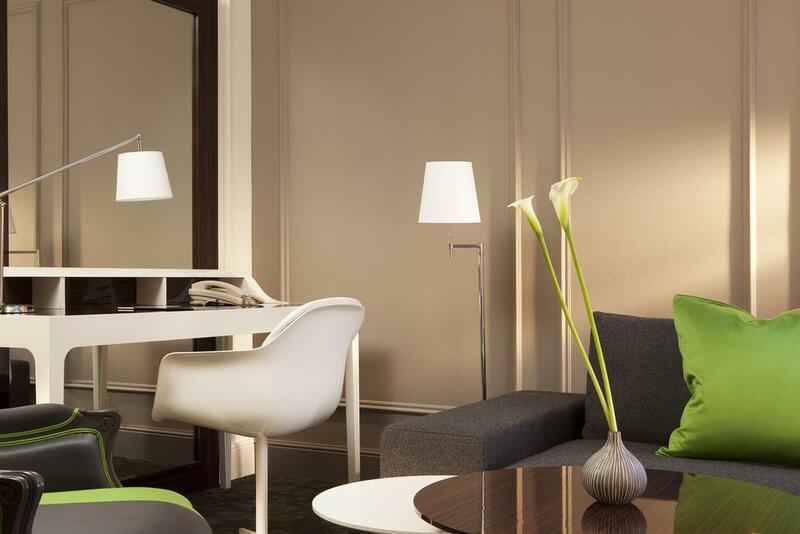 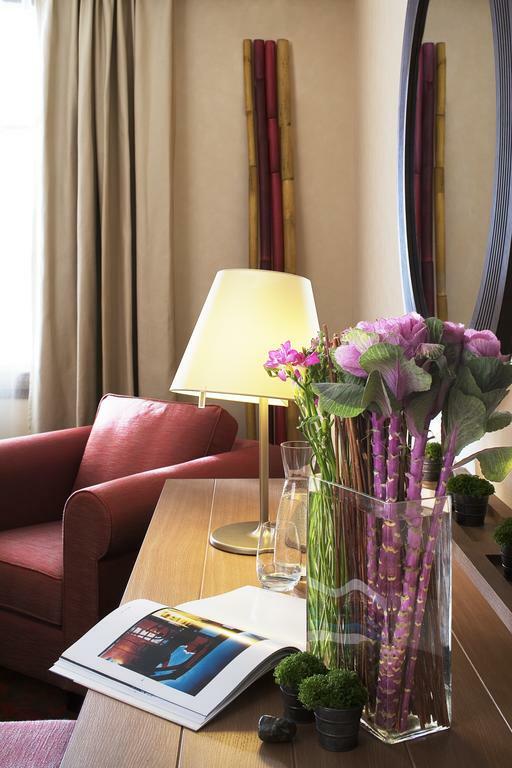 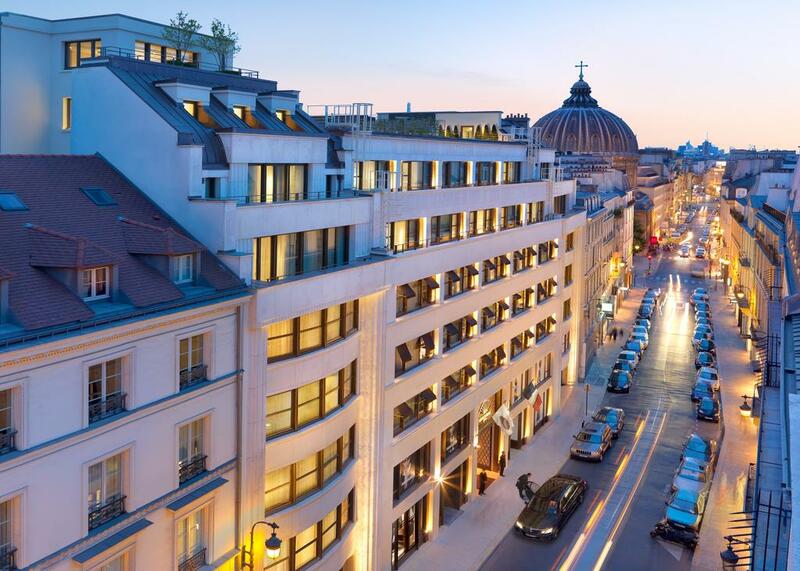 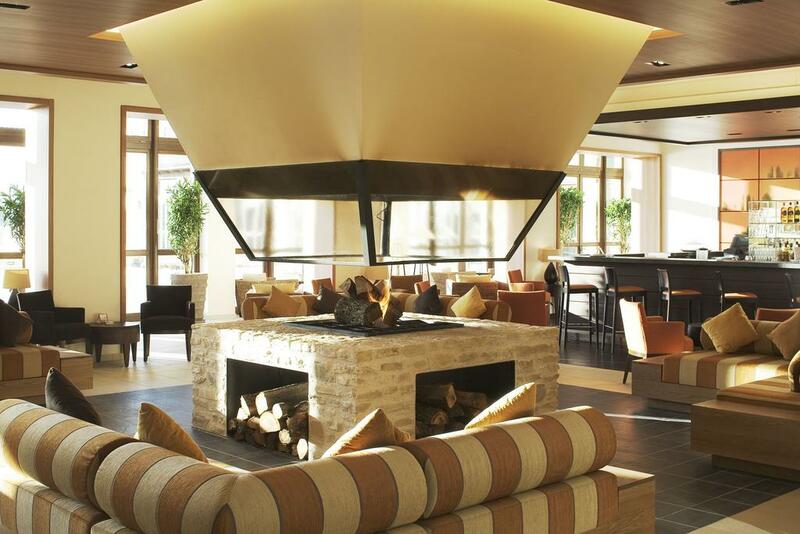 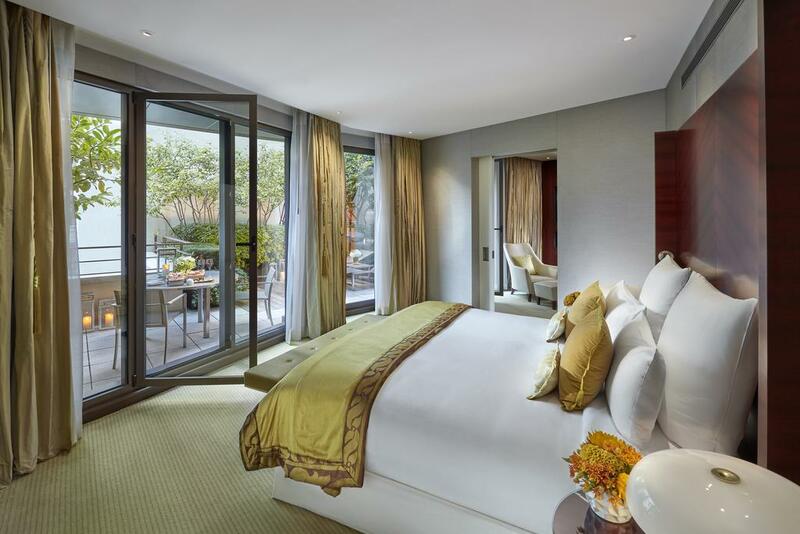 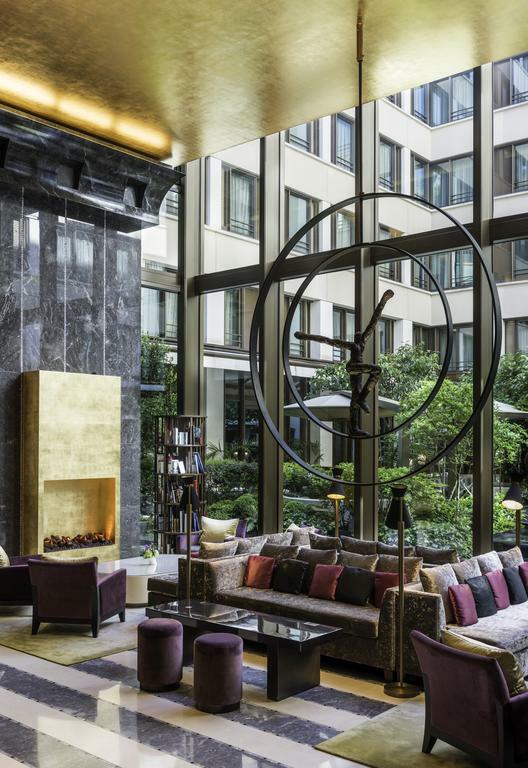 Hyatt Paris Madeleine is located in central Paris, a 5-minute walk from Madeleine. 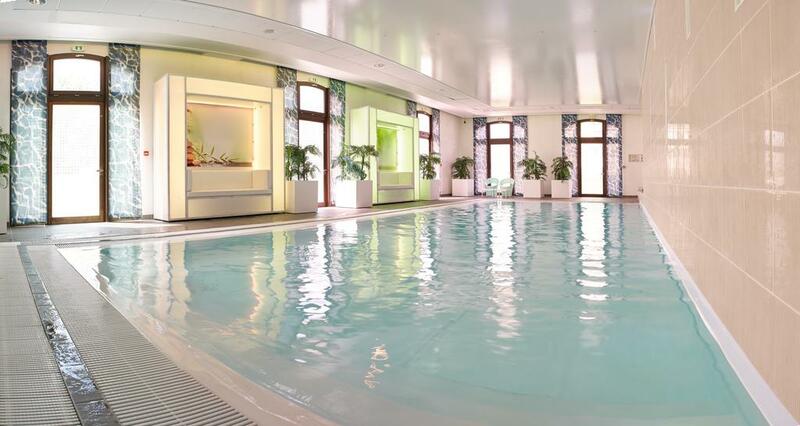 It features a fitness and spa center with sauna, hammam and massage treatments. 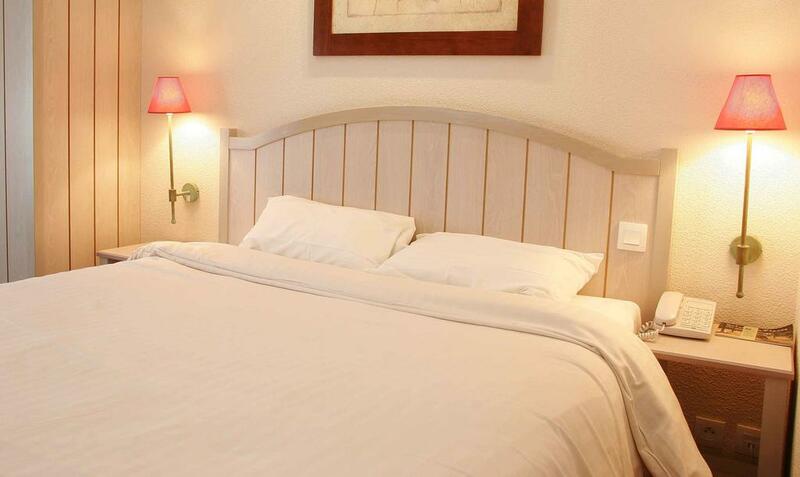 Each air-conditioned room is individually decorated and has luxury modern wooden furnishings in light colored tones. 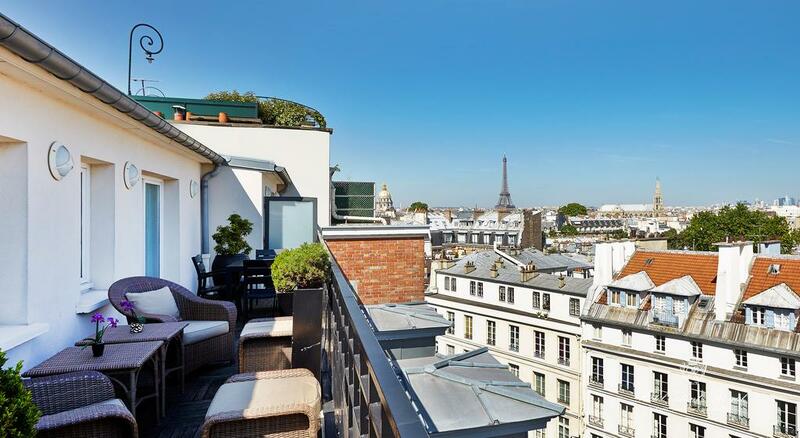 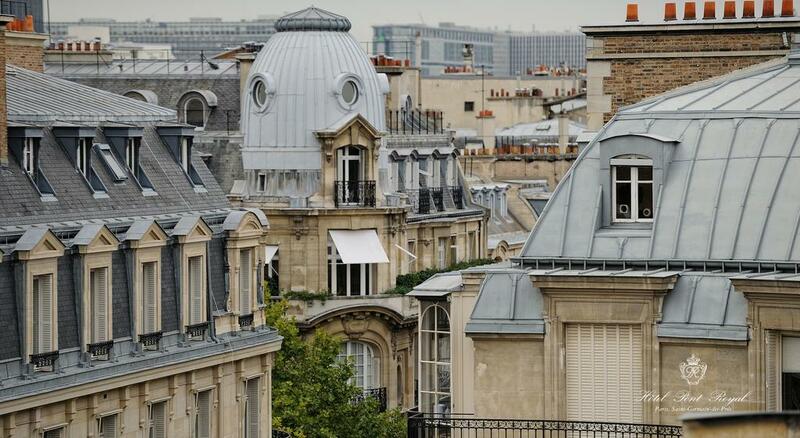 They have views over the Parisian Streets or the courtyard. 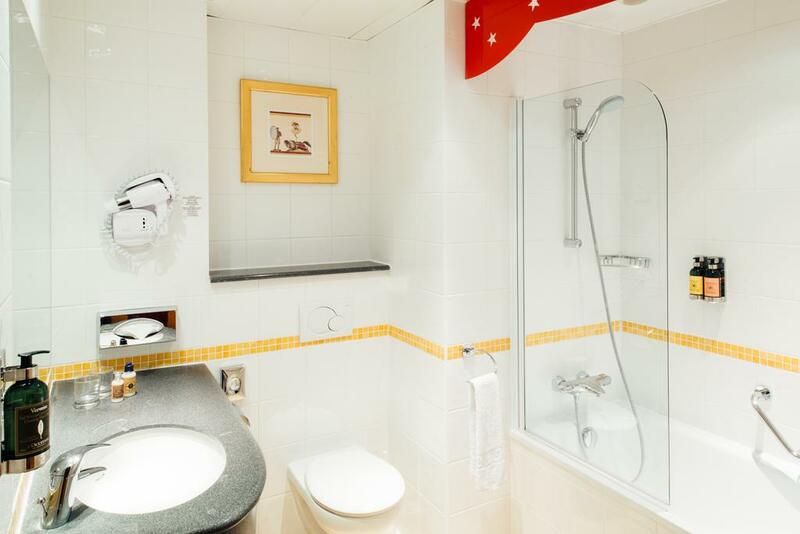 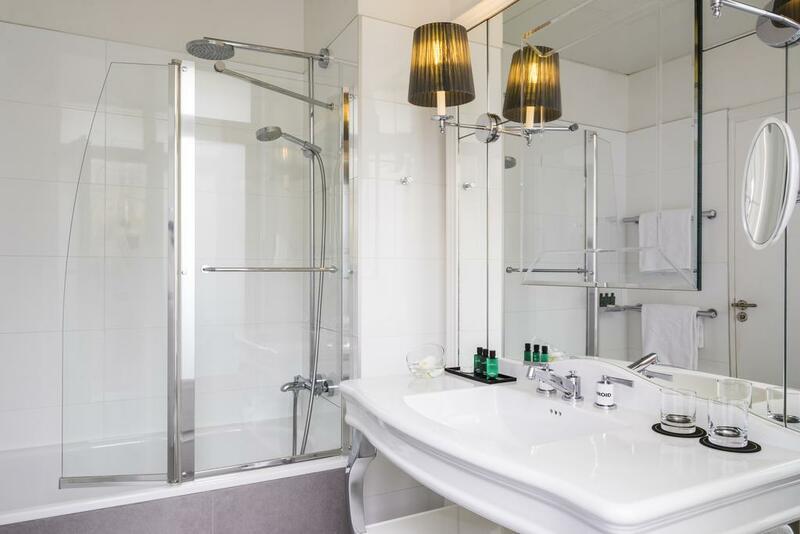 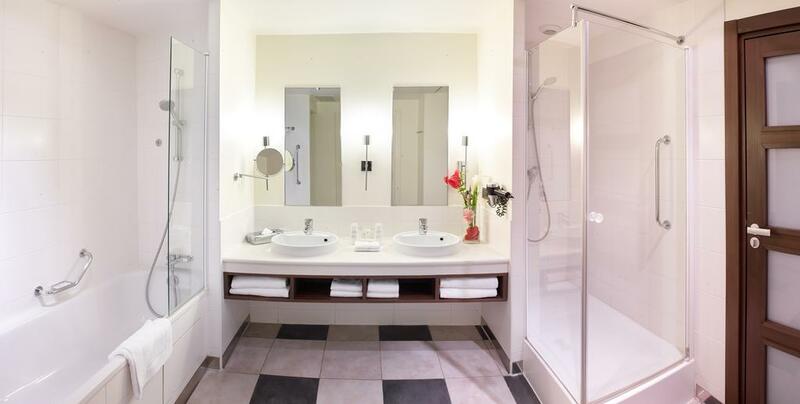 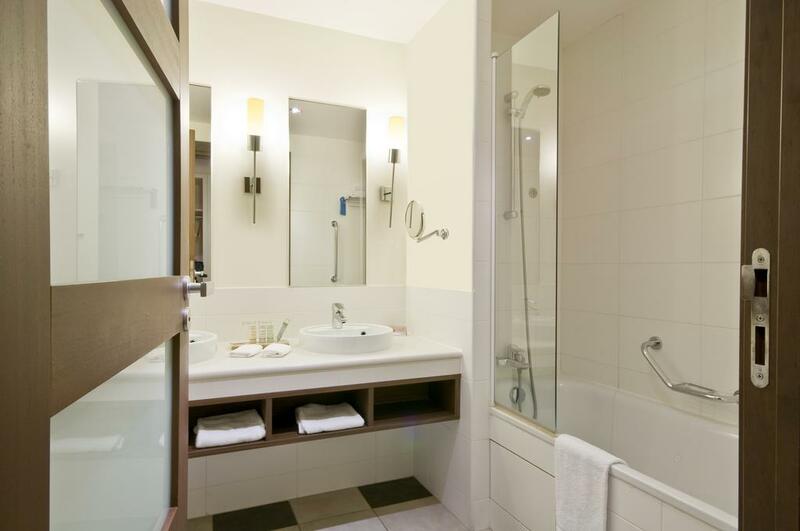 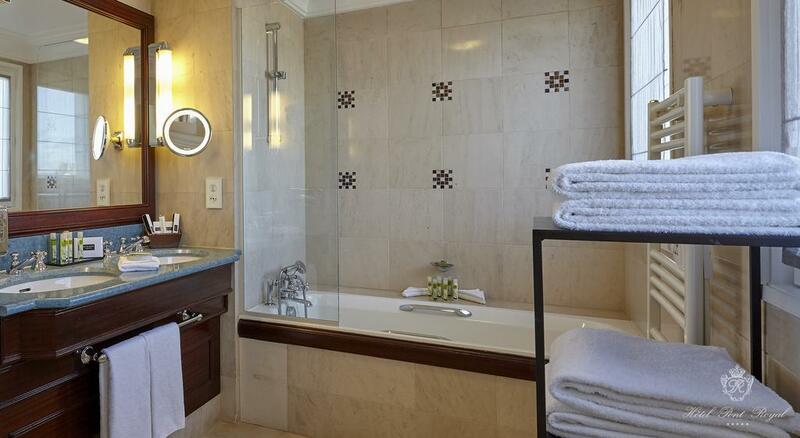 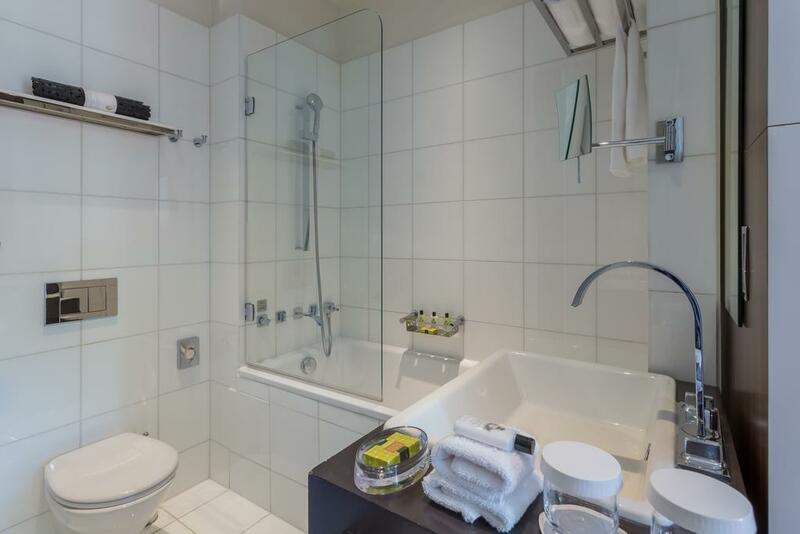 They also feature an private bathroom with a bathtub, a hairdryer and free toiletries. 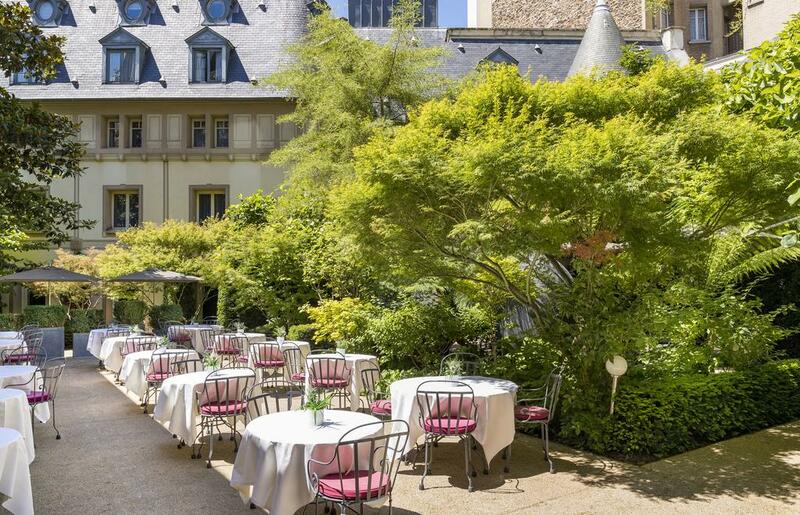 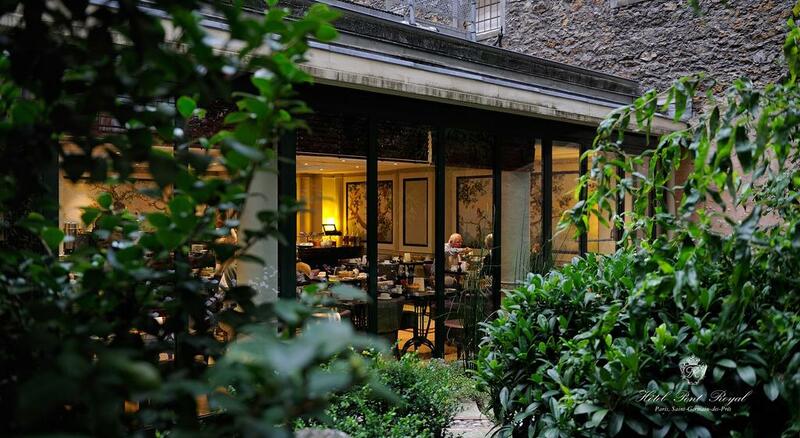 La Chinoiserie restaurant serves lunches prepared with seasonal produce and breakfast. 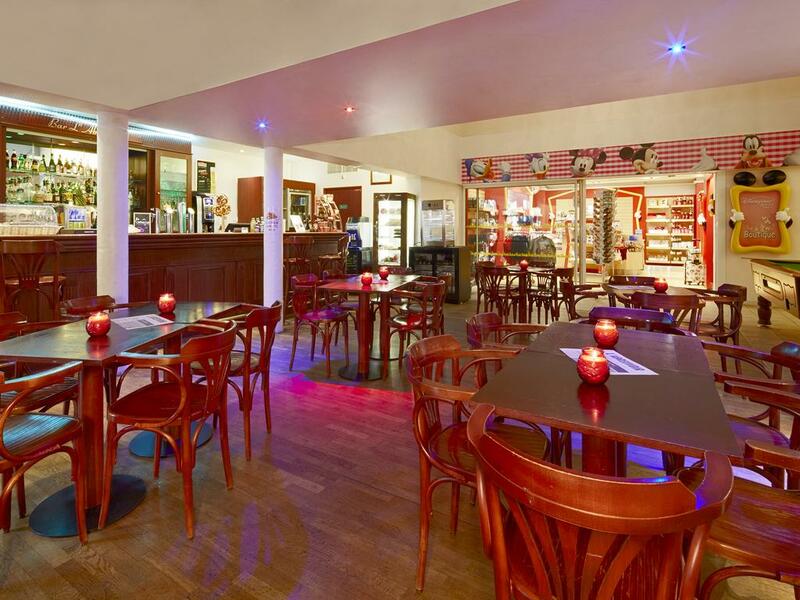 It also offers snacks and drinks. 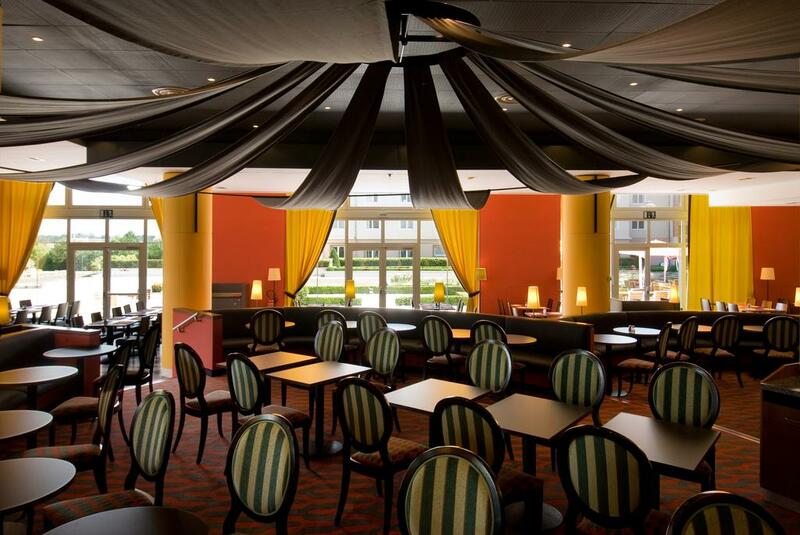 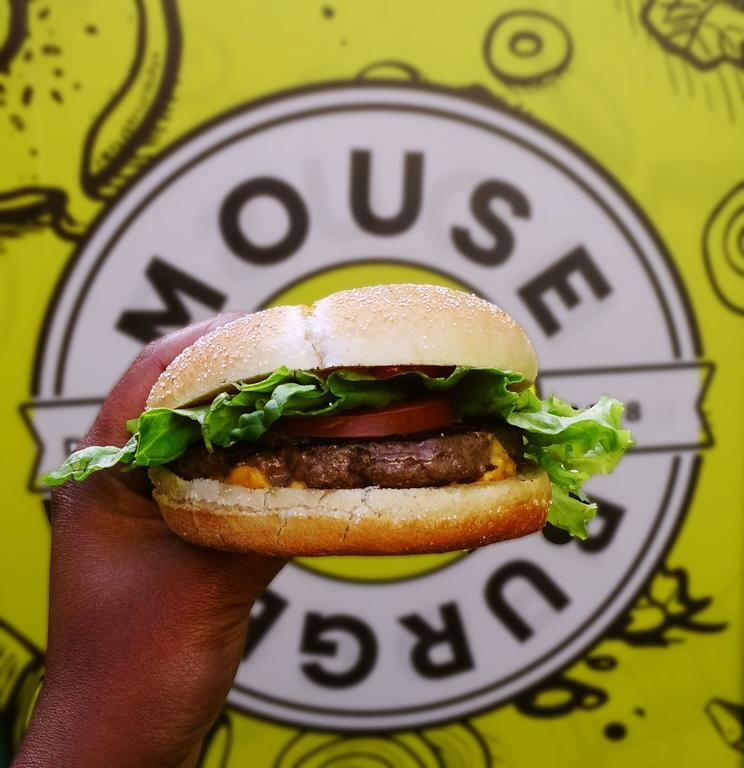 The Café M serves fresh, local cuisine and a gourmet dinner. 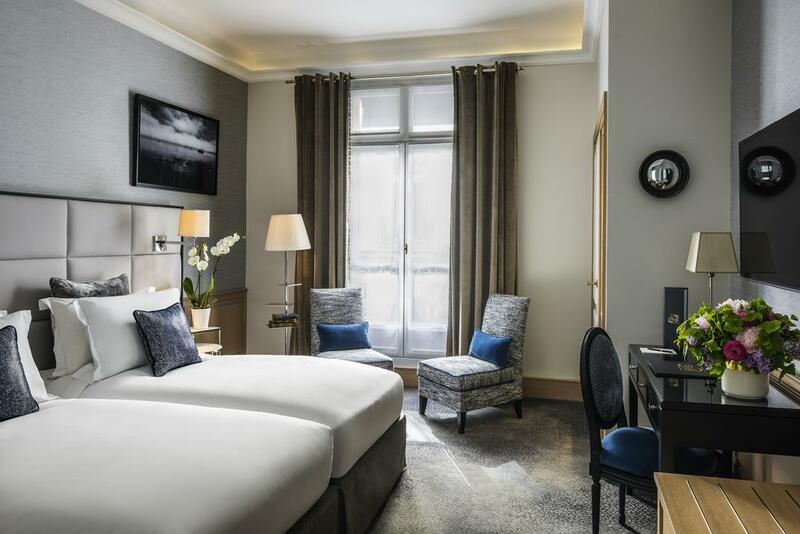 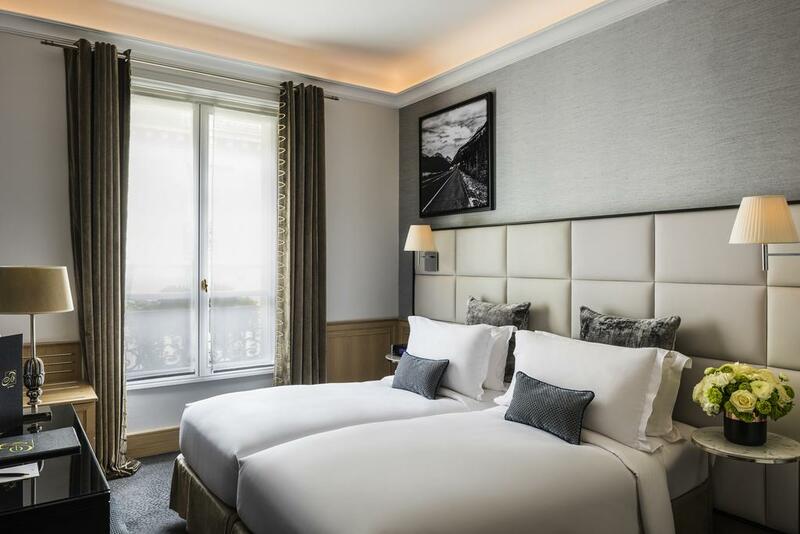 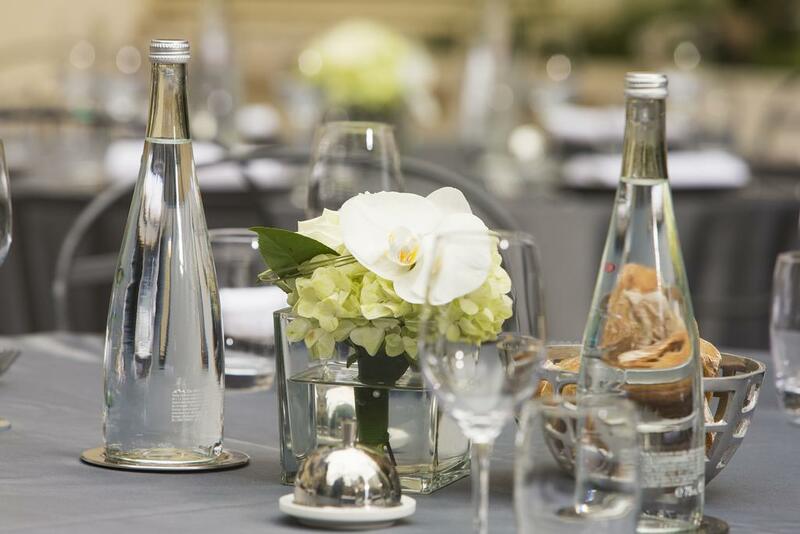 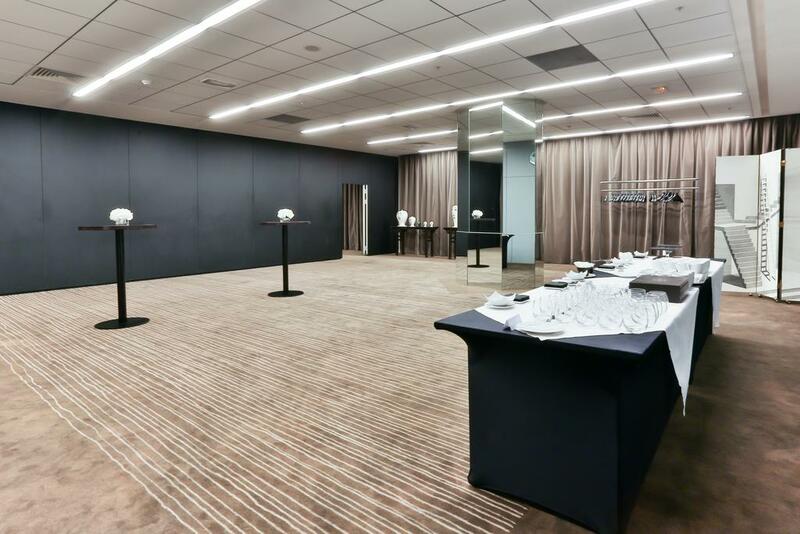 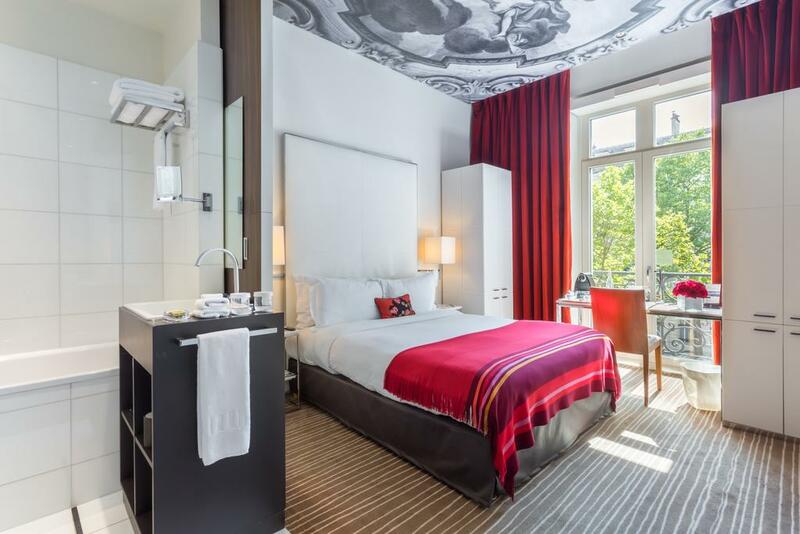 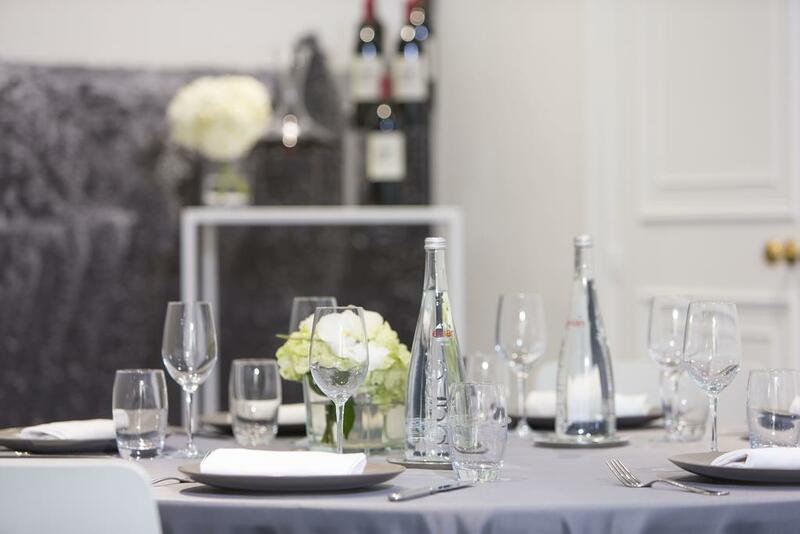 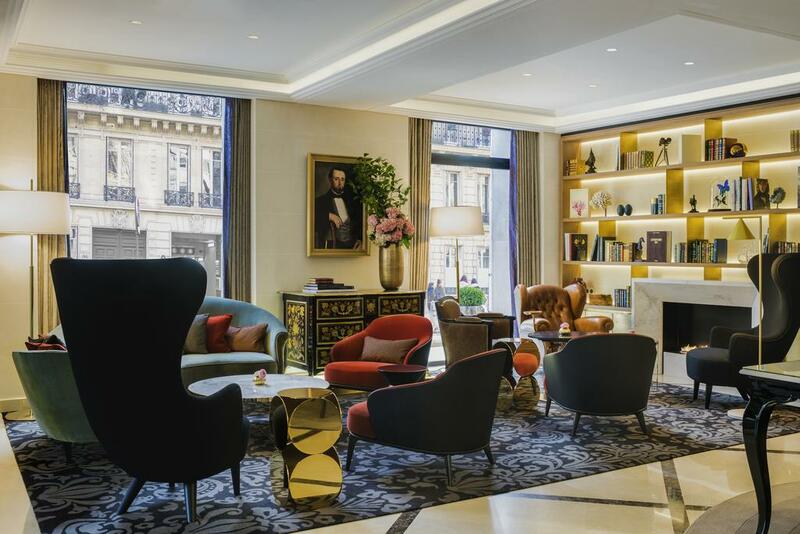 Hyatt Paris Madeleine is located a 5-minute walk from the famous shopping district Boulevard Haussmann, and 10-minutes from the Champs-Élysées. 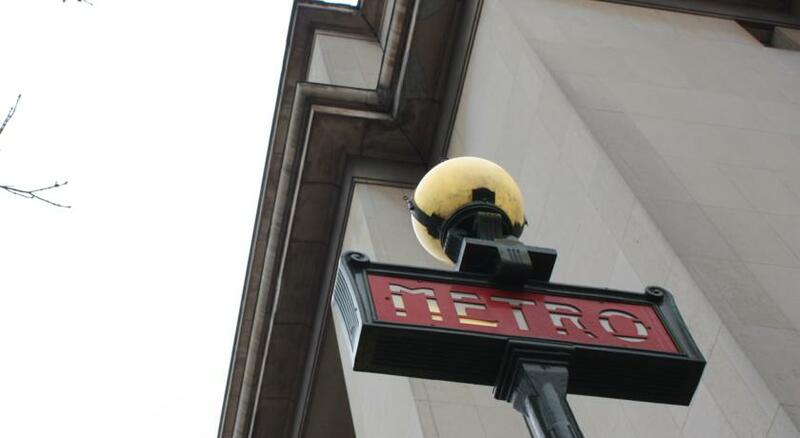 Saint-Augustin Metro Station is 500 m from the hotel, giving guests access to all of Paris’s famous sites. 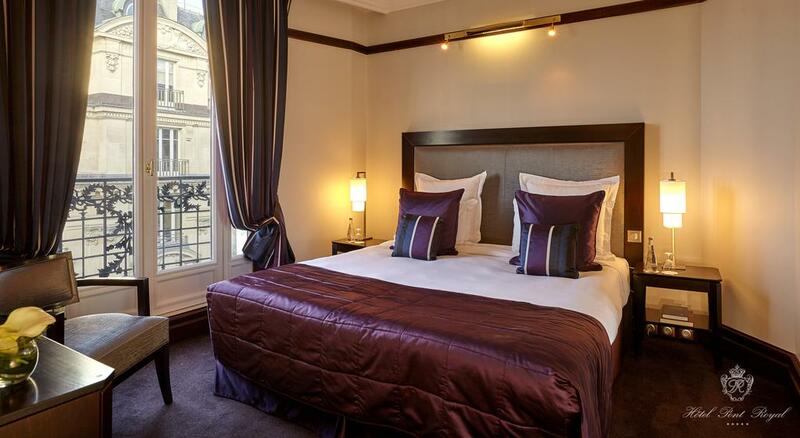 This is our guests’ favorite part of Paris, according to independent reviews. 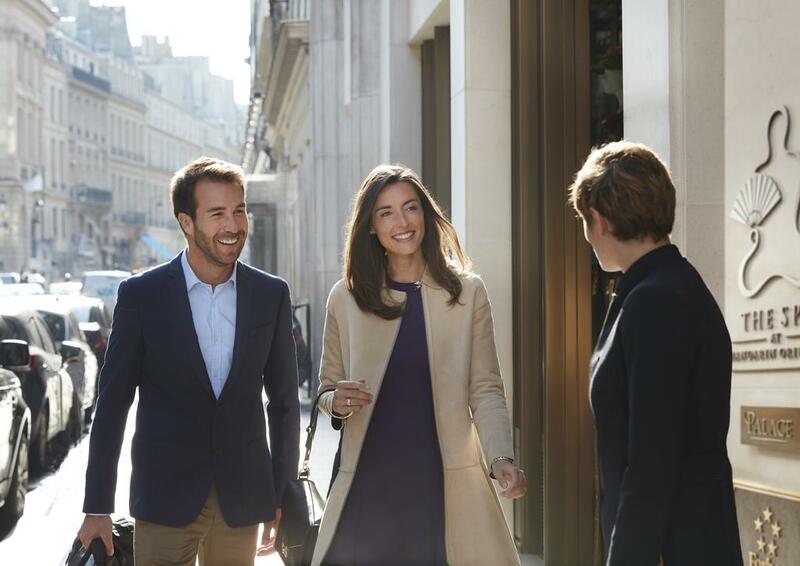 In this area you can shop ’til you drop for popular brands like Gucci, Hermès, Ralph Lauren, Chanel, Burberry. 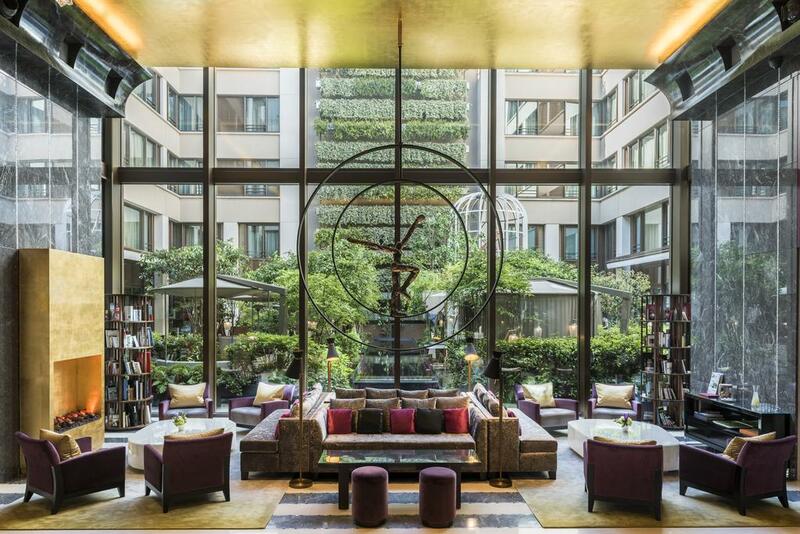 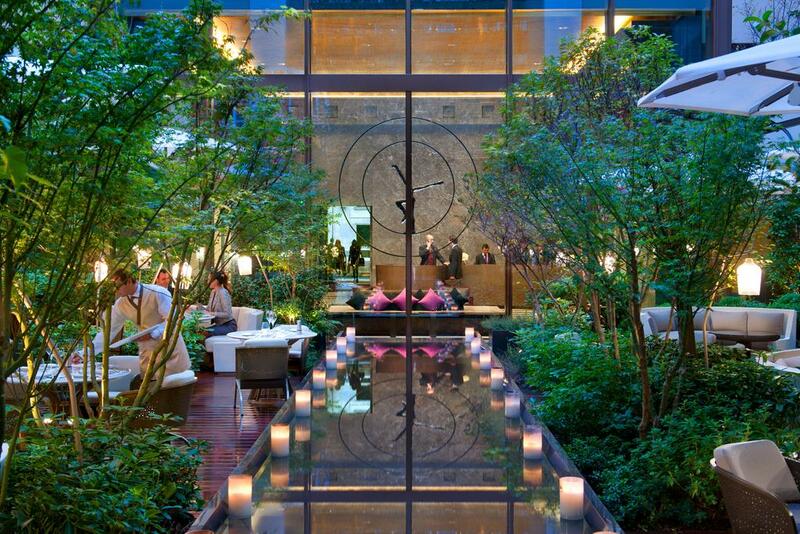 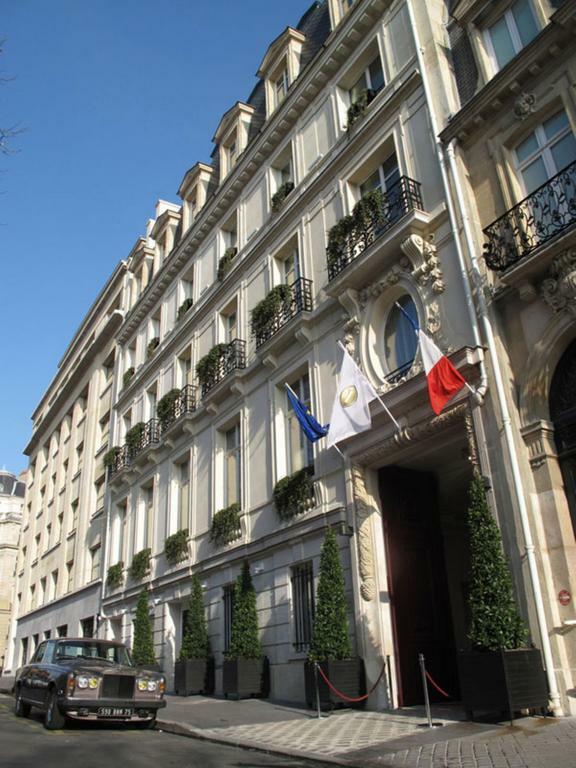 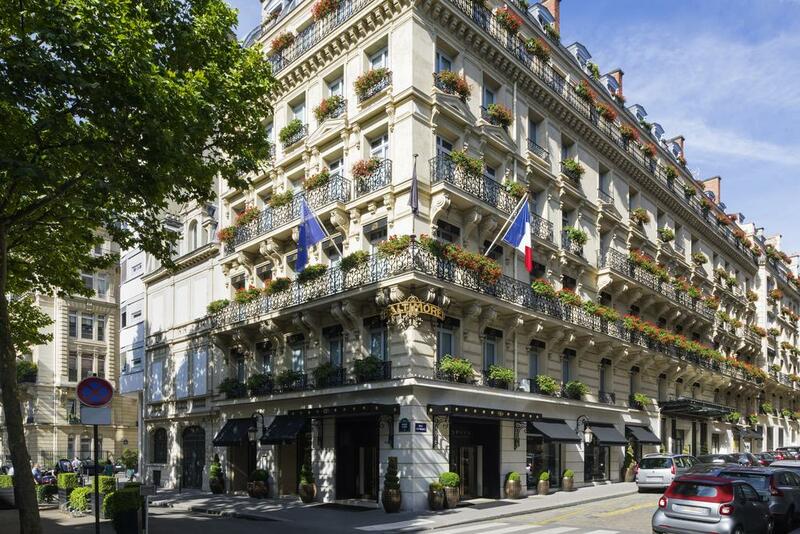 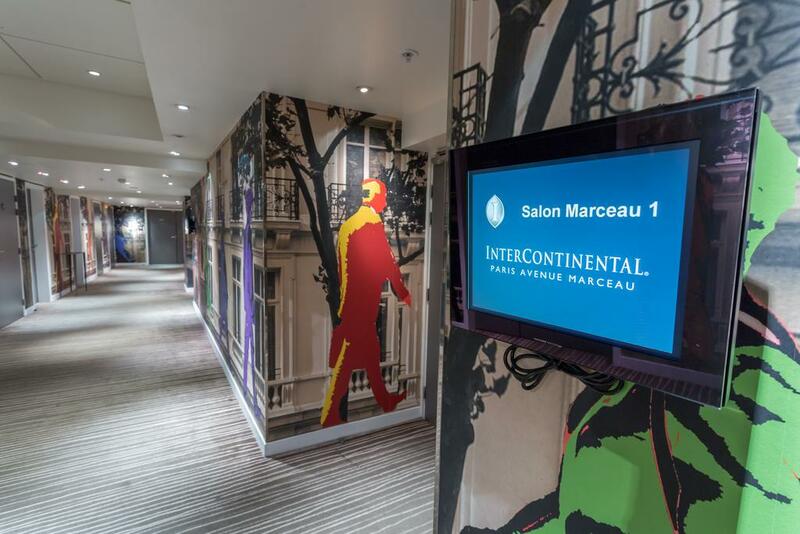 This InterContinental is located in central Paris, 199 m from the Champs-Elysées. 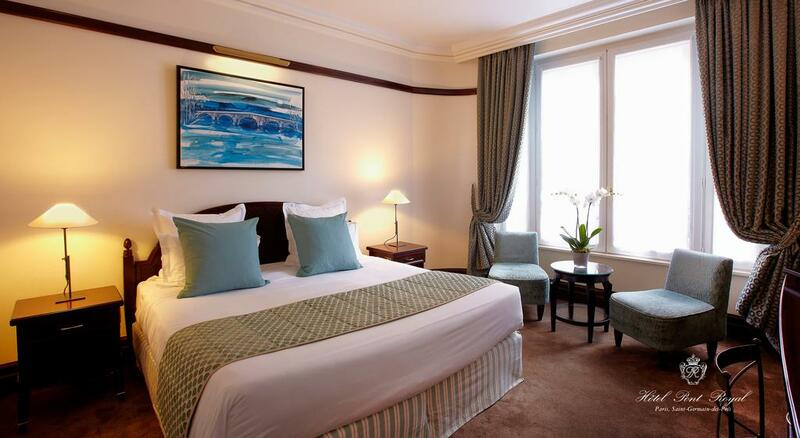 It has contemporary designed air conditioned guest rooms with LCD satellite TV, an iPod docking station and free Wi-Fi. 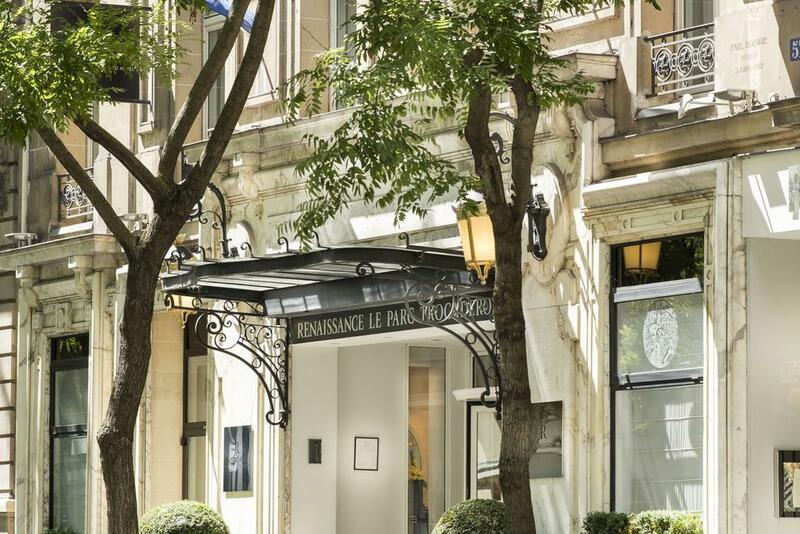 The InterContinental is situated 199 m from George V Metro, which offers a direct train to La Défense business area and the Louvre Museum. 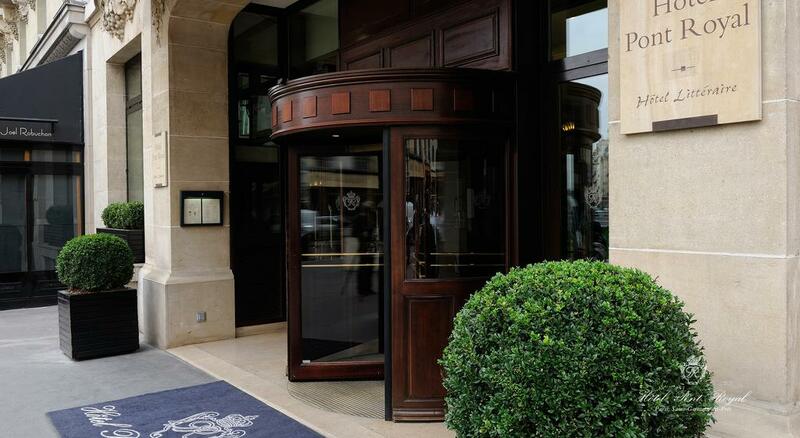 The Arc Triomphe is a 5-minute walk from the hotel. 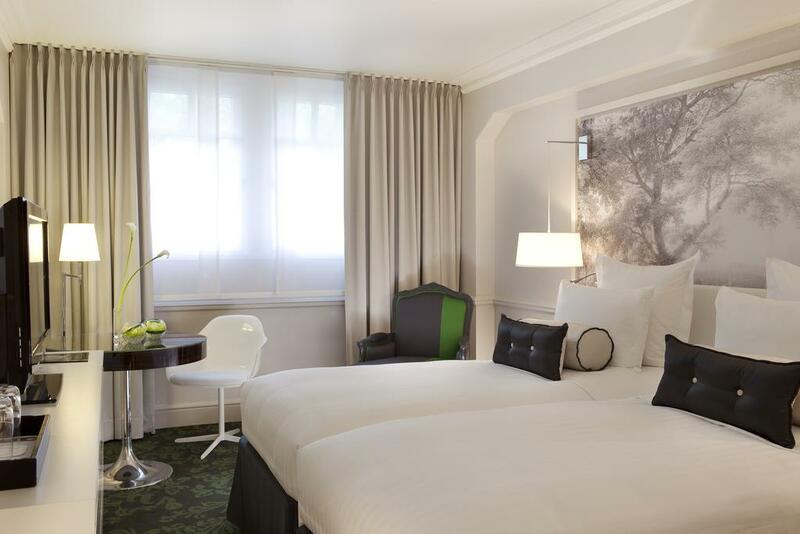 This is our guests’ favorite part of Paris, according to independent reviews. 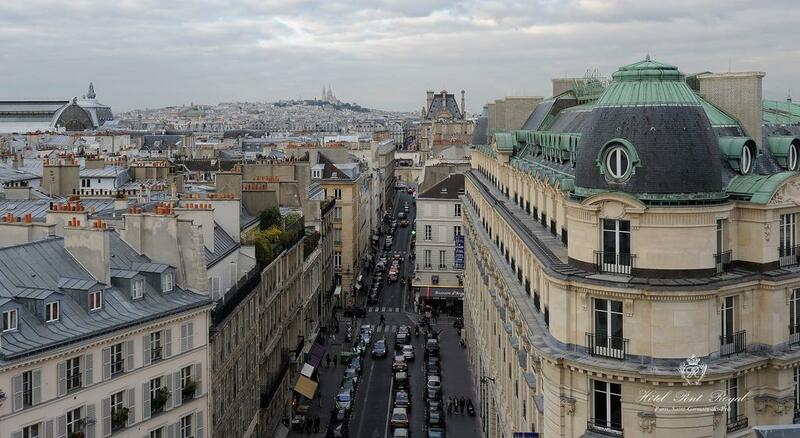 In this area you can shop ’til you drop for popular brands like Cartier, H&M, Chanel, Burberry, Louis Vuitton. 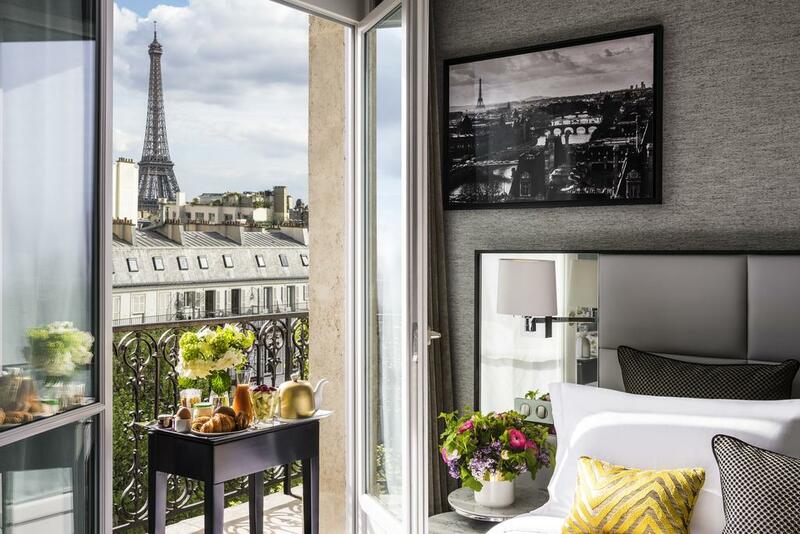 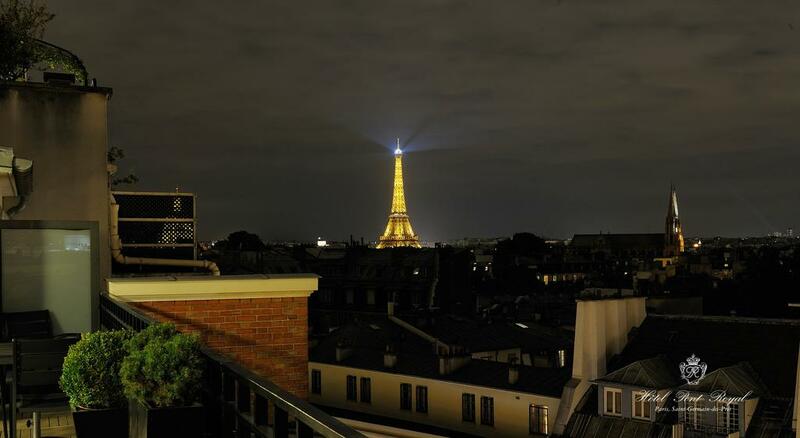 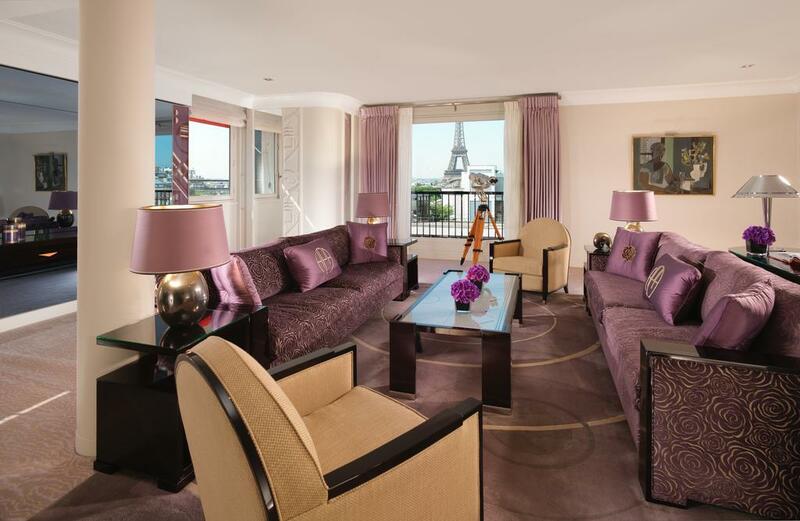 Renaissance Paris Hotel Le Parc Trocadero is a 10-minute walk from Trocadéro, offering one of the best views of the Eiffel Tower. 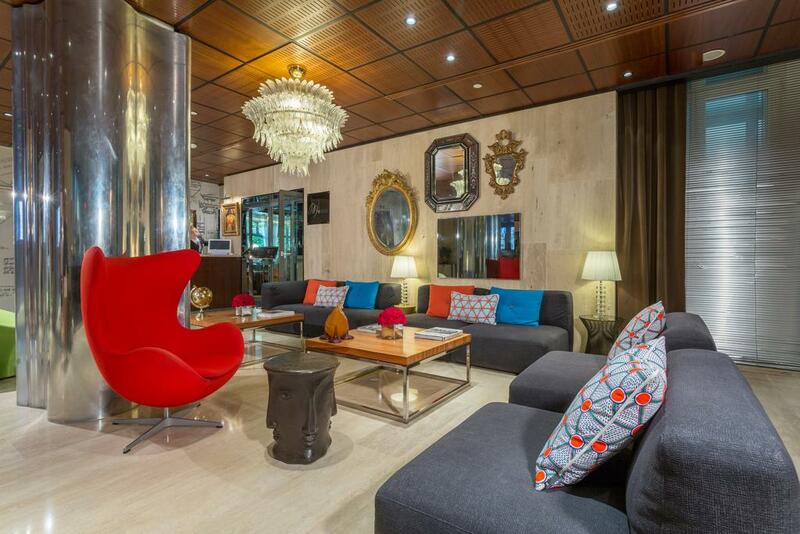 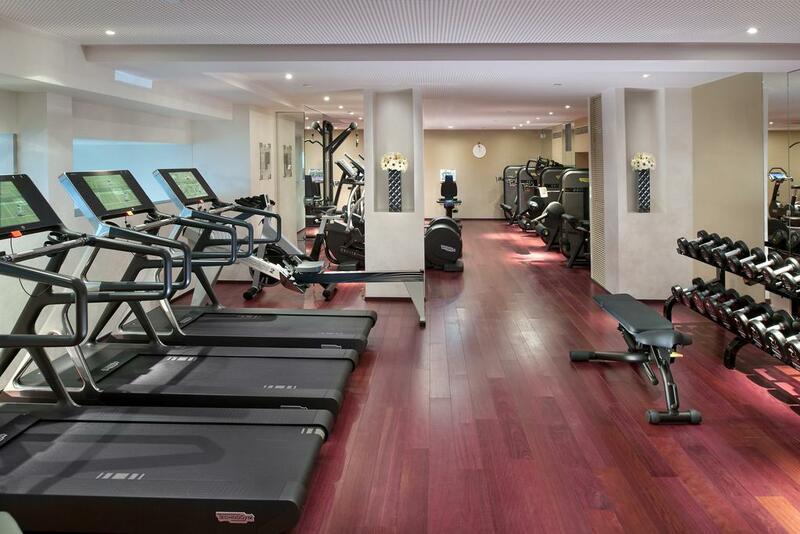 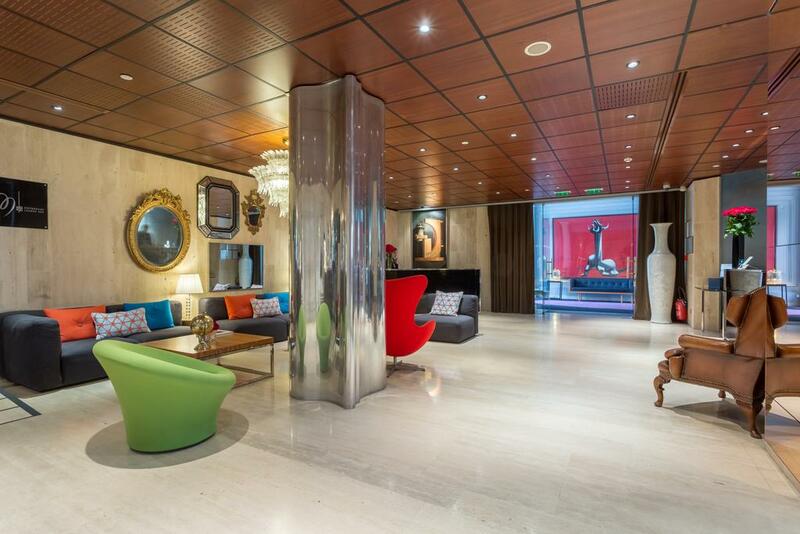 It offers a fitness center and an exceptional green courtyard of 3937 ft². 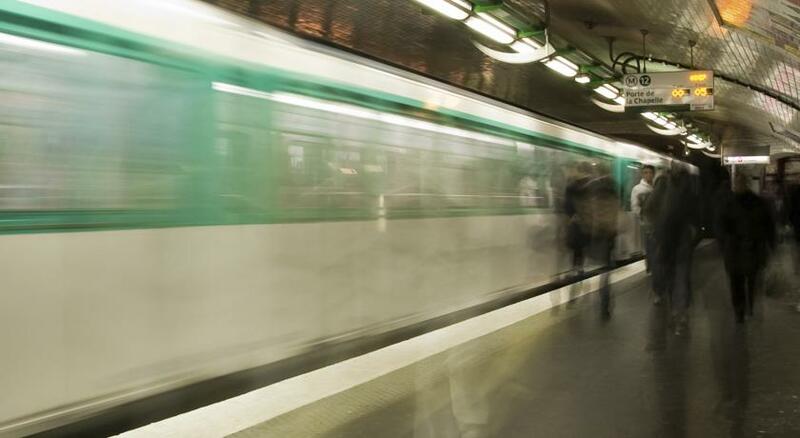 The Parc des Princes Stadium can be reached in 30 minutes on public transportation. 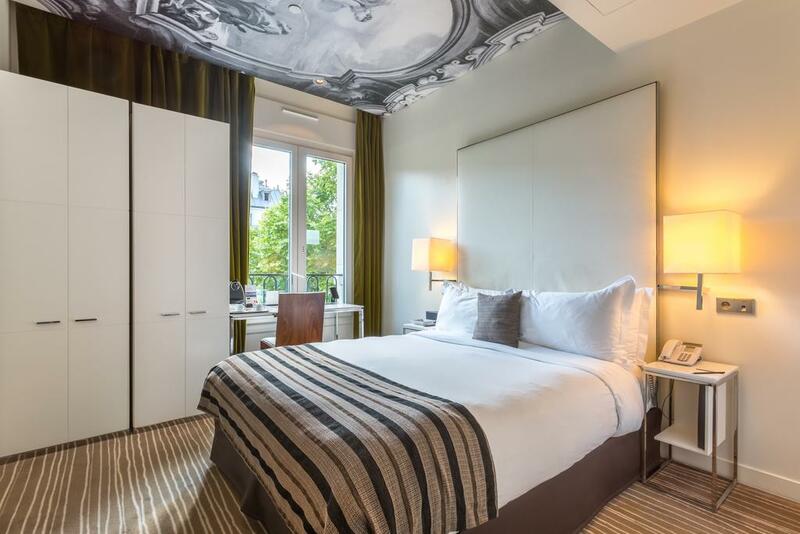 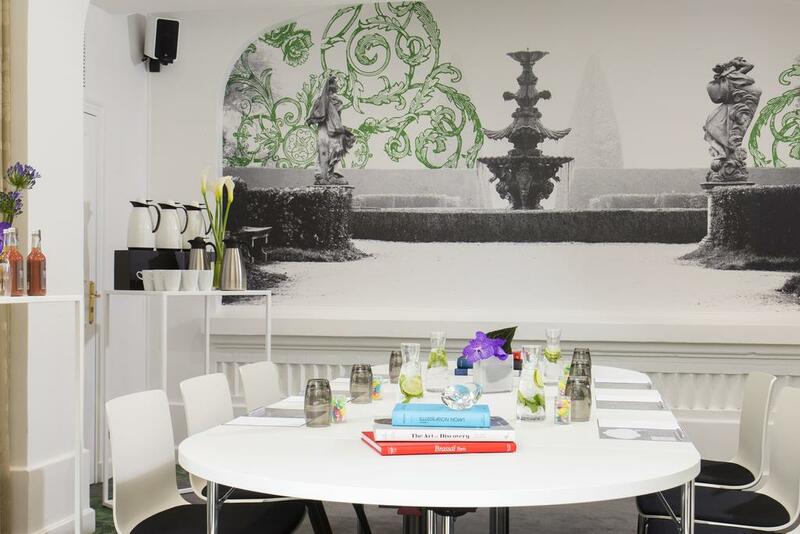 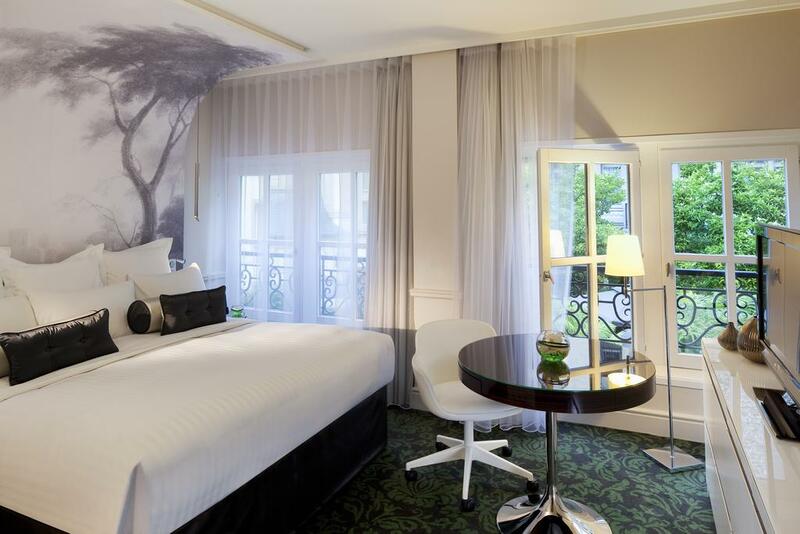 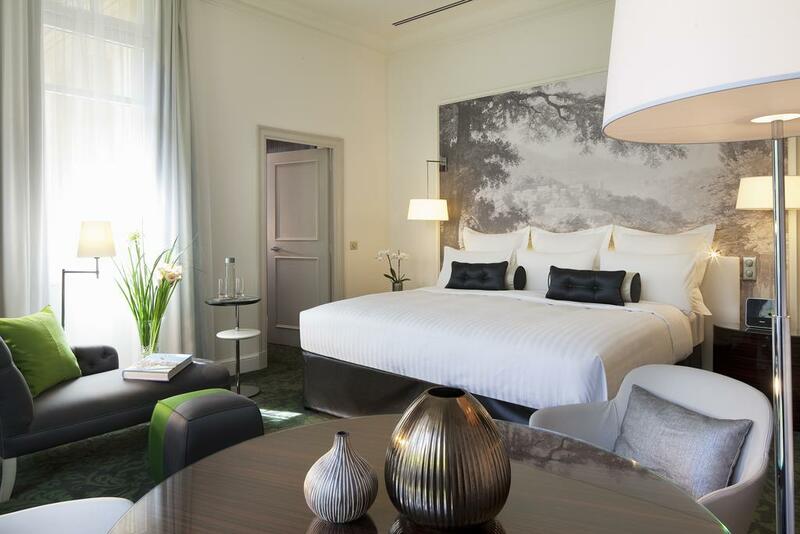 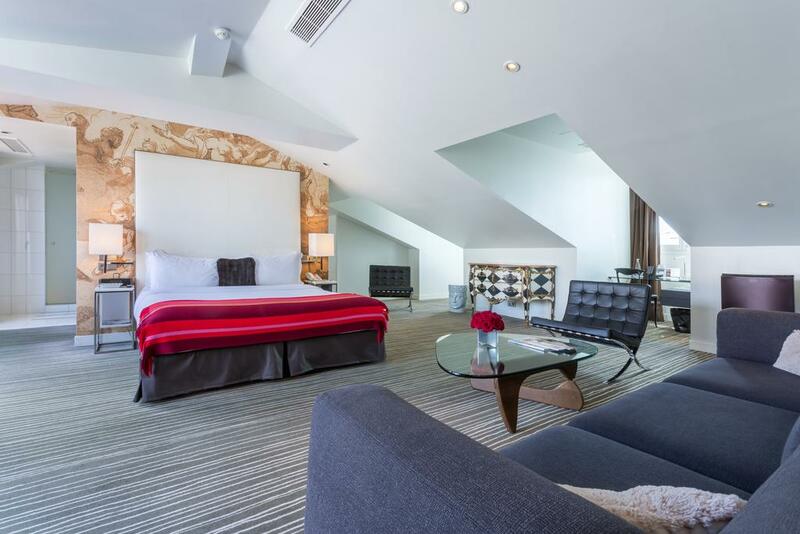 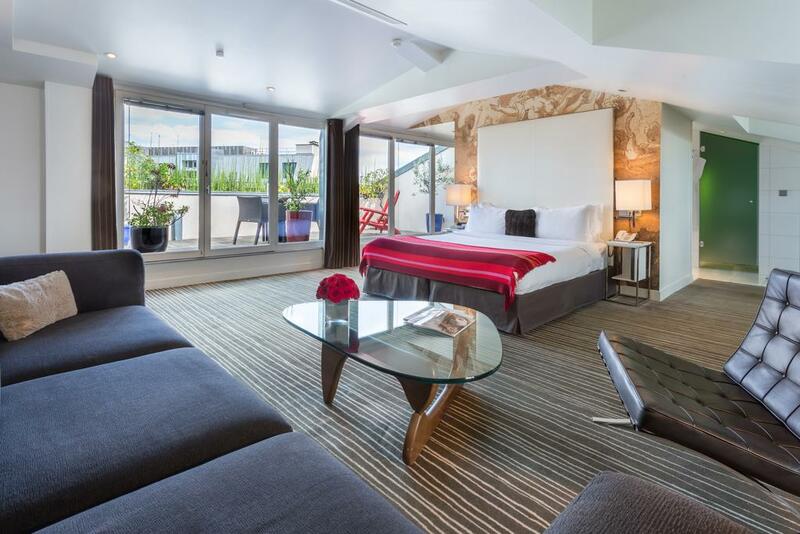 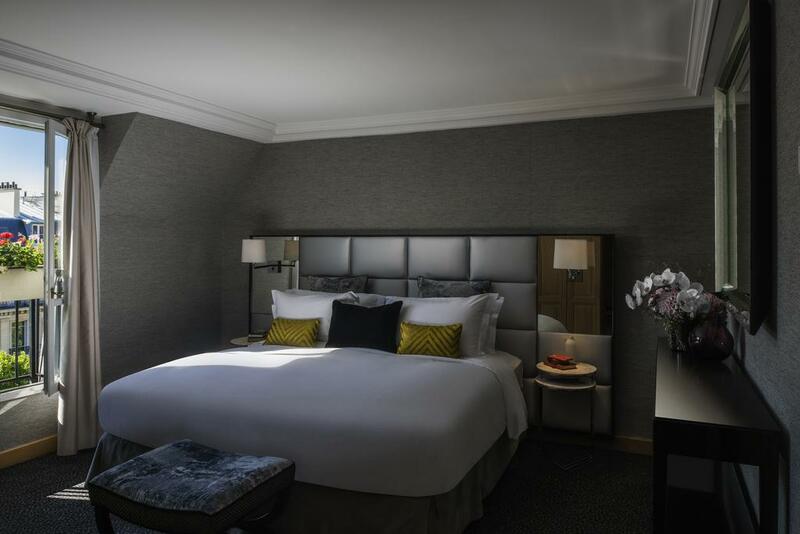 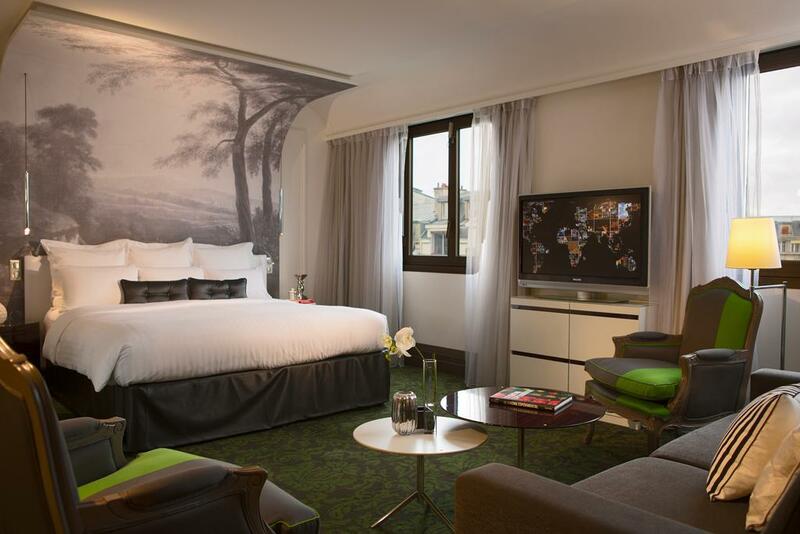 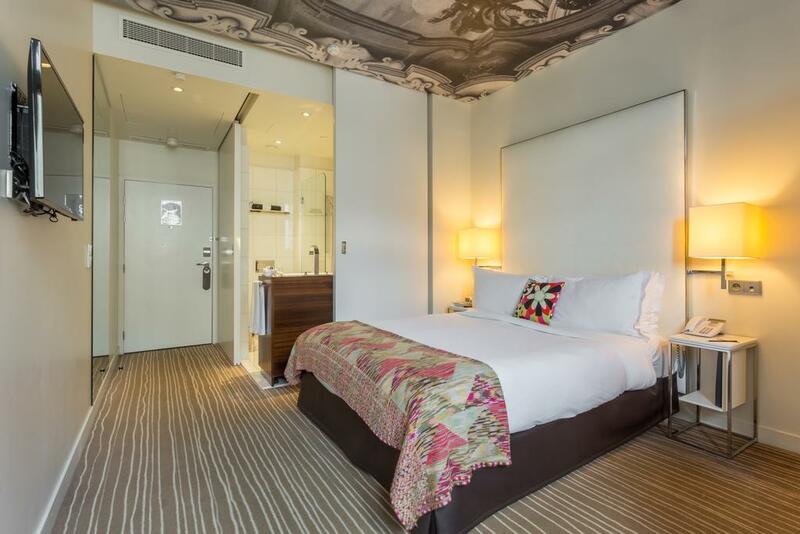 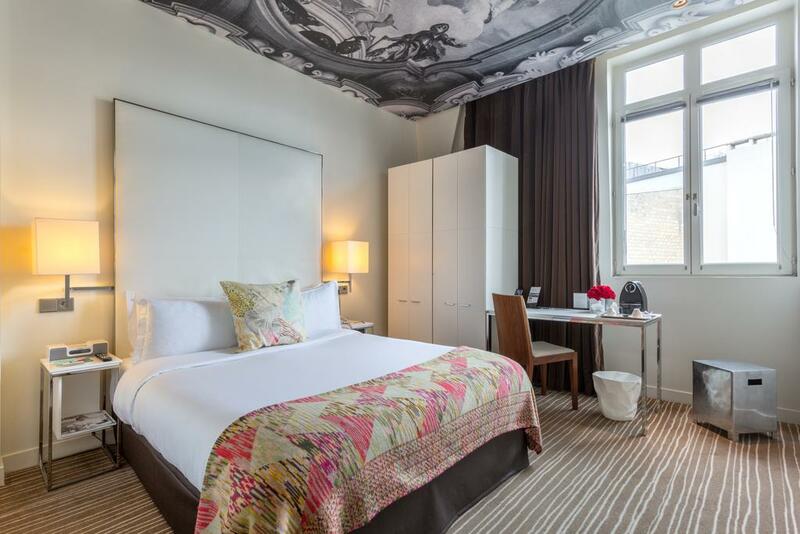 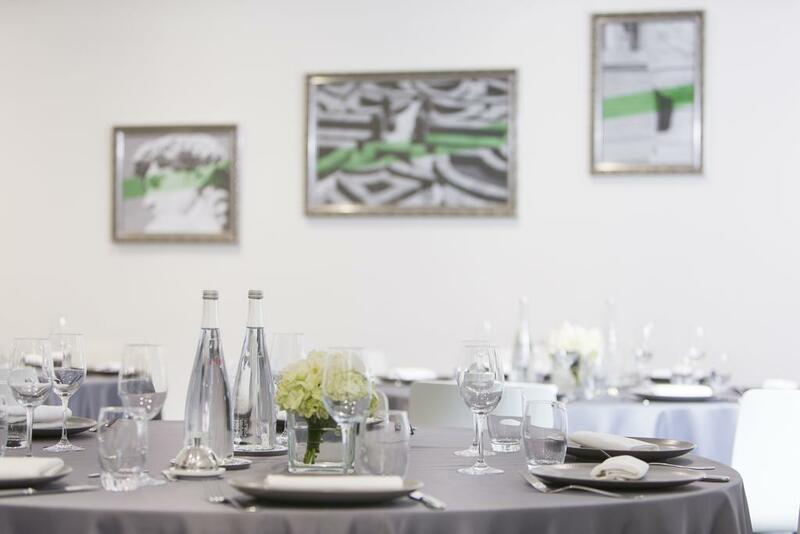 Combining a modern style and elegance, the rooms at Le Parc Trocadero feature light gray nature murals. 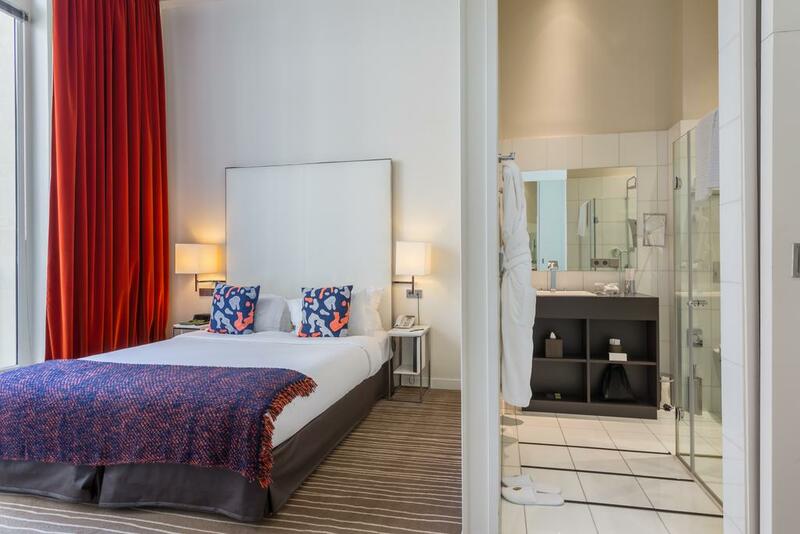 Overlooking the private garden or the street, all rooms are air-conditioned and offer a mini-bar, a courtesy tray and an LCD TV with international channels. 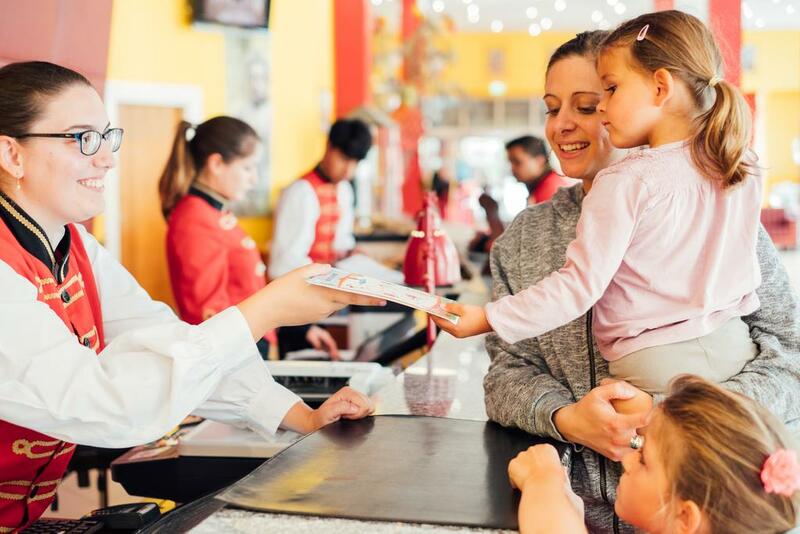 Breakfast is served daily and children up to 12 years old can enjoy breakfast for free. 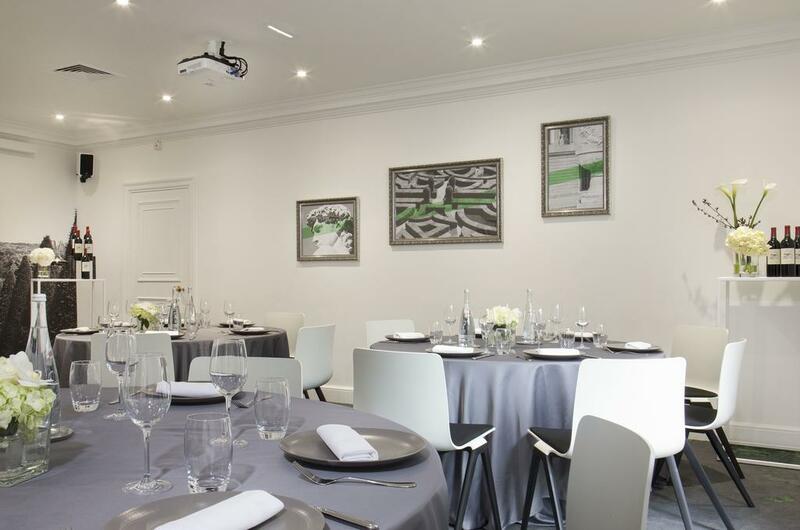 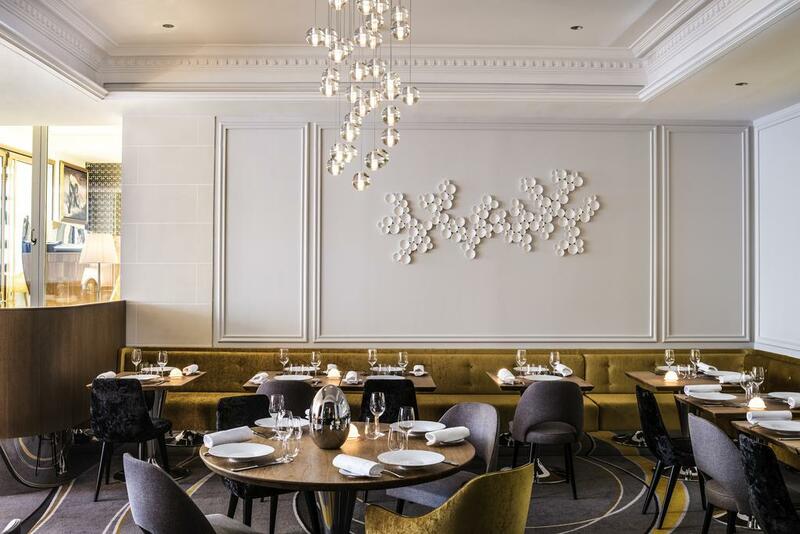 Le Relais du Parc restaurant serves gourmet-style dishes under the creative ceiling which features a black and white map of Paris. 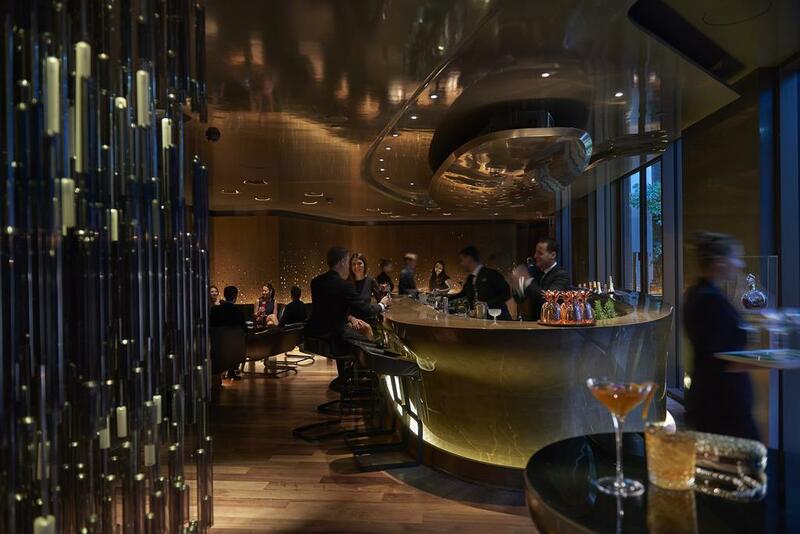 On the terrace, guests can enjoy a drink from the 21 types of gin available at G’Bar & Lounge, where live music can be enjoyed on Saturdays. 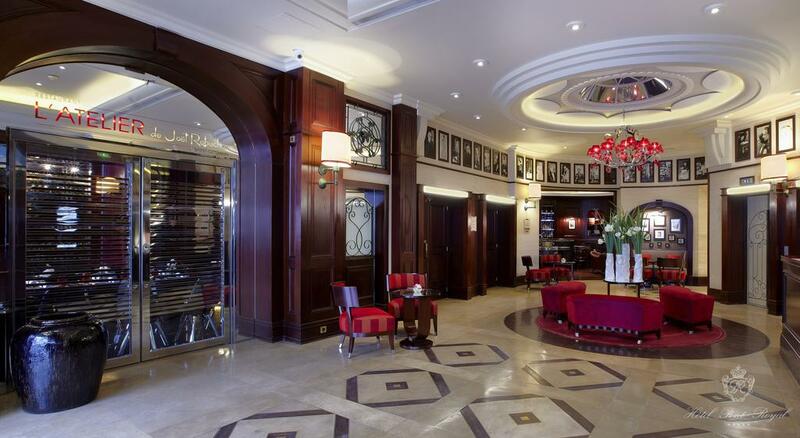 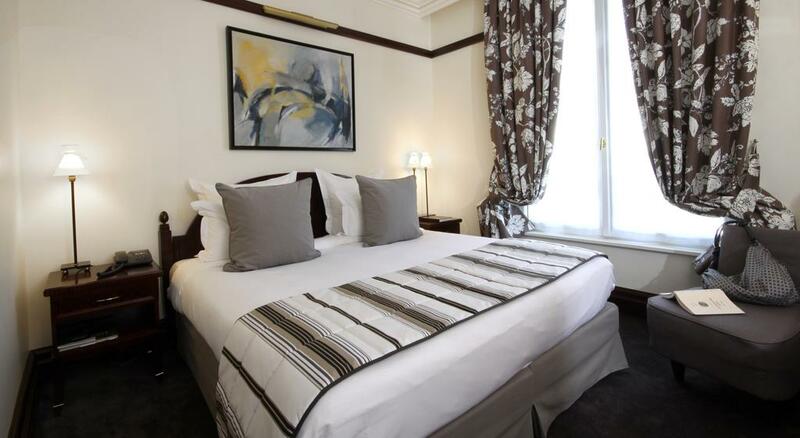 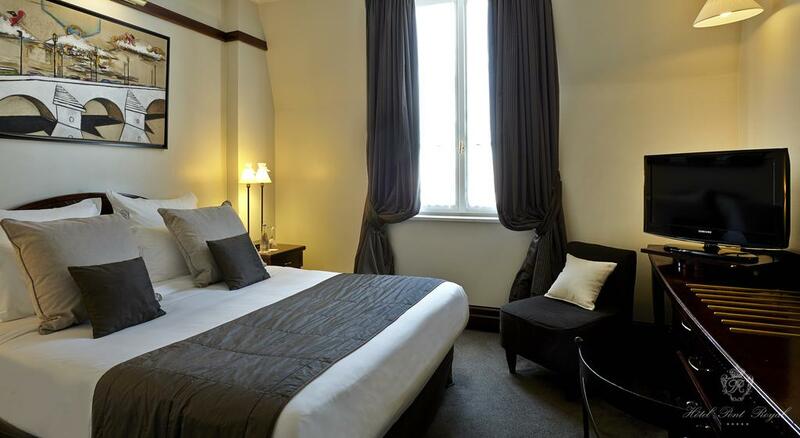 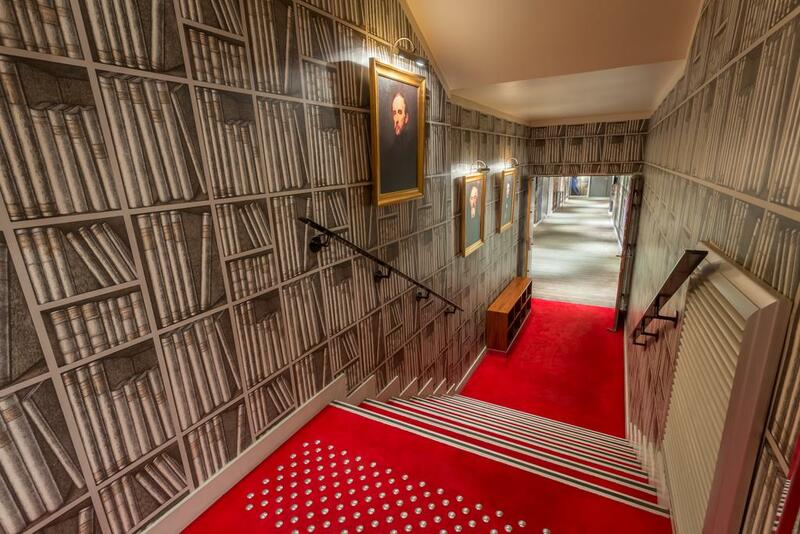 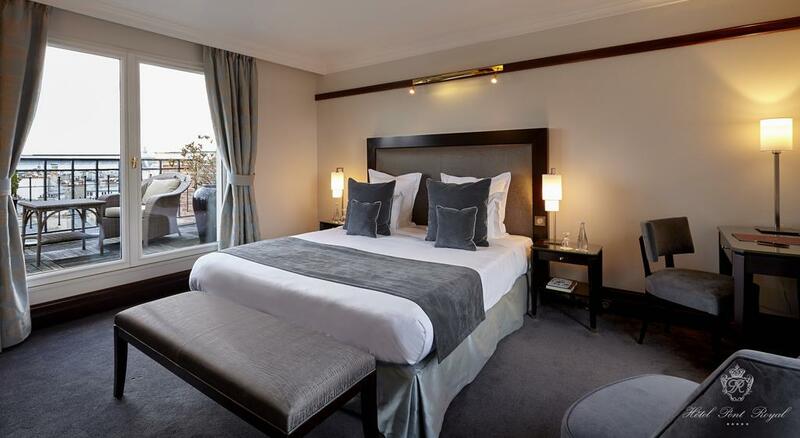 The hotel is a 10-minute walk from Avenue Foch which leads directly onto the Champs Elysées. 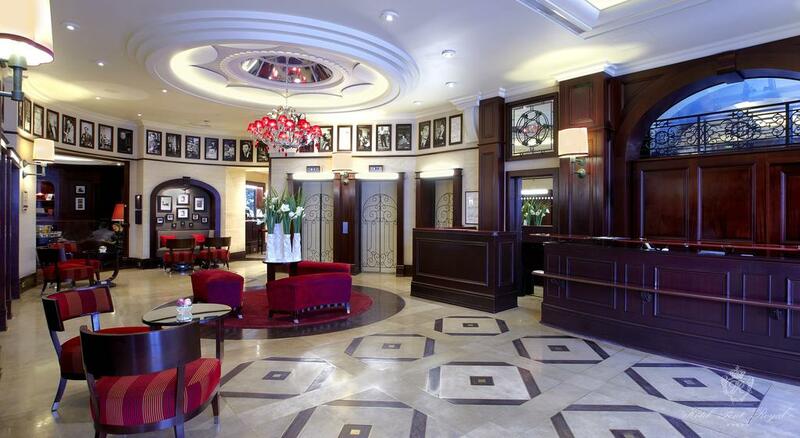 Parking is available at a location nearby and the hotel conveniently offers a valet service. 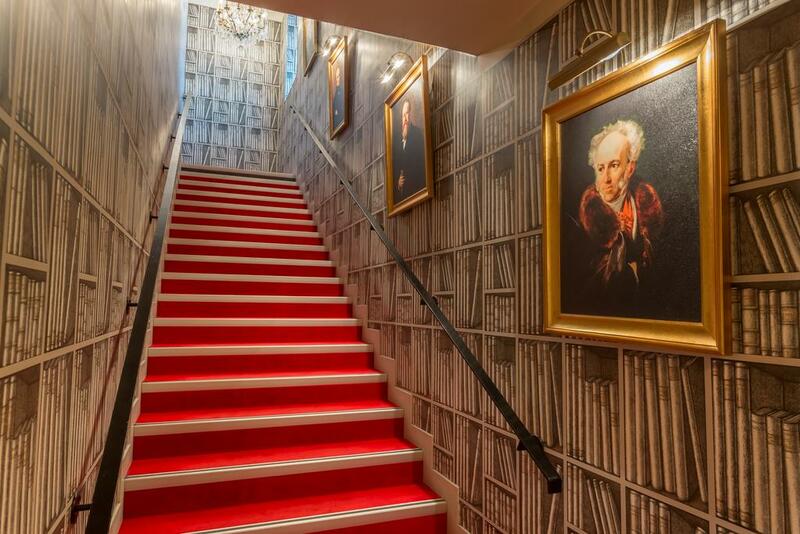 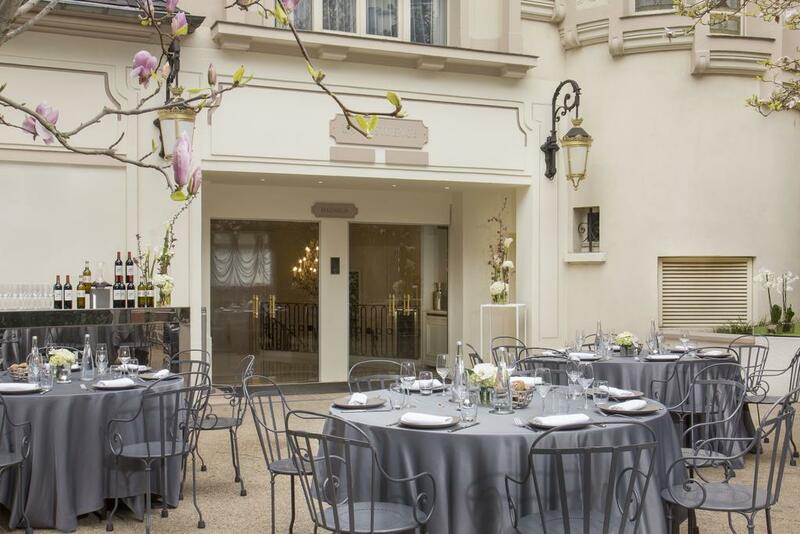 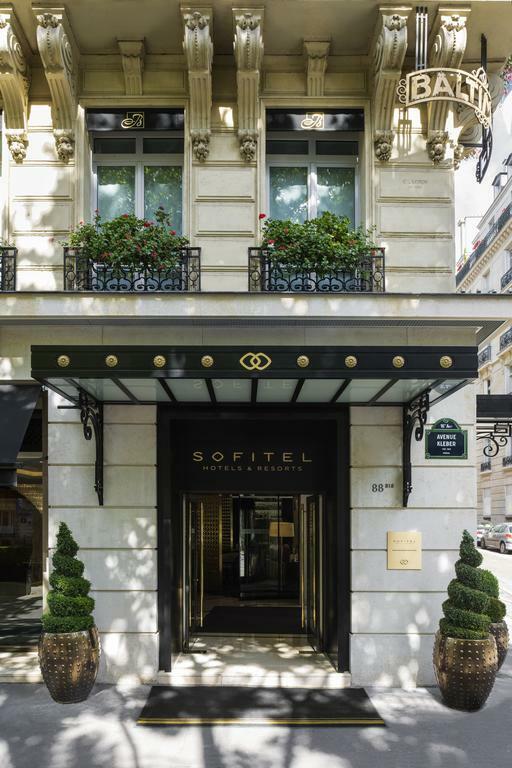 Offering a wrought-iron banister designed by Gustave Eiffel and a restaurant, Sofitel Paris Baltimore Tour Eiffel features free WiFi and is a 10-minute walk from Avenue Champs Elysées, 100 m from Boissière Metro Station and 3.3 mi from the Parc des Princes Stadium. 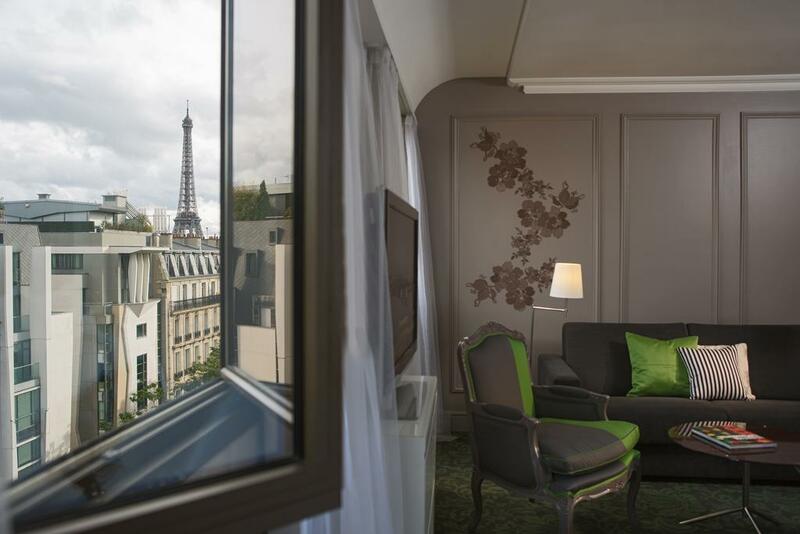 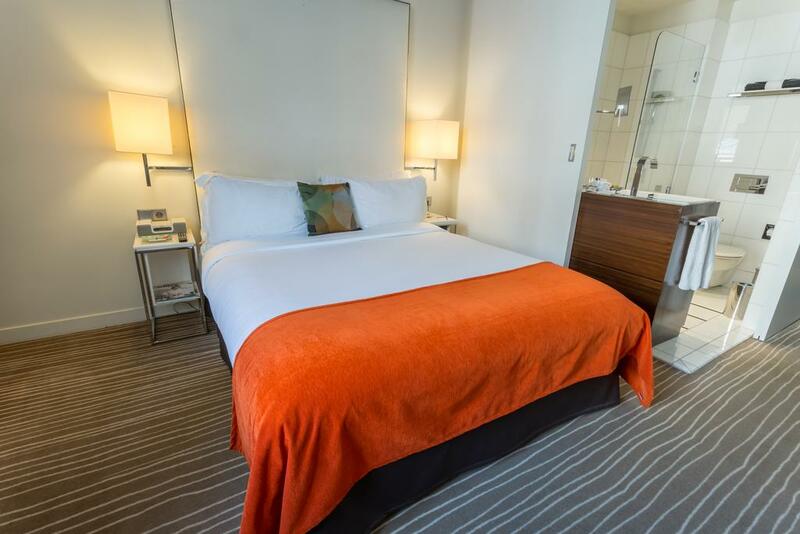 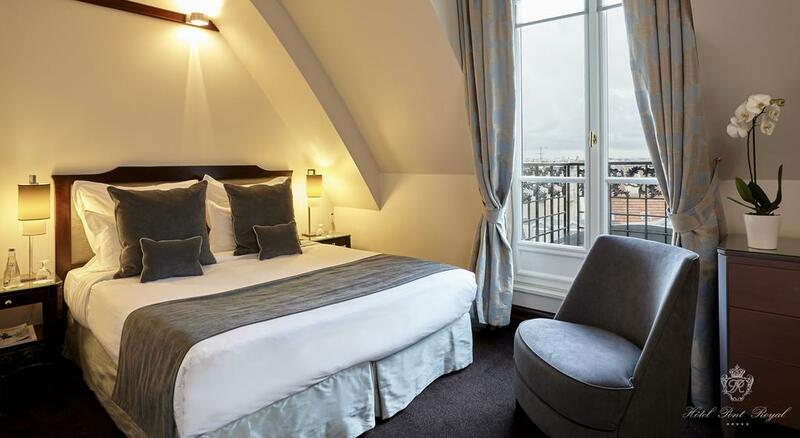 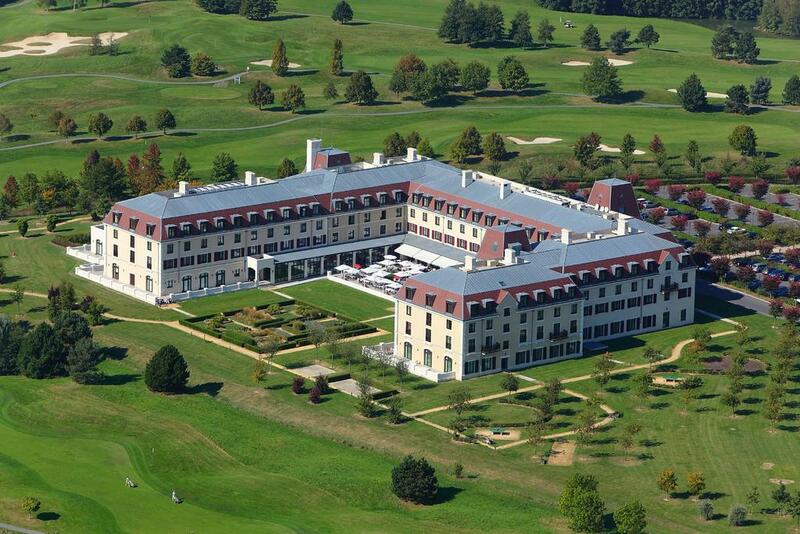 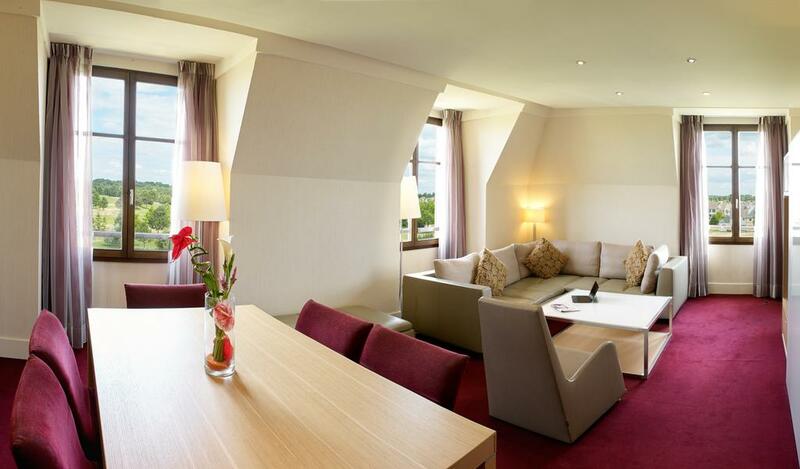 At Sofitel Paris Baltimore Tour Eiffel, the rooms and suites feature an elegant décor and large windows. 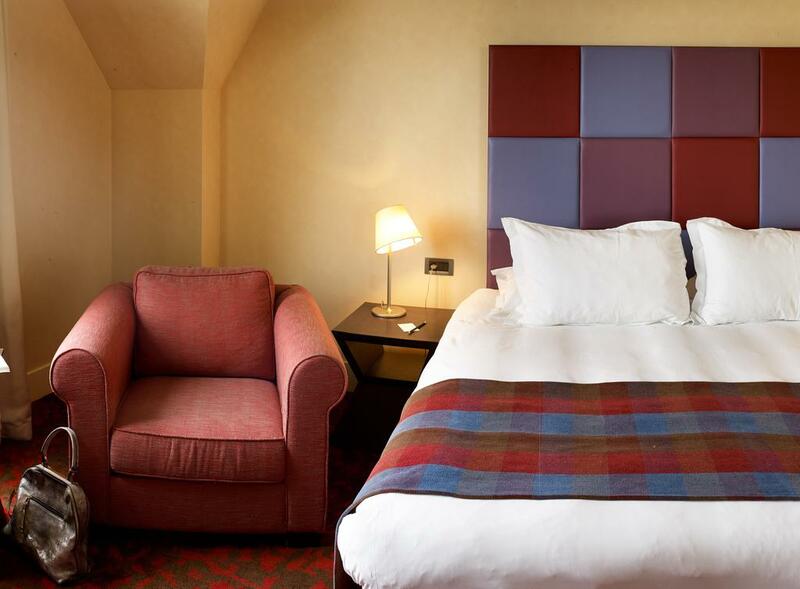 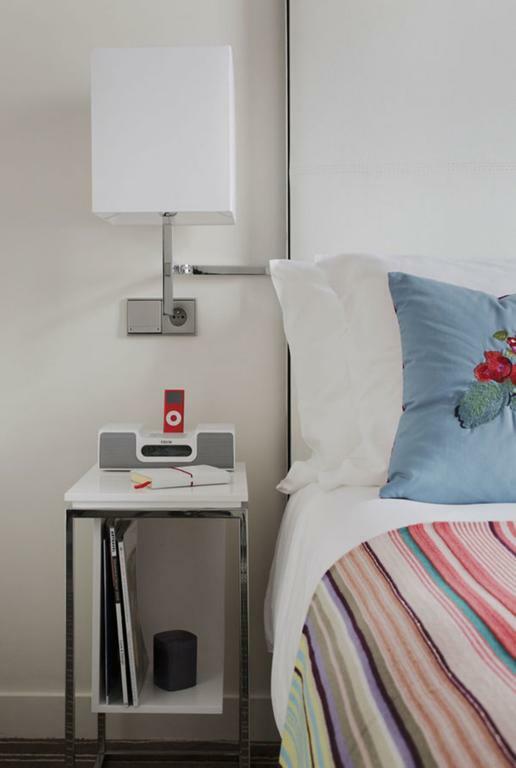 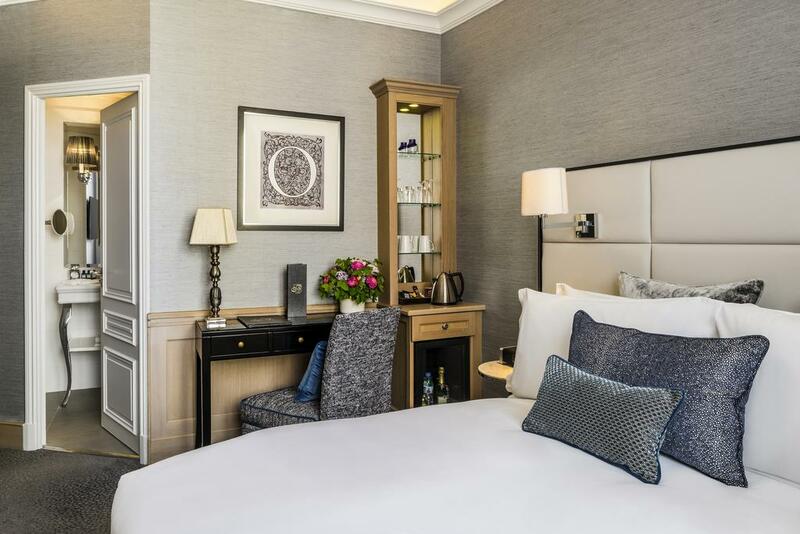 Each room also has a mini-bar, individual temperature control, a flat-screen TV with international channels and an iHome docking station, as well as tea and coffee making facilities. 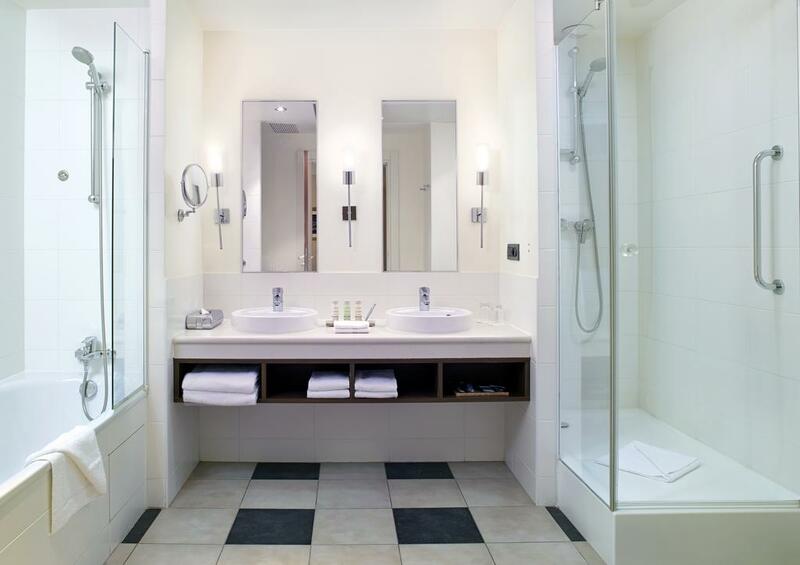 Bathrobes and slippers are provided in the bathrooms. 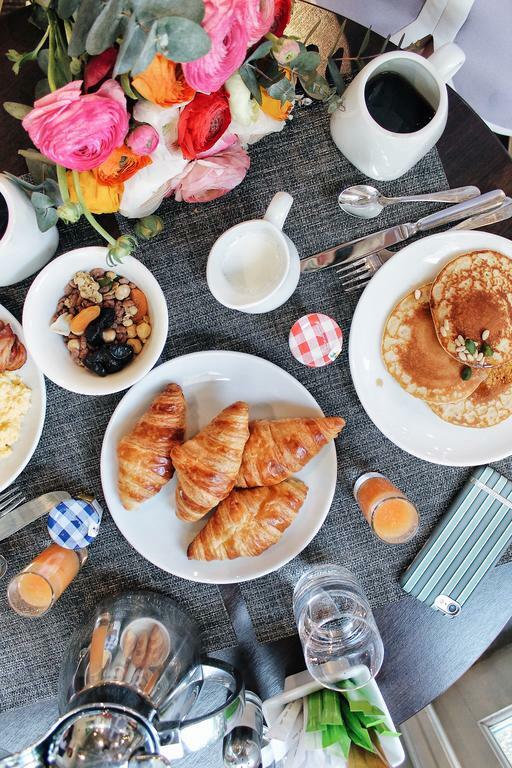 Breakfast is served every morning. 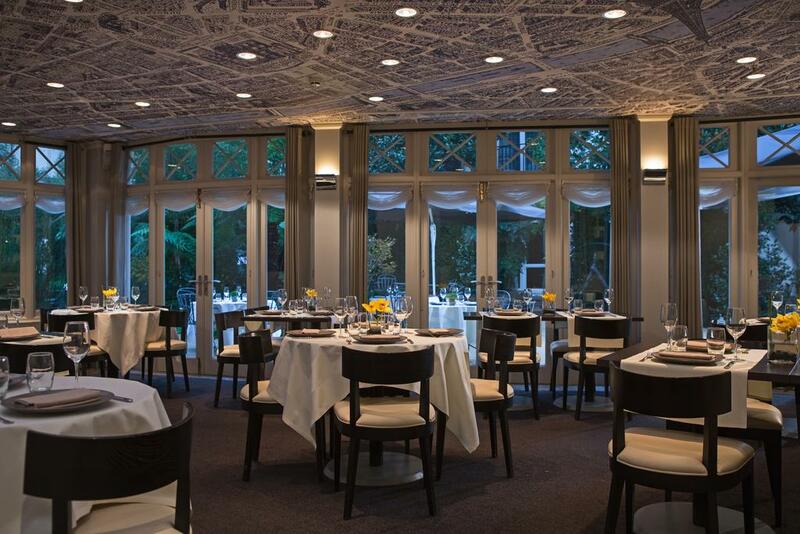 The hotel’s bistro restaurant, the Carte Blanche, also provides a large wine cellar. 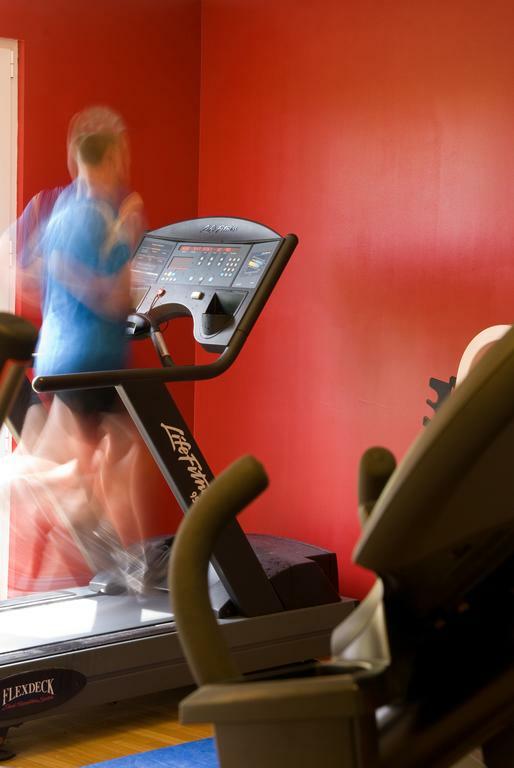 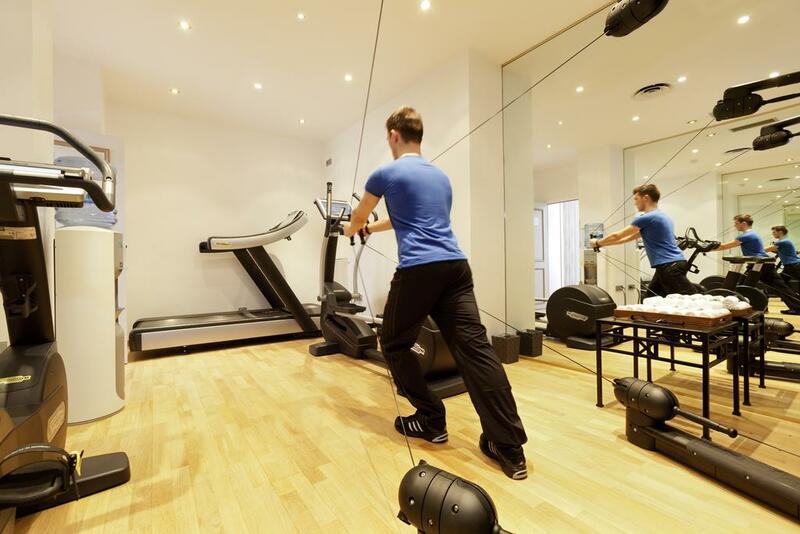 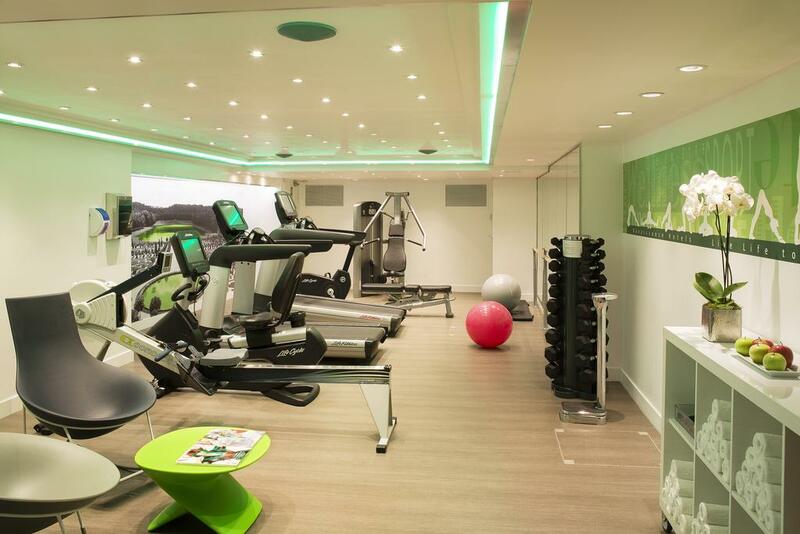 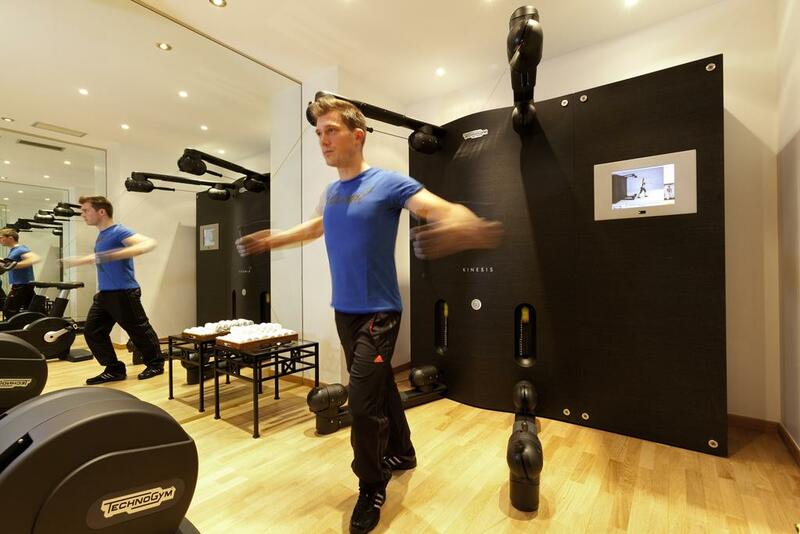 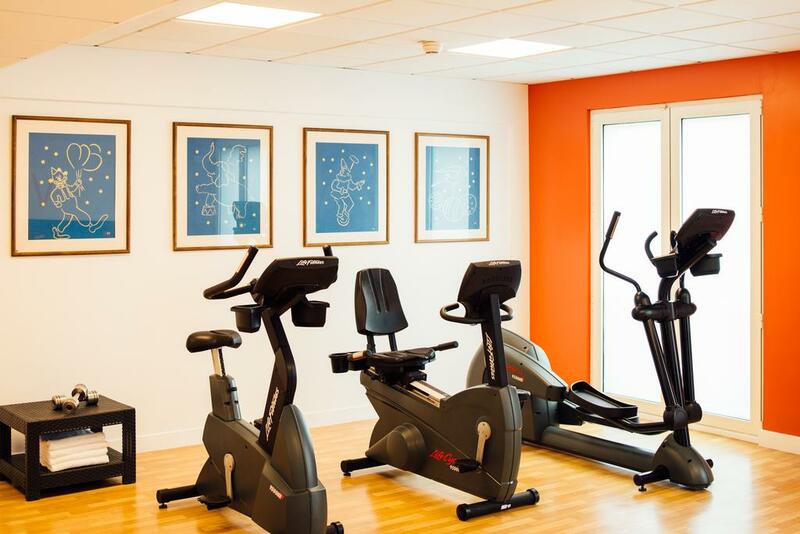 Extra features at the hotel include a fitness room and an on-site library. 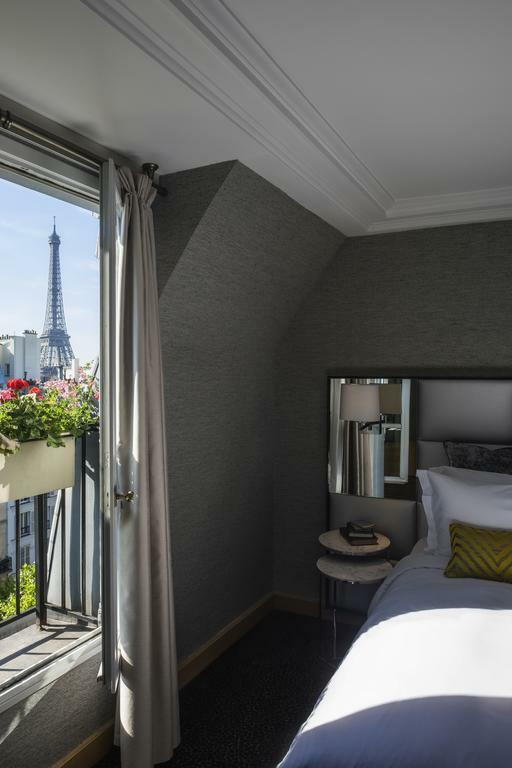 The Eiffel Tower is a 15-minute walk from Sofitel Paris Baltimore Tour Eiffel and guests can also walk to the River Seine in 10 minutes. 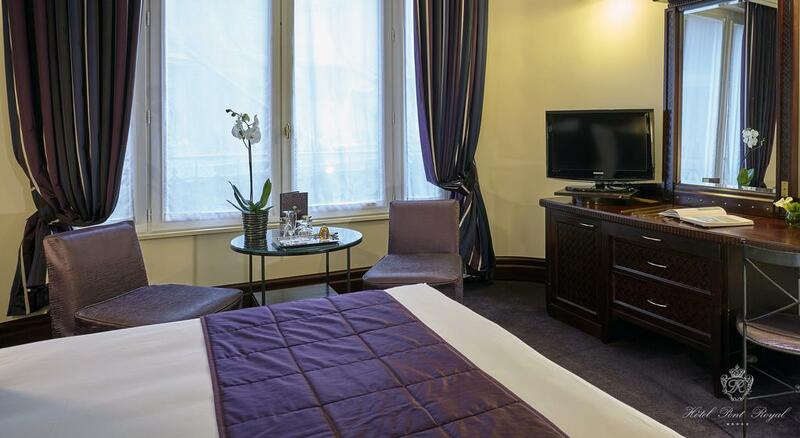 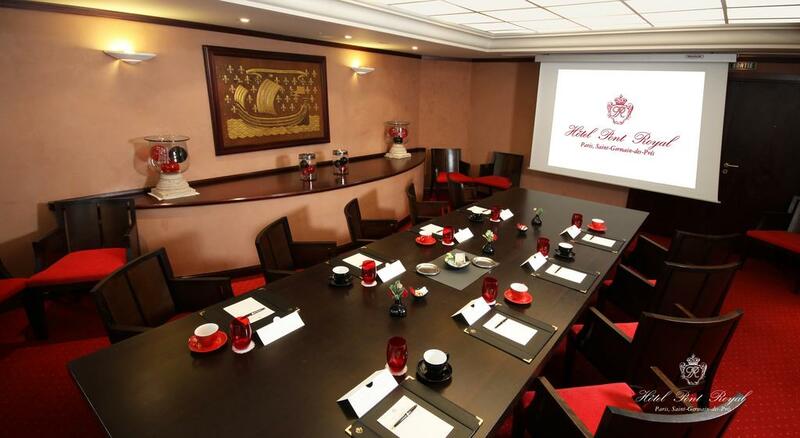 Hotel Pont Royal offers elegant accommodation and free internet. 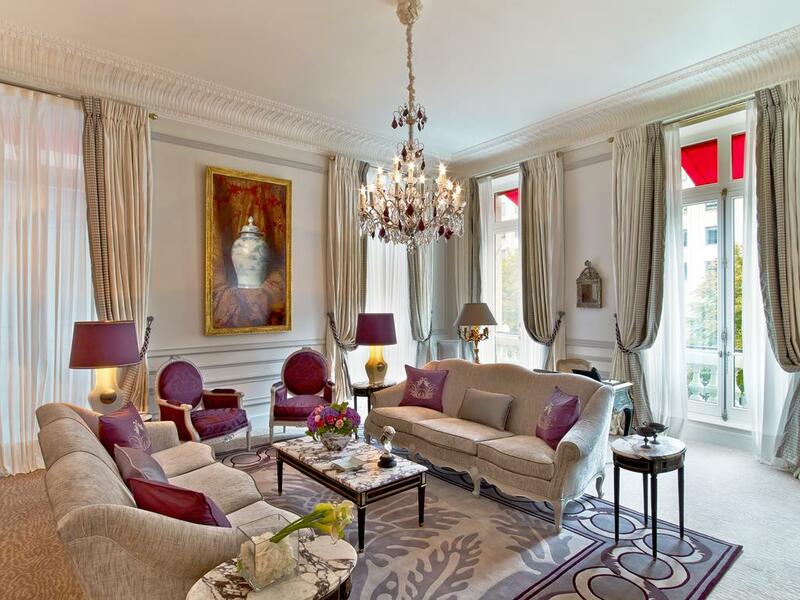 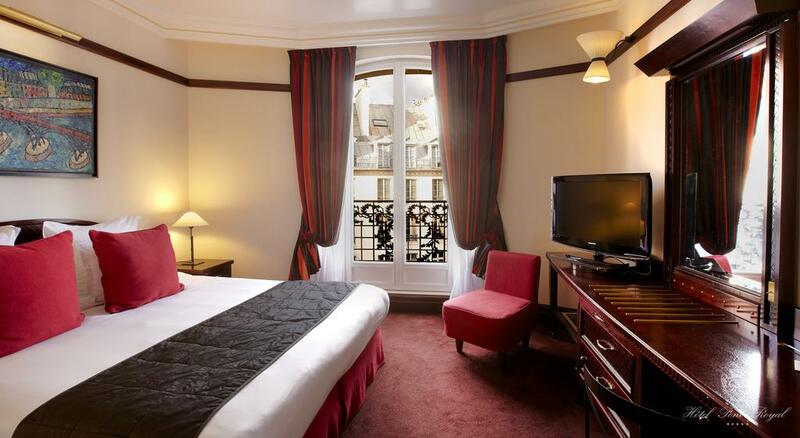 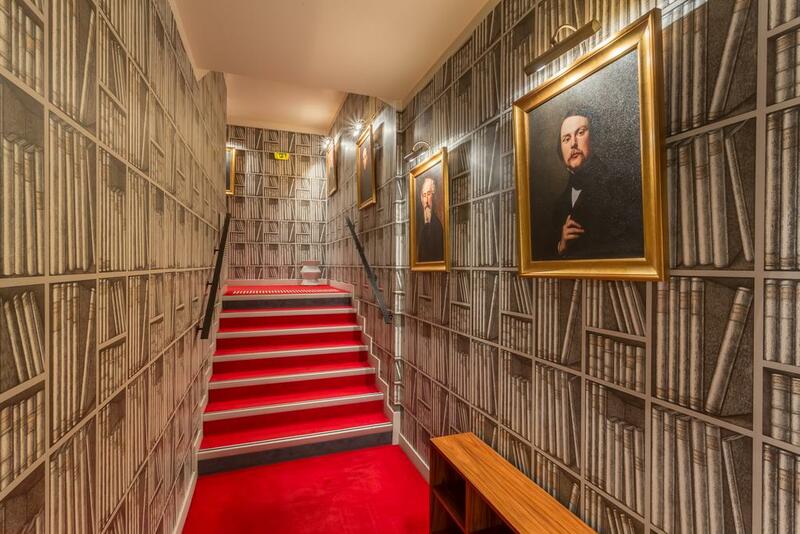 It is in the trendy Saint Germain des Prés area on Paris’s left bank, near art galleries and the Louvre. 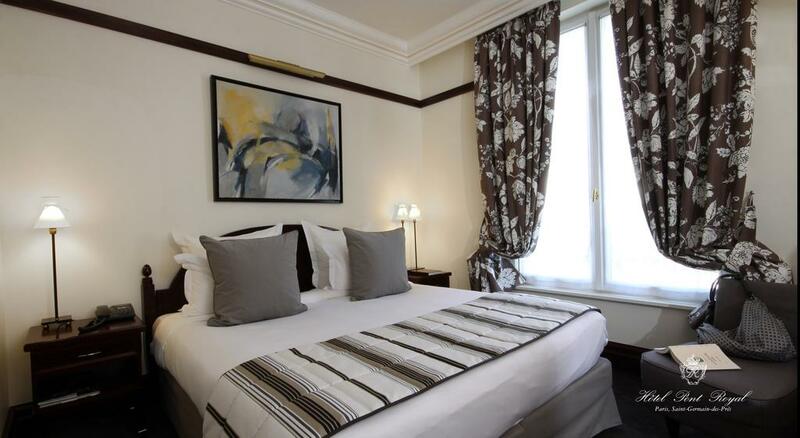 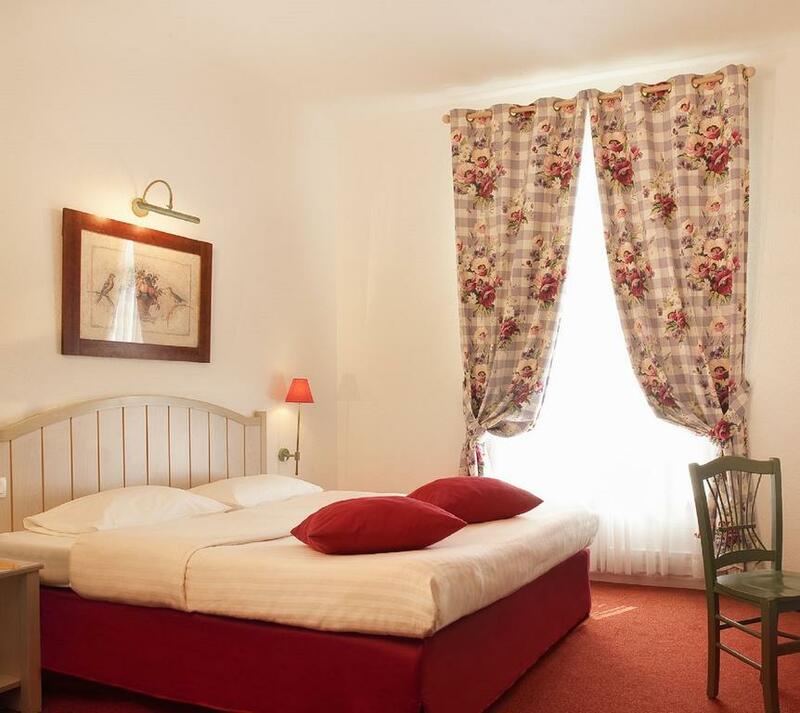 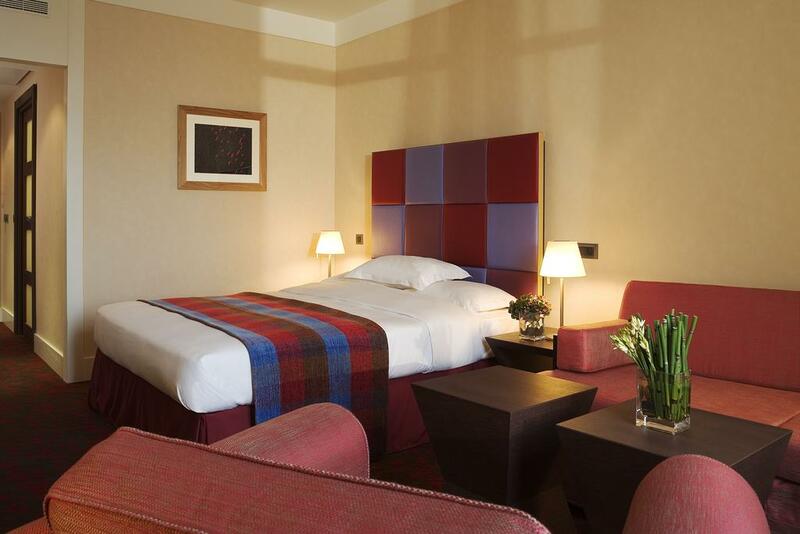 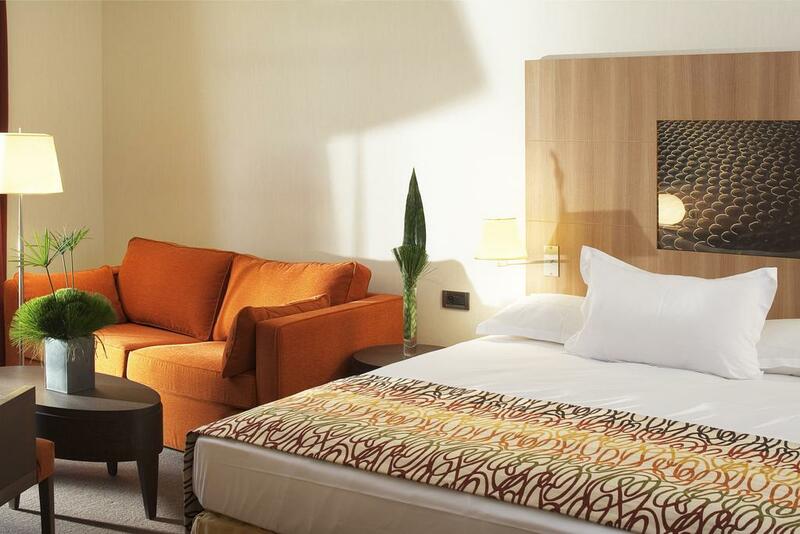 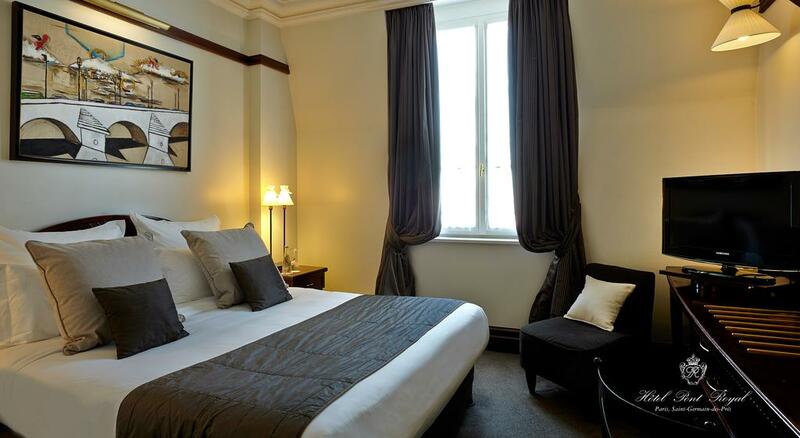 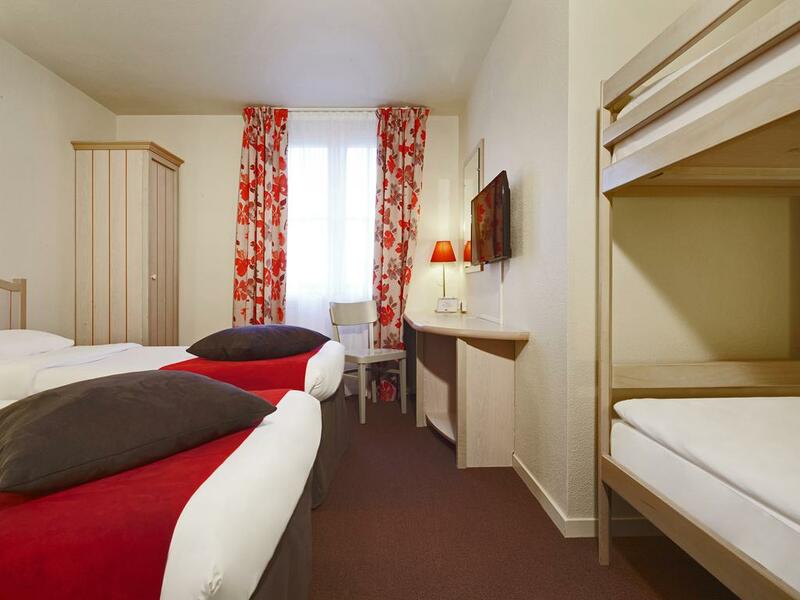 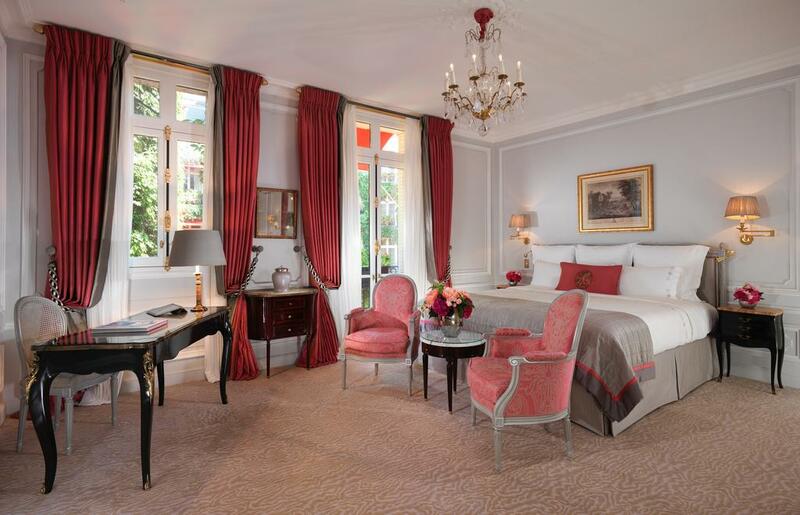 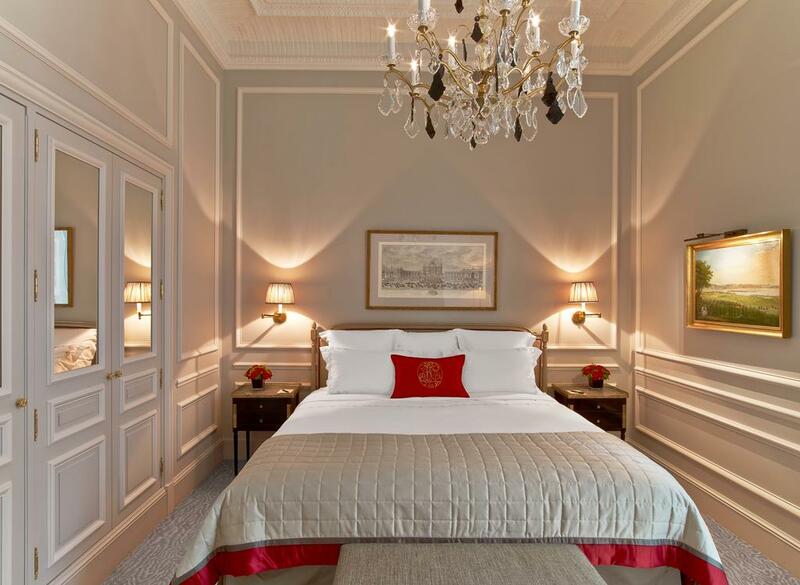 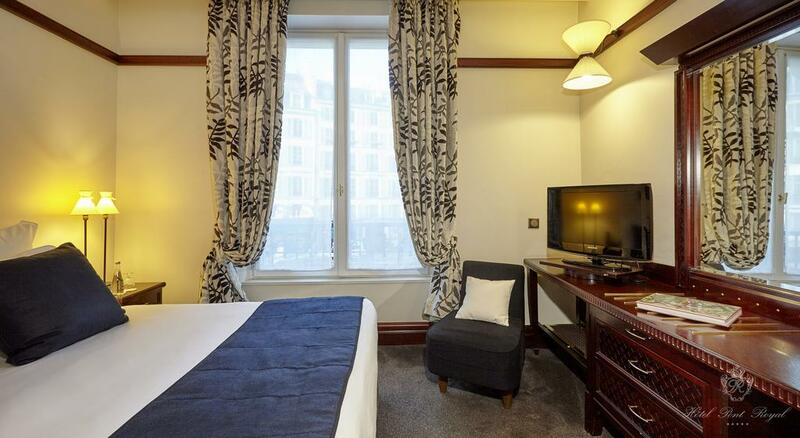 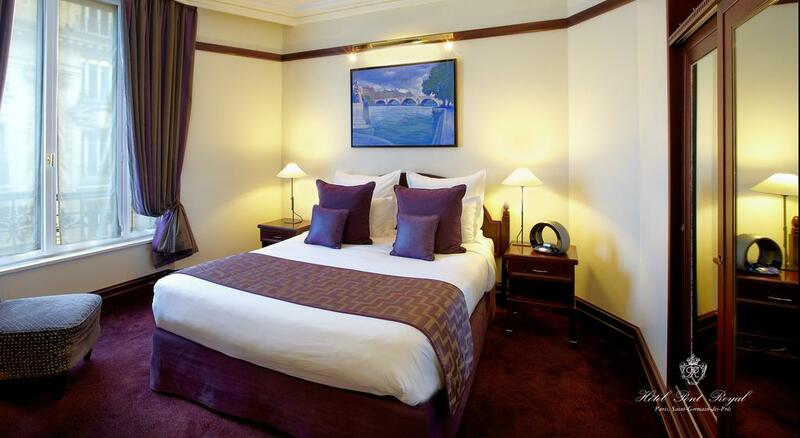 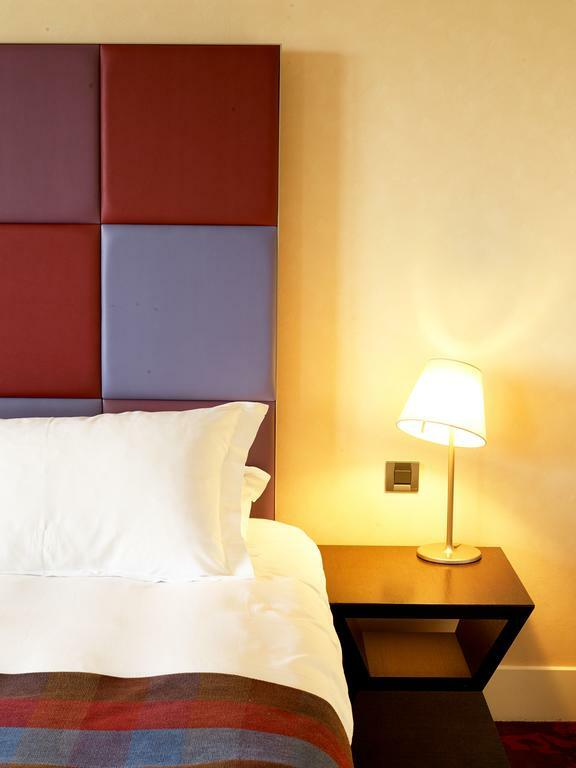 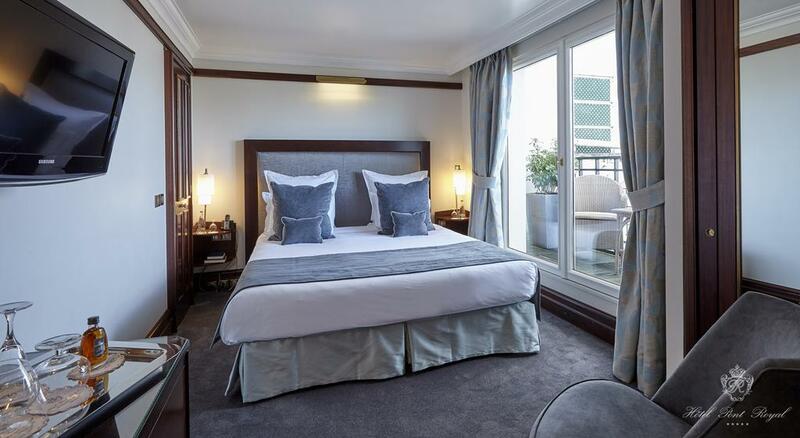 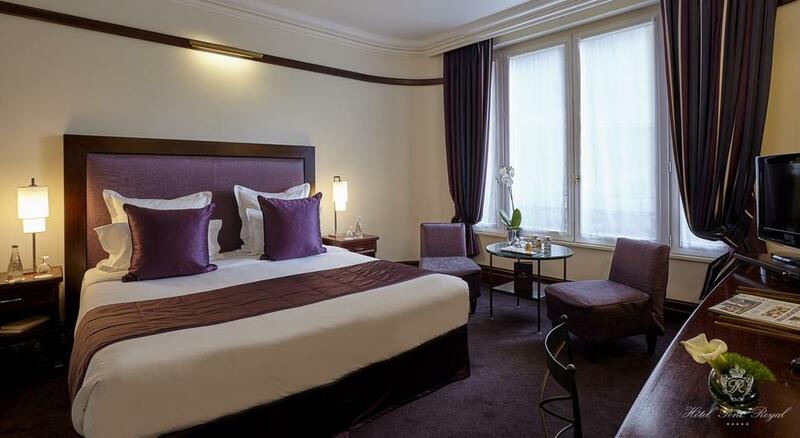 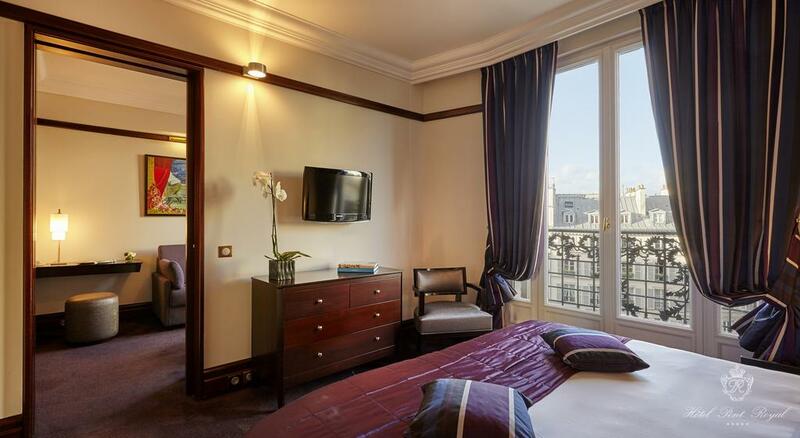 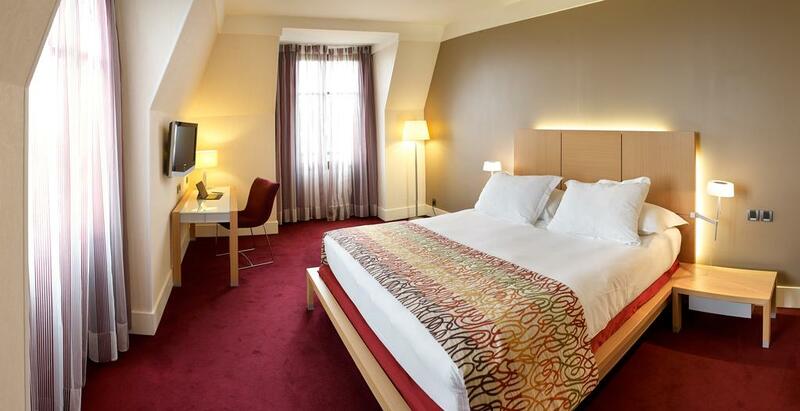 Guest rooms at the Hotel Pont Royal are air-conditioned. 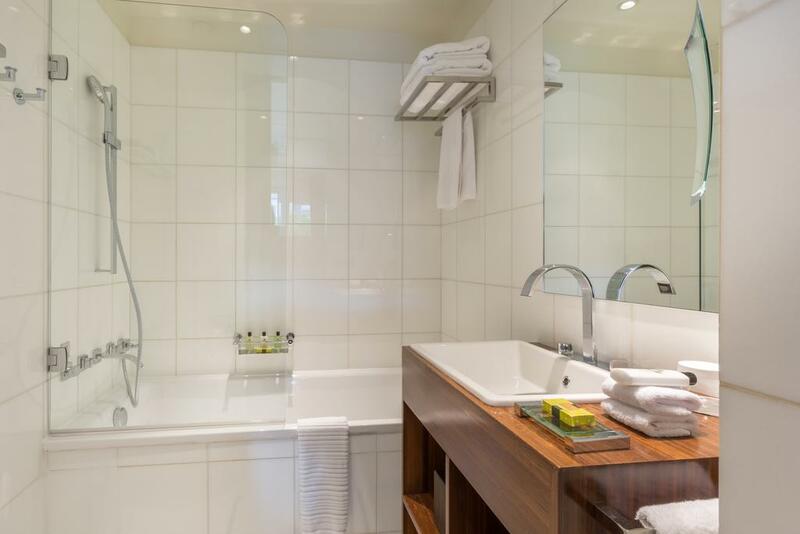 They include a minibar, safe, flat-screen TV with satellite channels and modern private bathrooms. 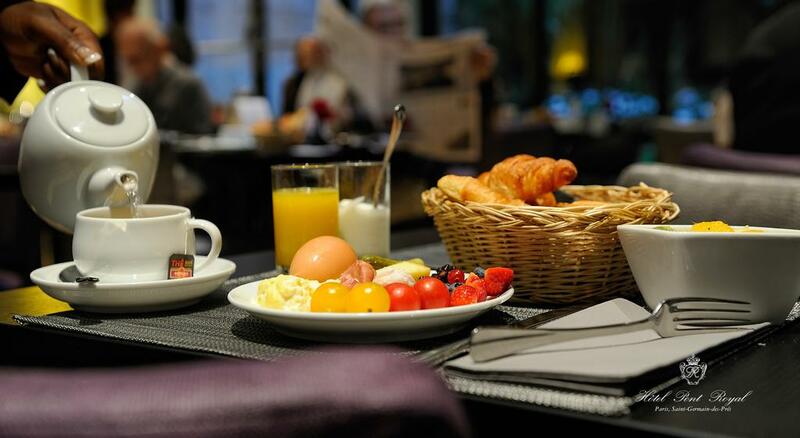 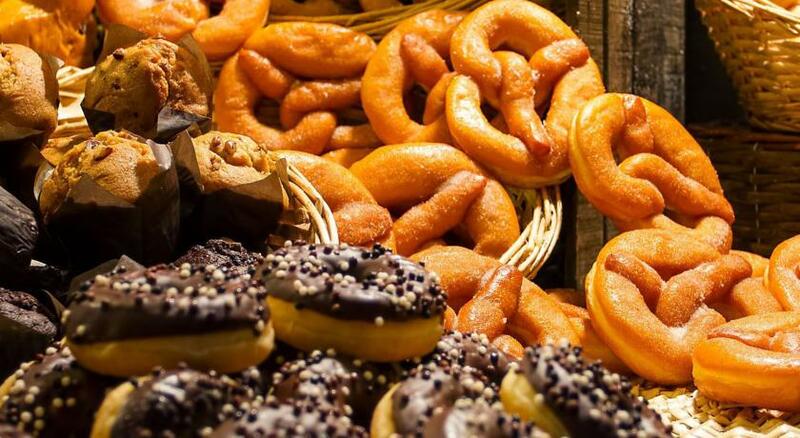 A full buffet breakfast can be enjoyed every day before work or sightseeing. 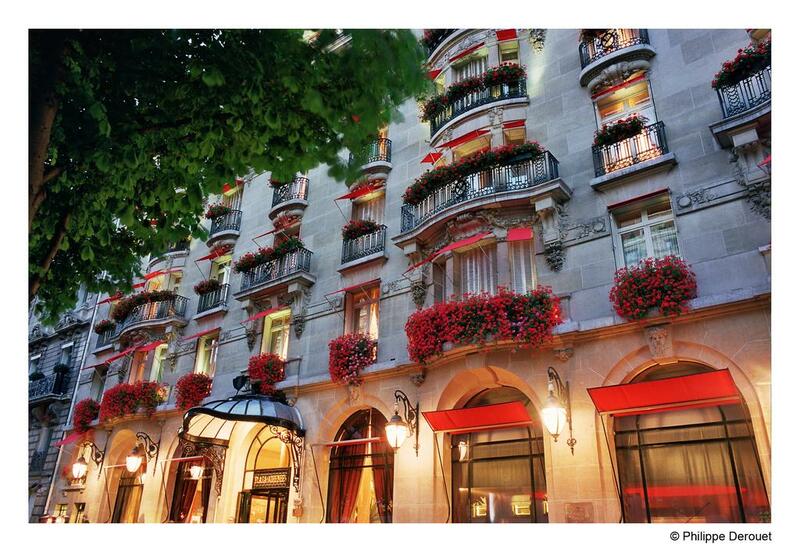 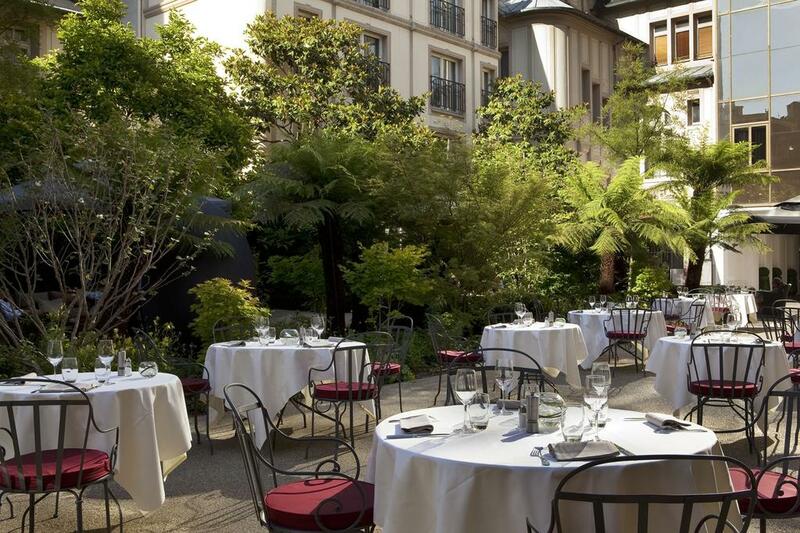 Atelier St Germain de Joel Robuchon, the hotel’s restaurant, is internationally acclaimed and serves gourmet cuisine. 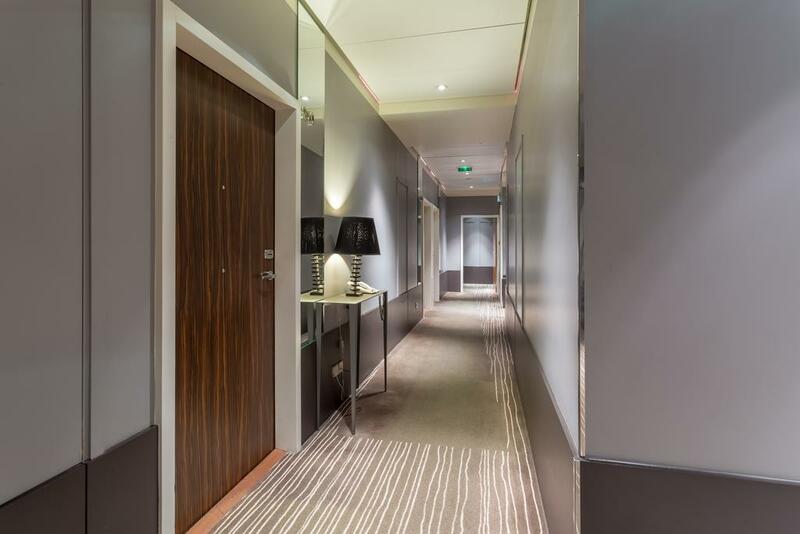 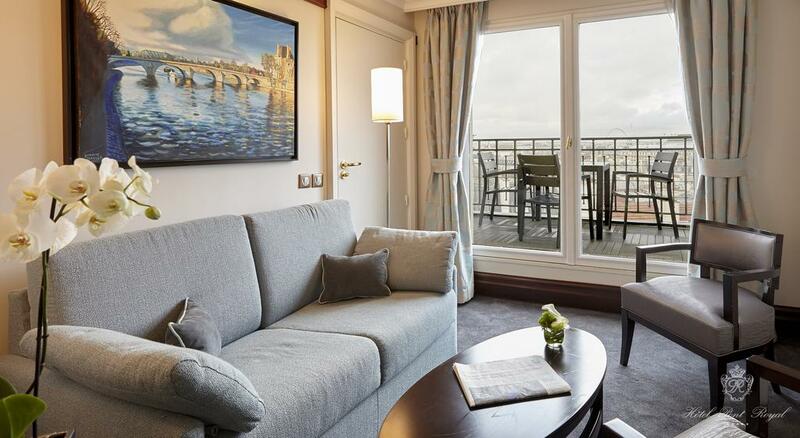 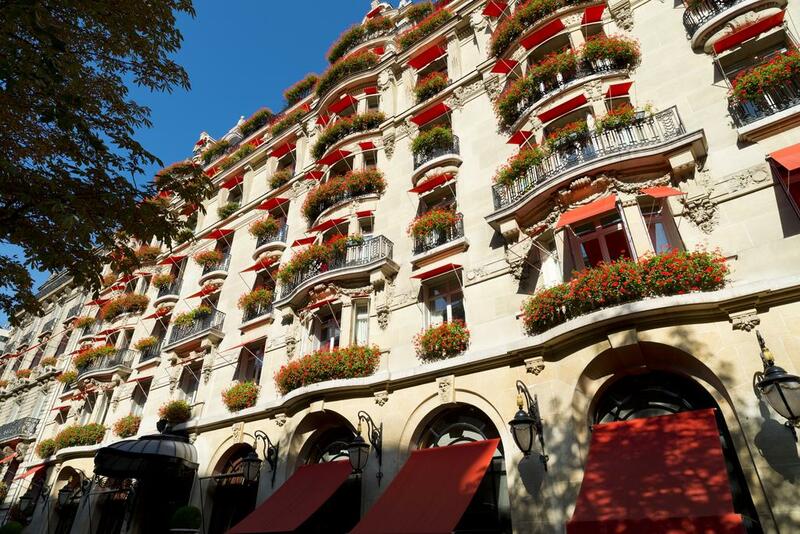 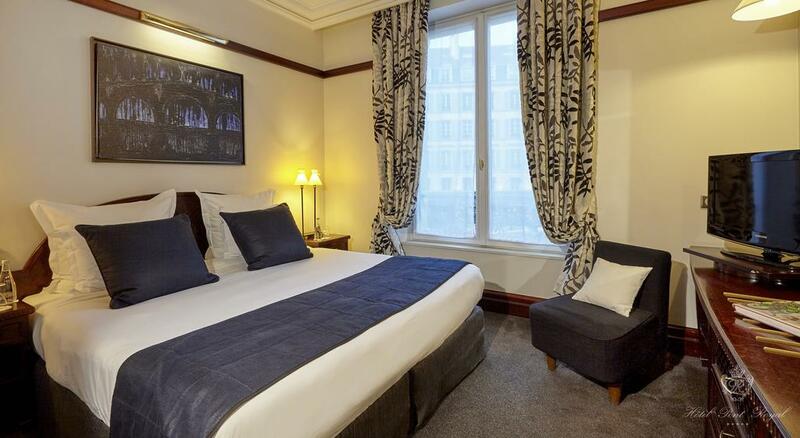 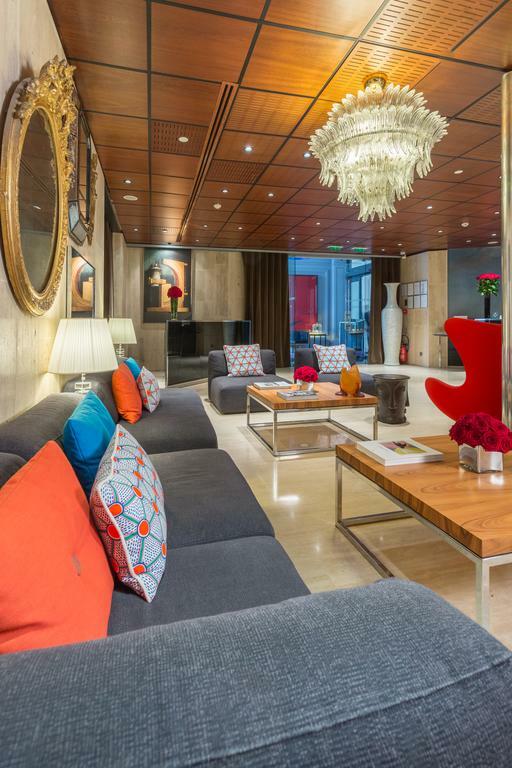 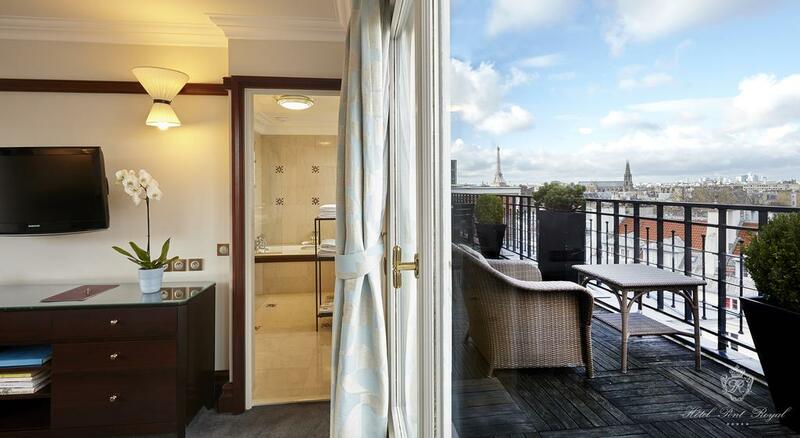 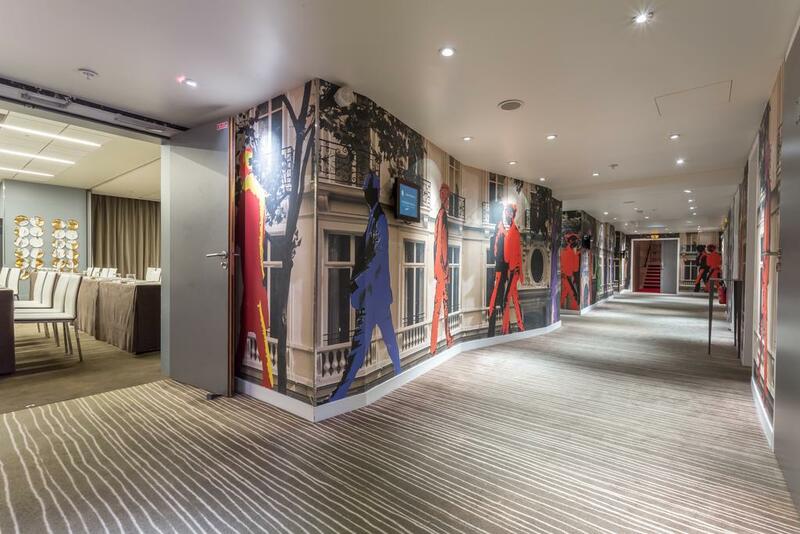 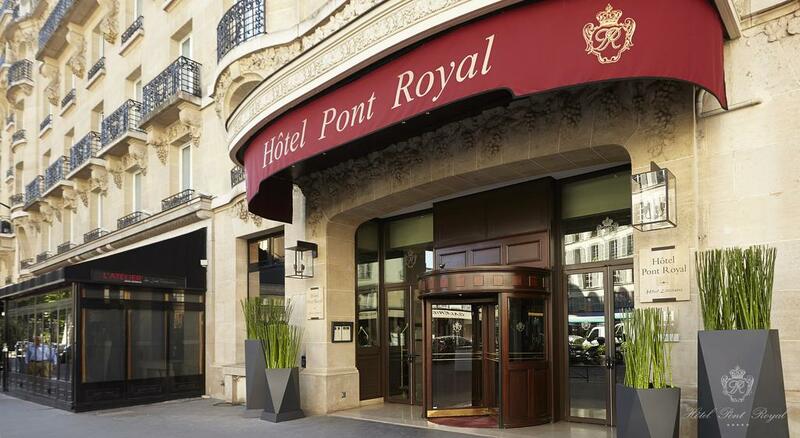 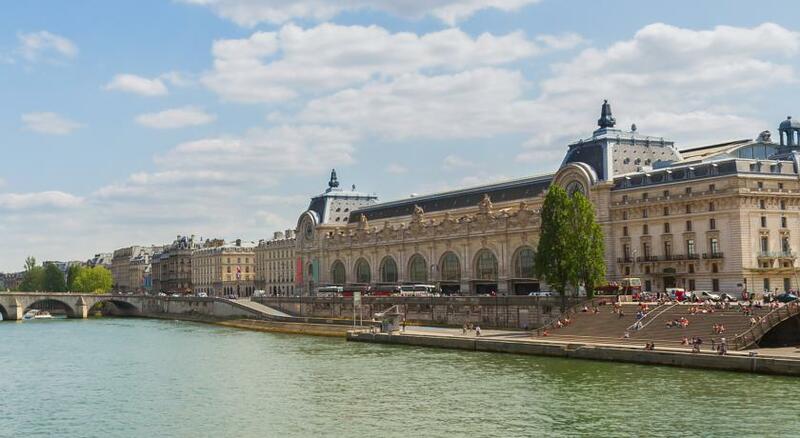 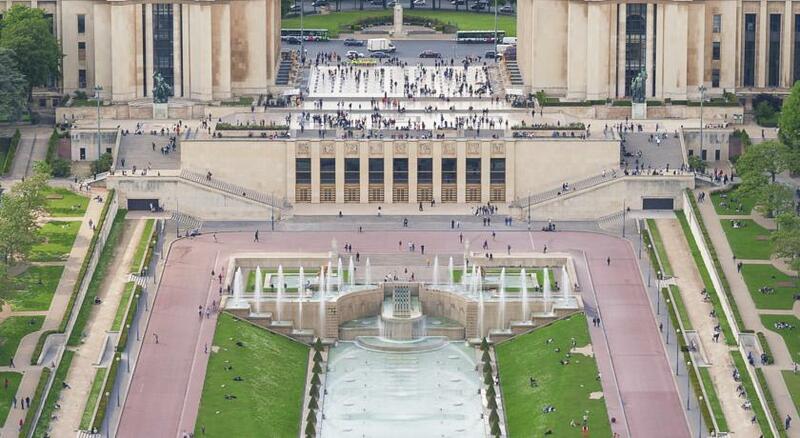 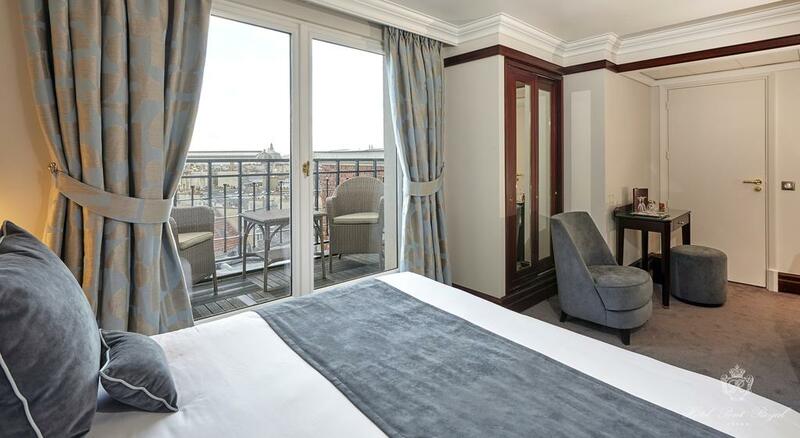 The Pont Royal’s central location means guests can explore the city by foot or by Metro. 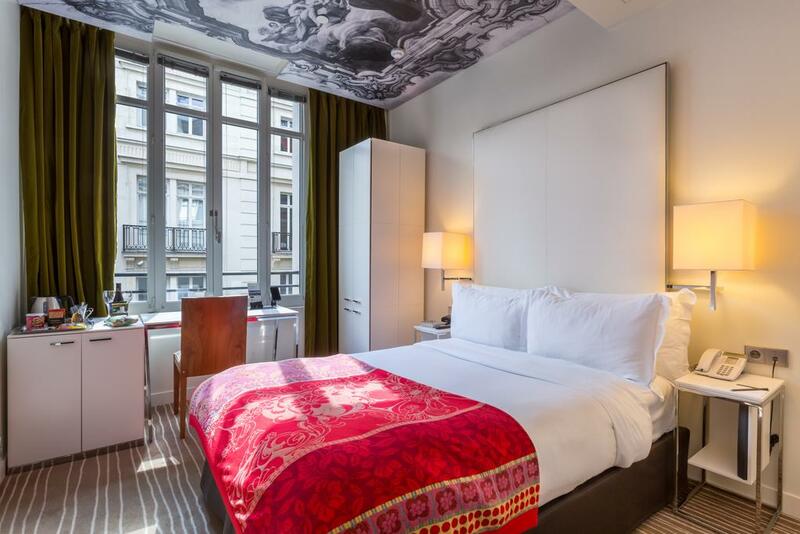 Its rich history (it has welcomed famous artists and writers, including Albert Camus and Boris Vian) makes it the perfect place to experience this romantic city.